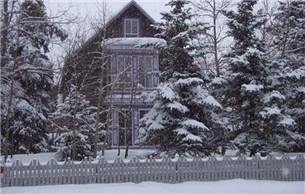 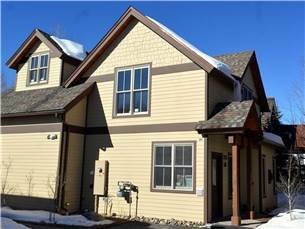 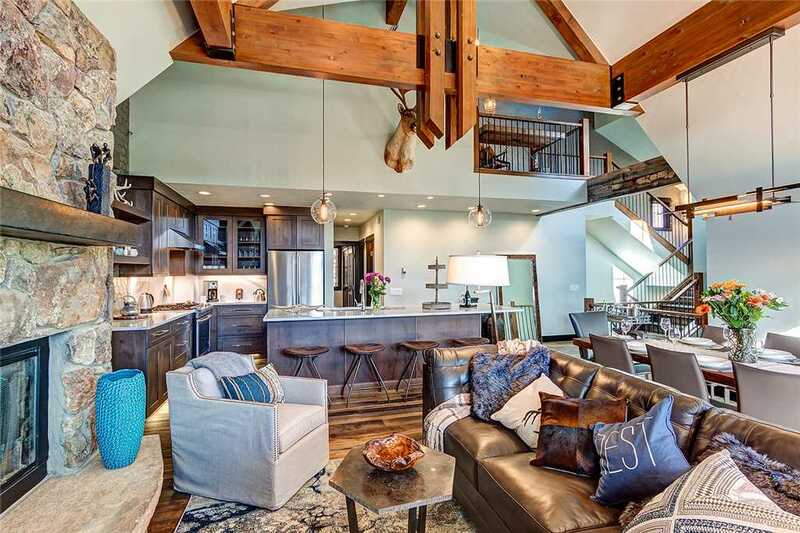 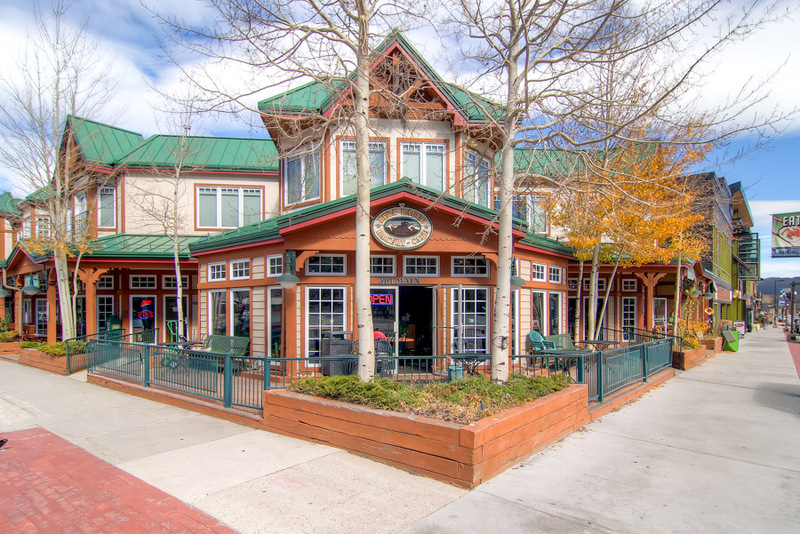 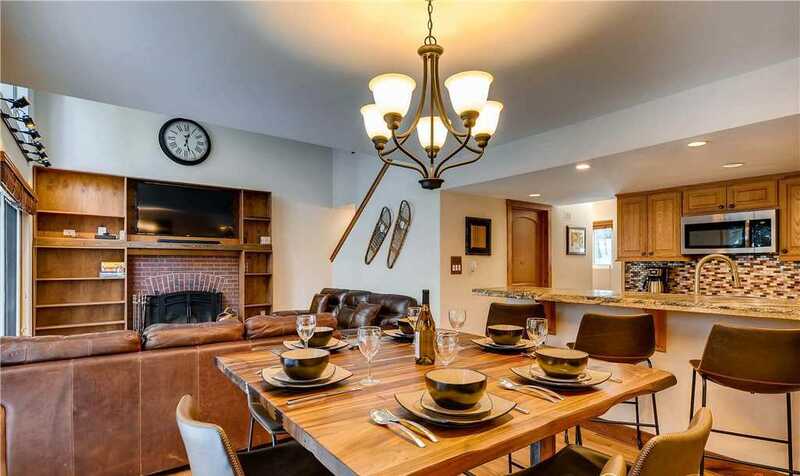 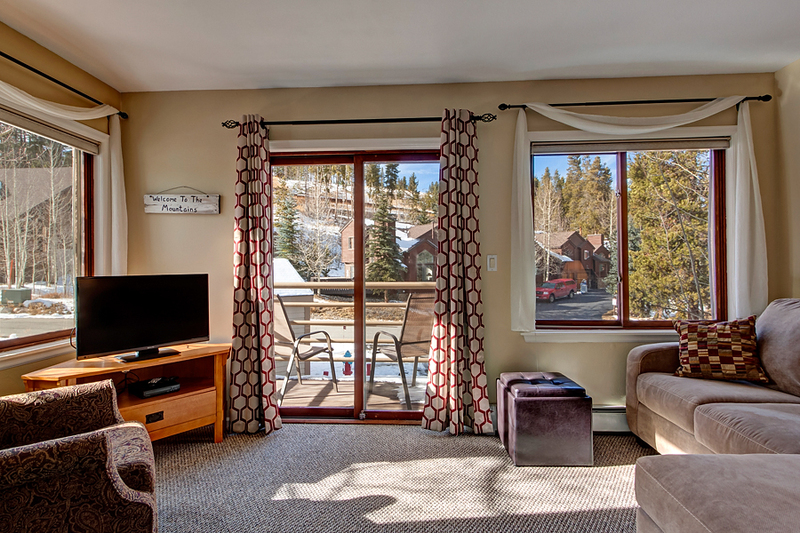 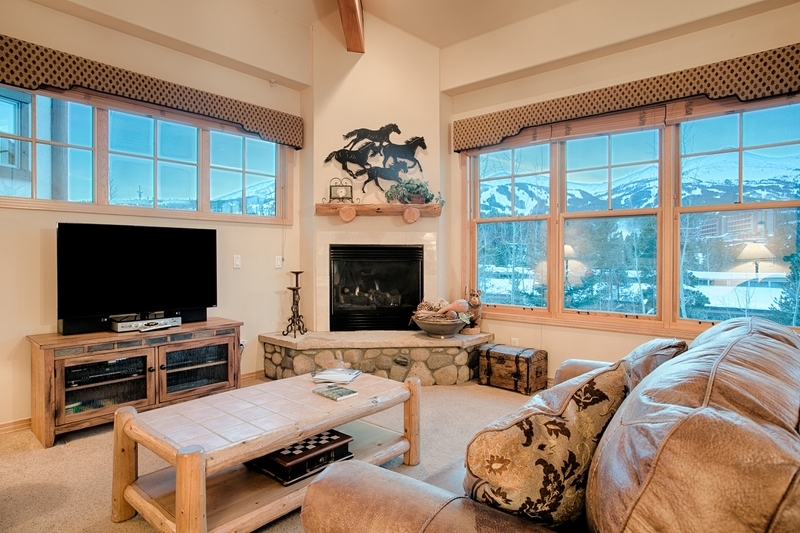 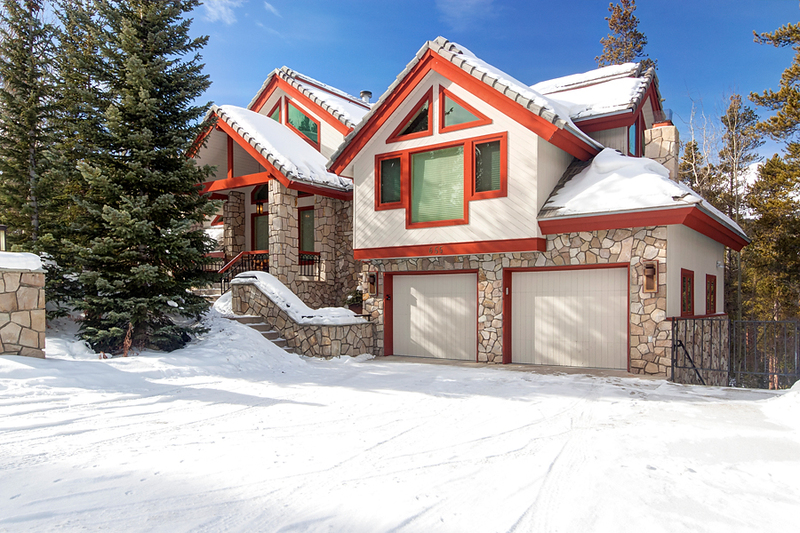 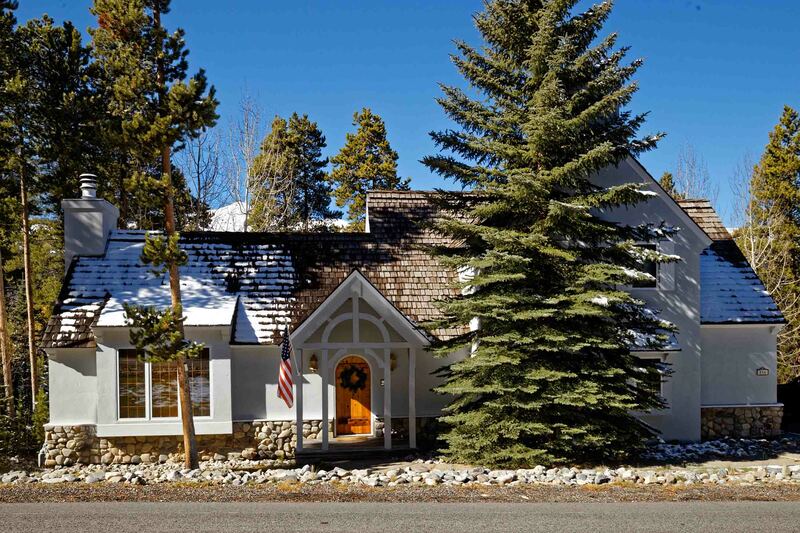 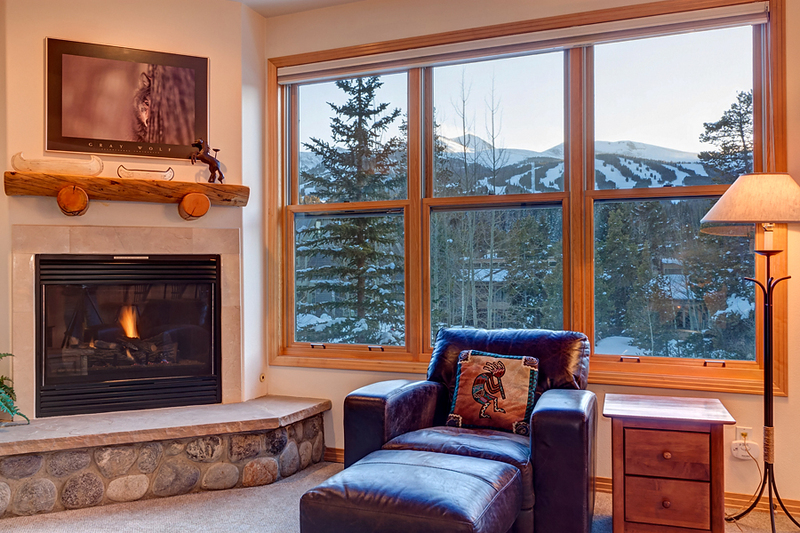 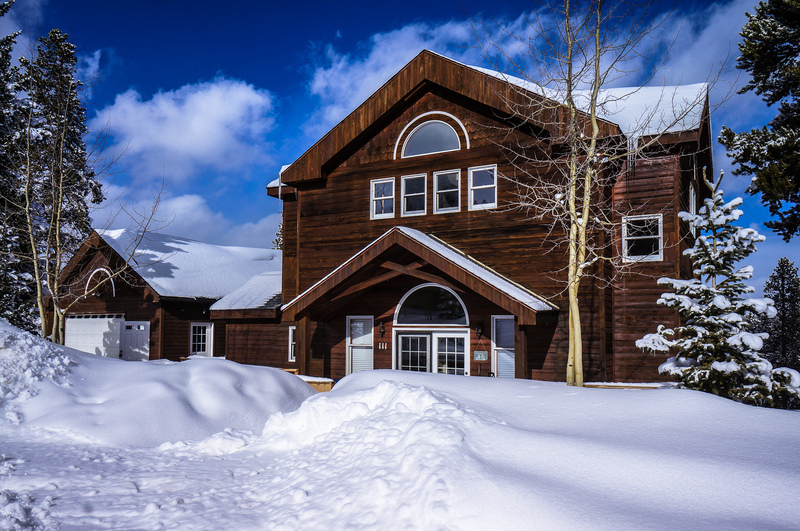 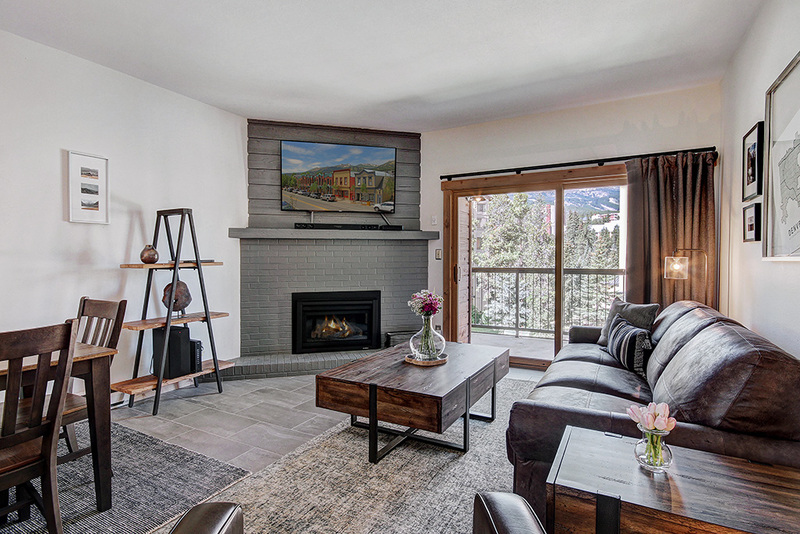 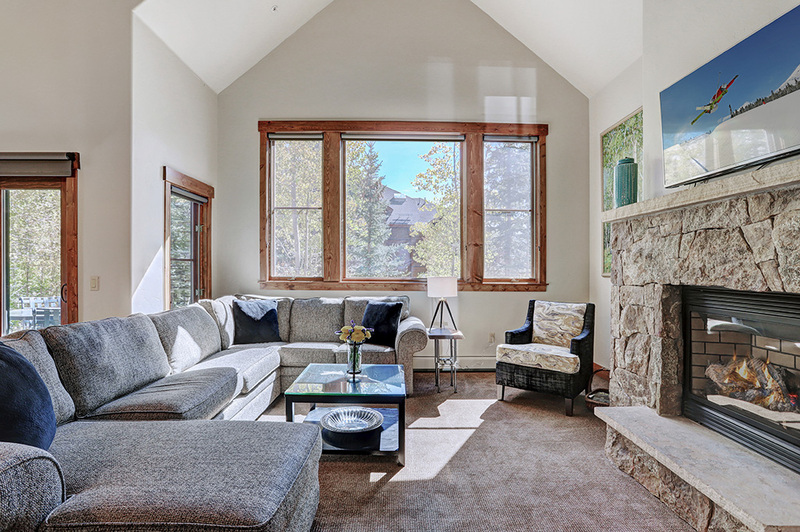 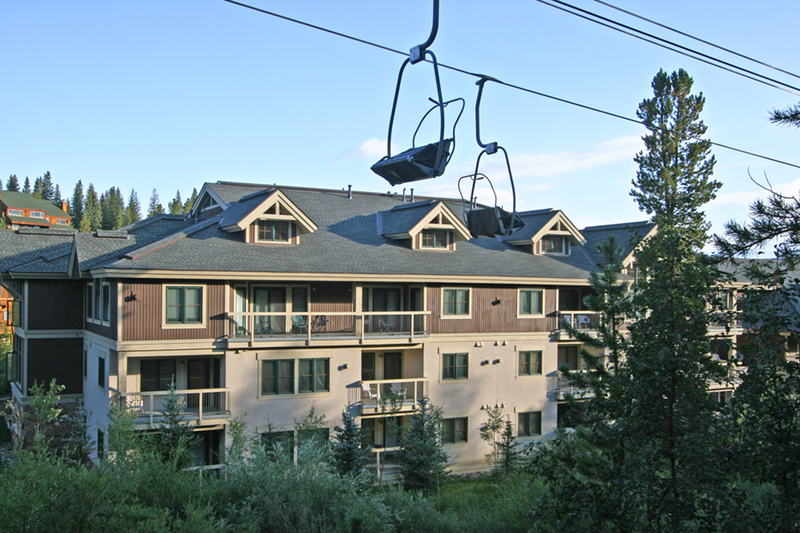 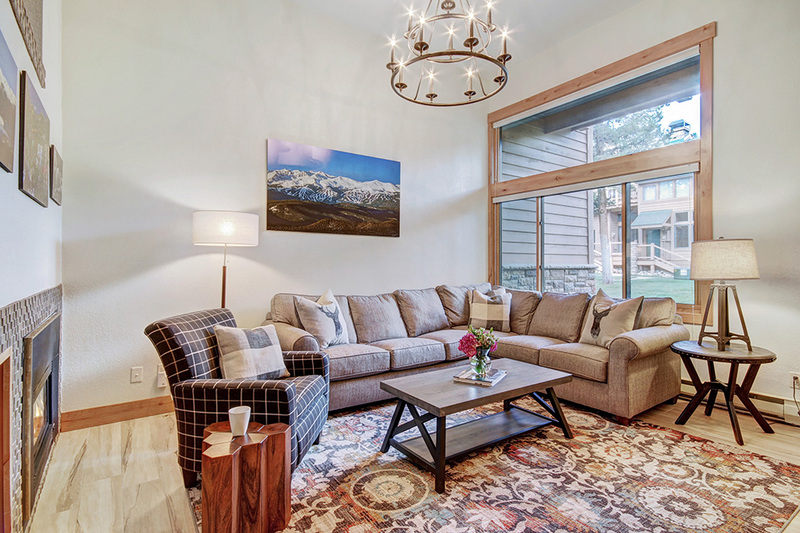 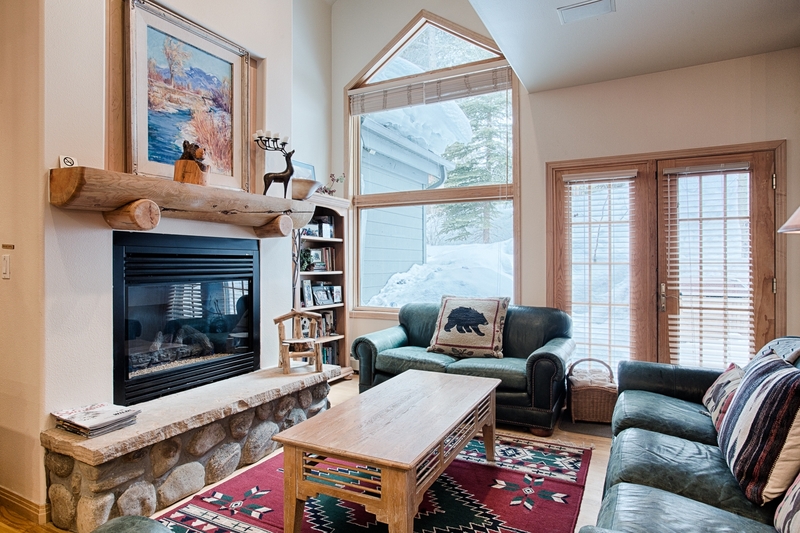 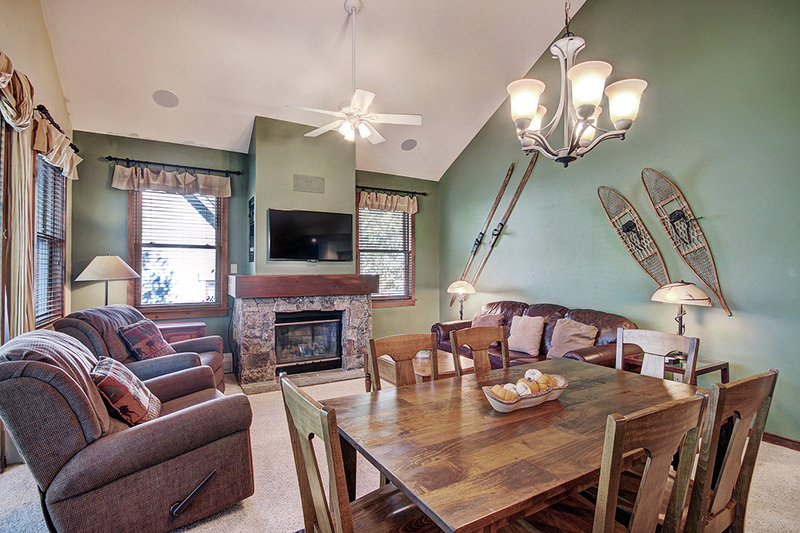 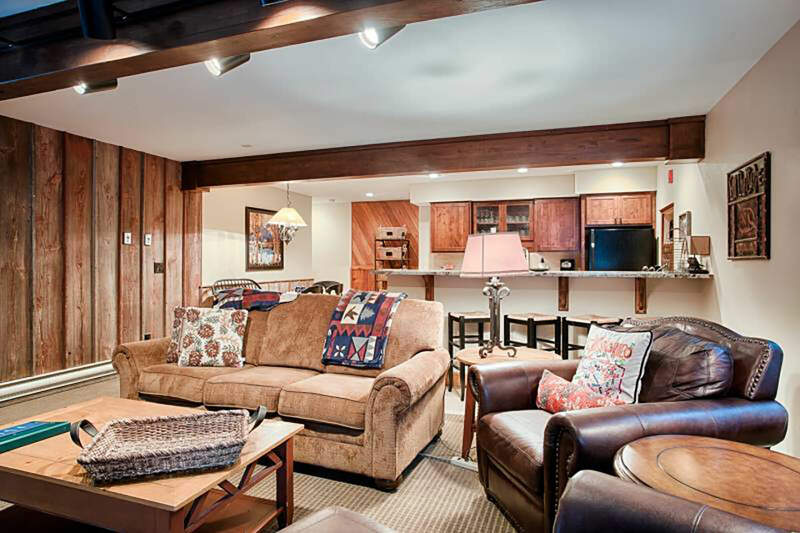 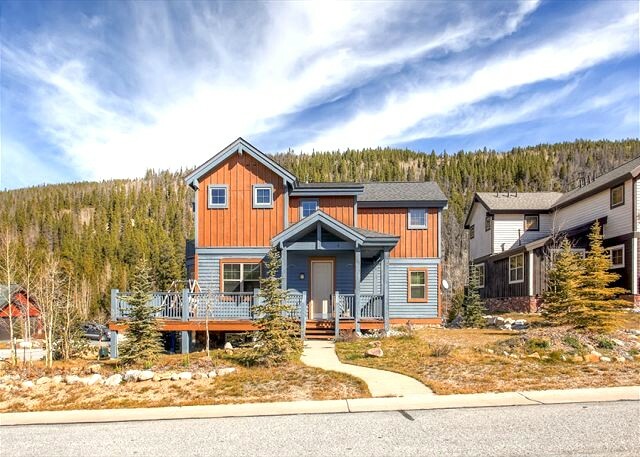 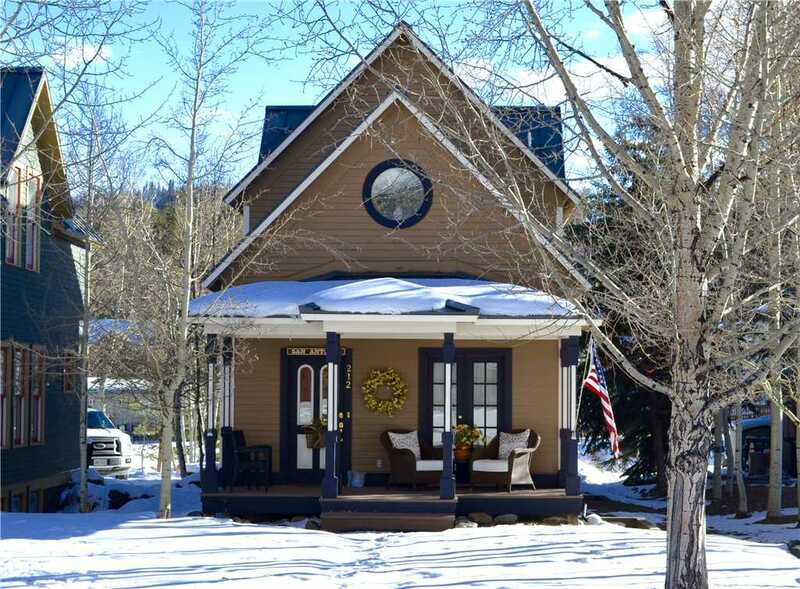 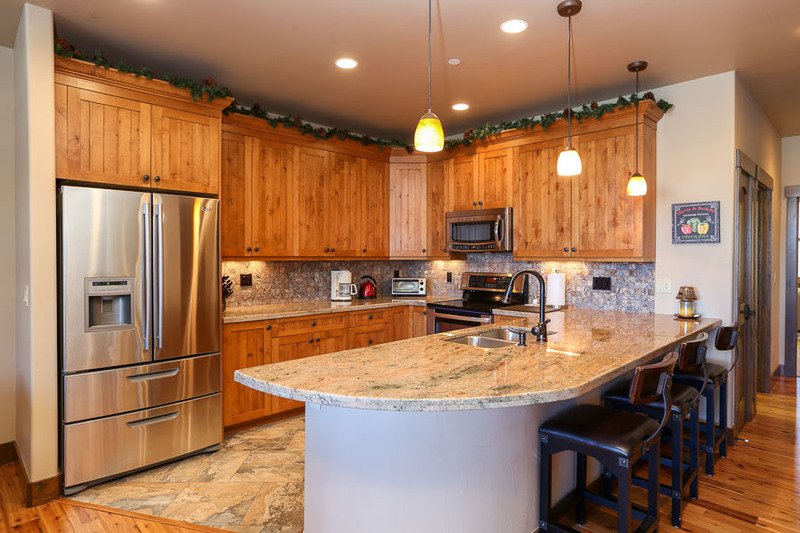 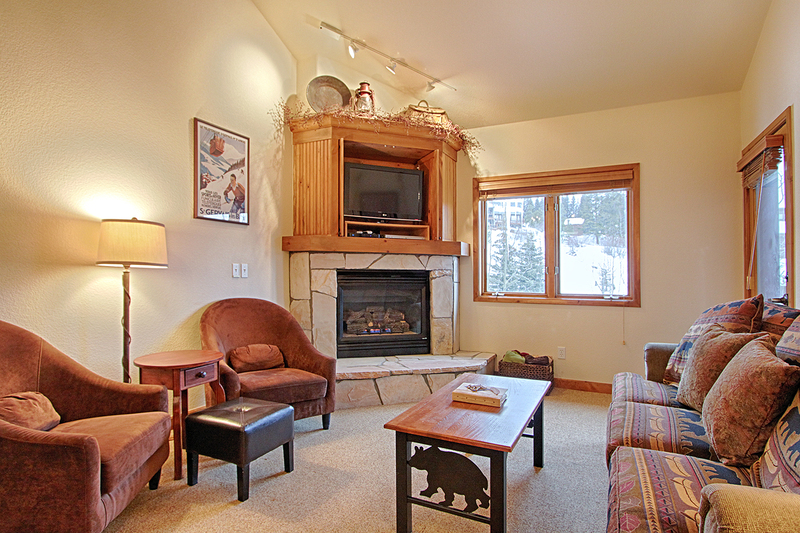 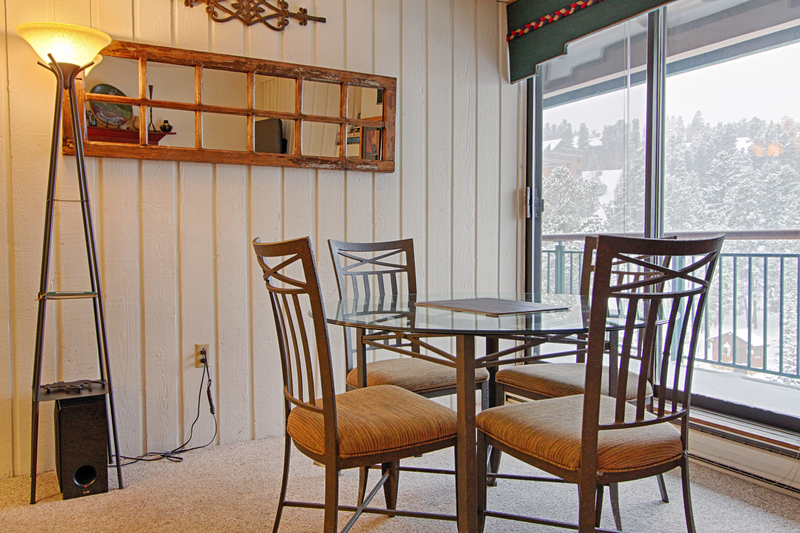 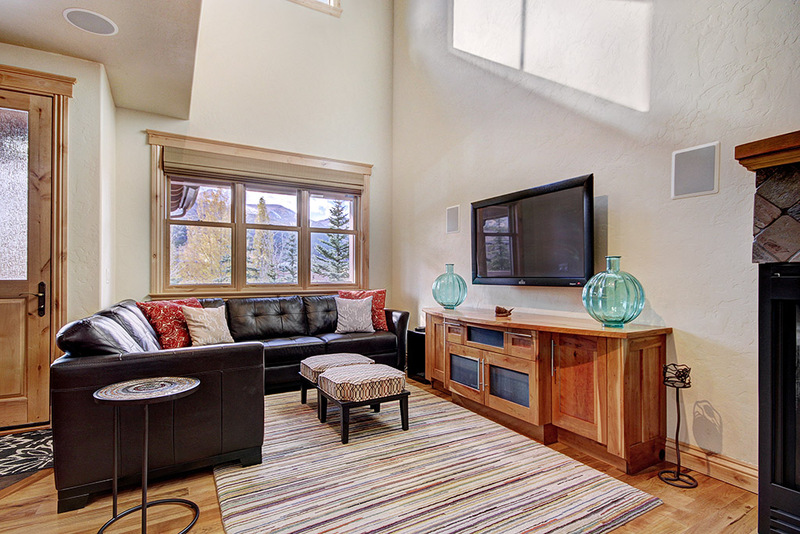 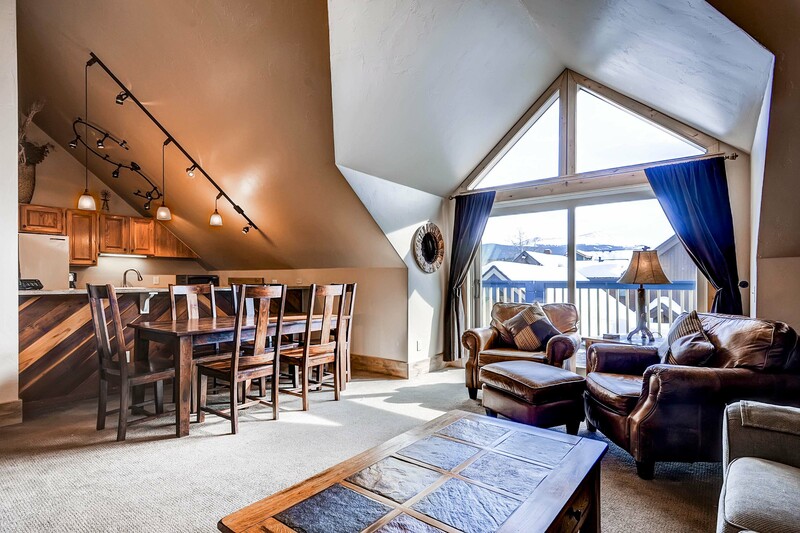 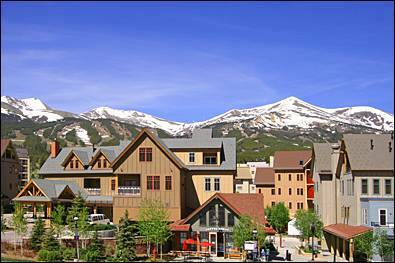 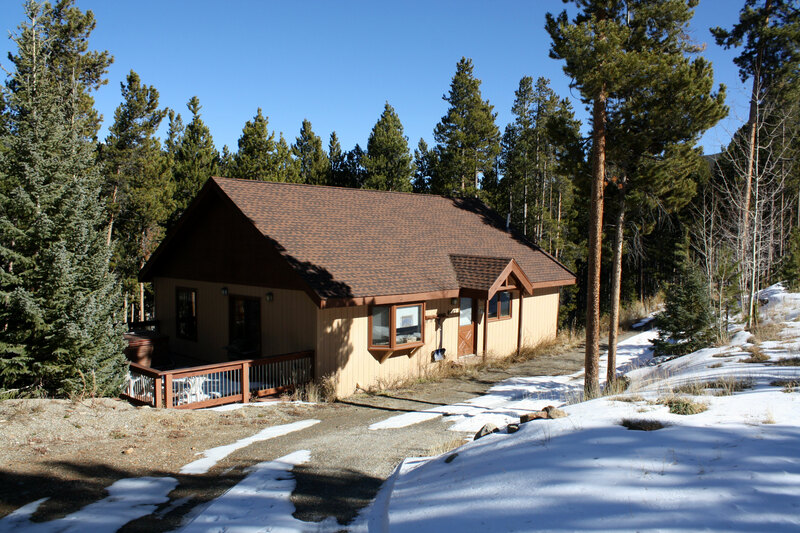 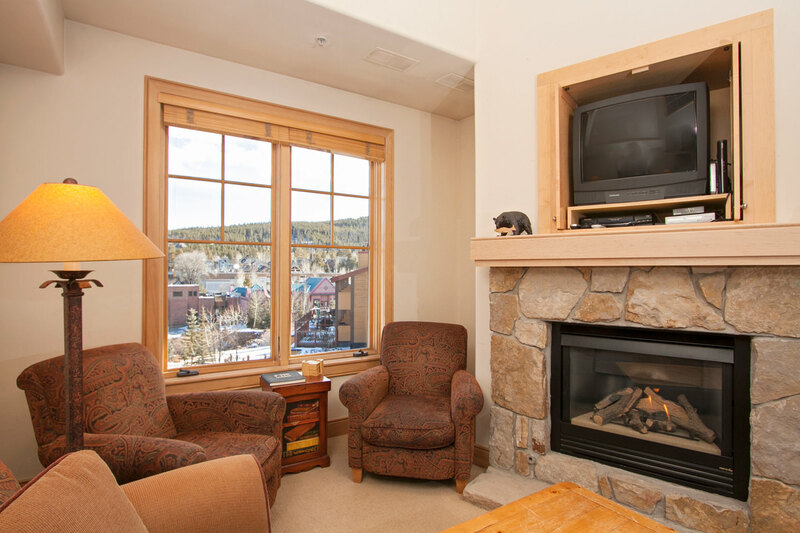 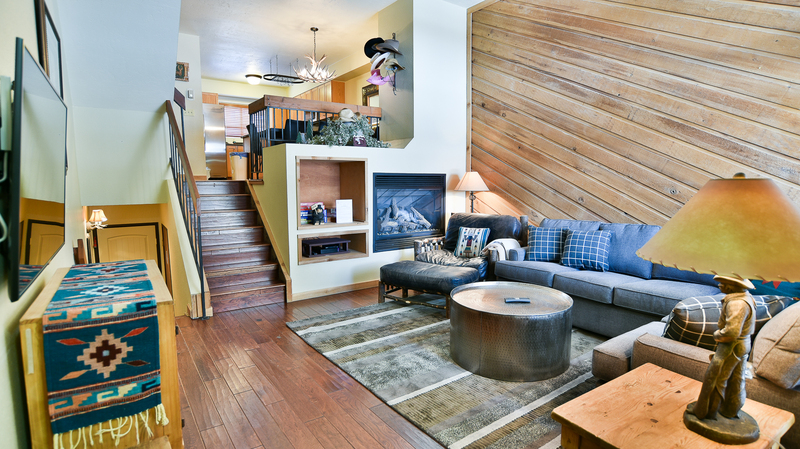 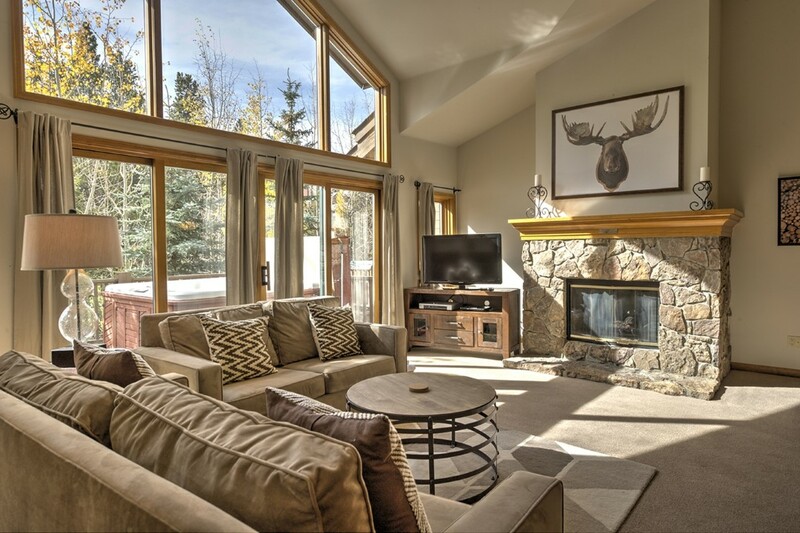 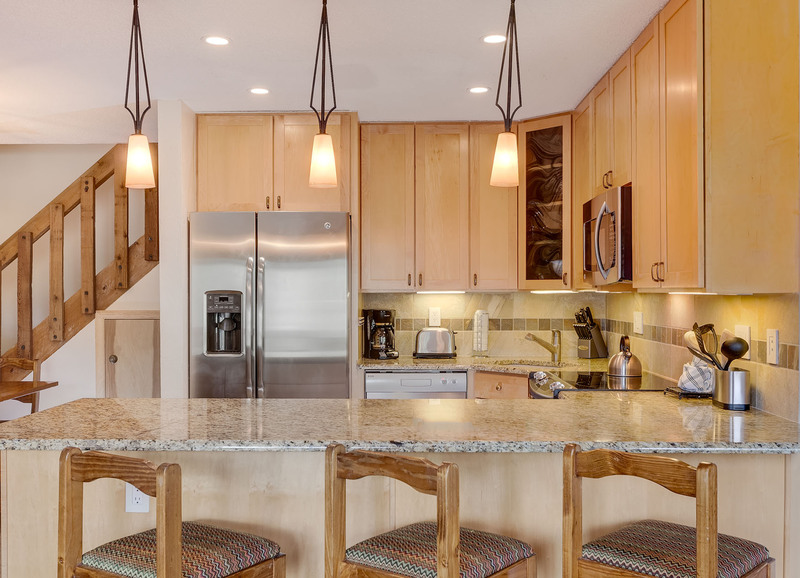 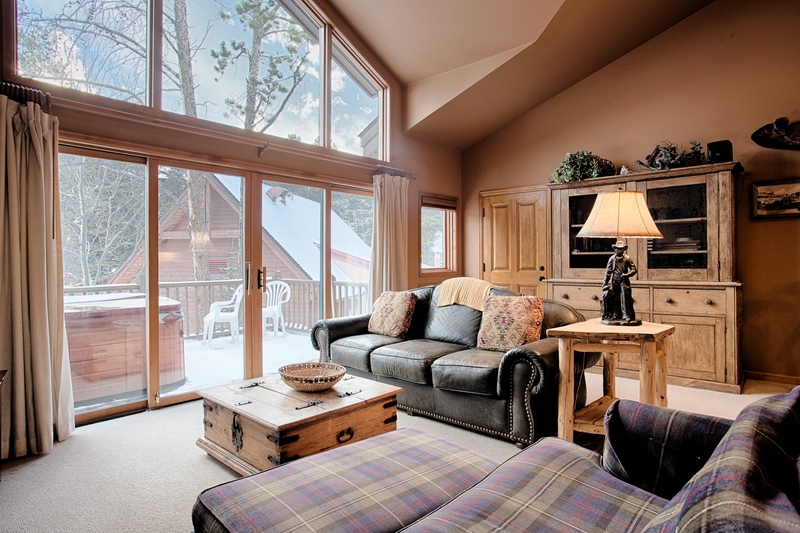 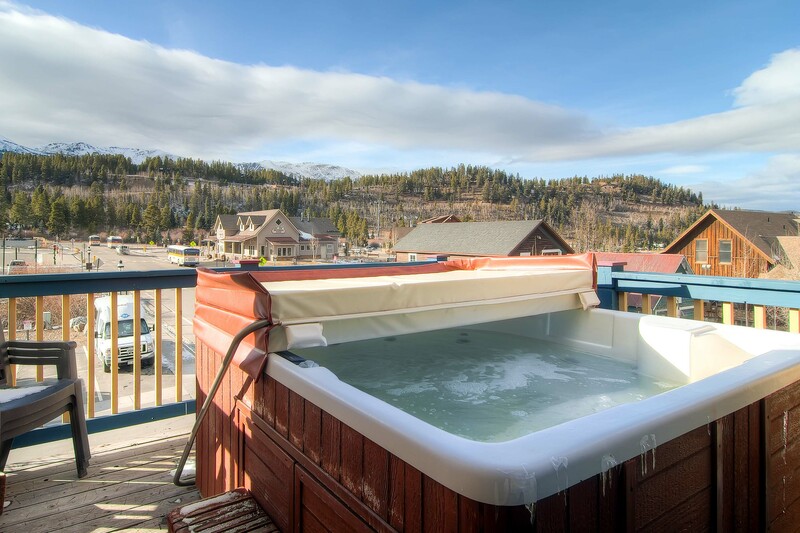 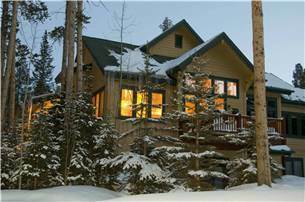 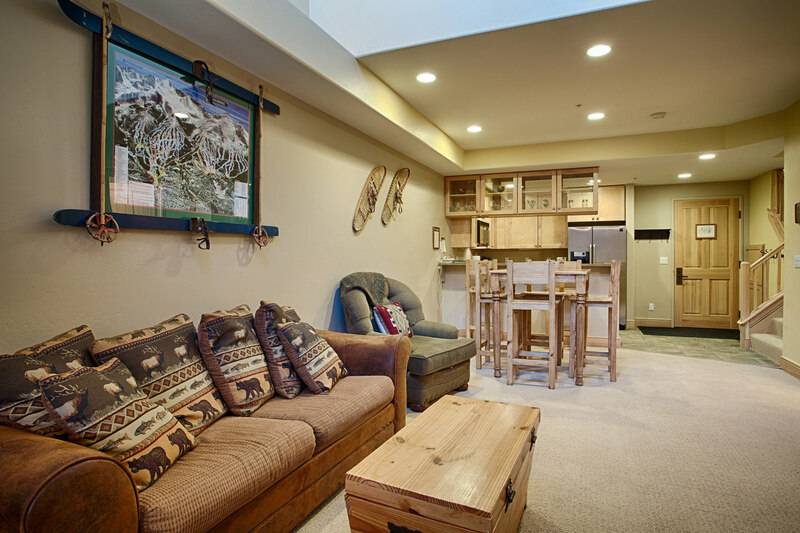 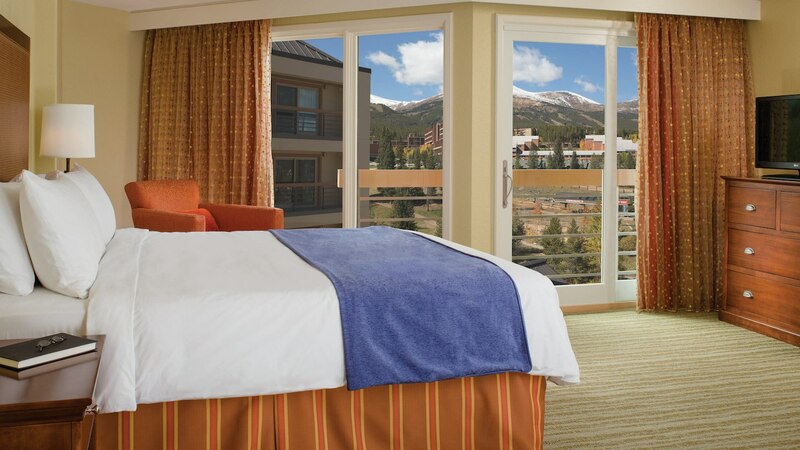 This row of Deluxe townhomes are situated in the Tyra Subdivision just above the Snowflake Lift, one block to the Breckenridge Free Ride shuttle stop and 4.5 blocks to Historic Main Street. 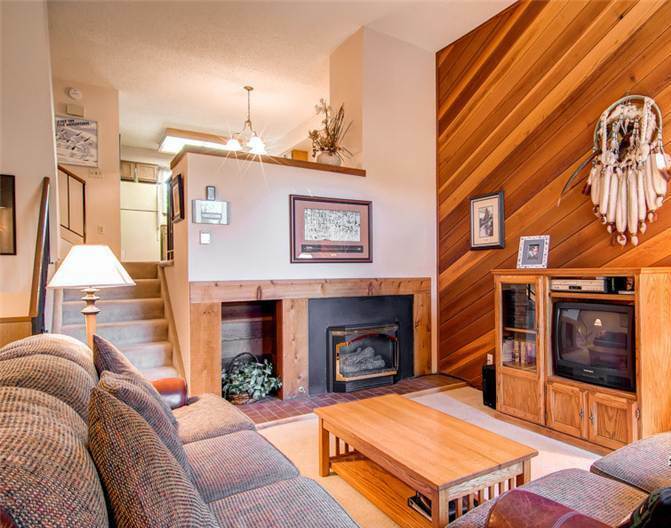 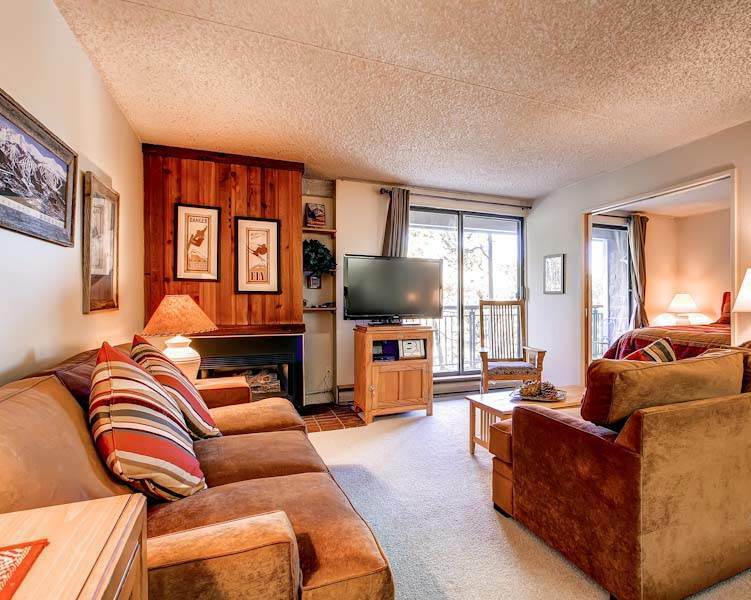 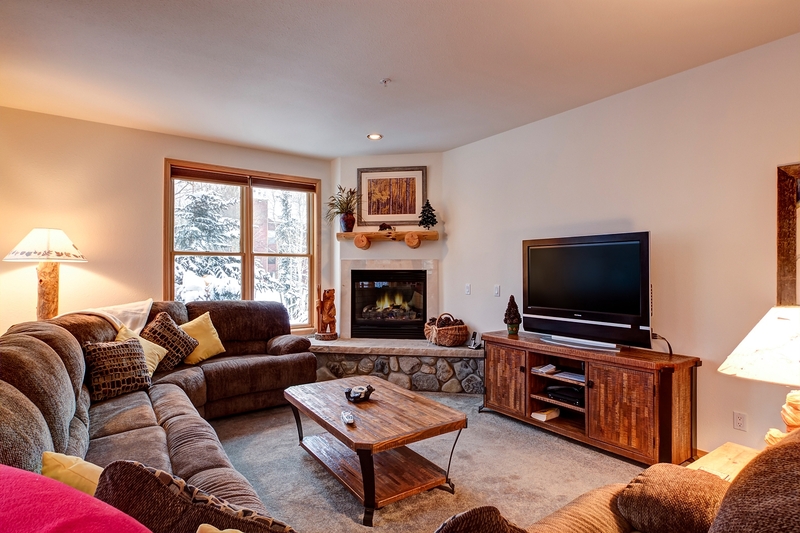 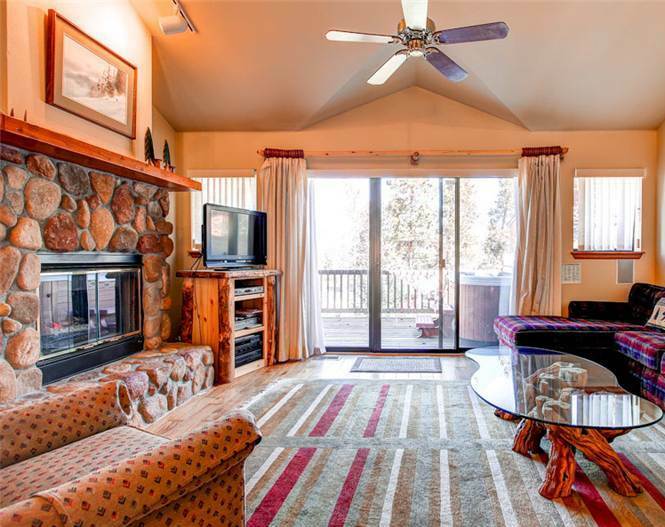 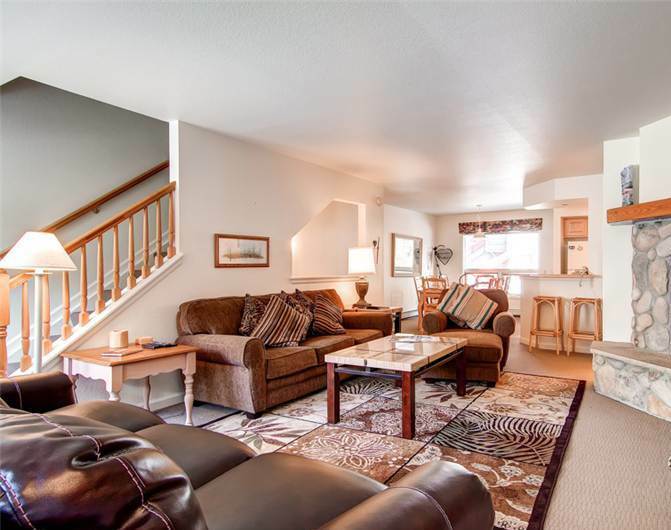 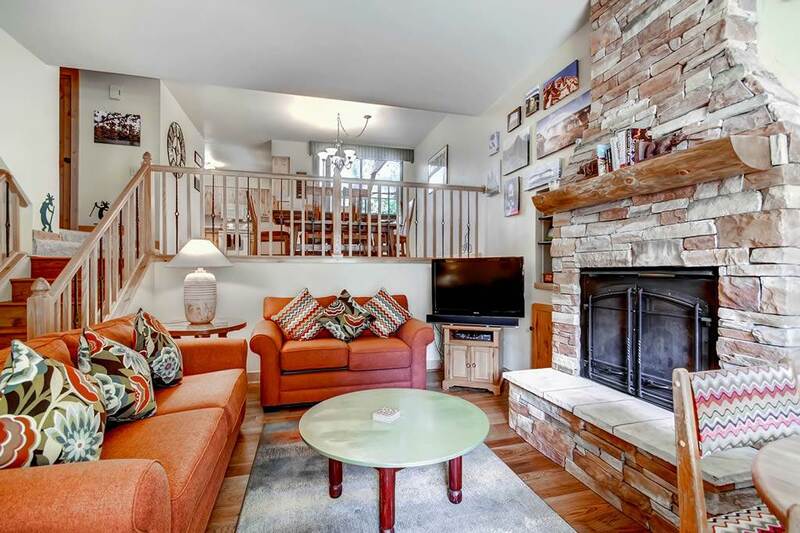 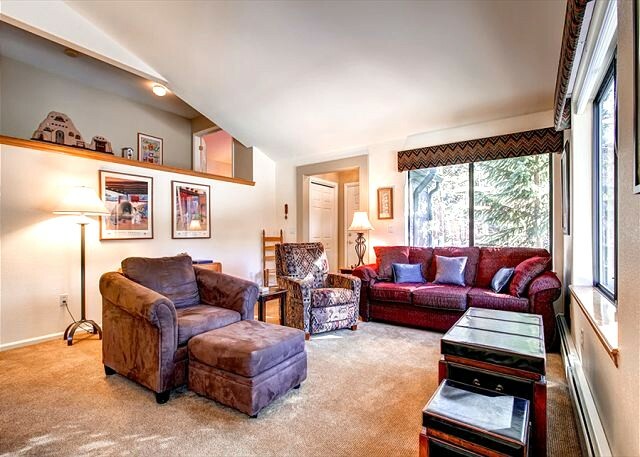 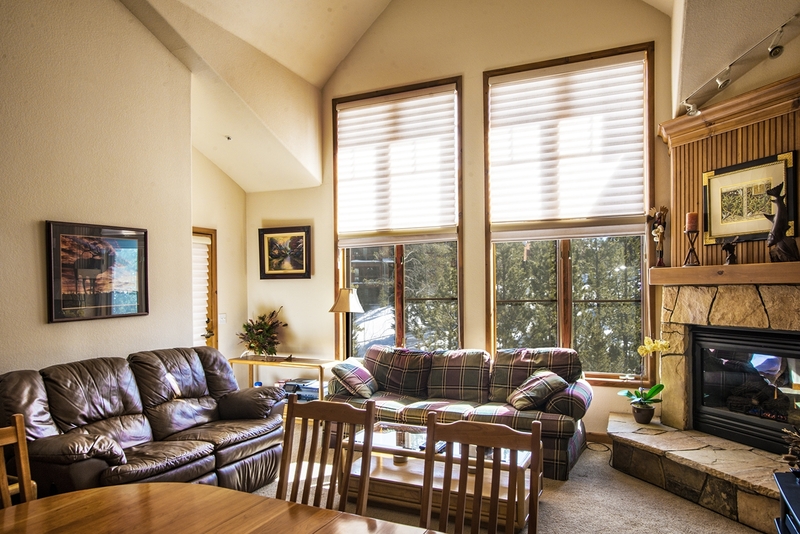 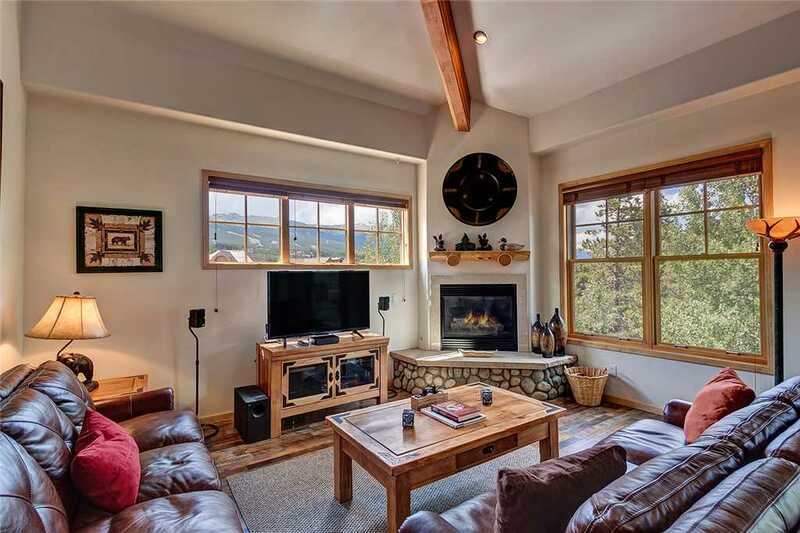 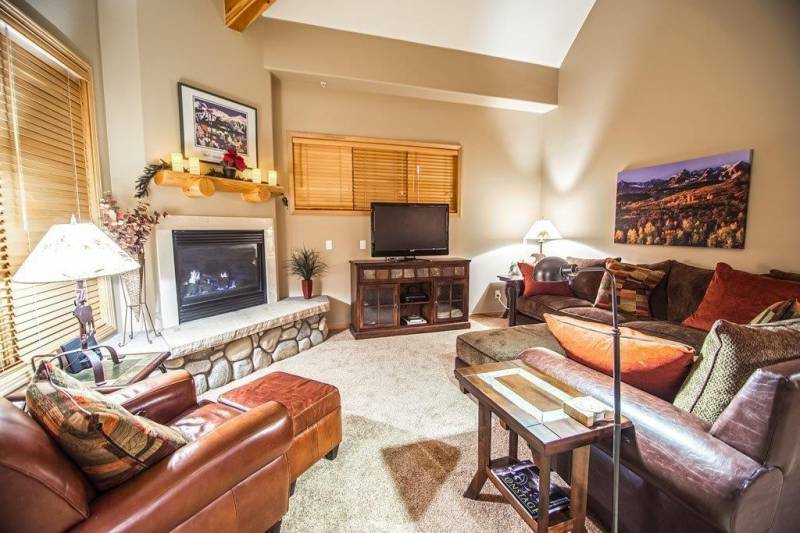 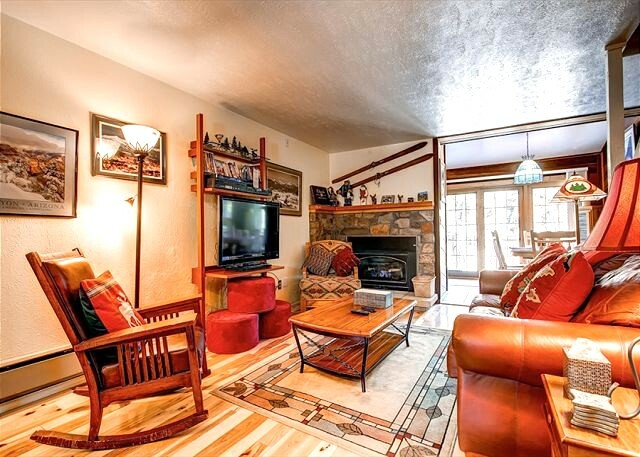 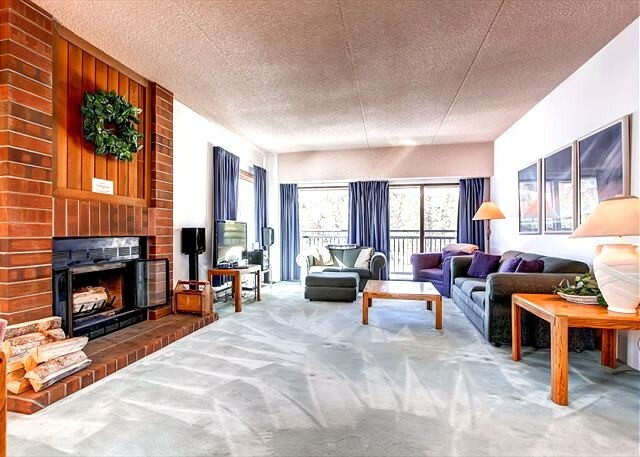 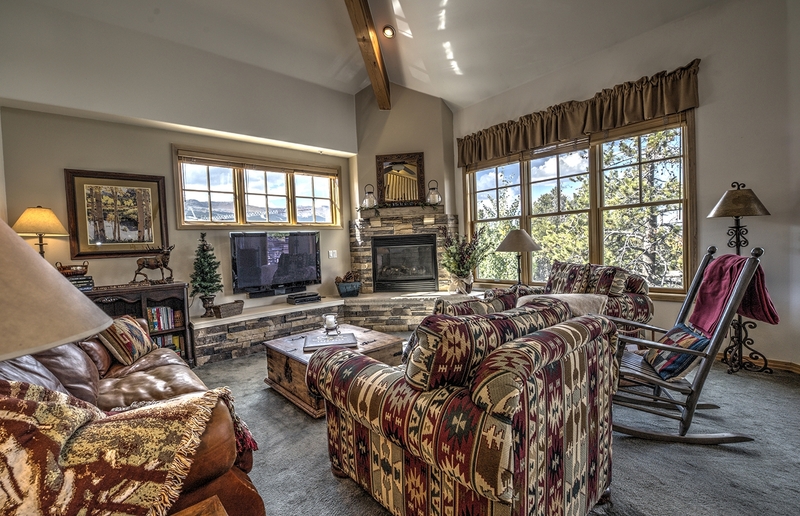 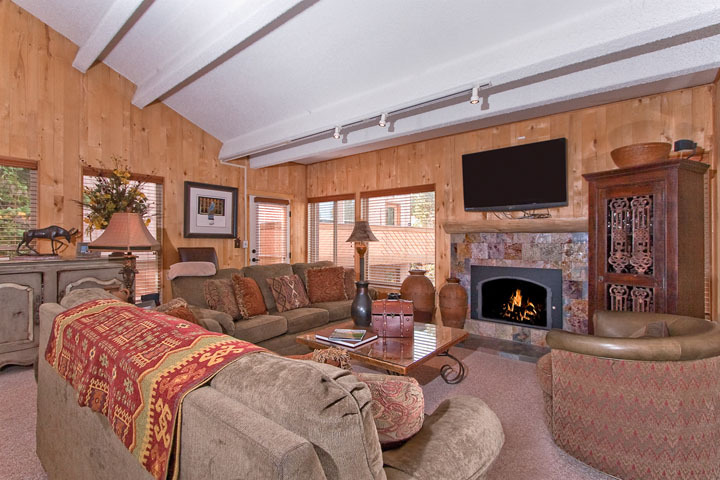 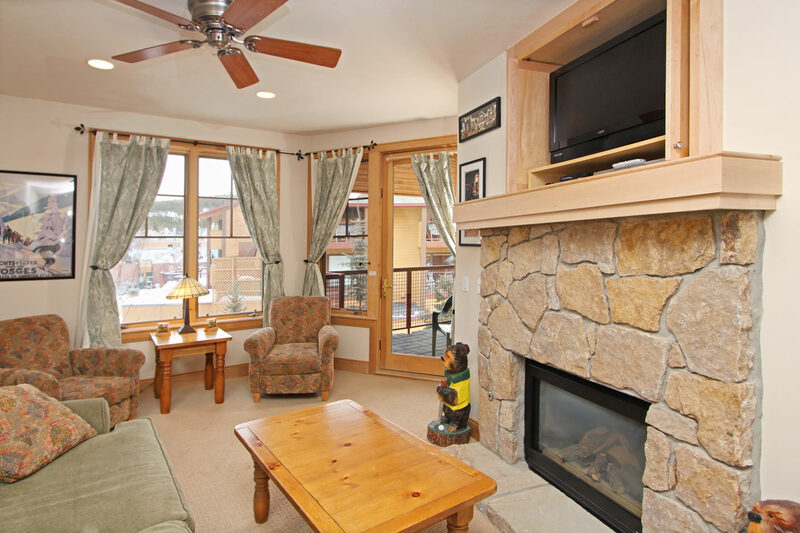 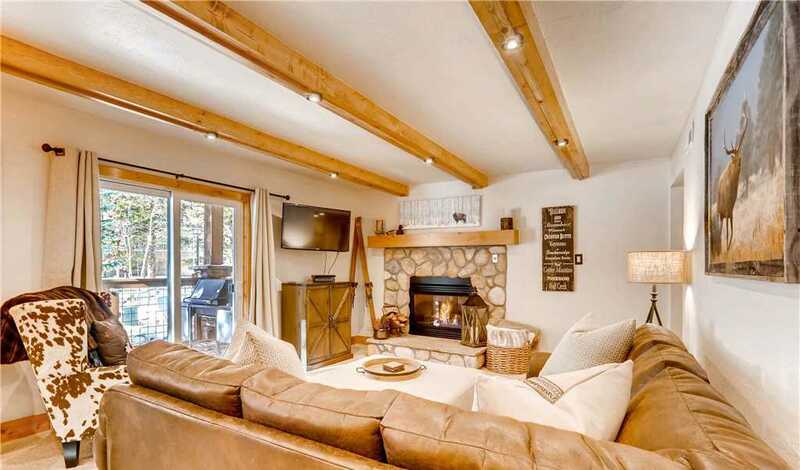 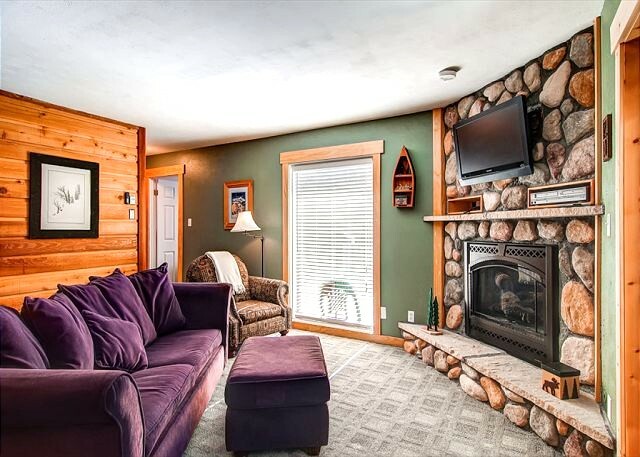 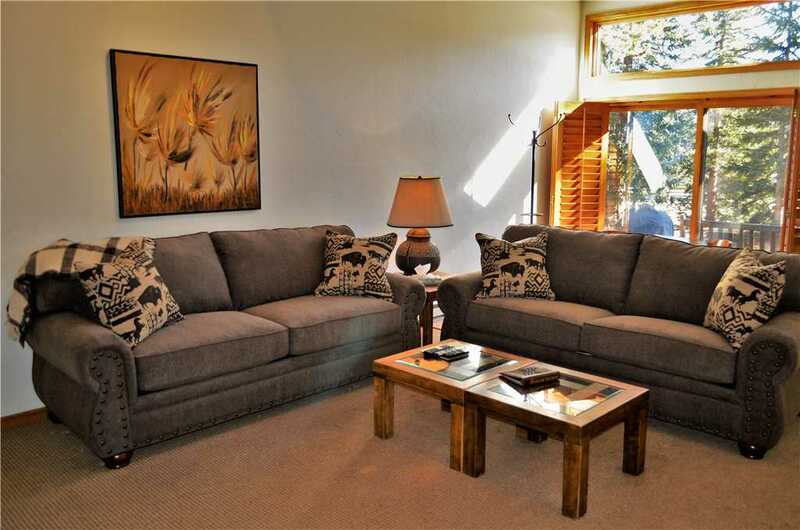 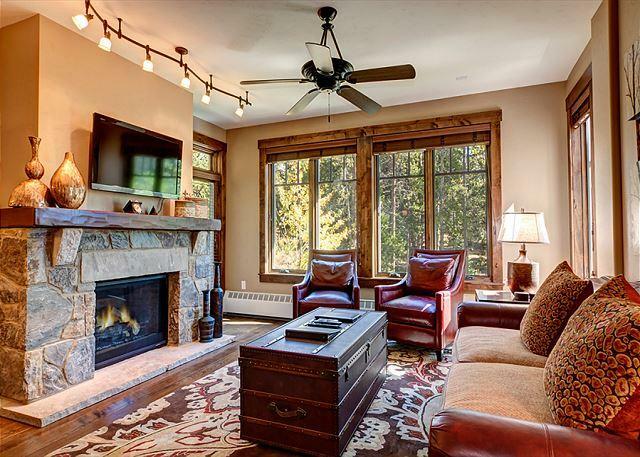 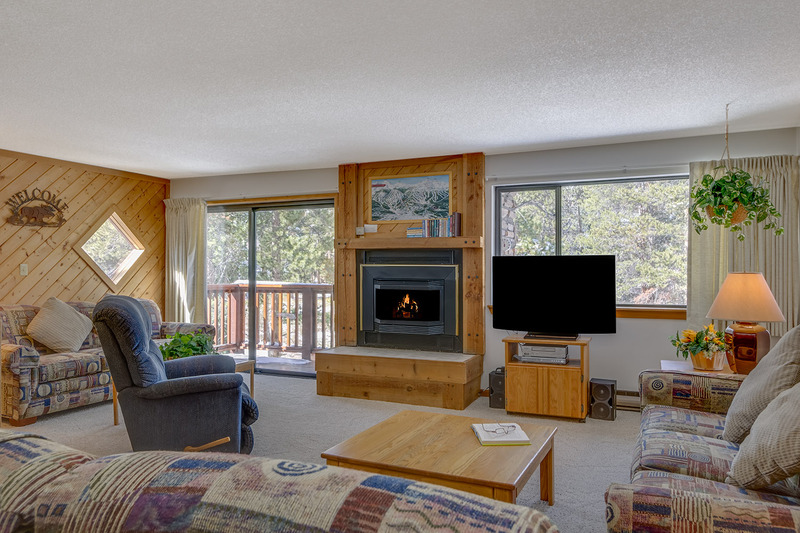 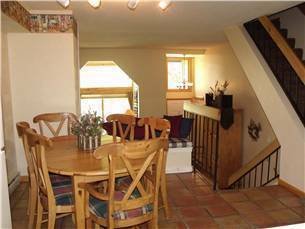 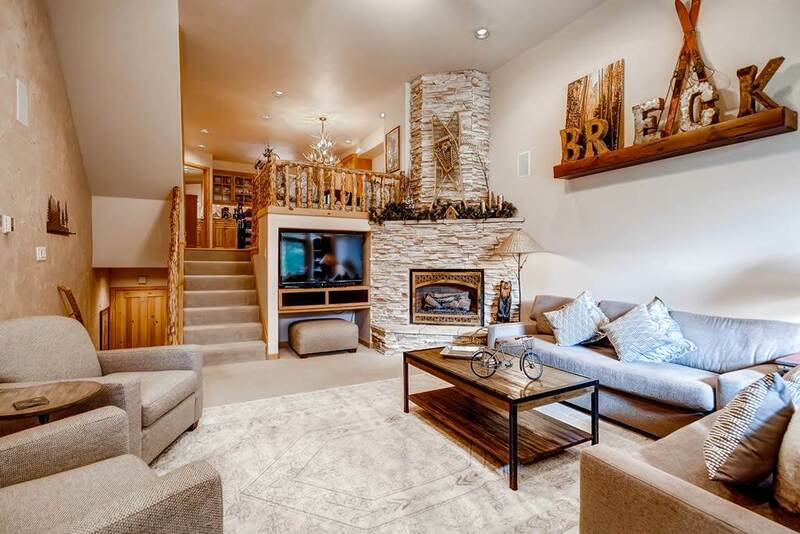 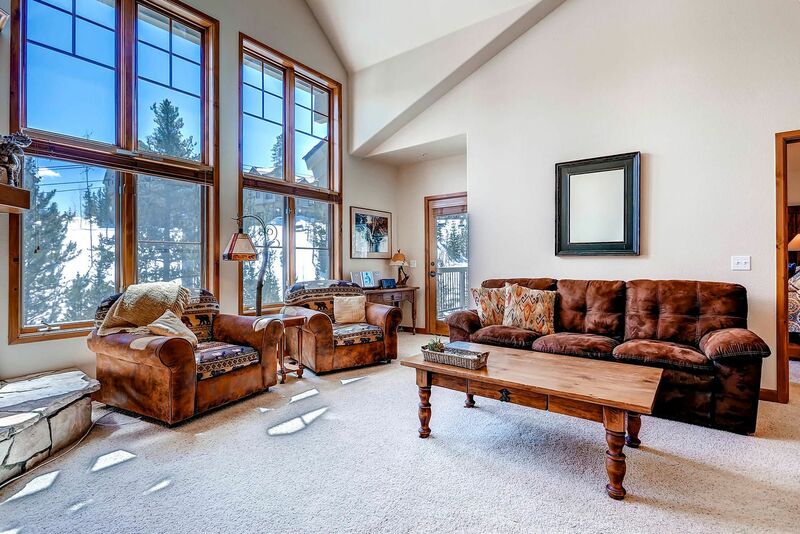 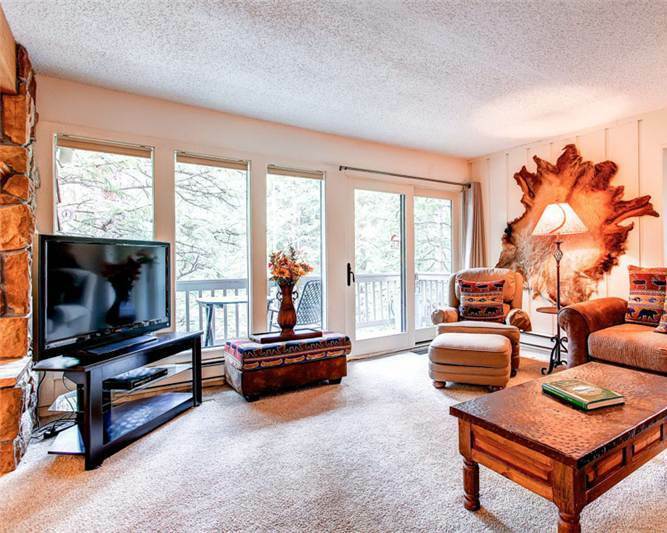 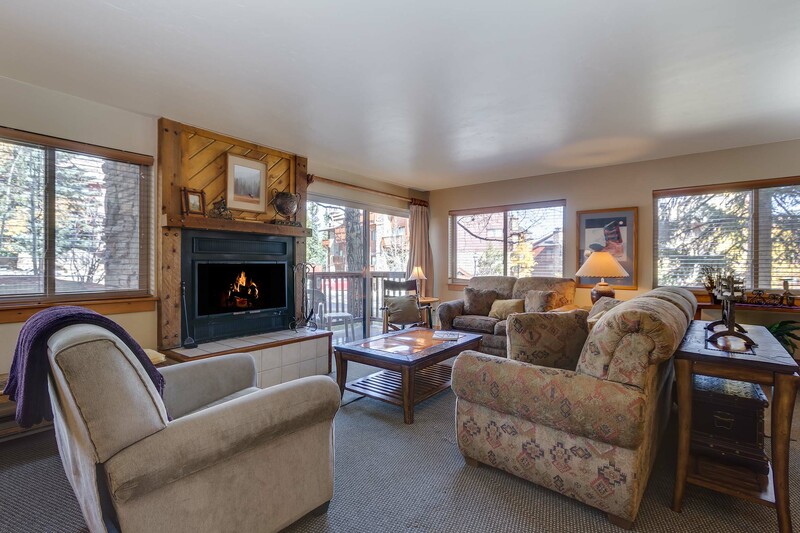 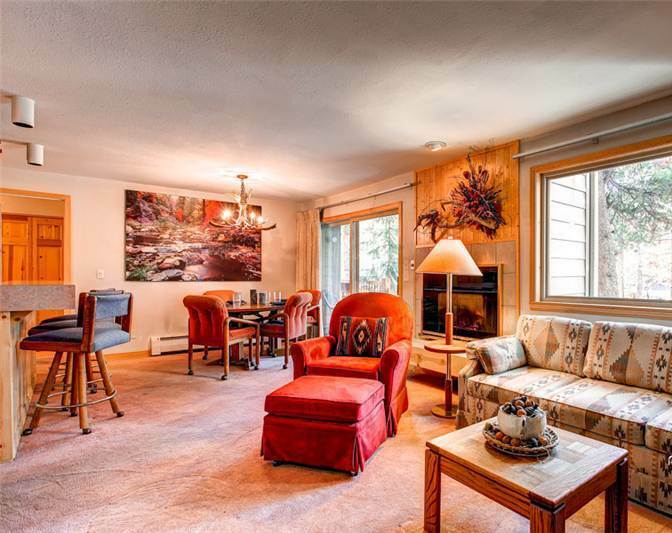 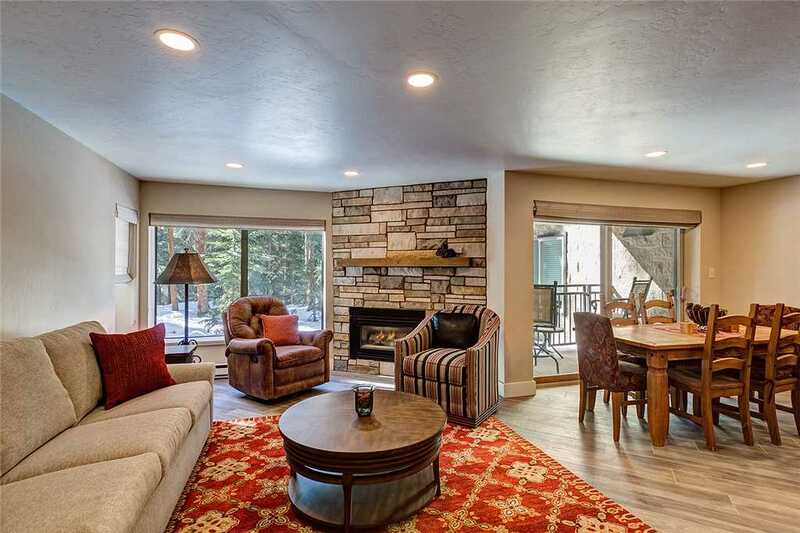 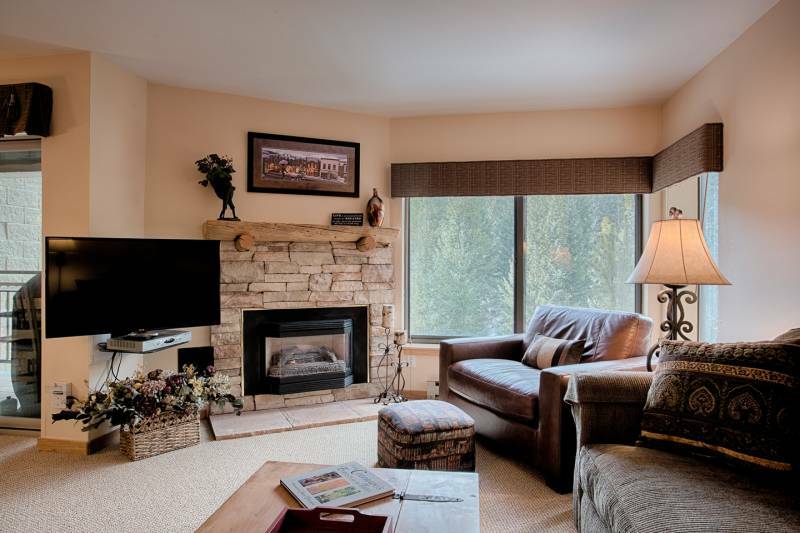 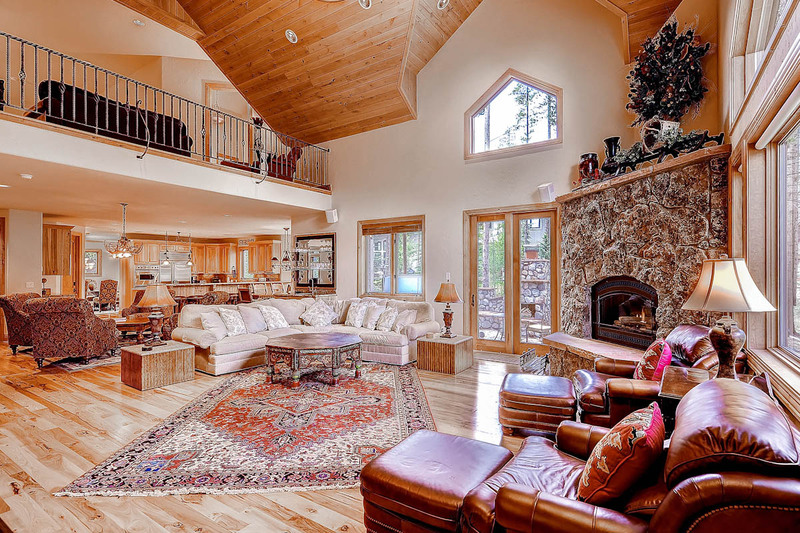 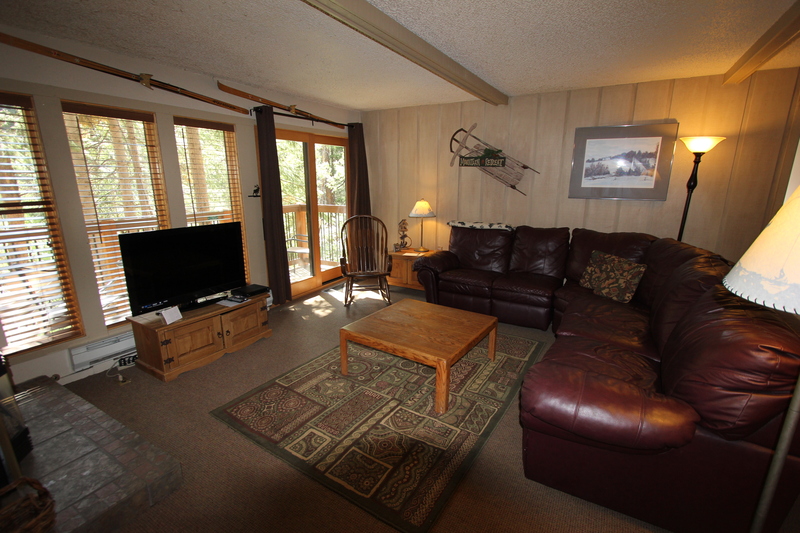 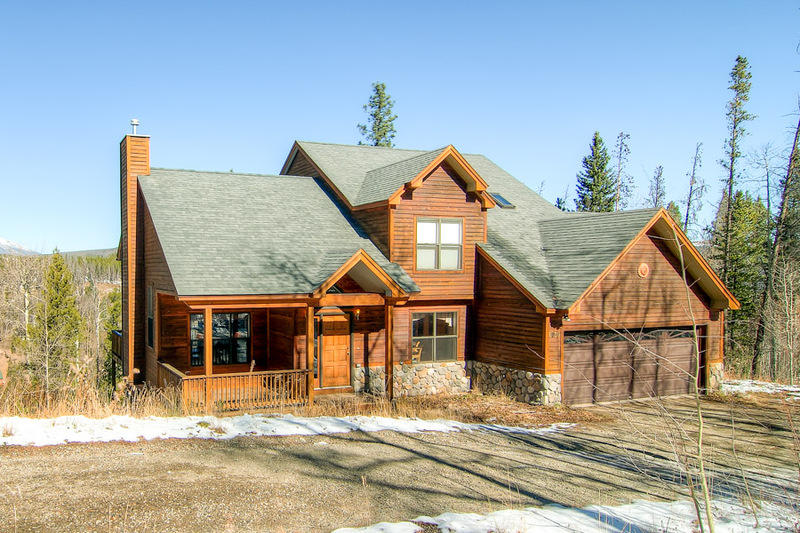 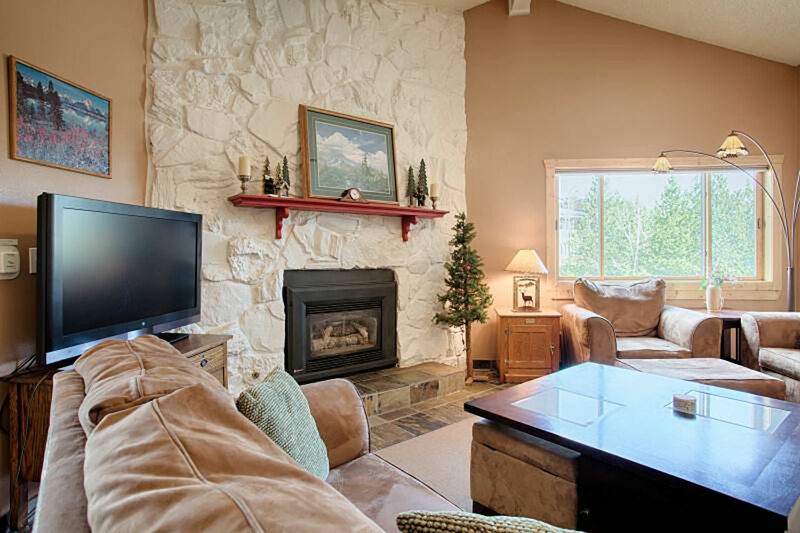 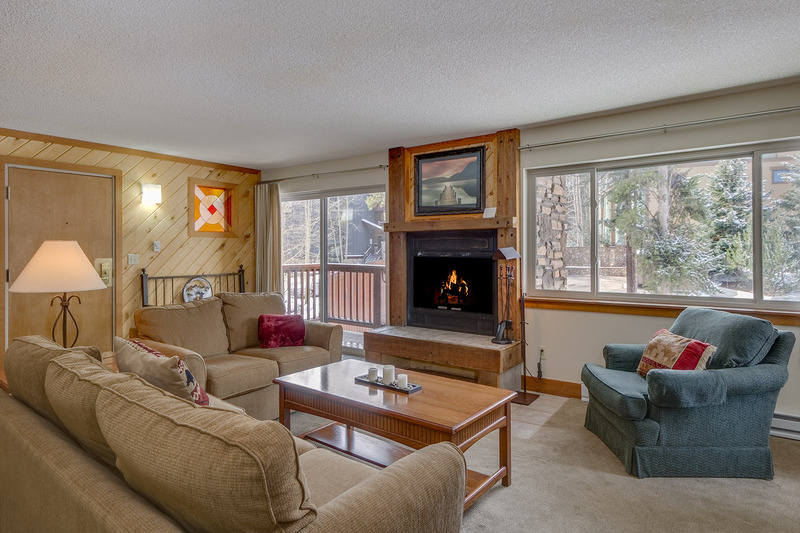 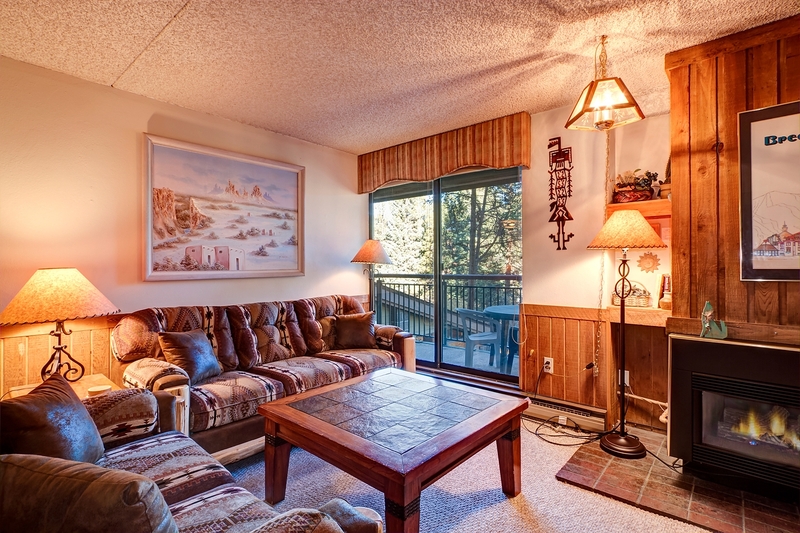 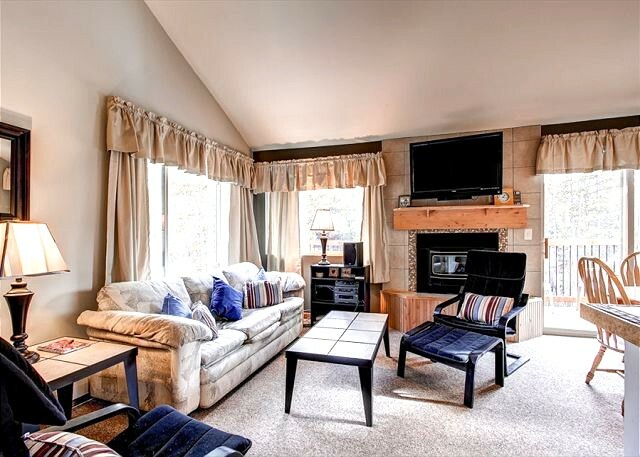 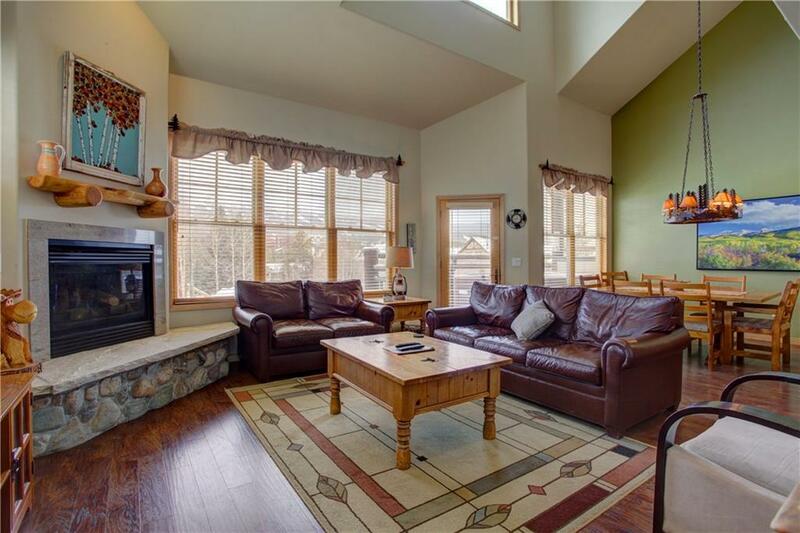 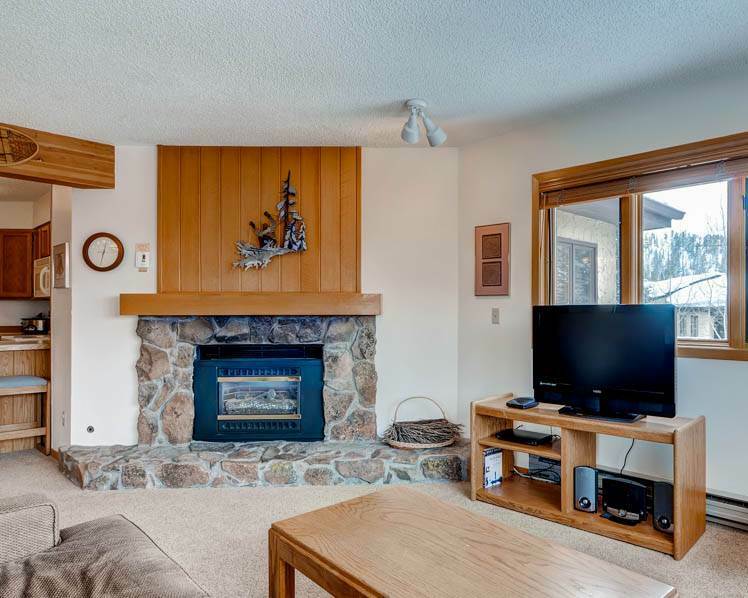 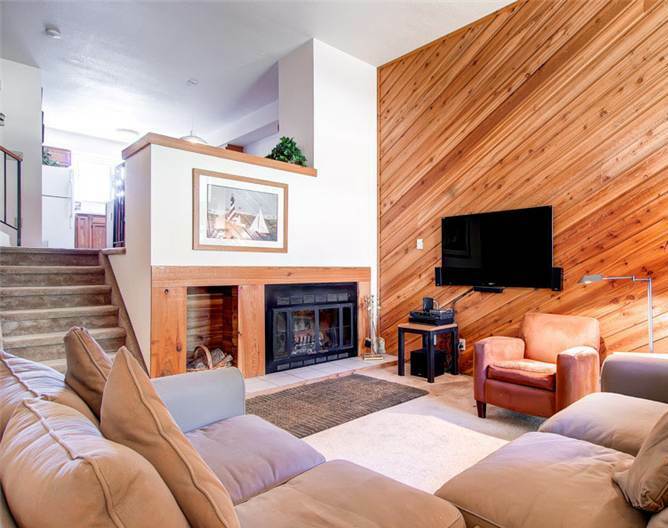 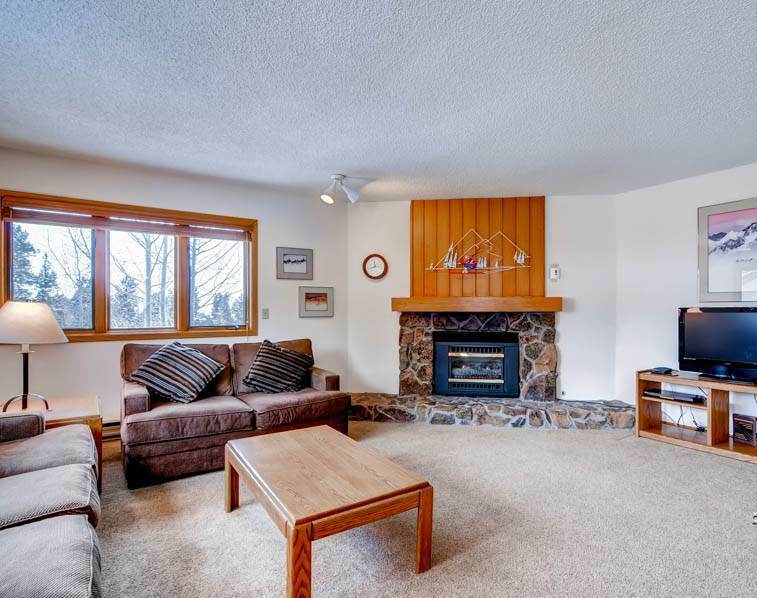 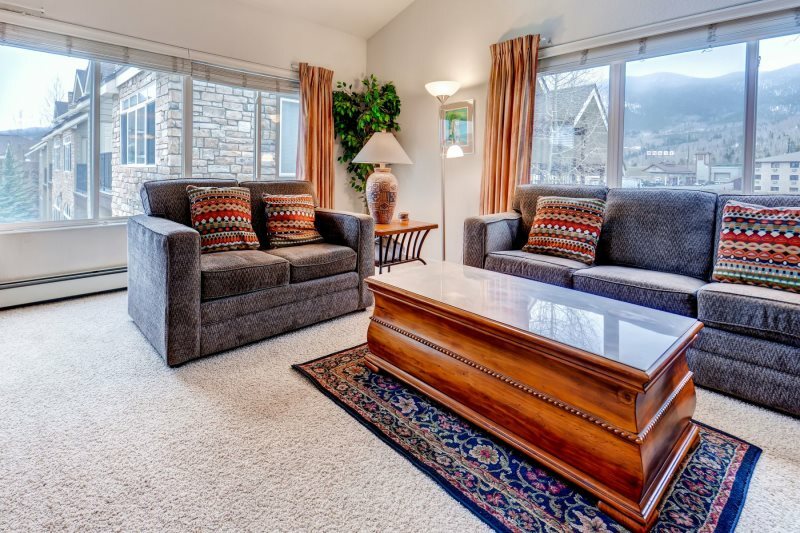 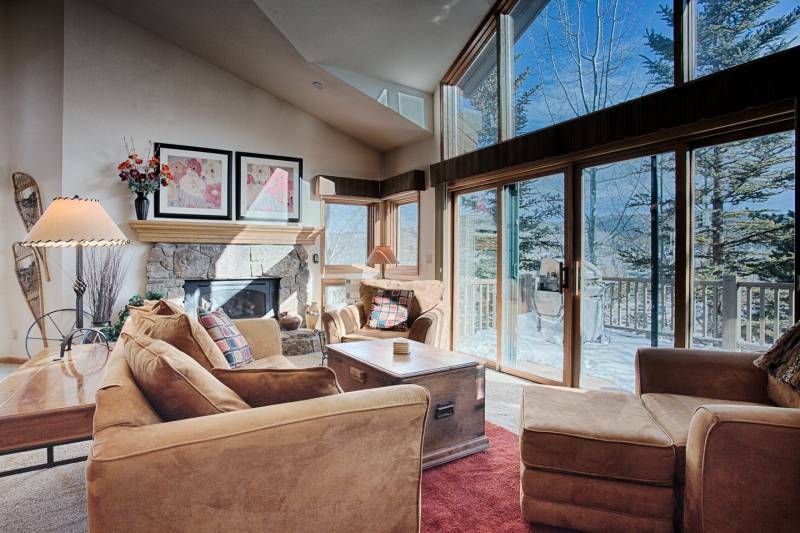 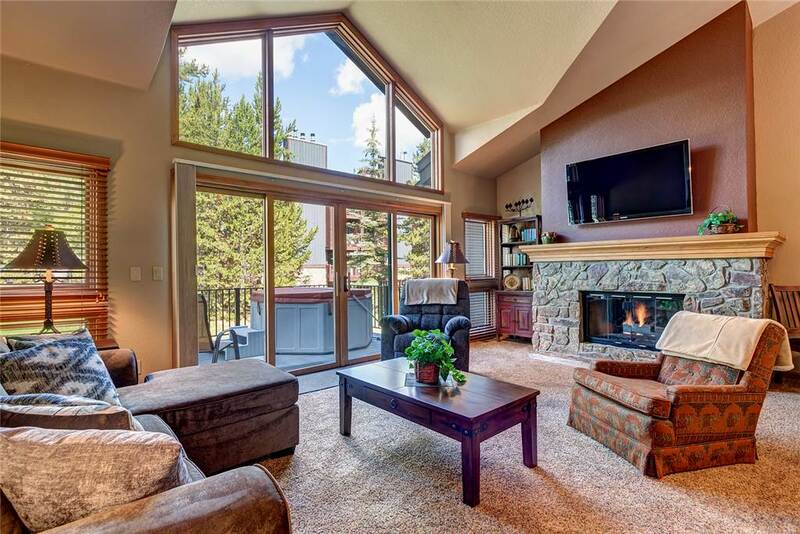 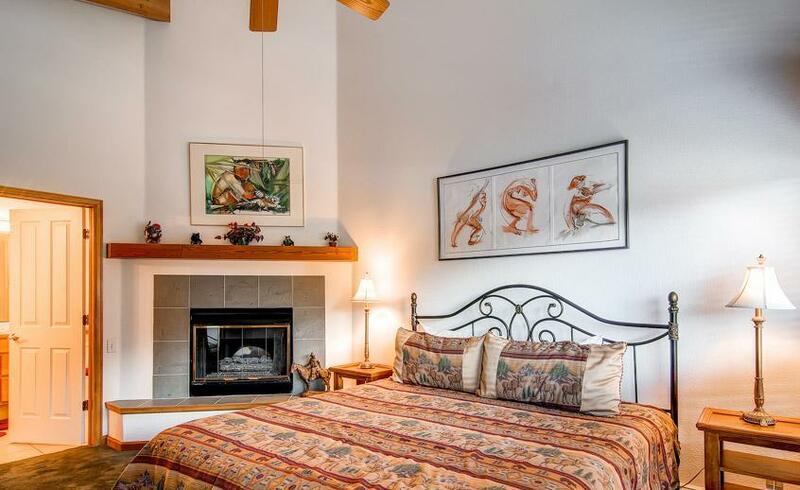 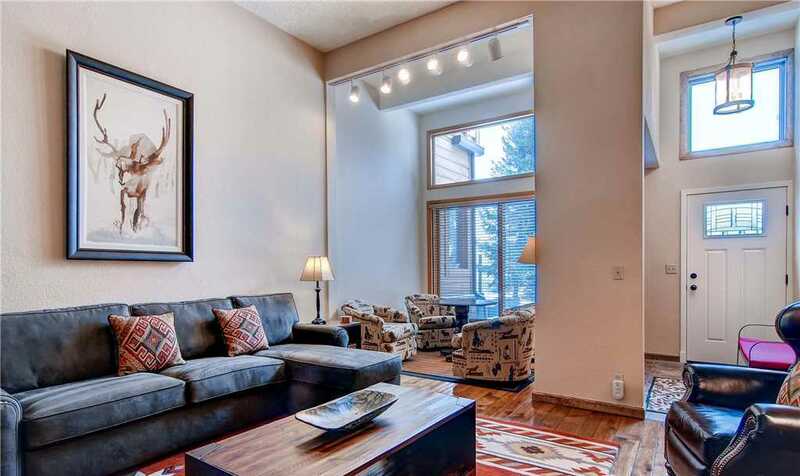 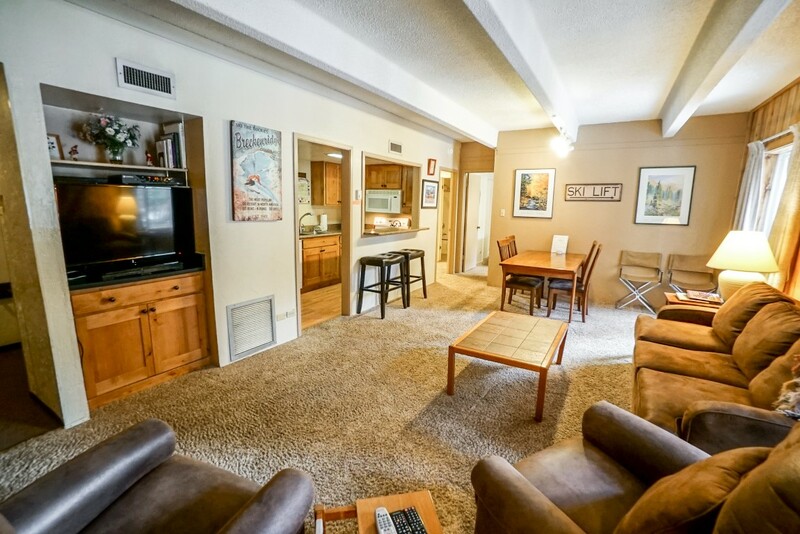 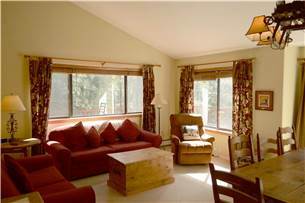 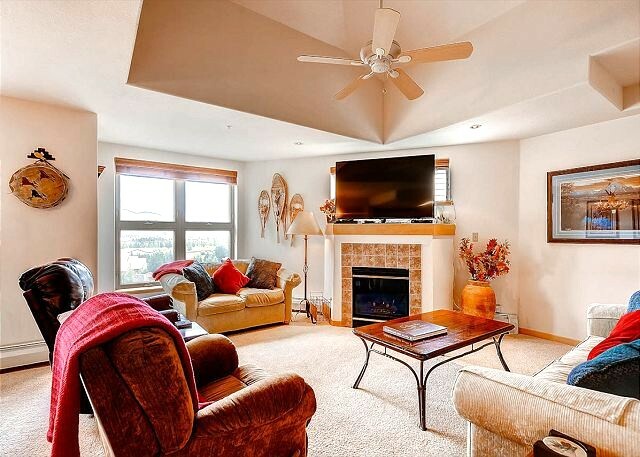 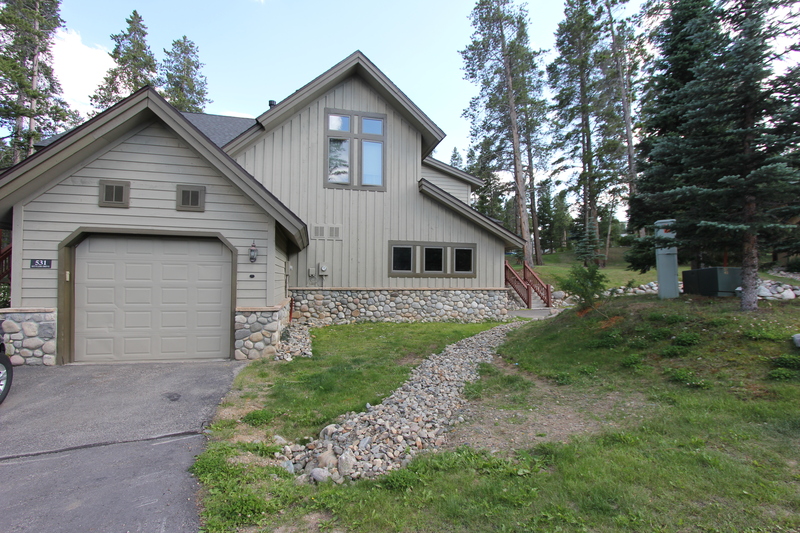 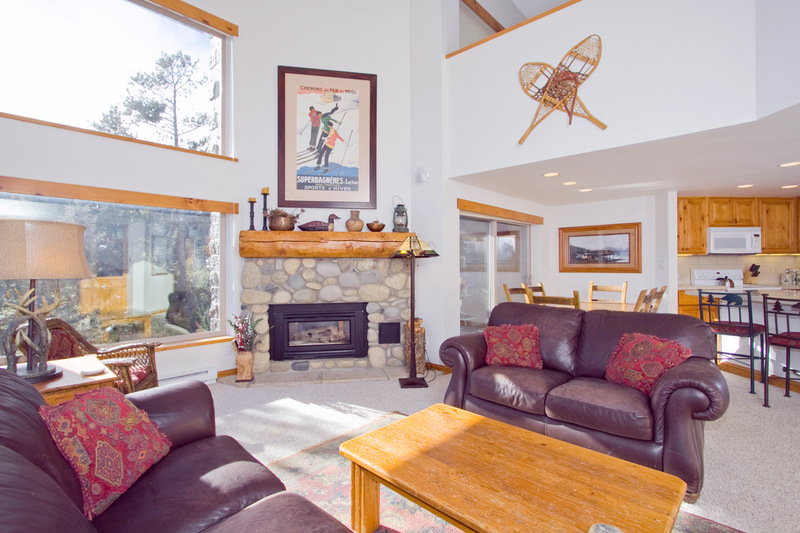 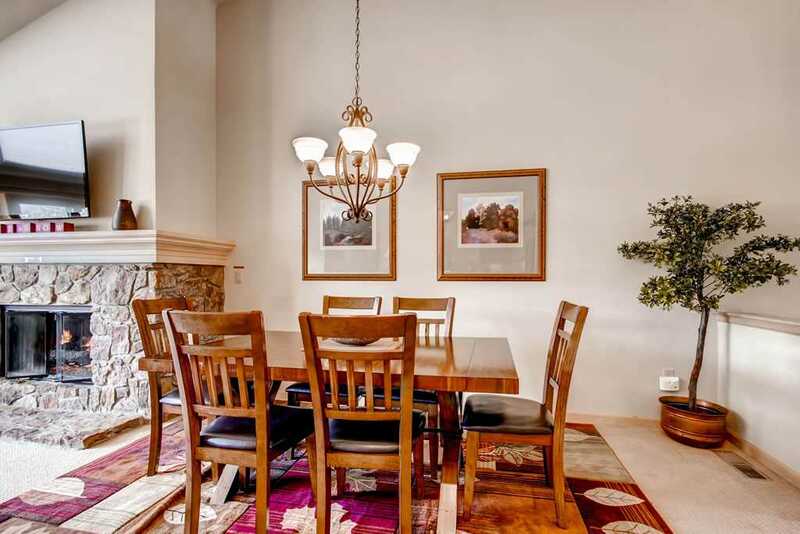 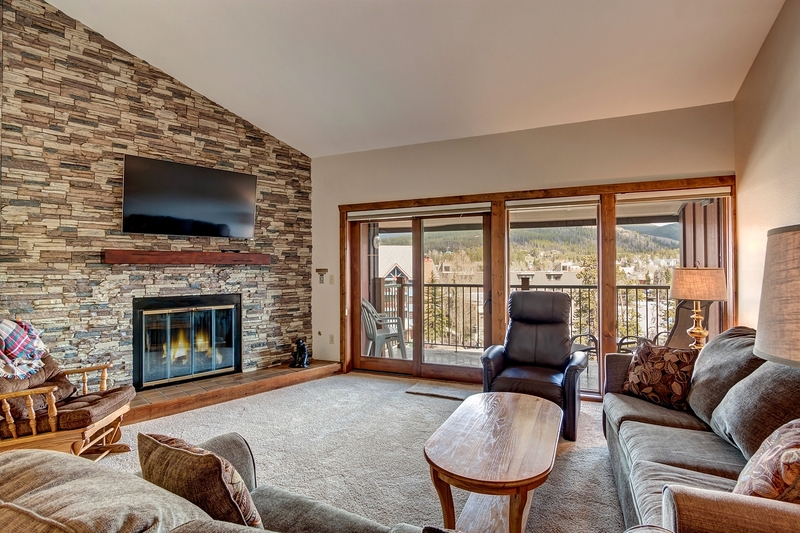 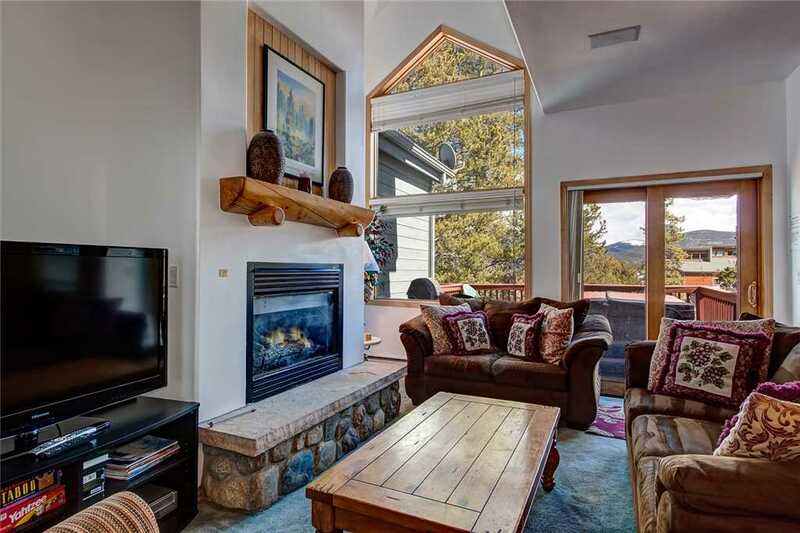 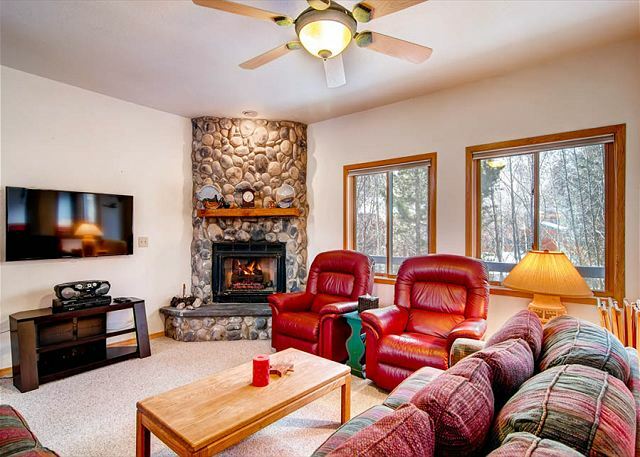 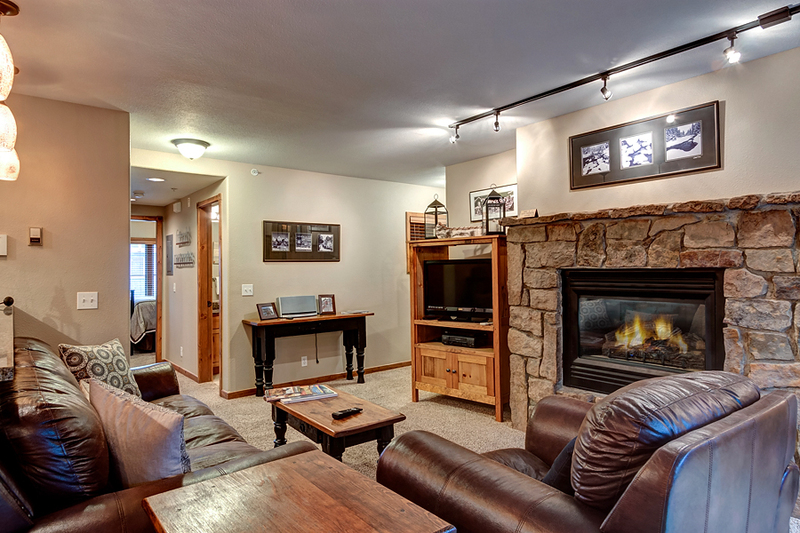 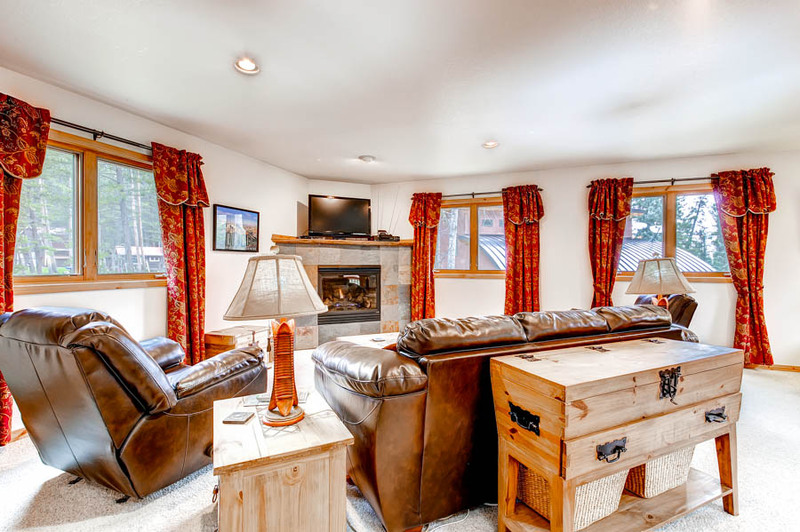 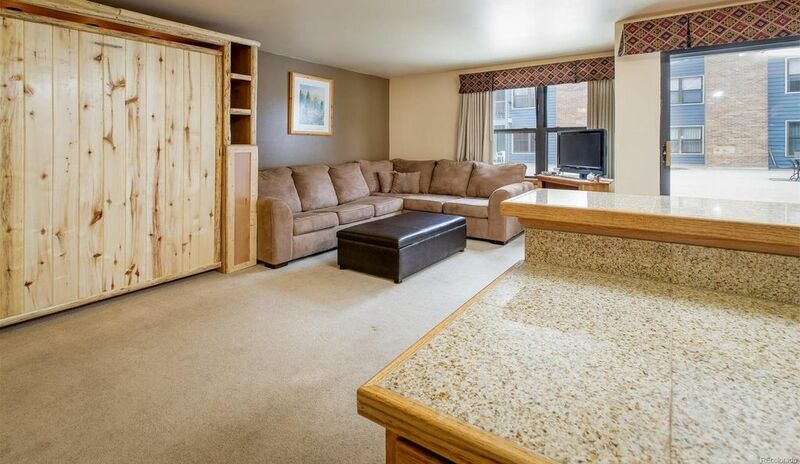 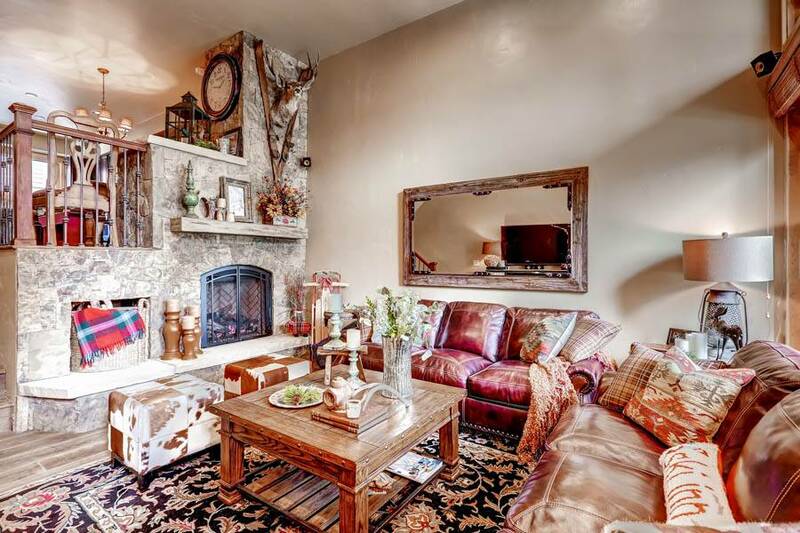 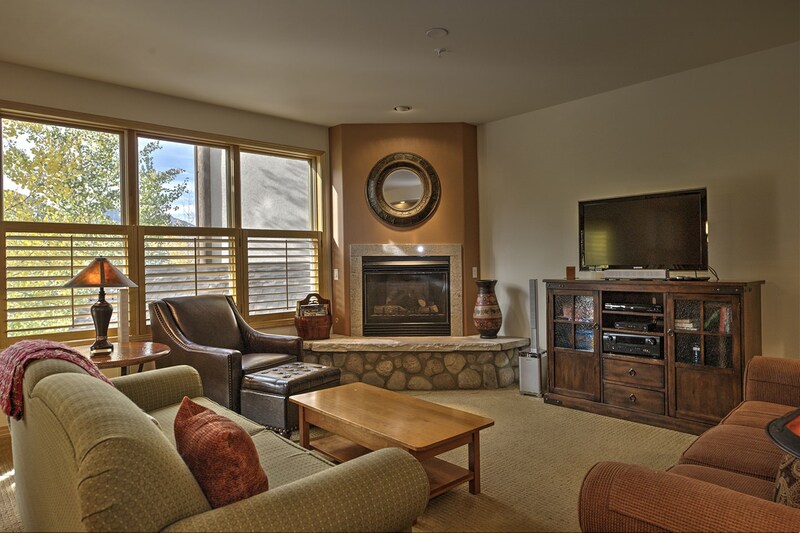 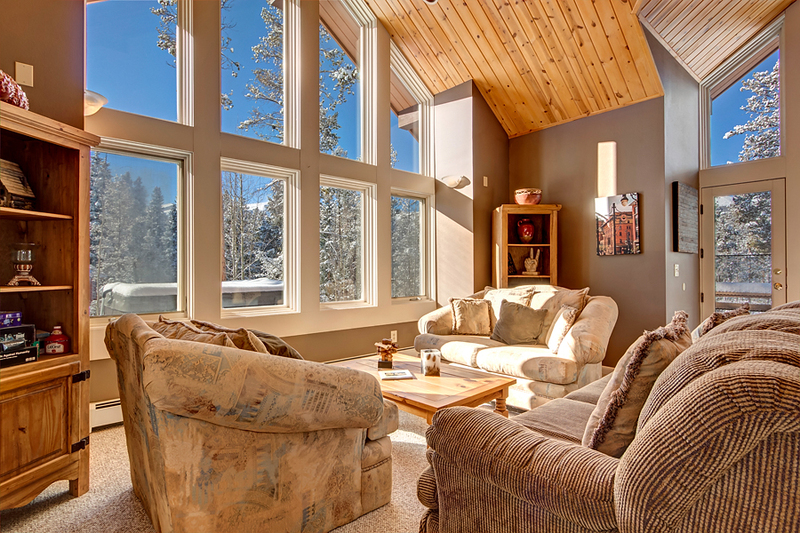 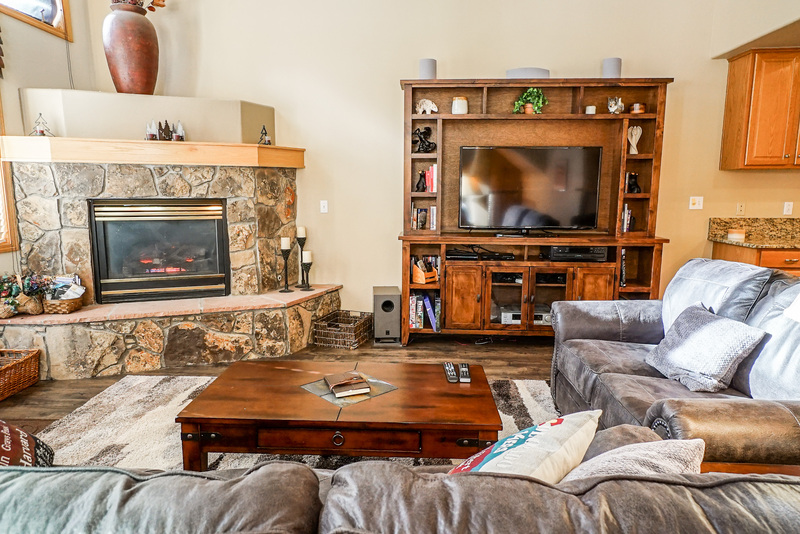 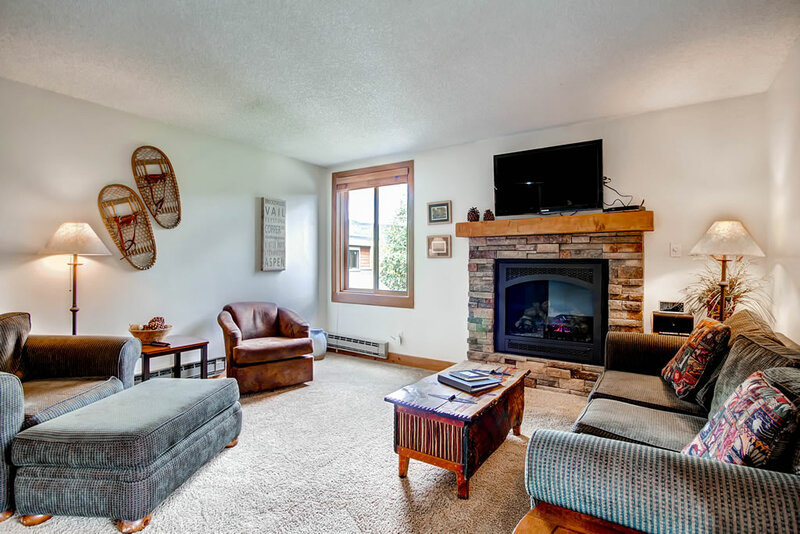 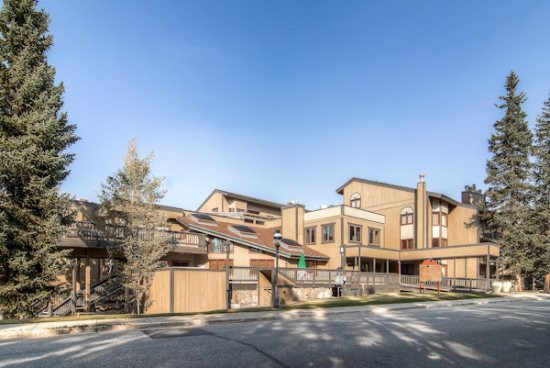 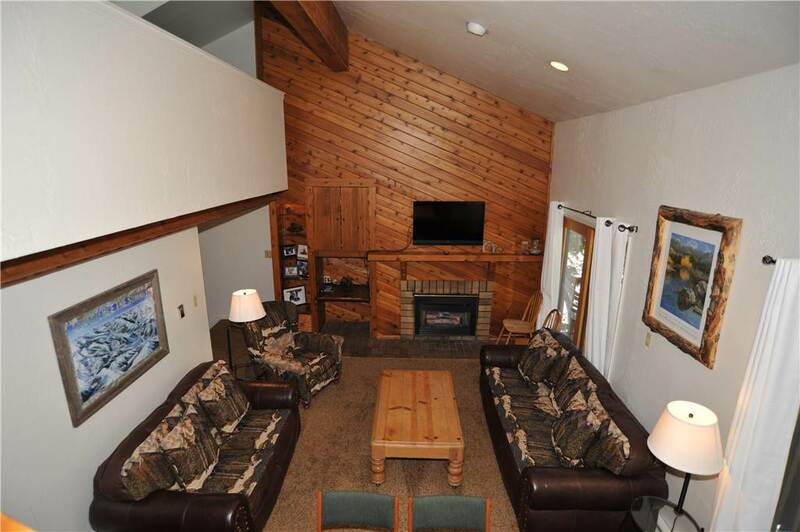 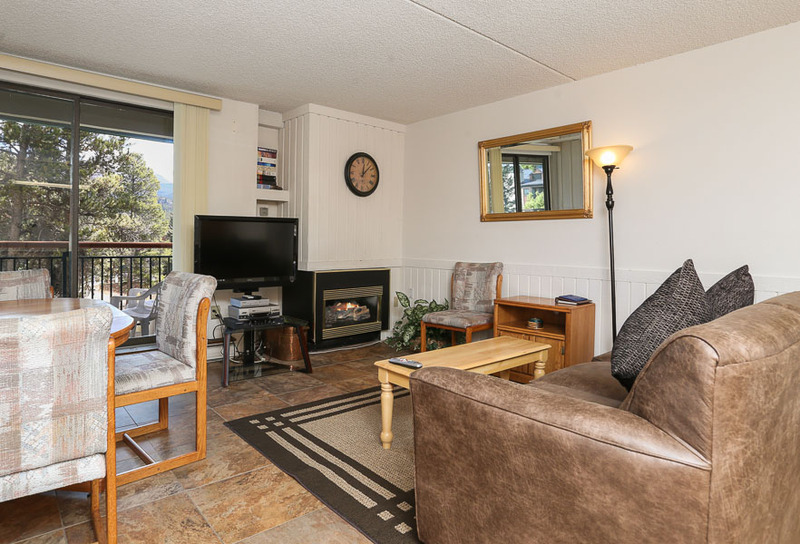 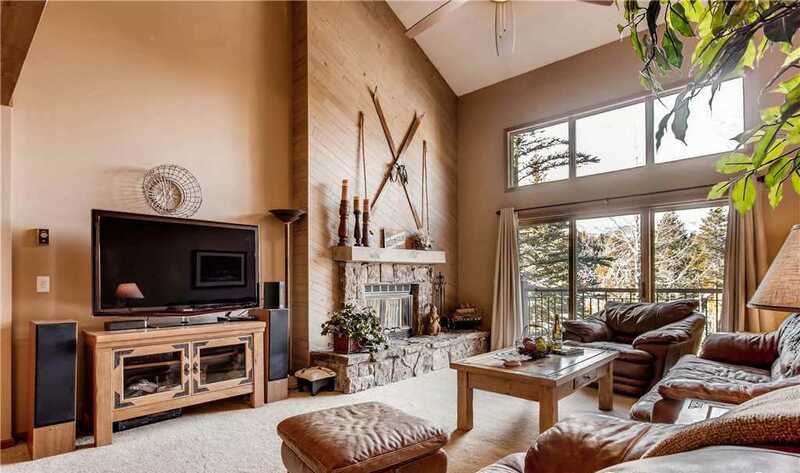 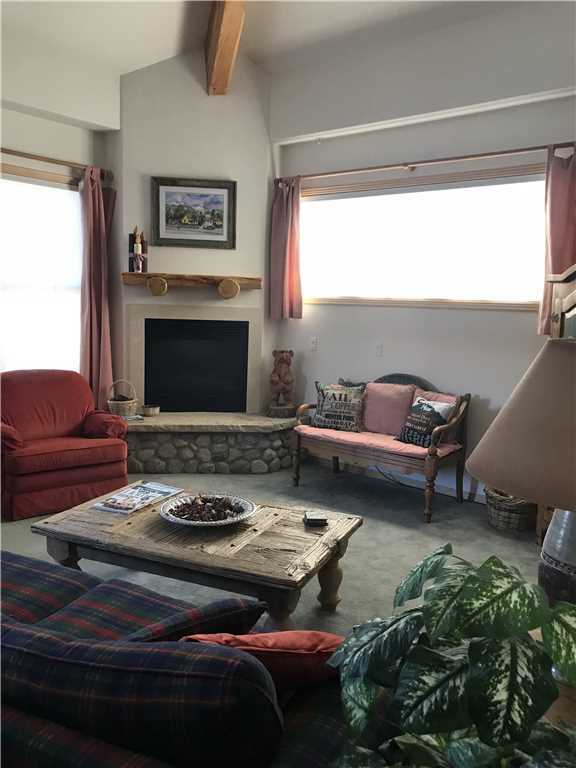 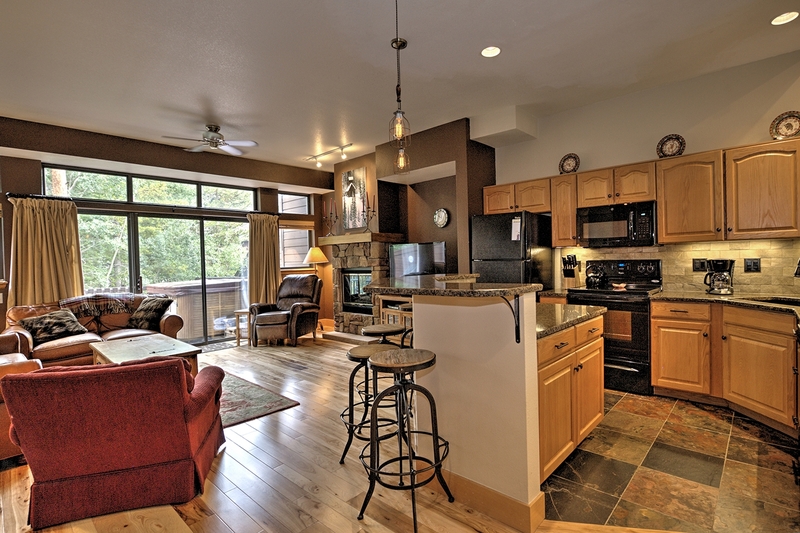 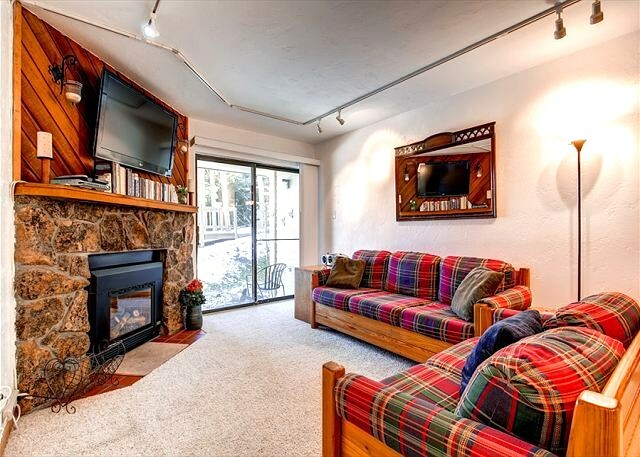 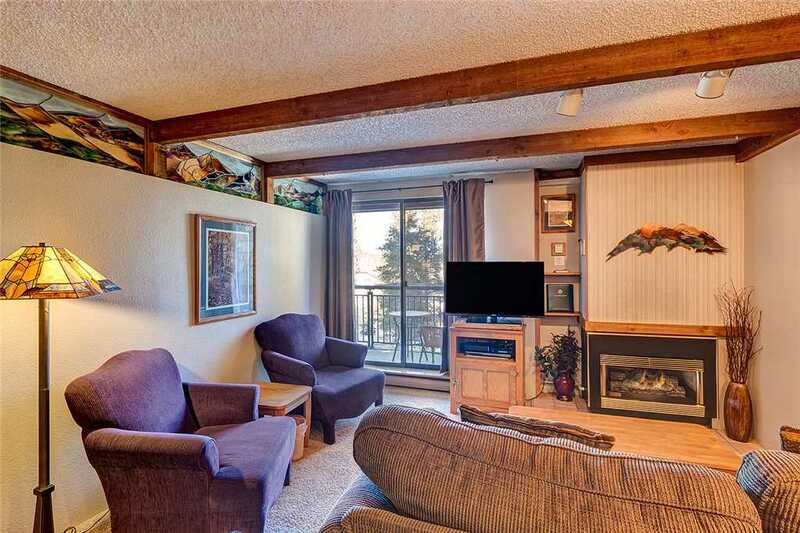 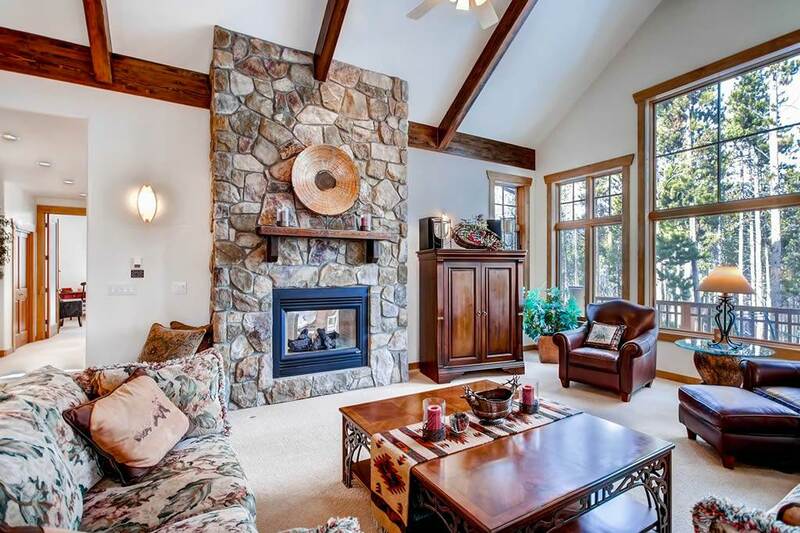 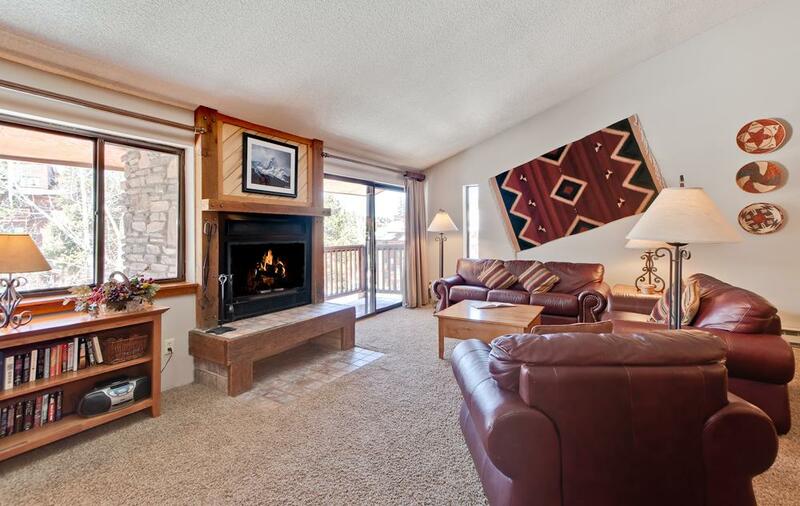 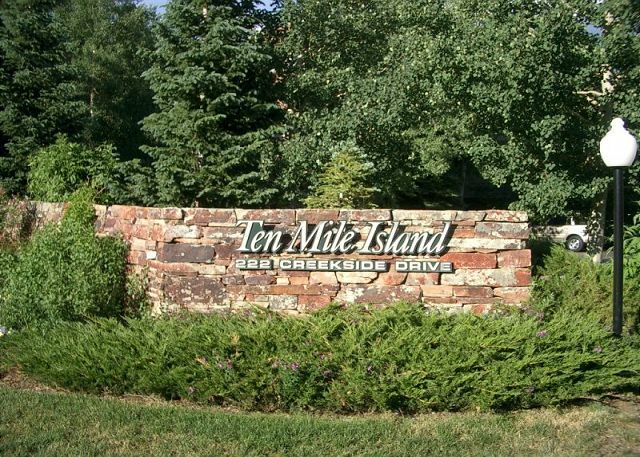 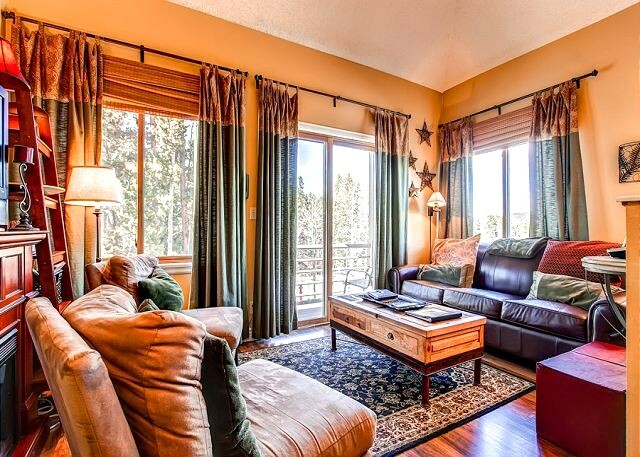 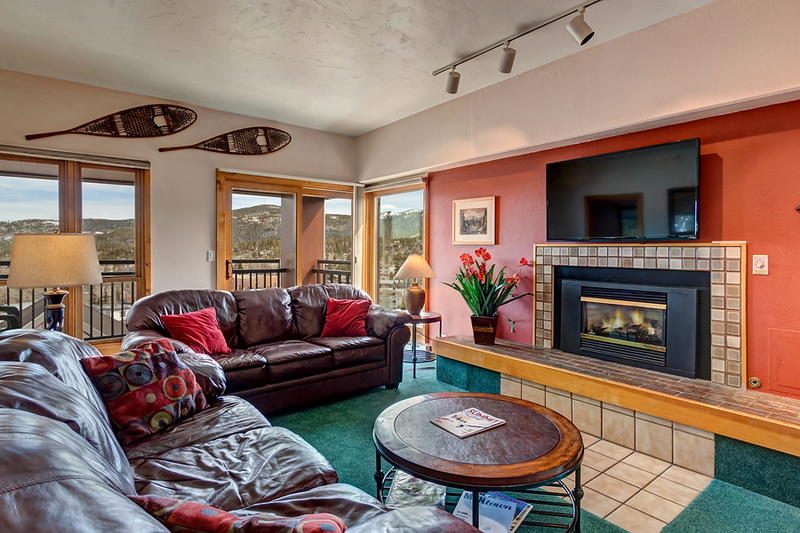 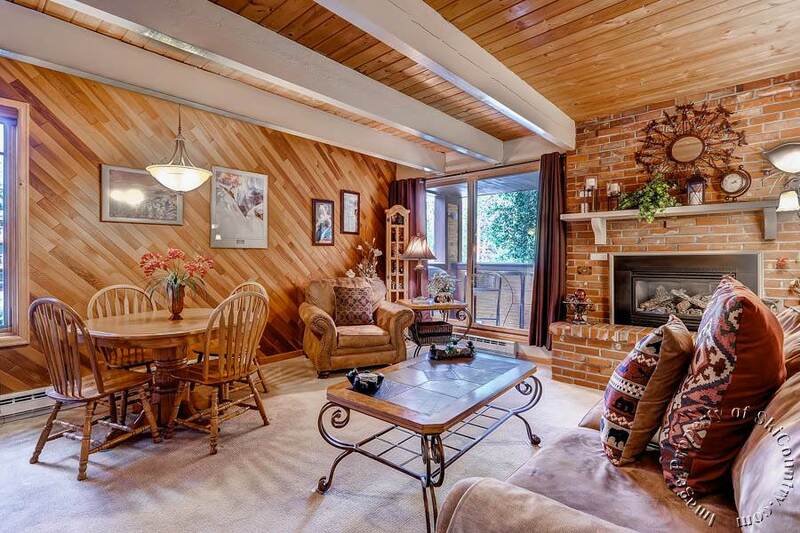 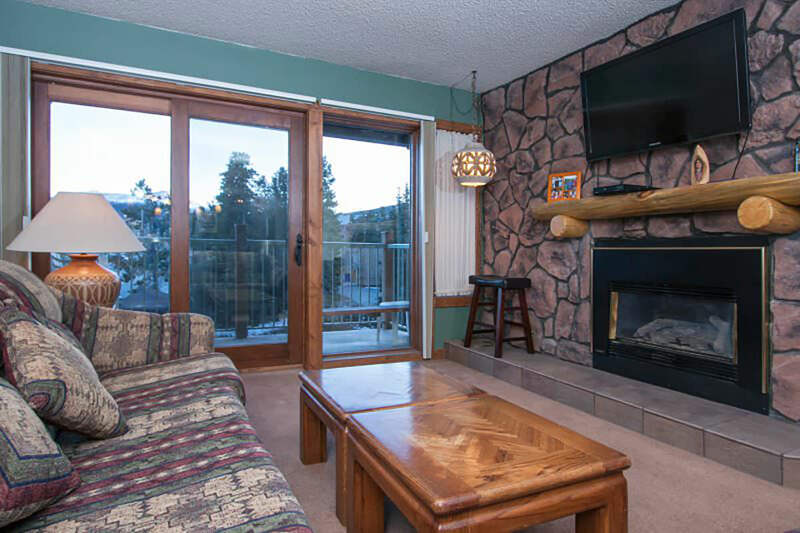 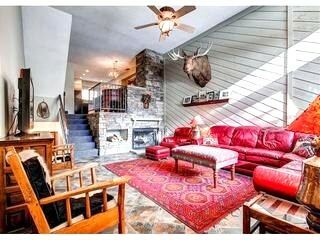 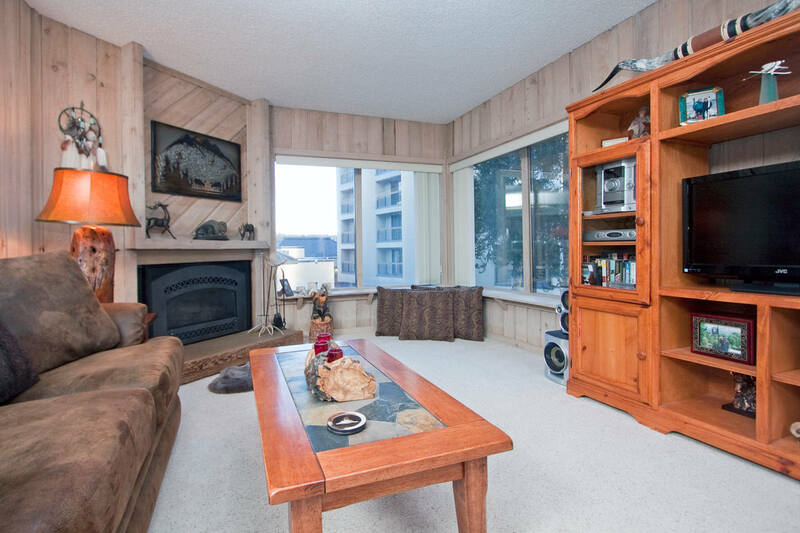 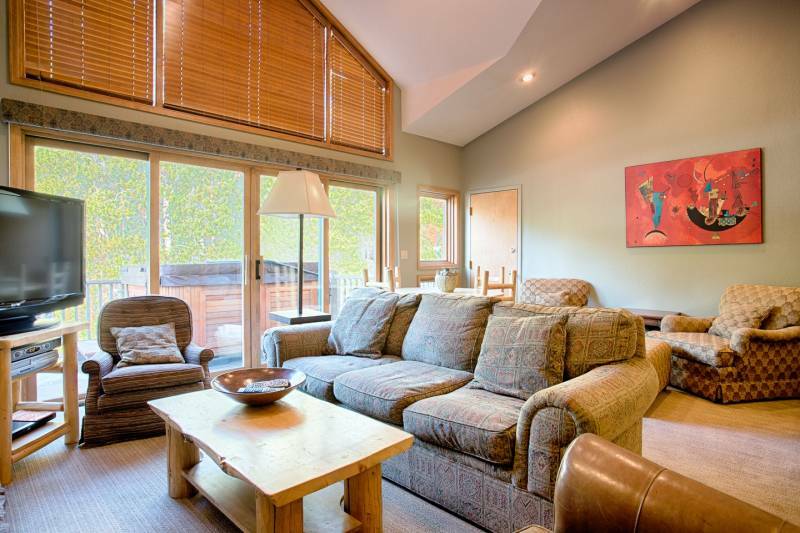 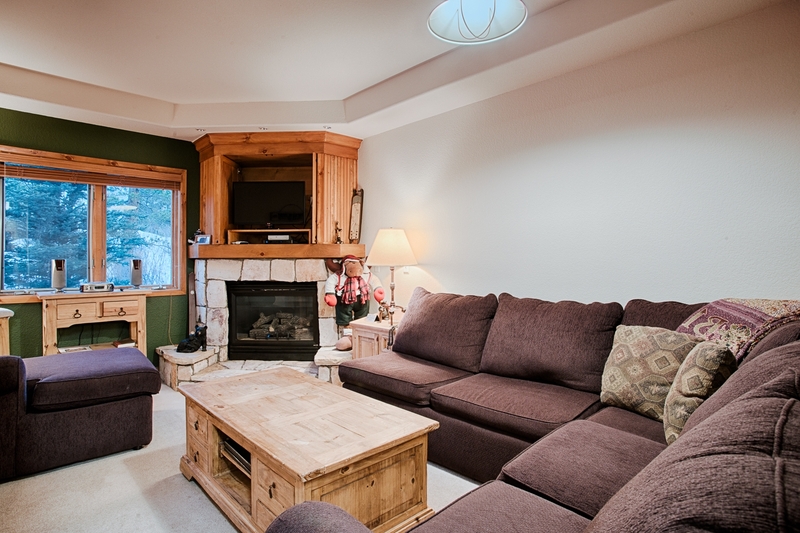 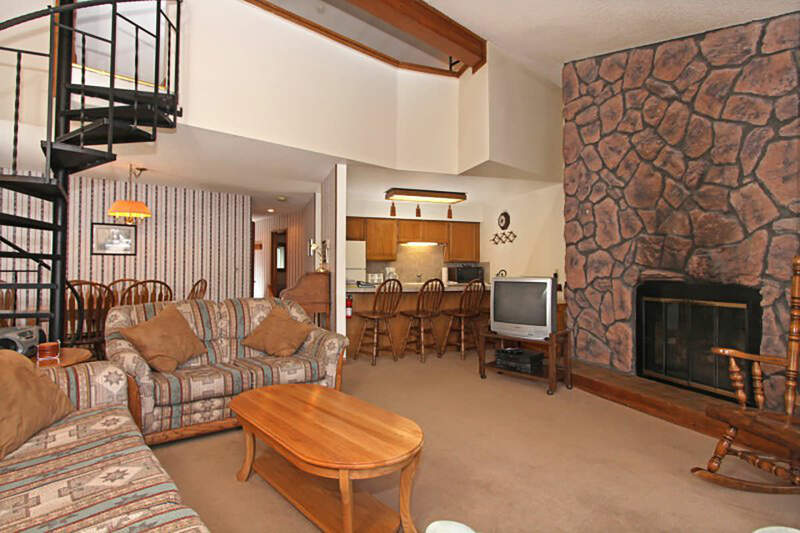 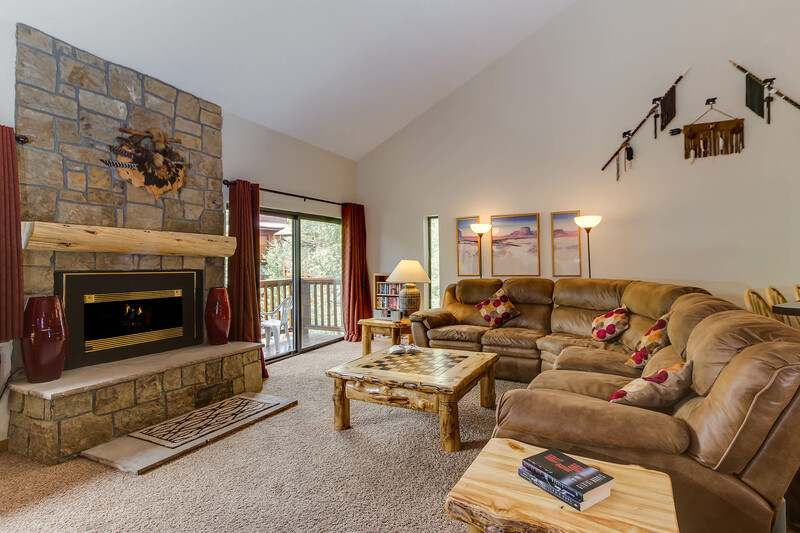 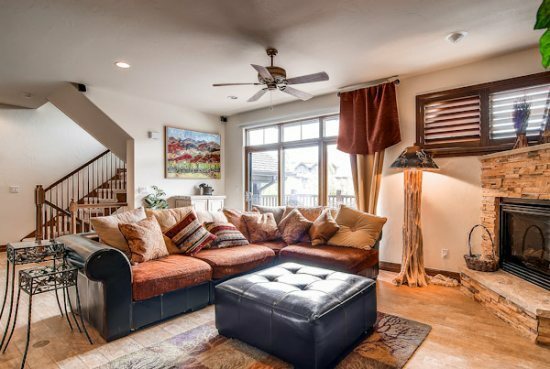 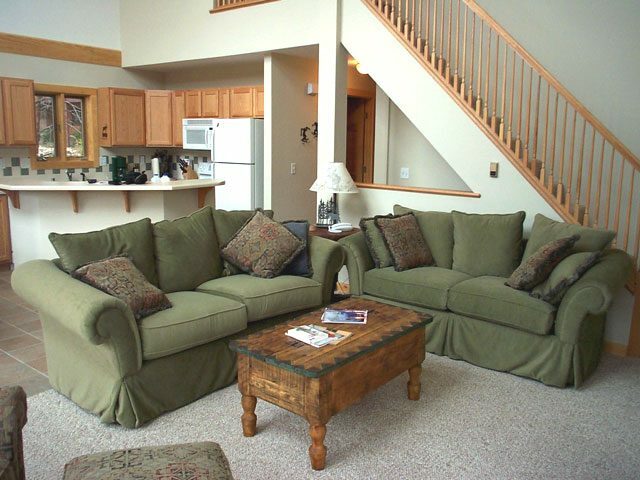 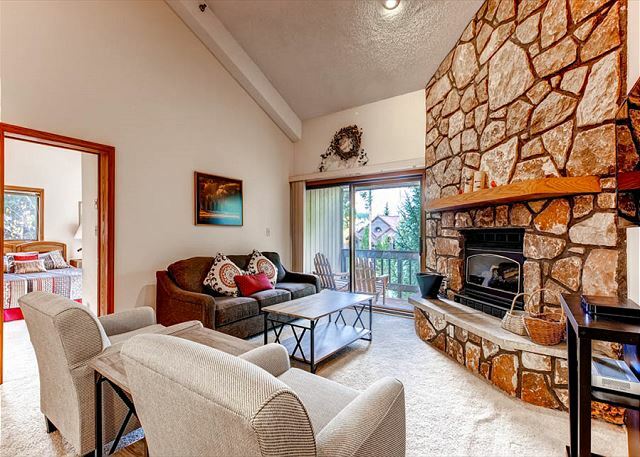 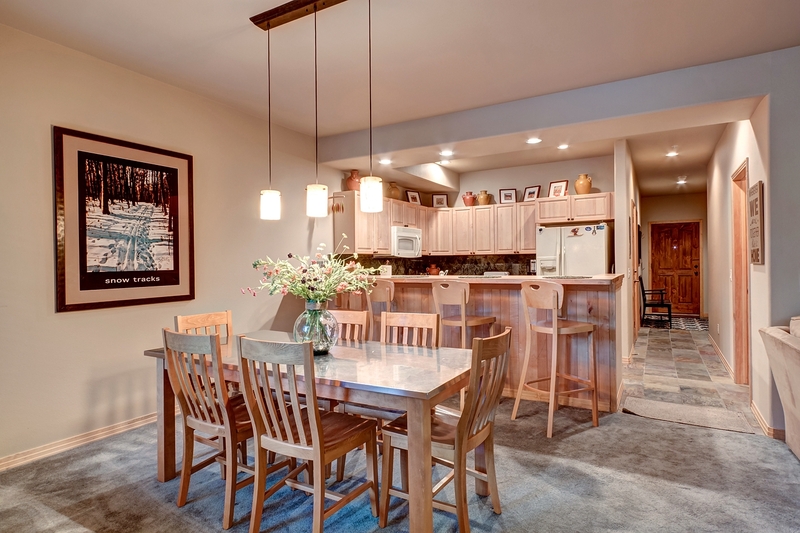 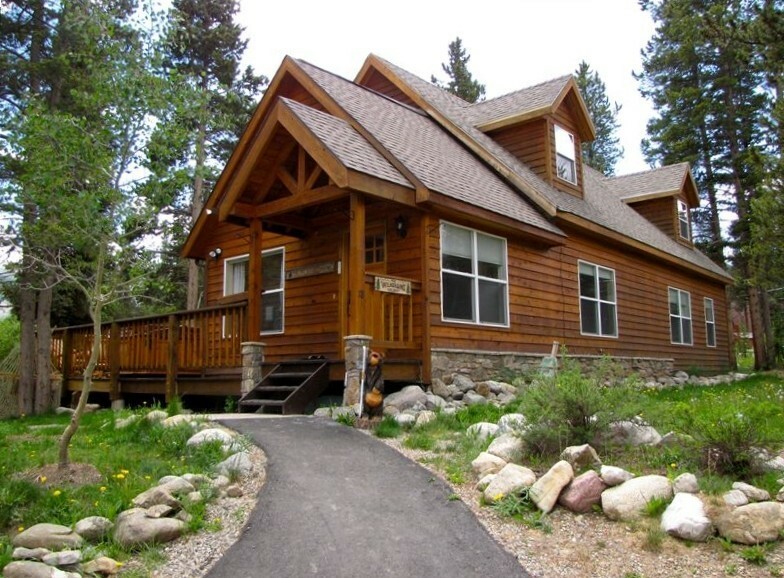 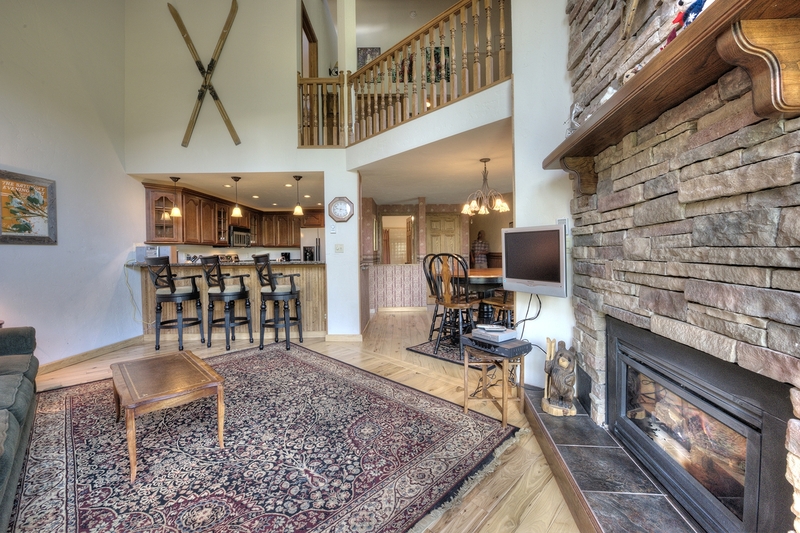 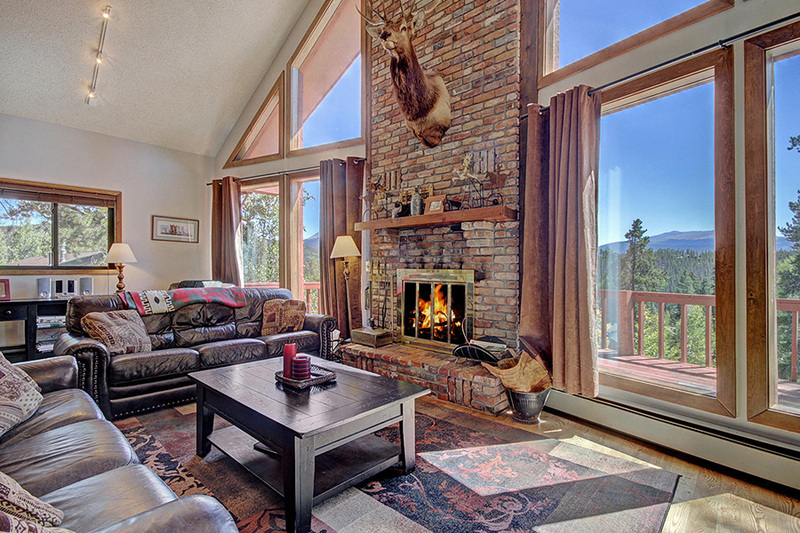 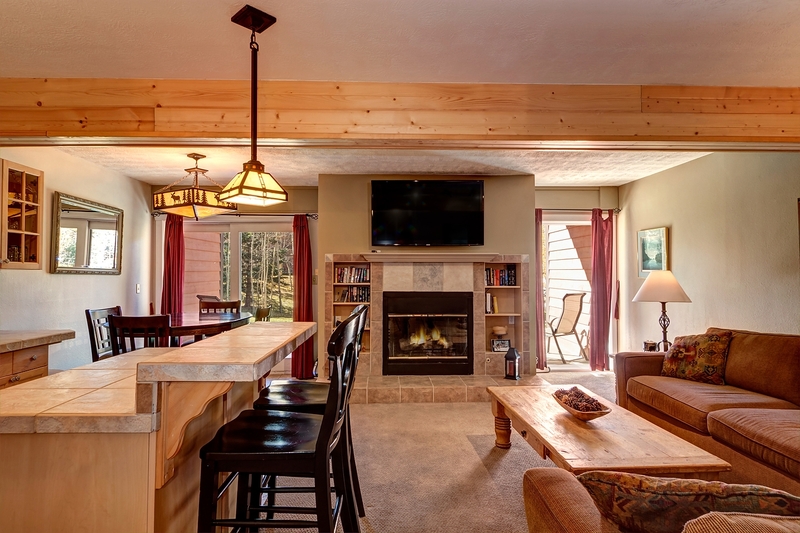 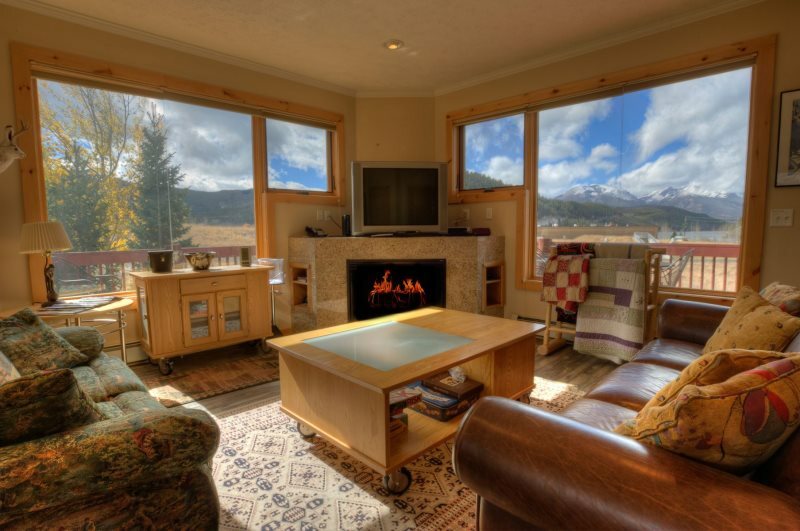 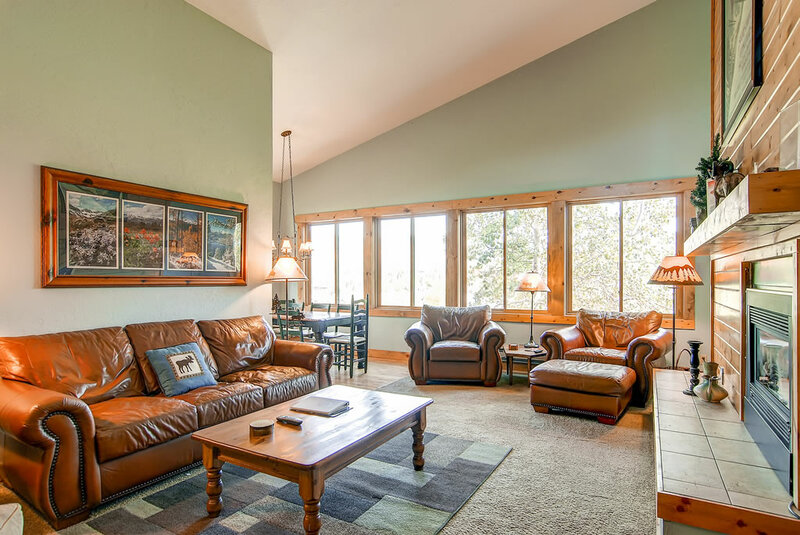 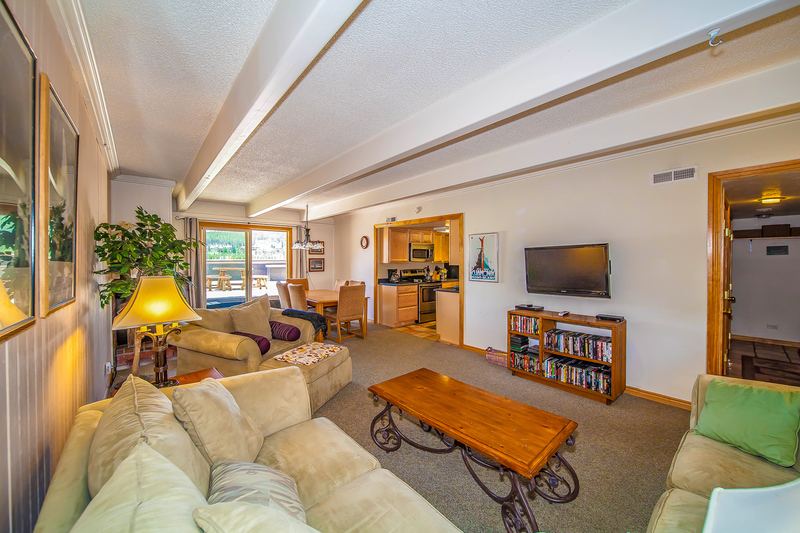 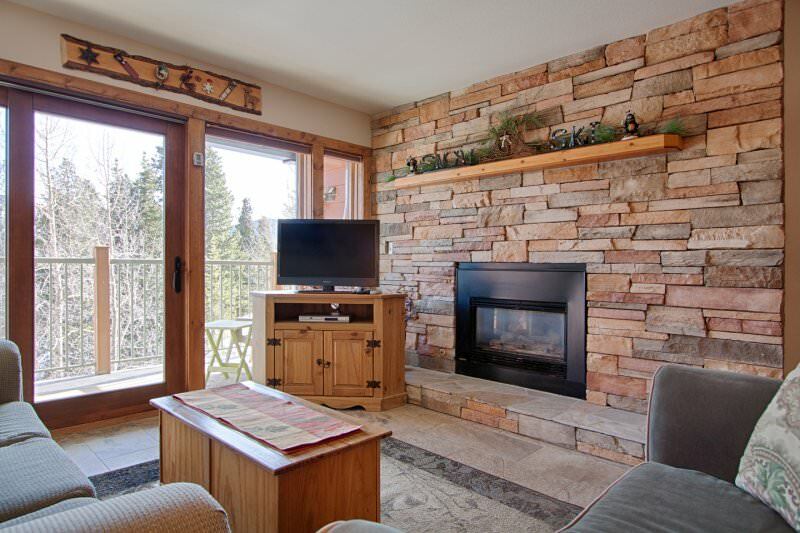 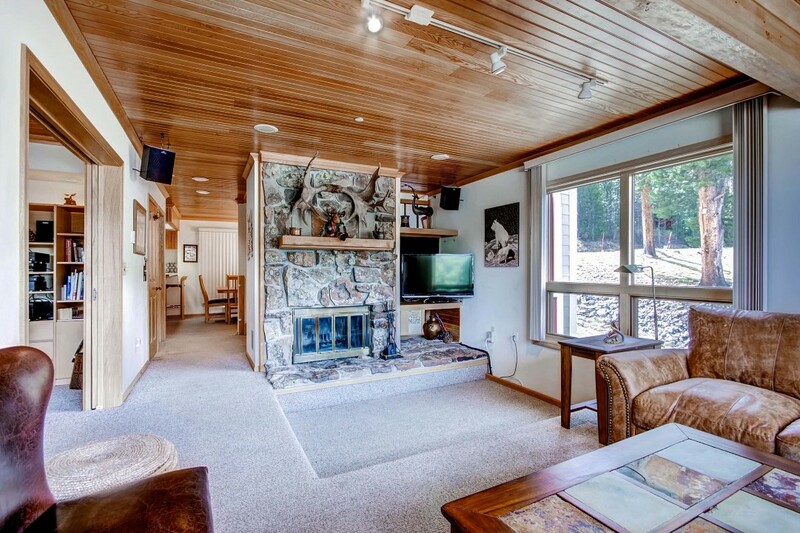 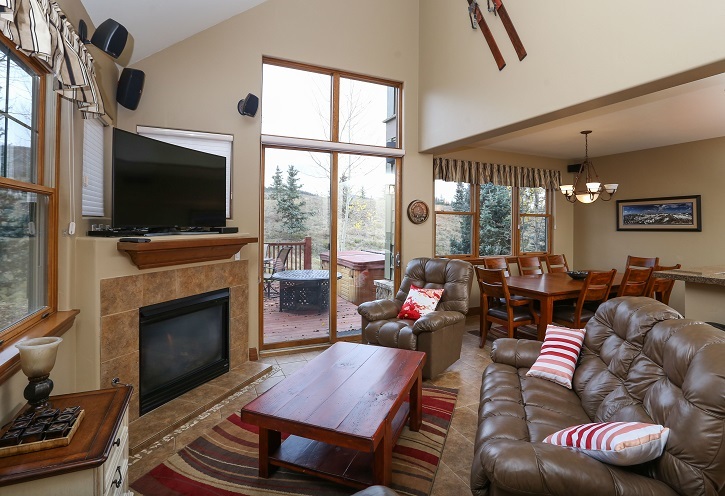 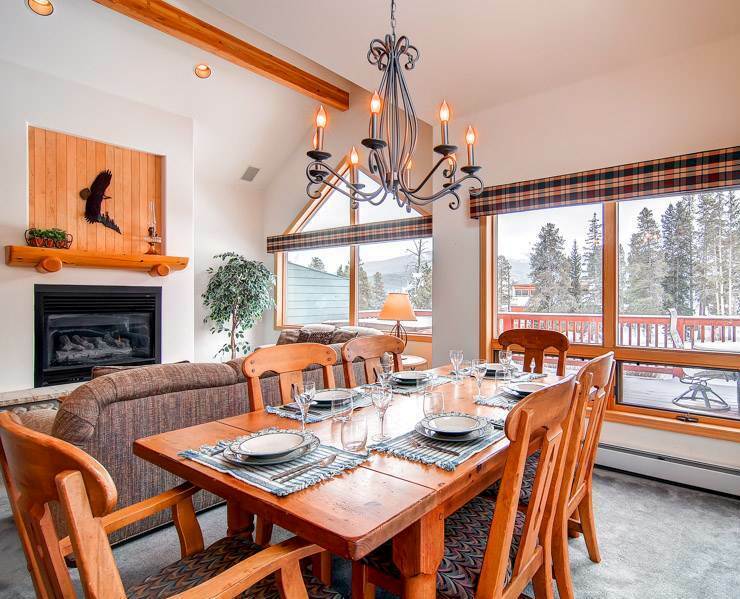 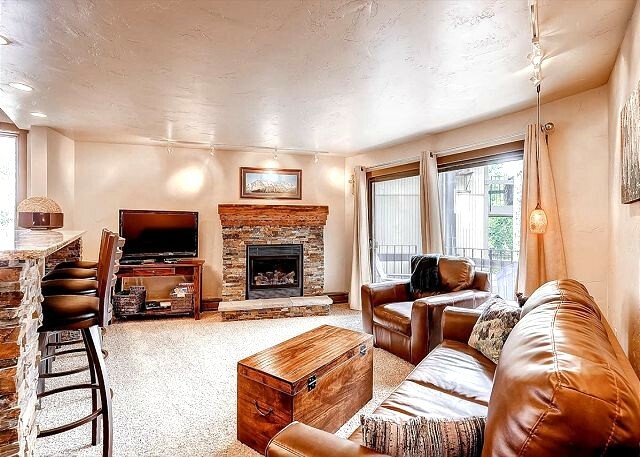 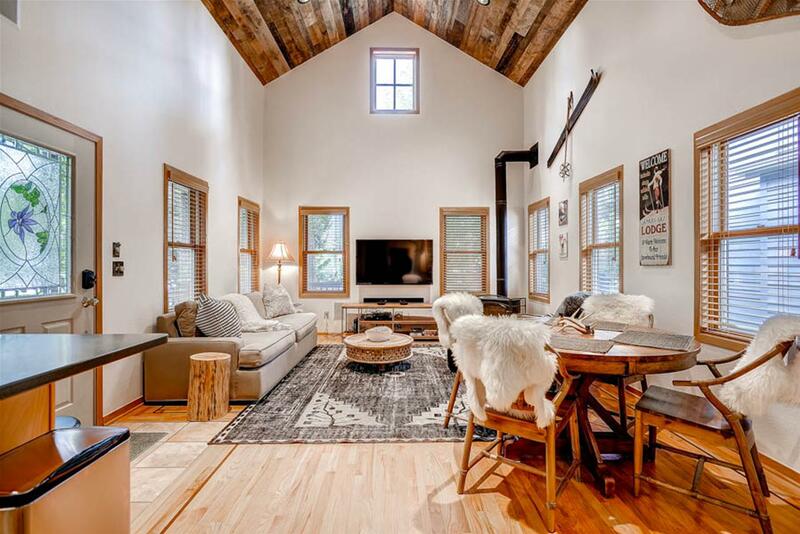 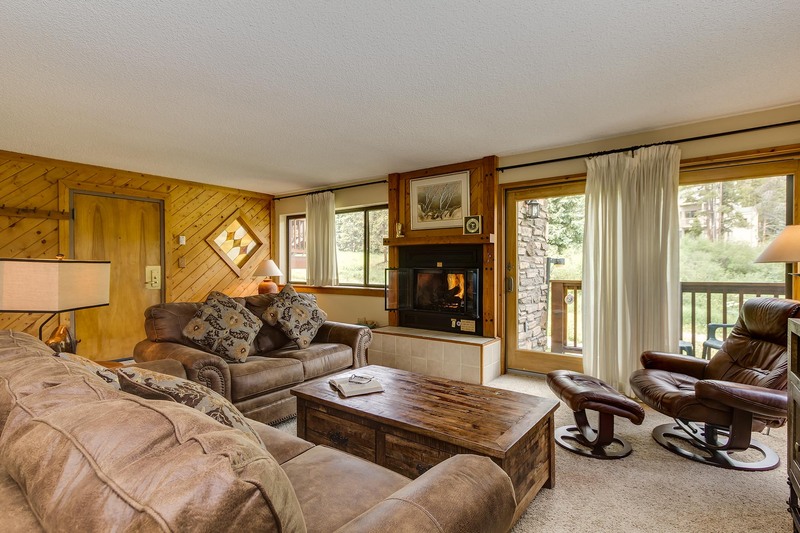 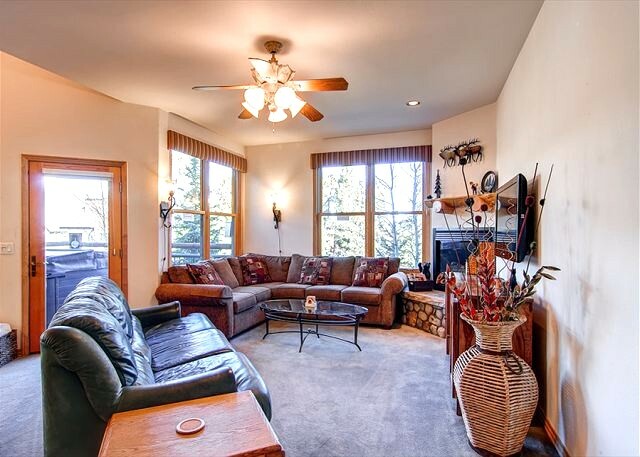 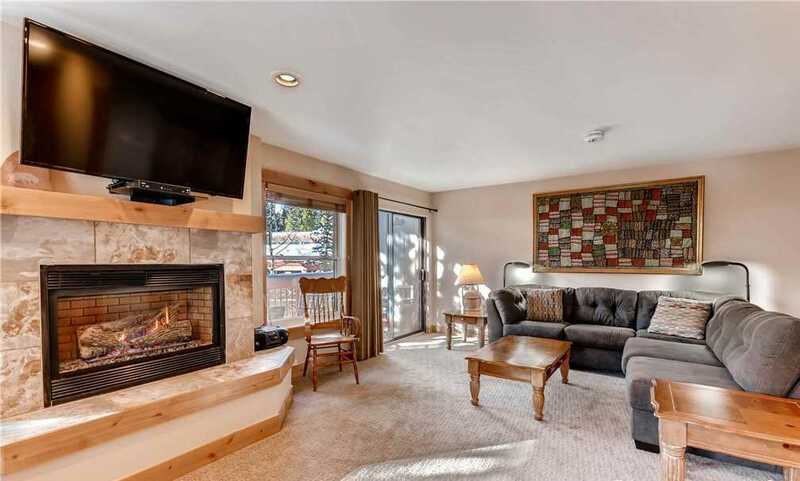 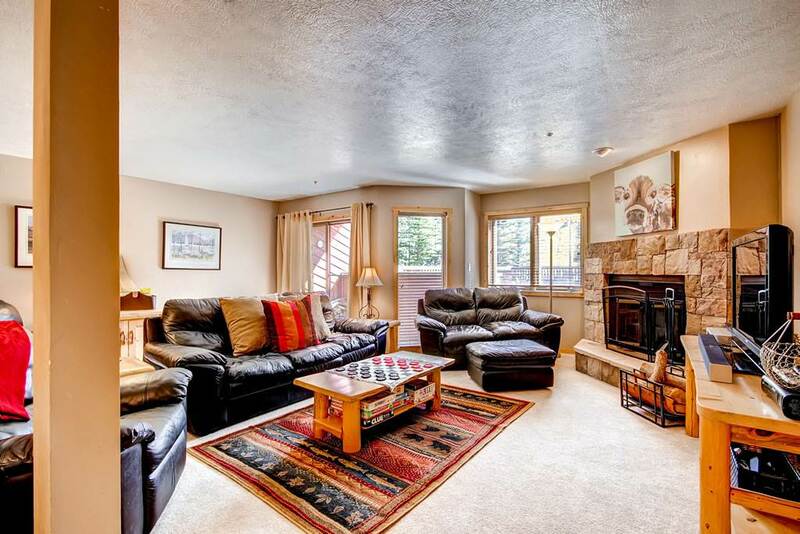 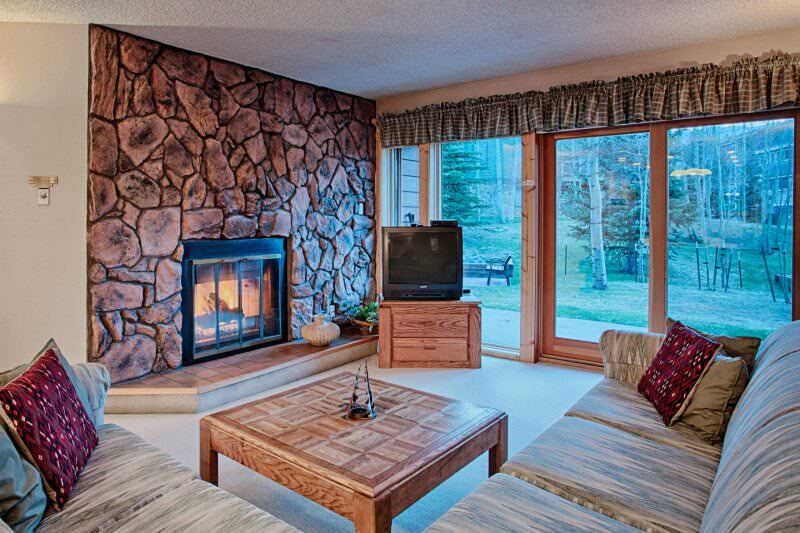 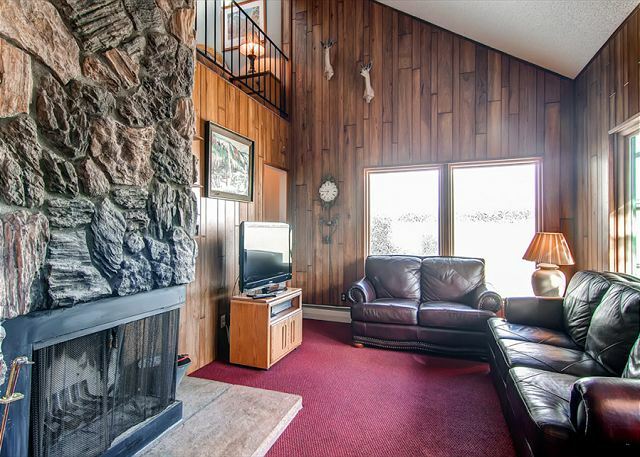 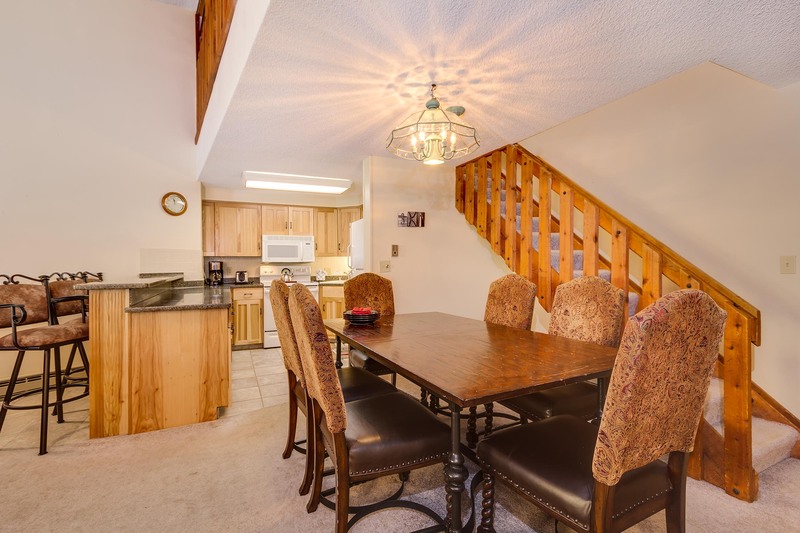 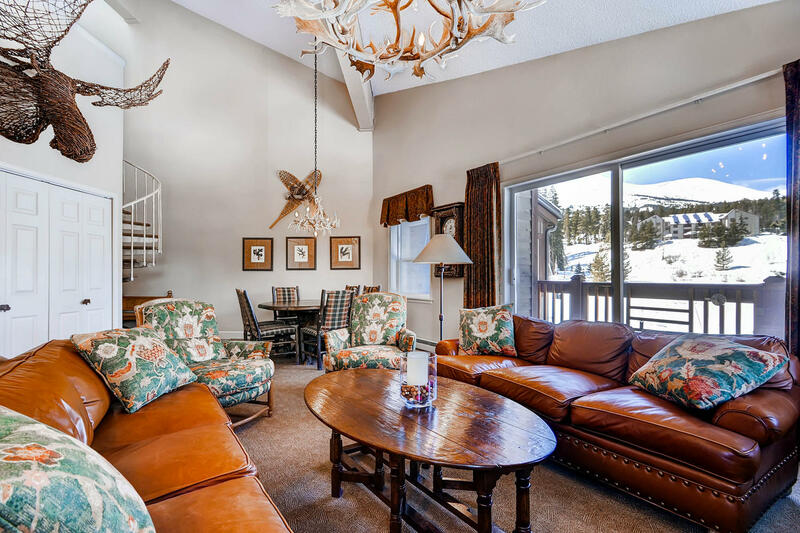 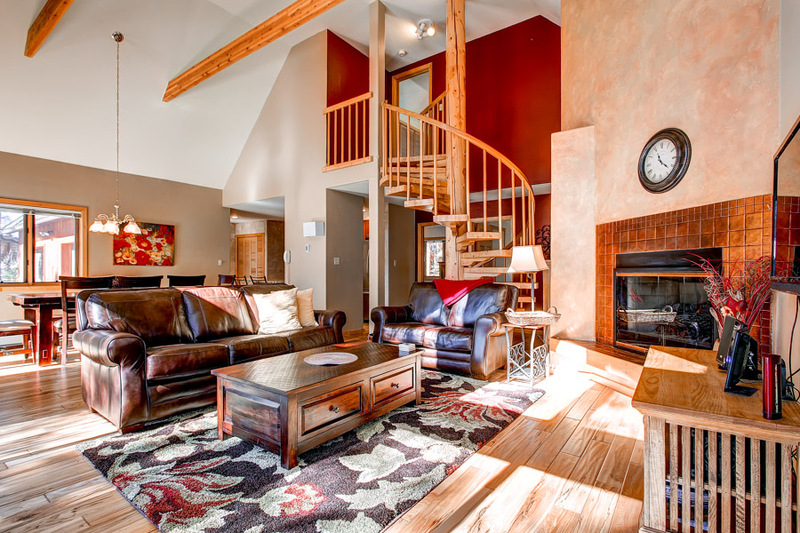 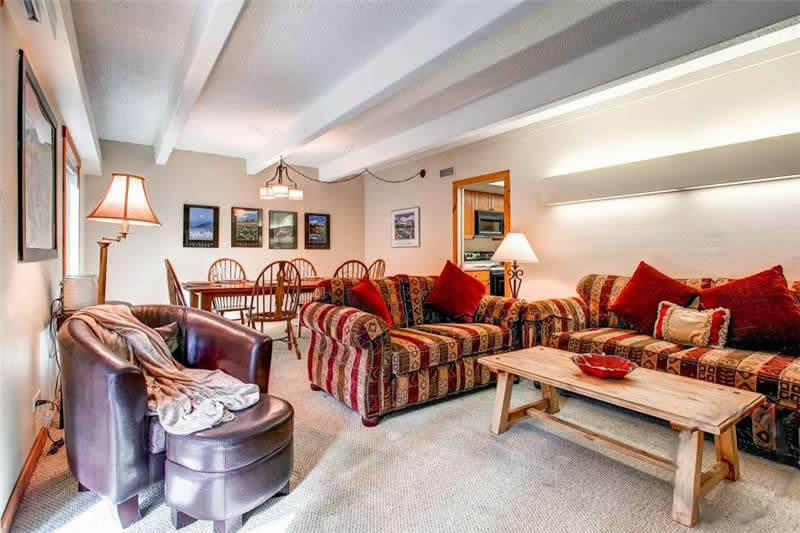 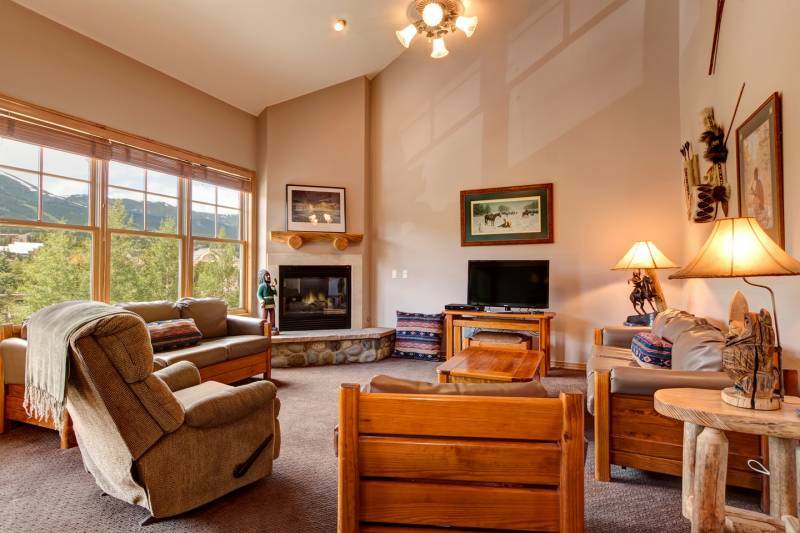 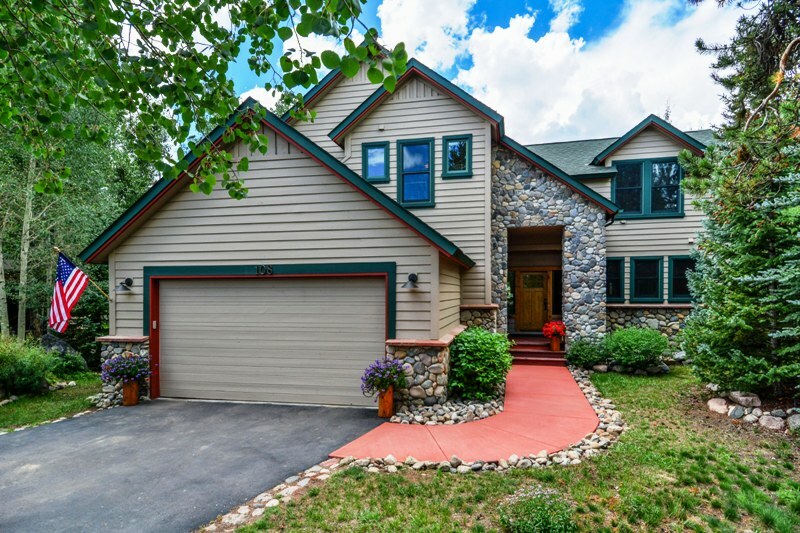 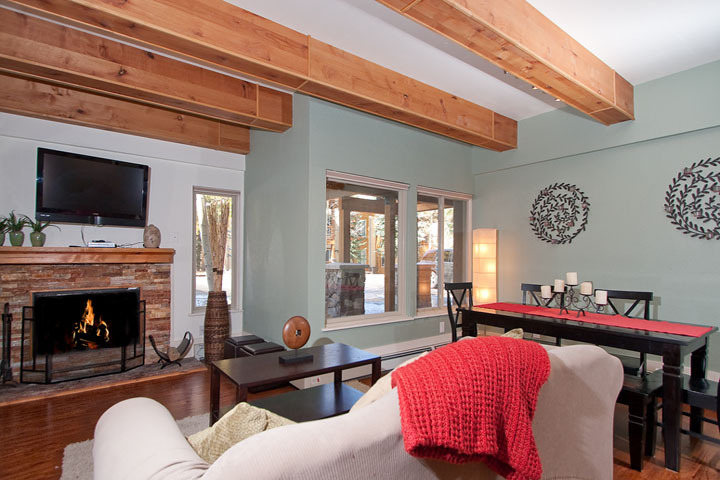 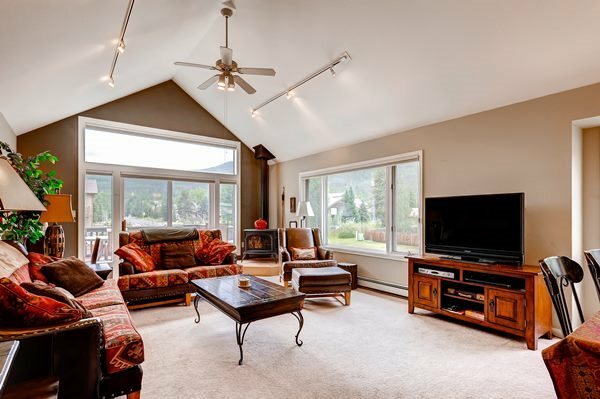 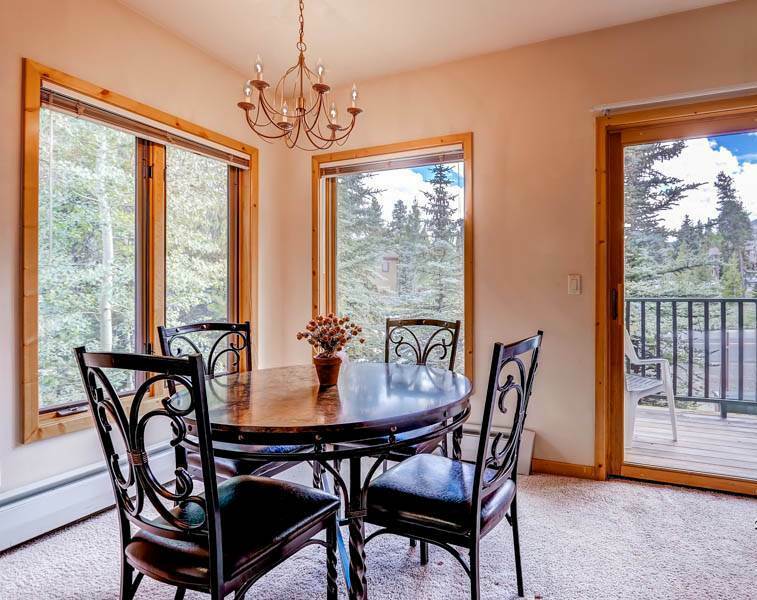 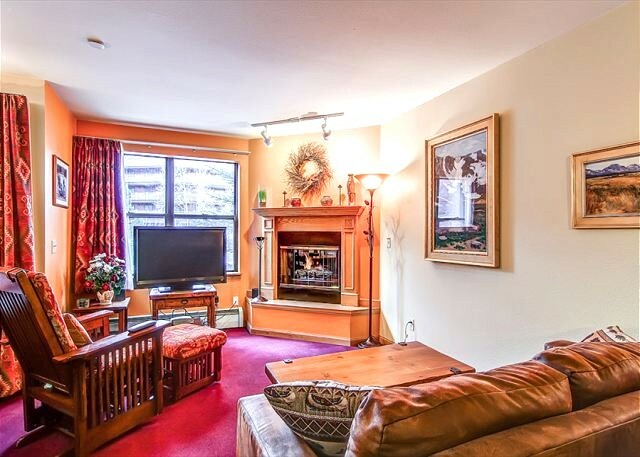 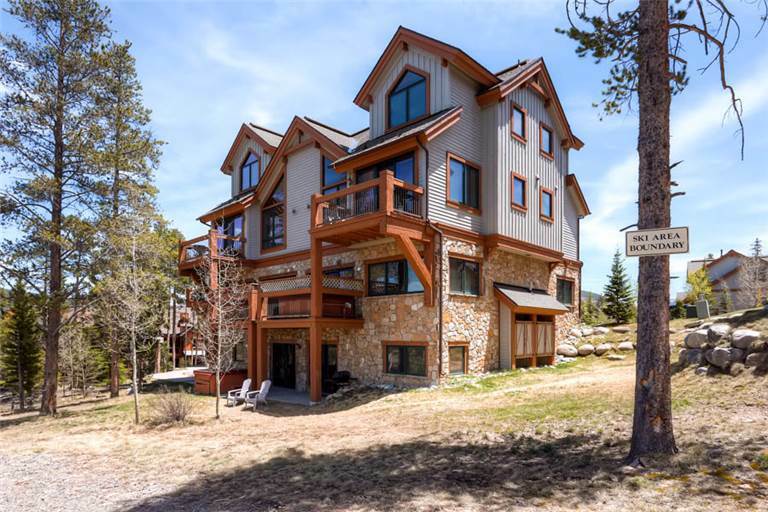 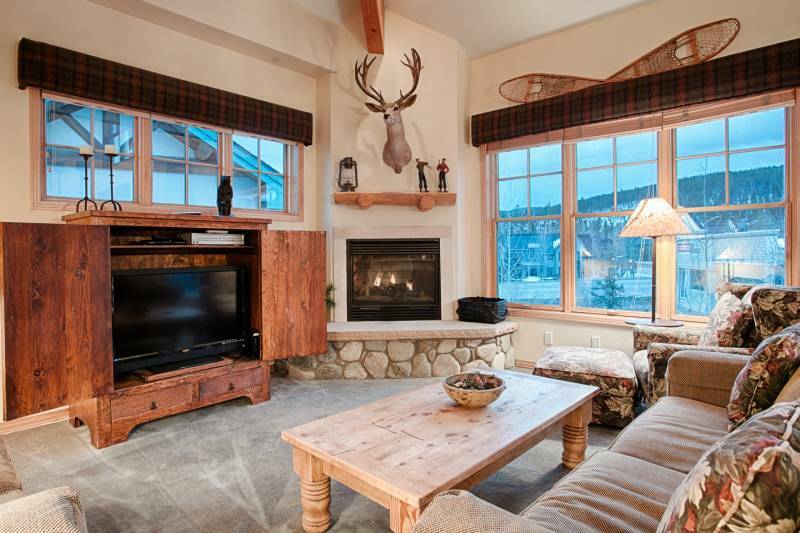 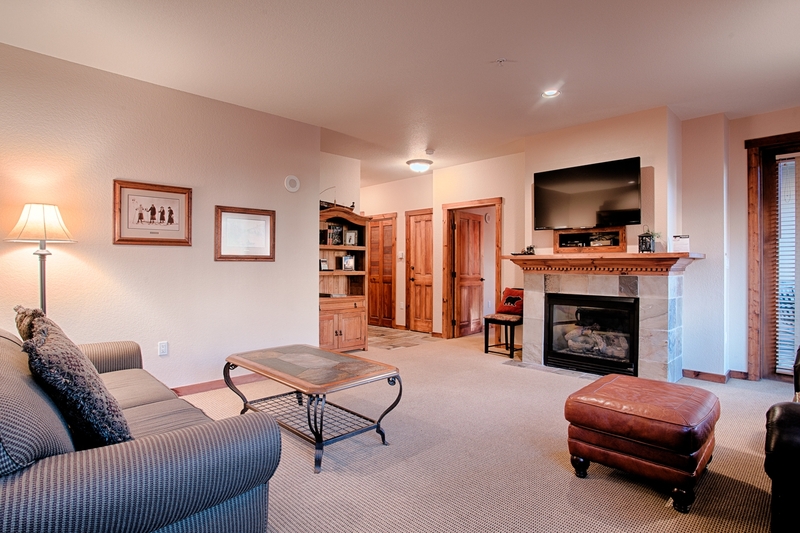 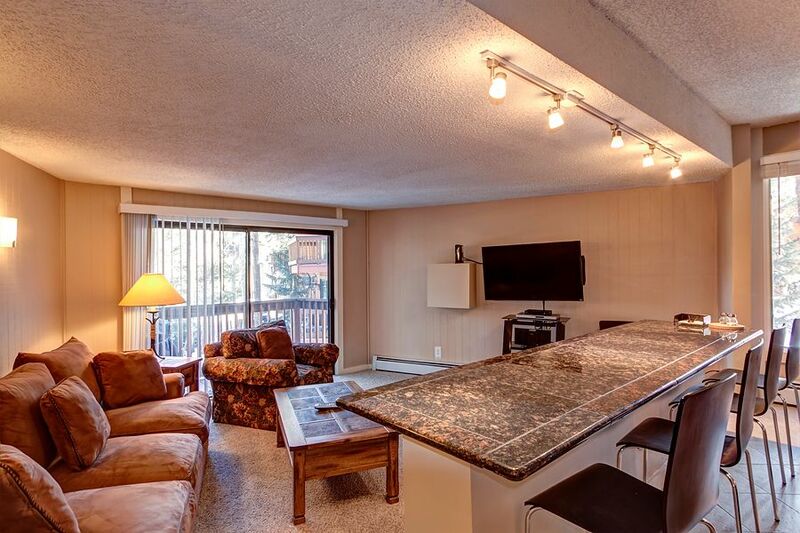 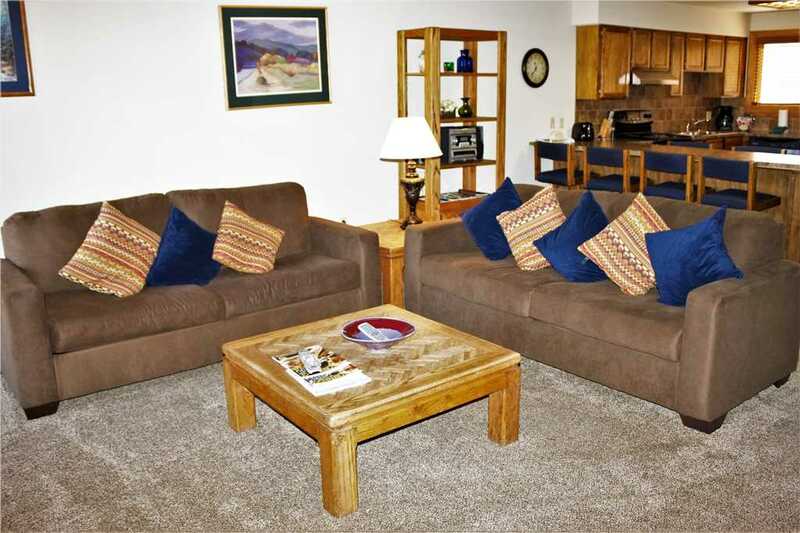 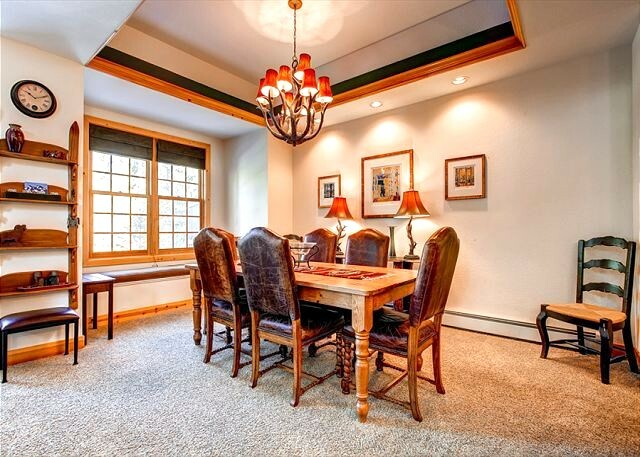 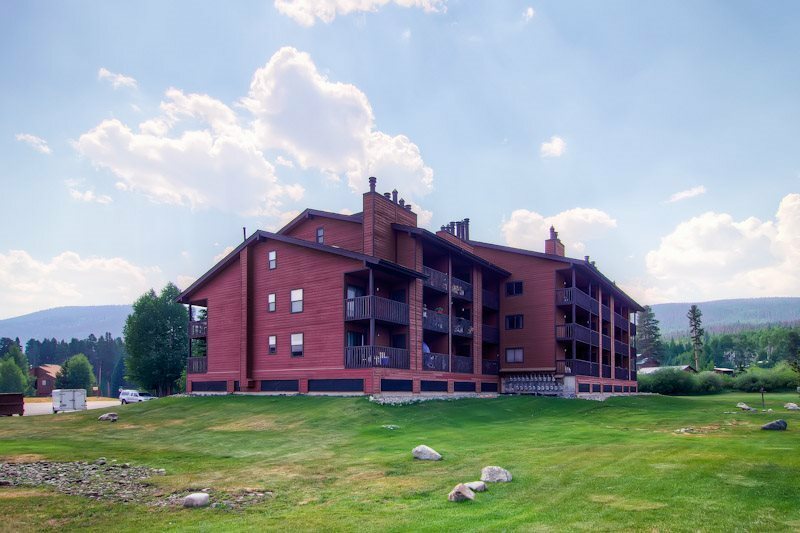 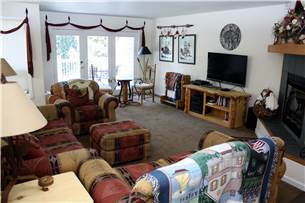 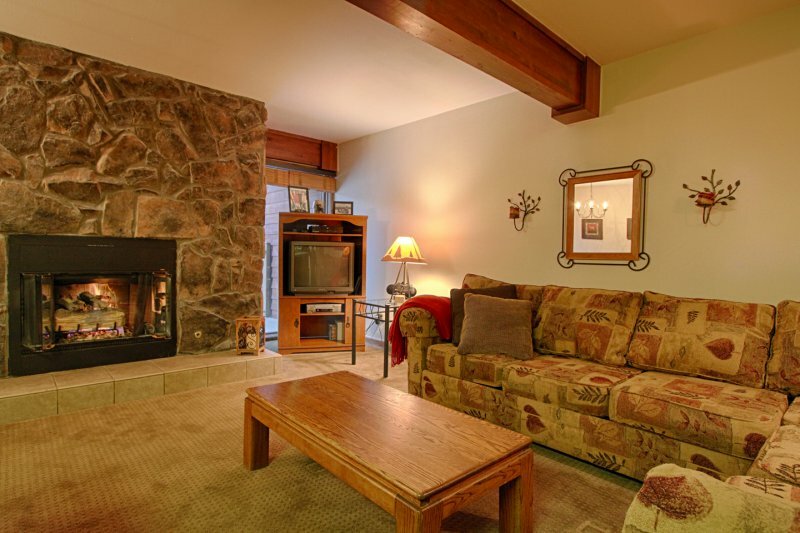 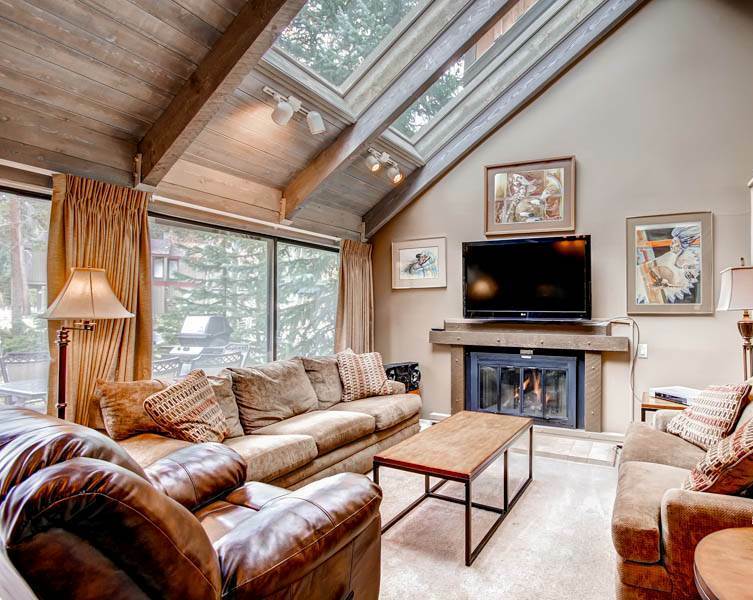 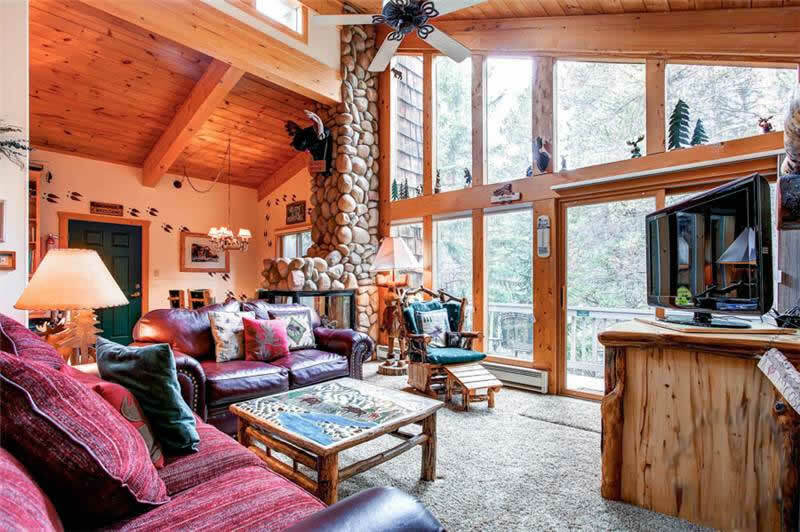 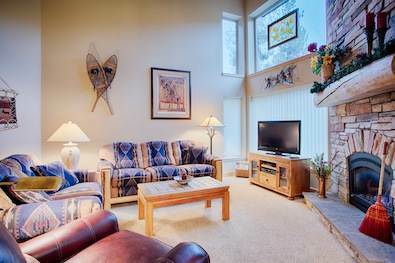 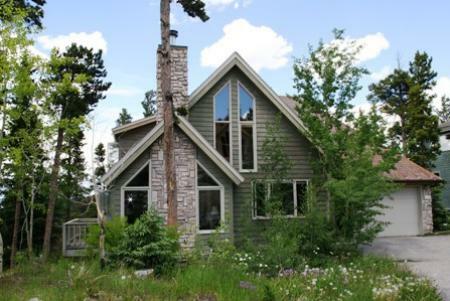 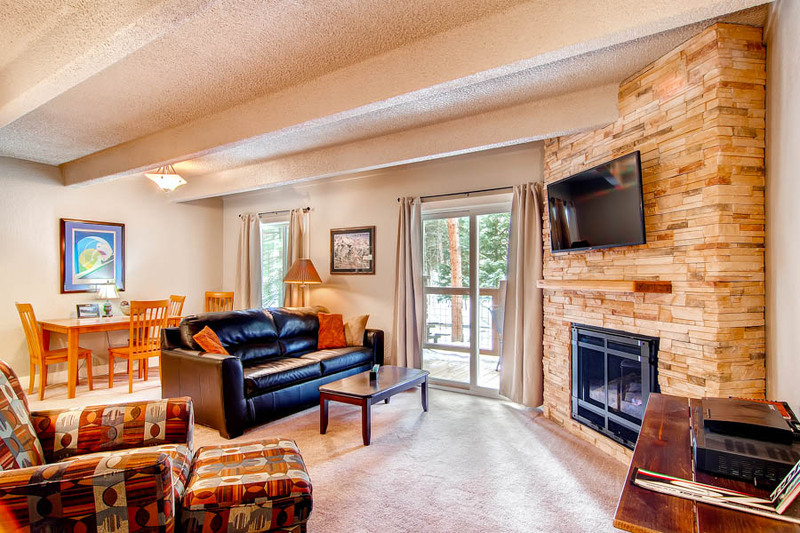 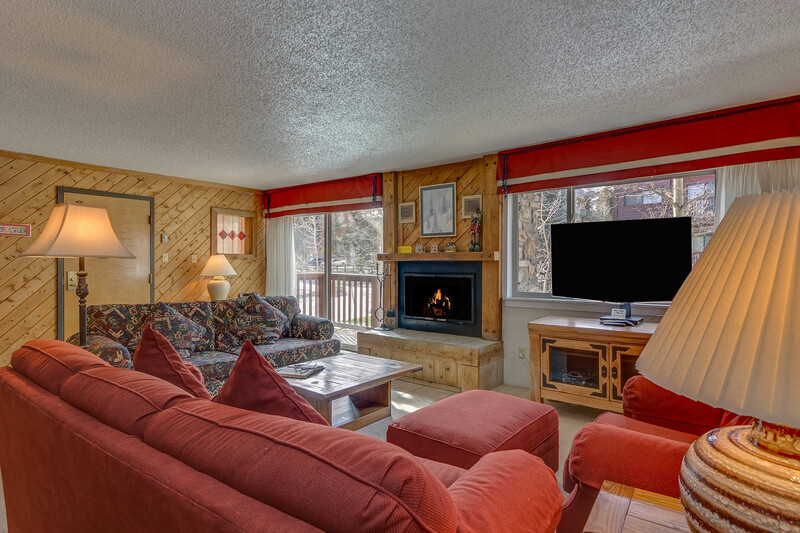 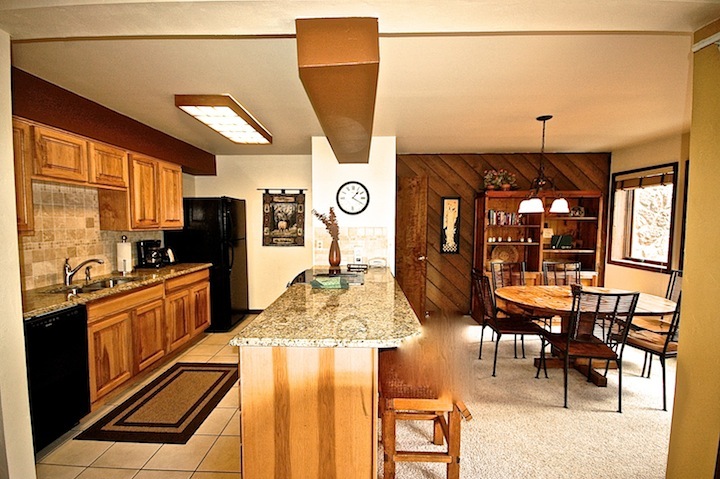 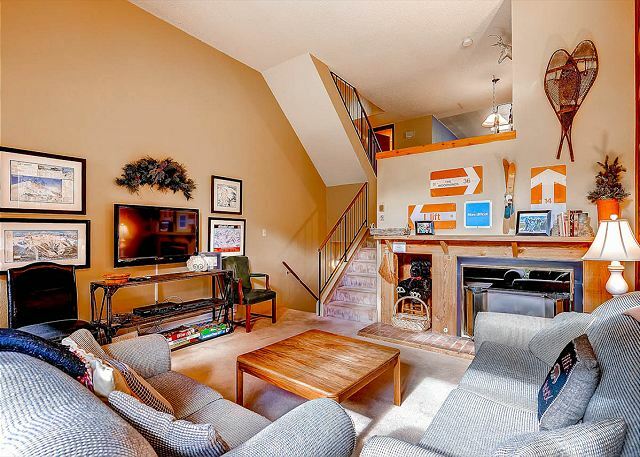 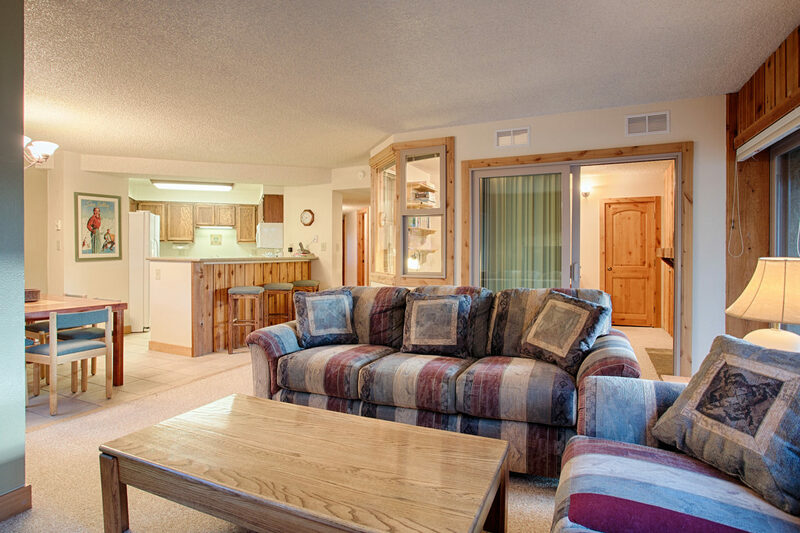 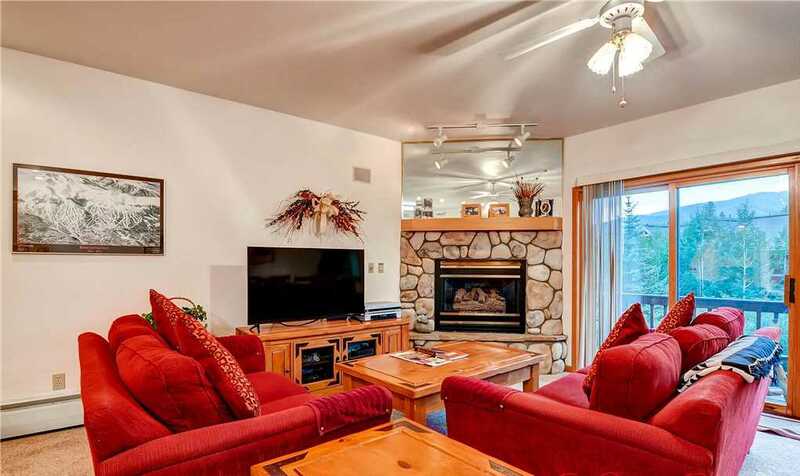 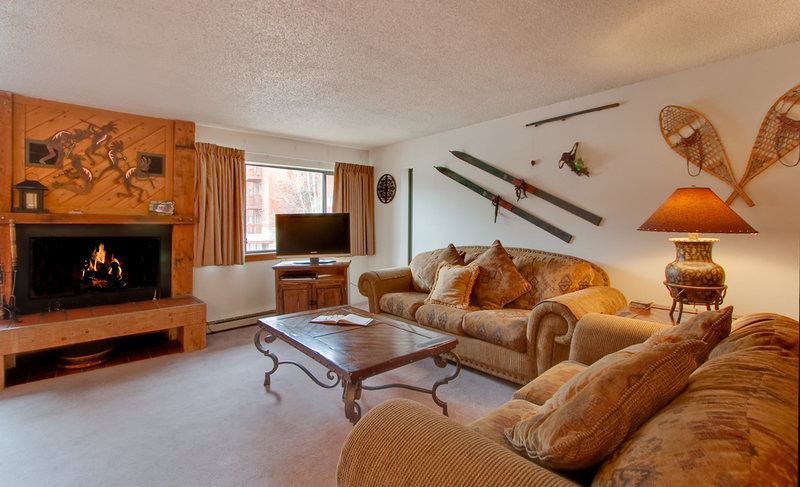 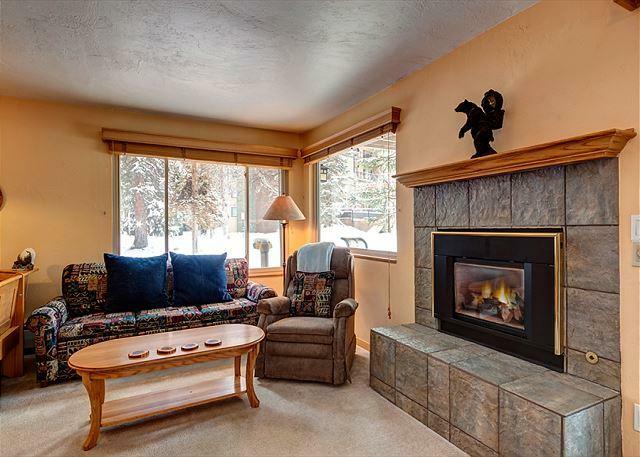 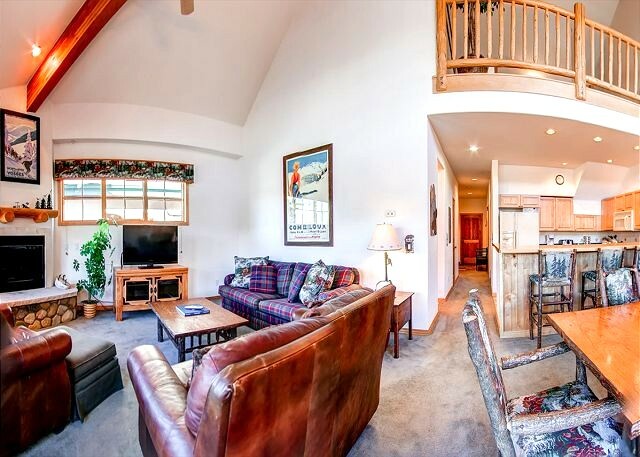 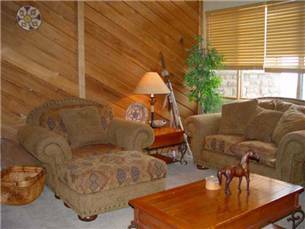 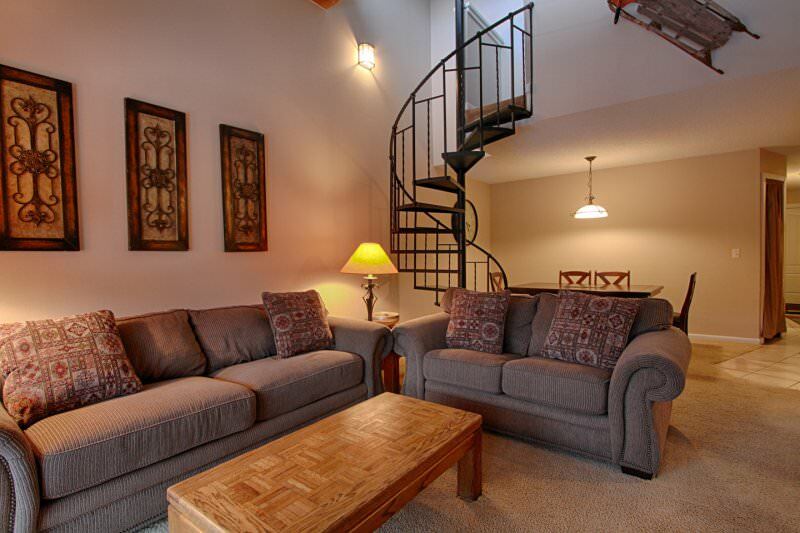 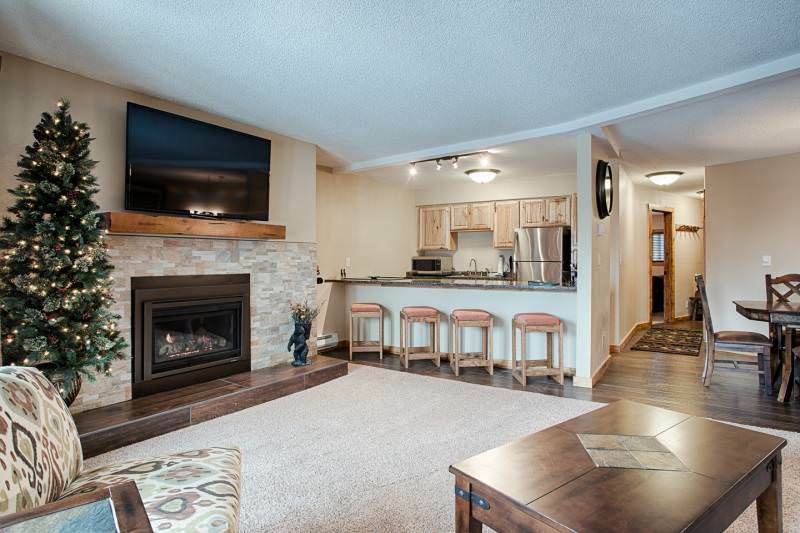 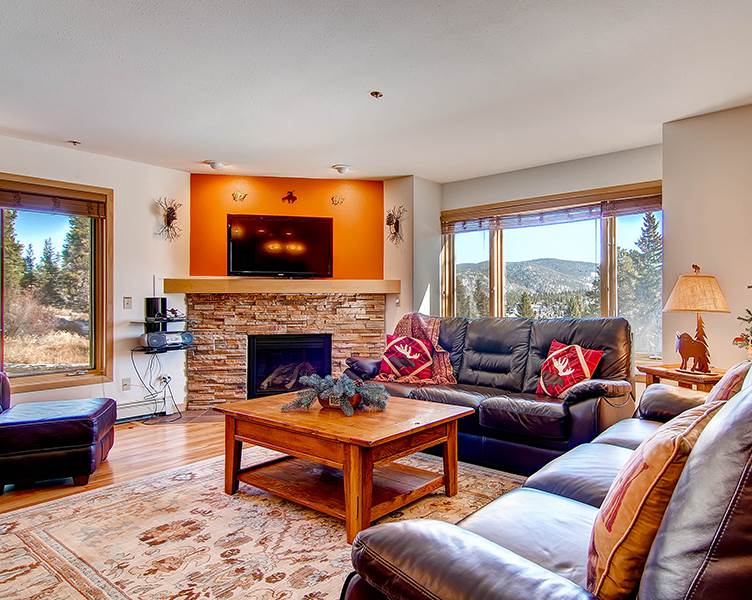 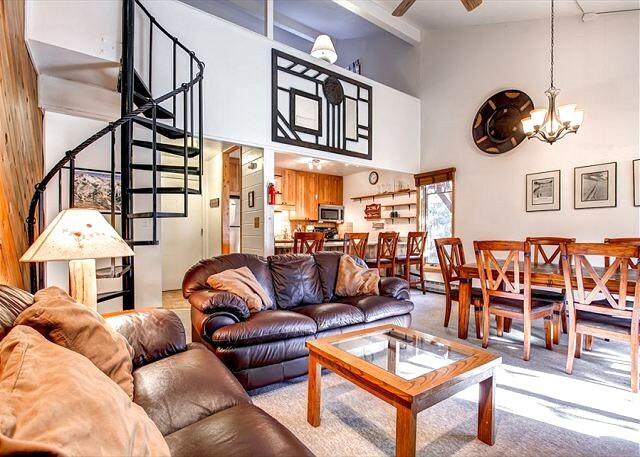 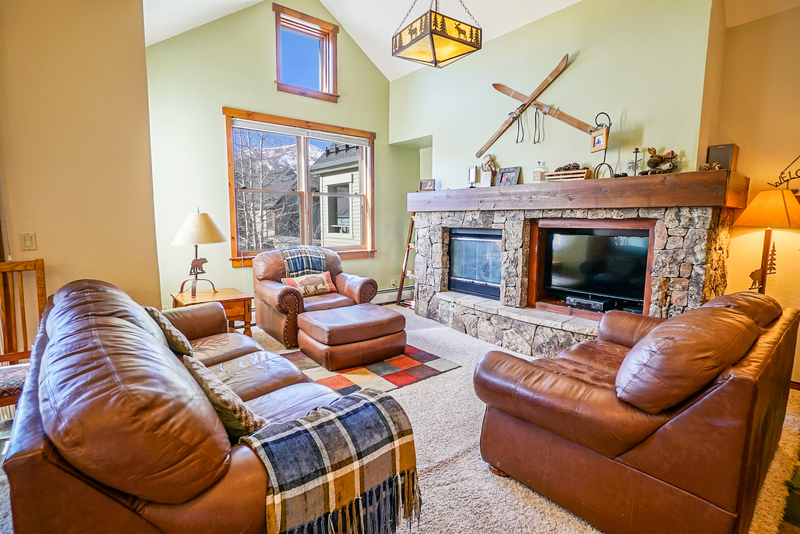 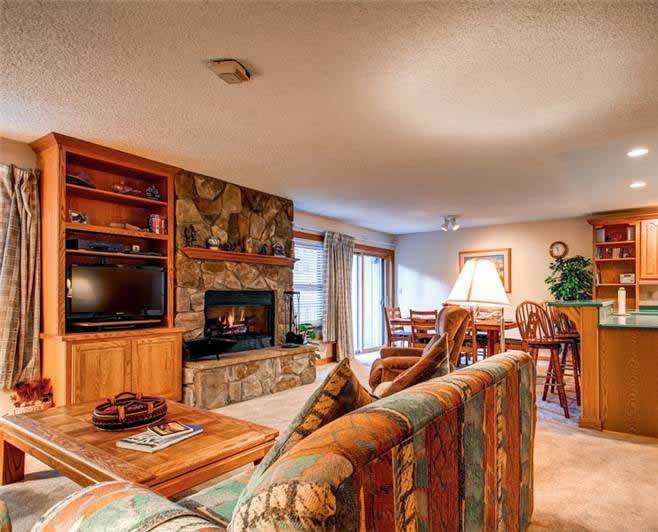 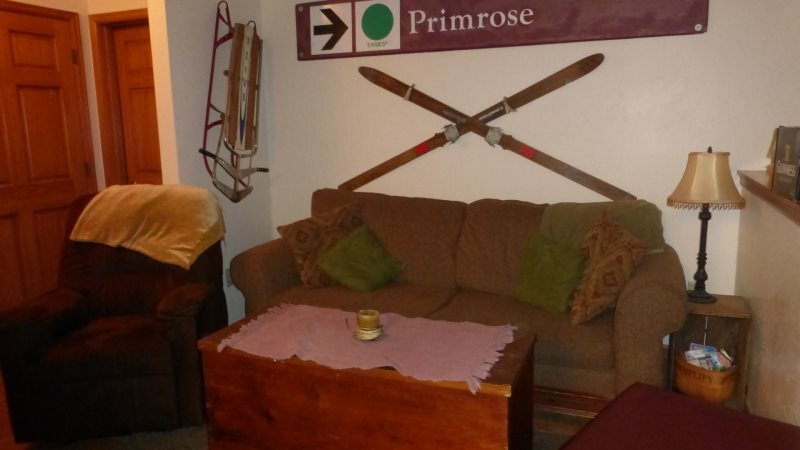 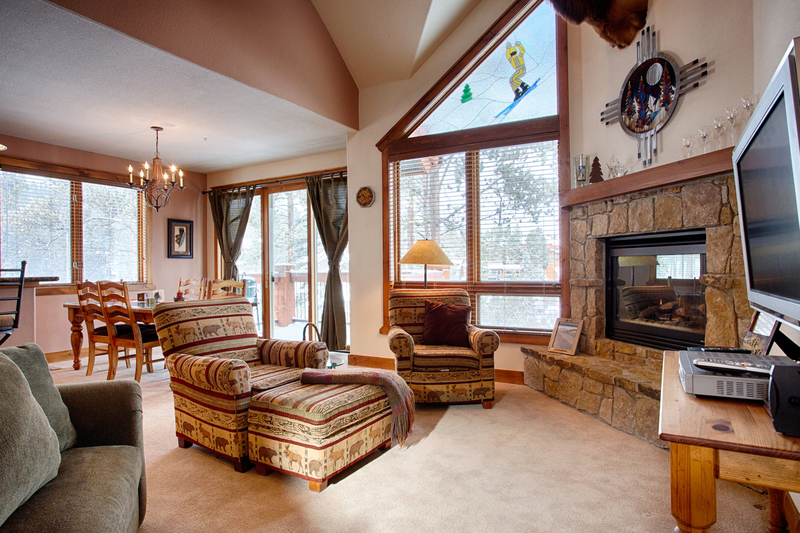 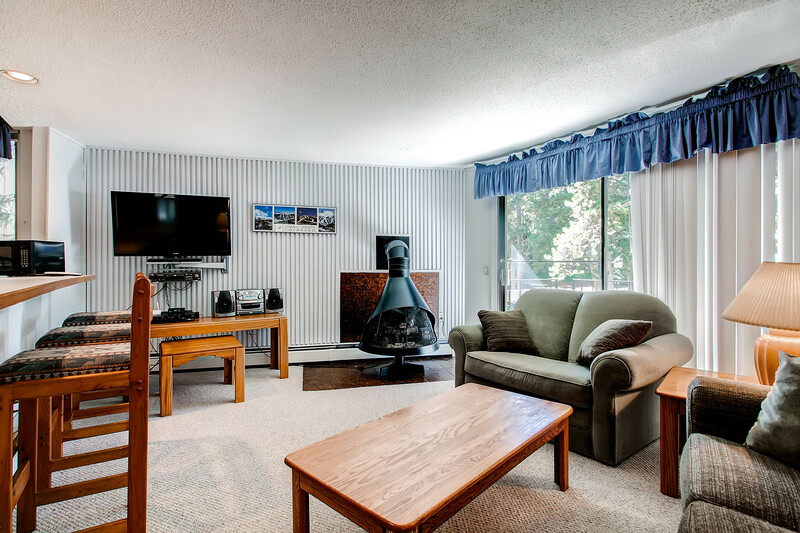 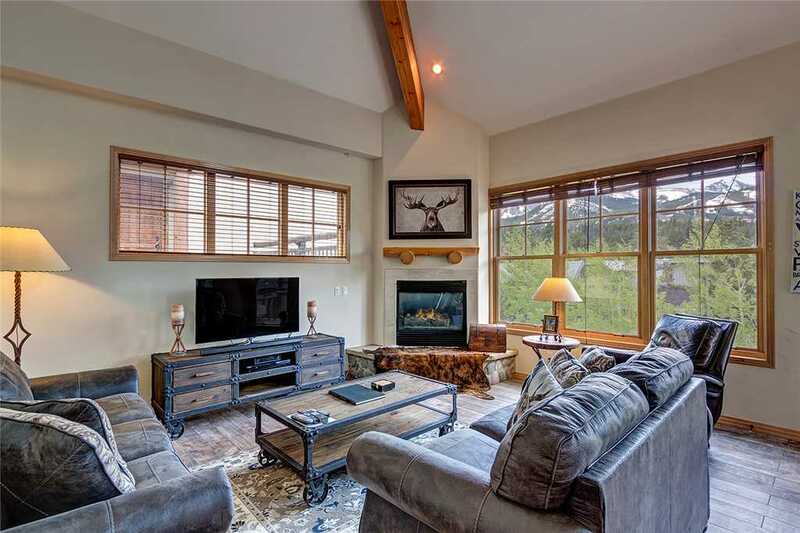 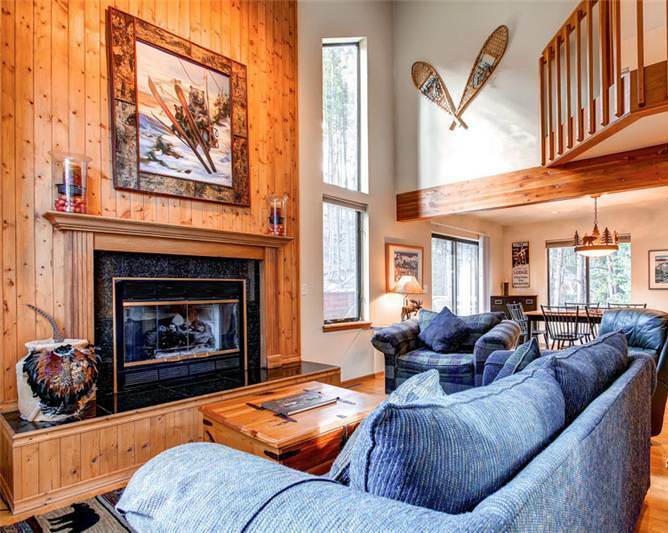 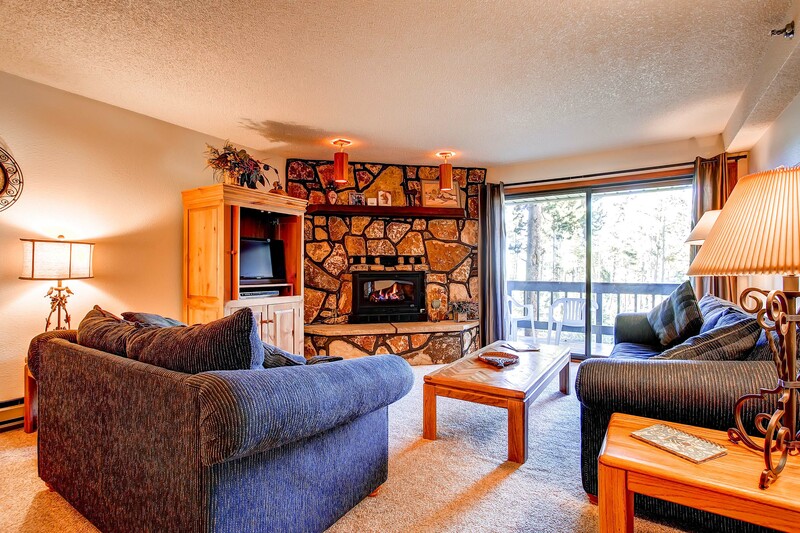 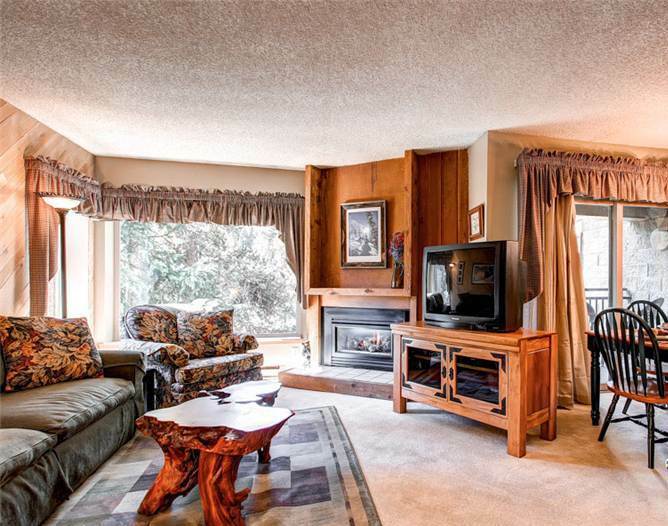 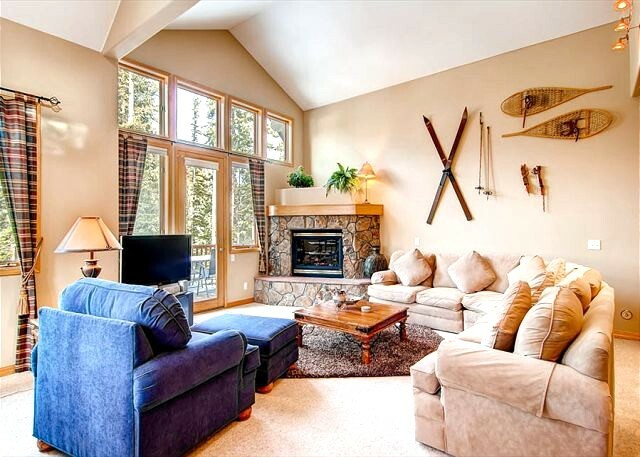 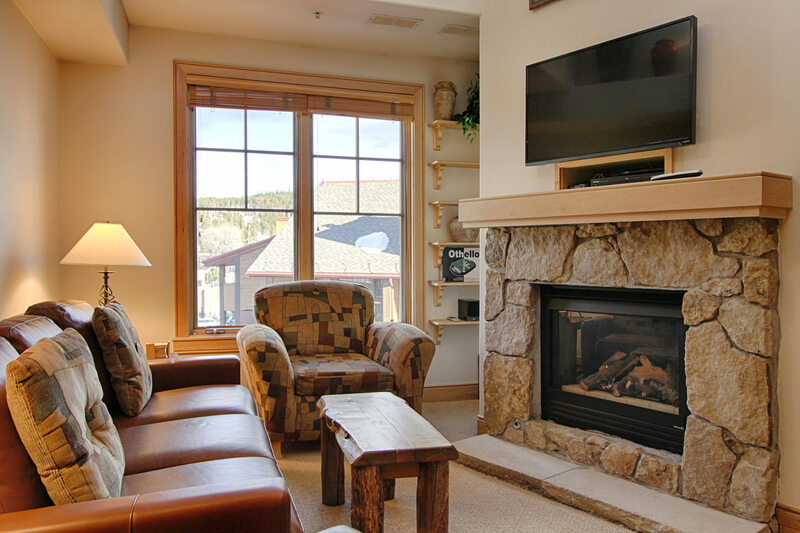 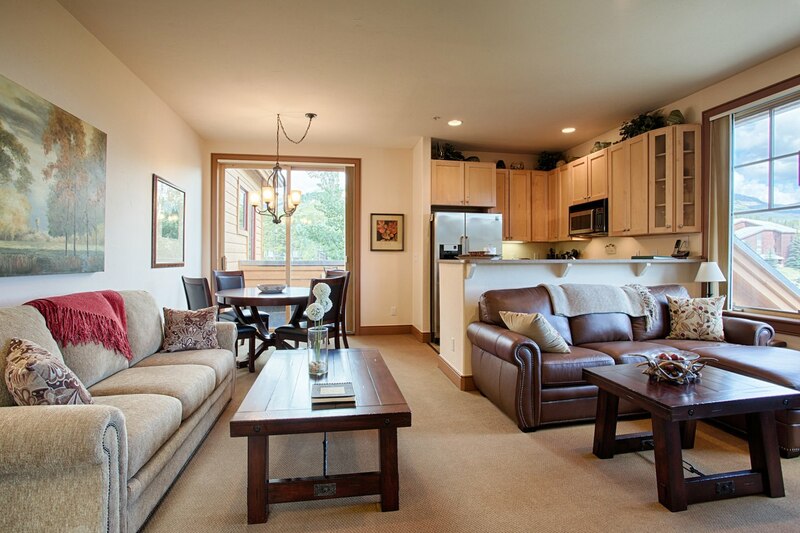 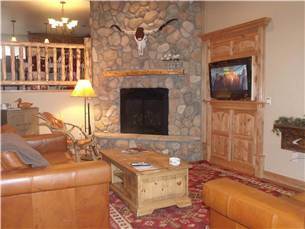 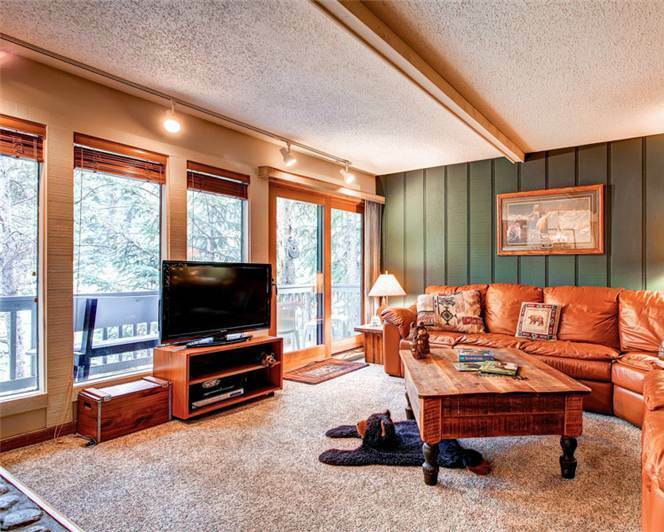 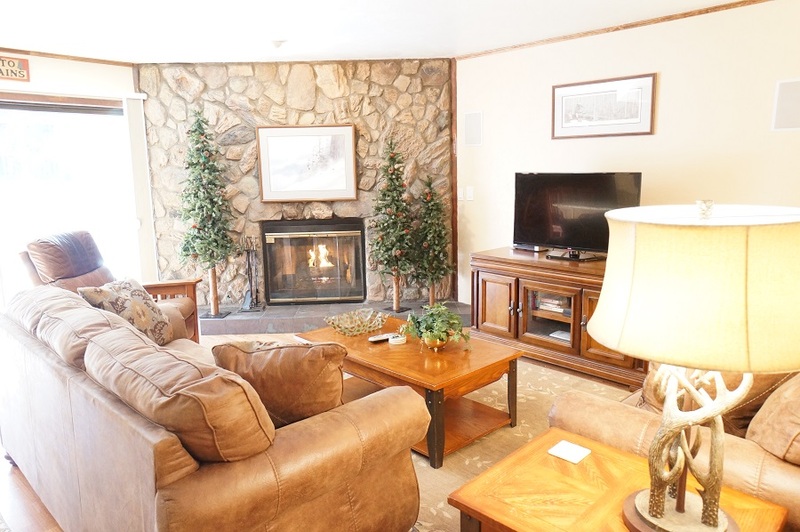 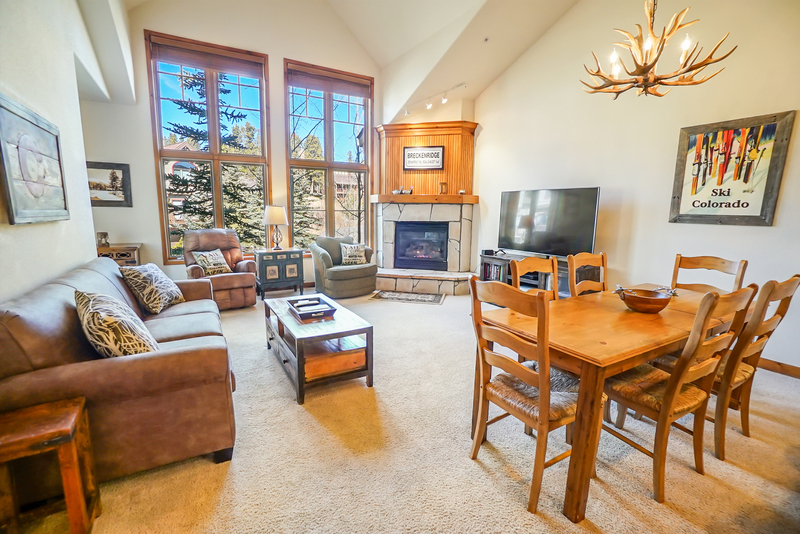 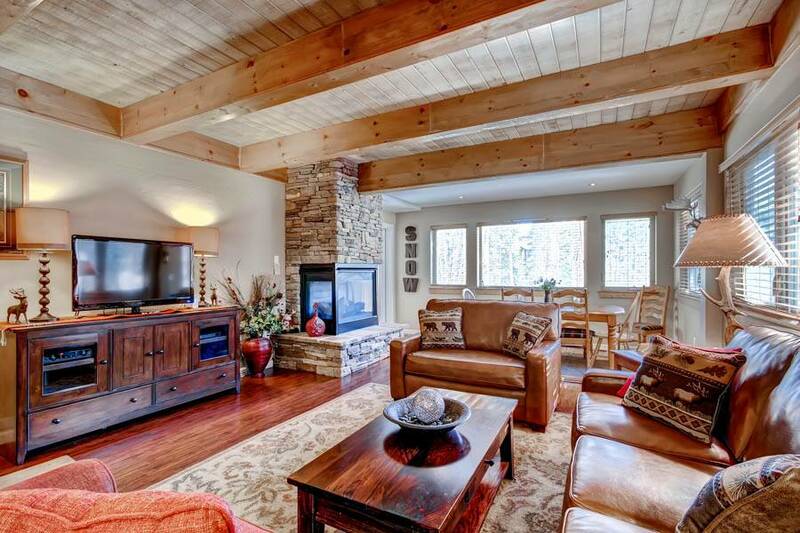 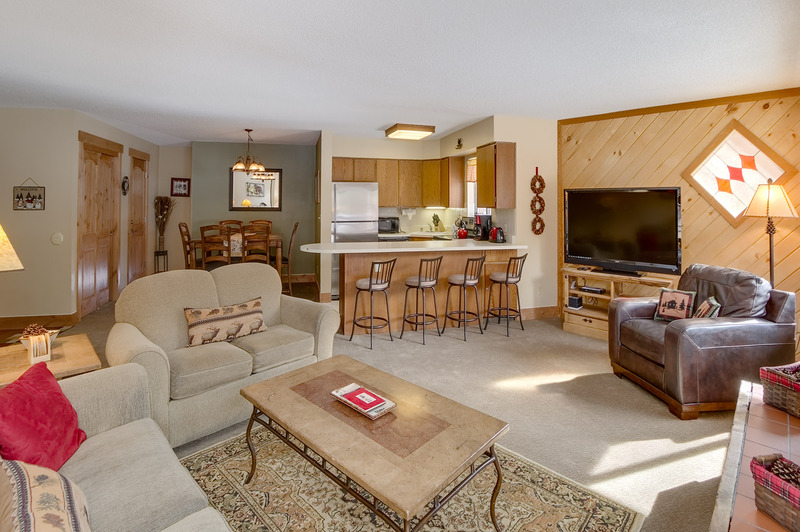 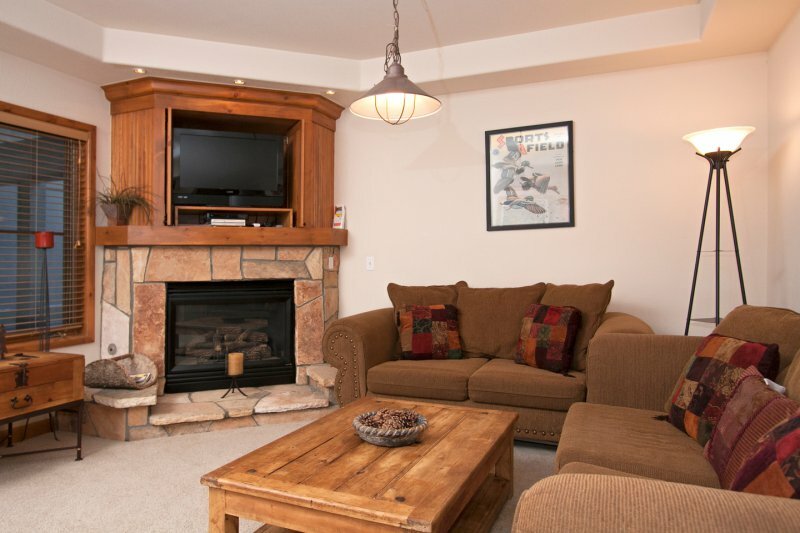 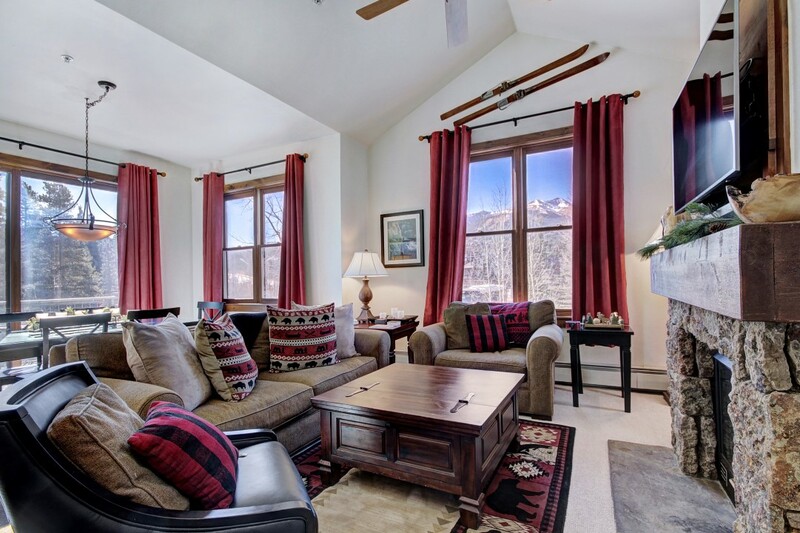 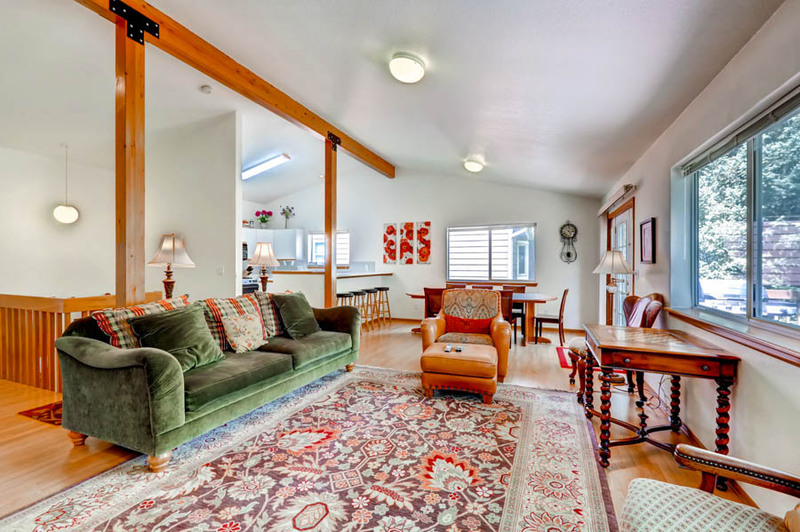 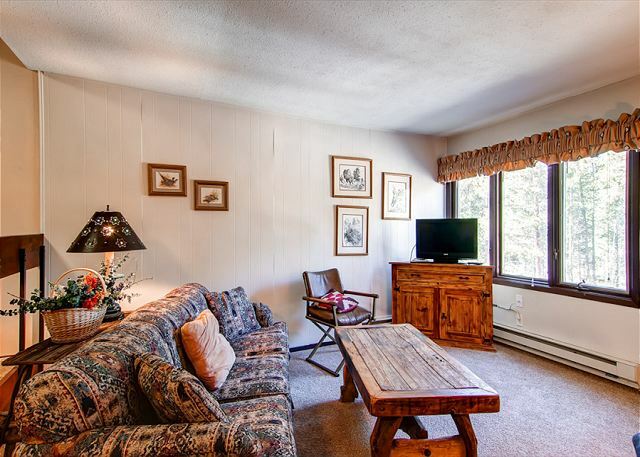 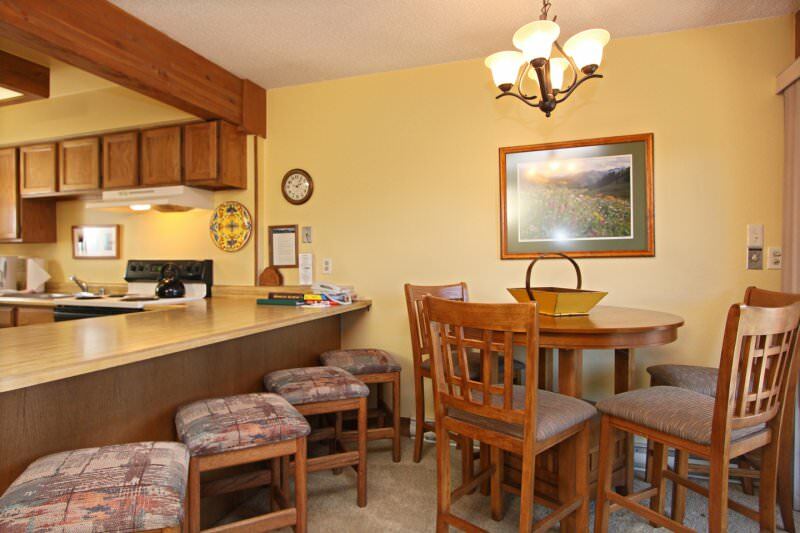 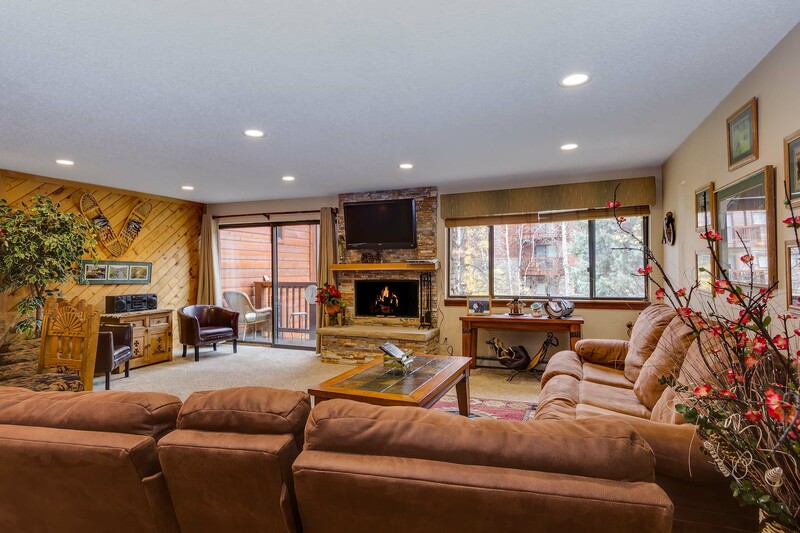 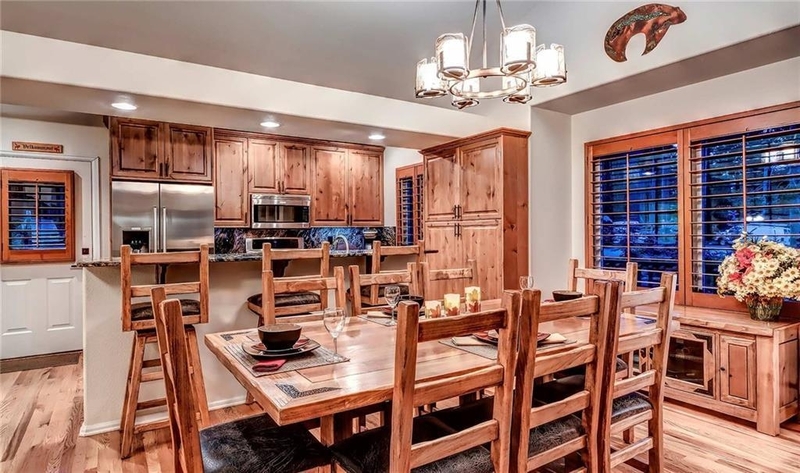 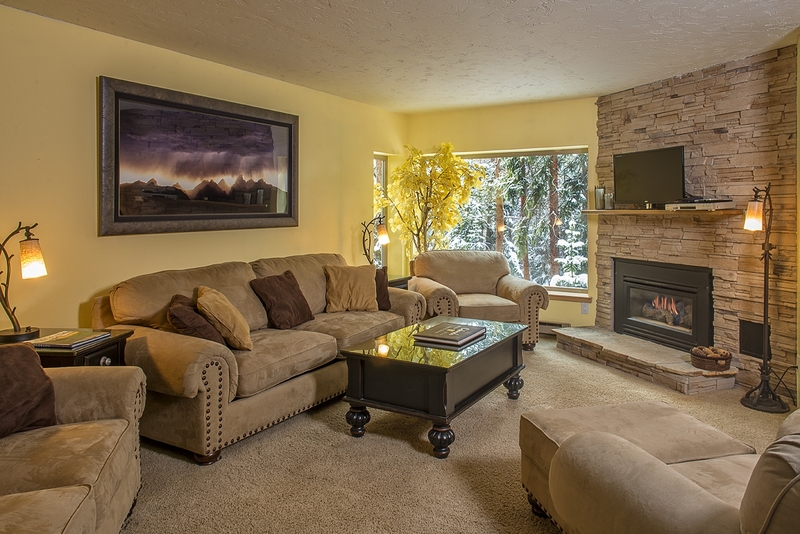 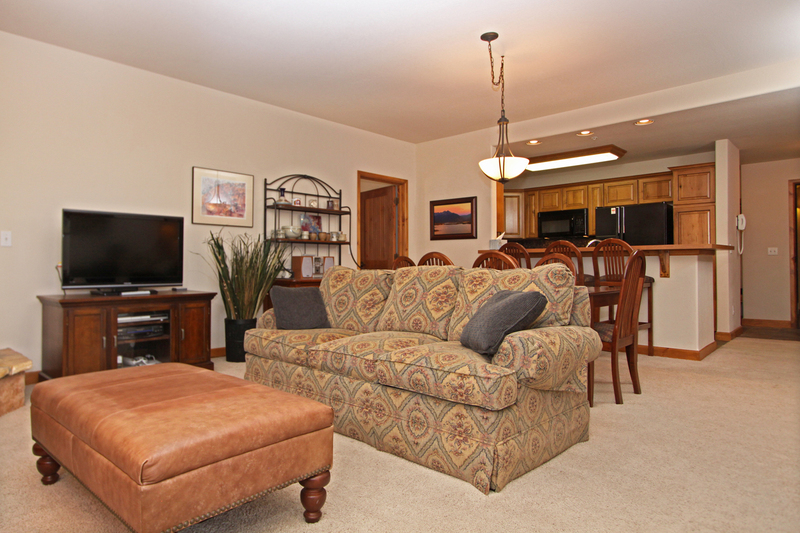 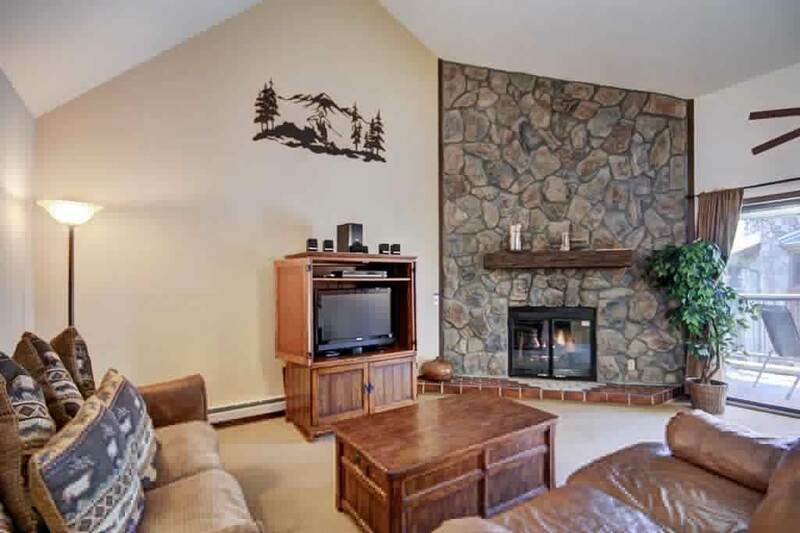 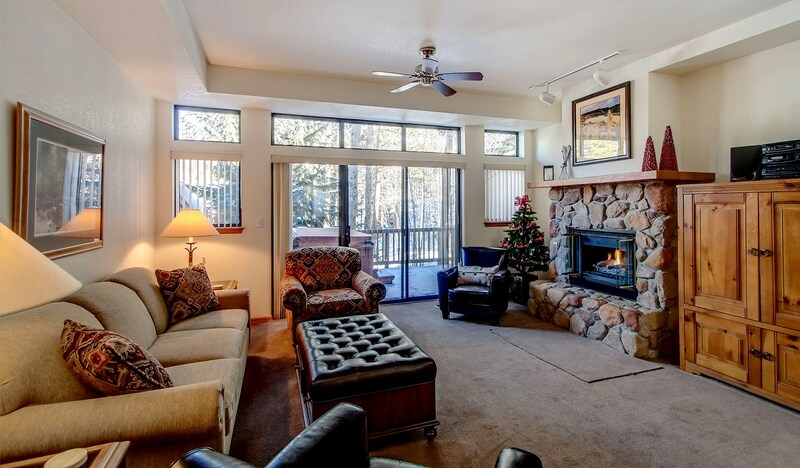 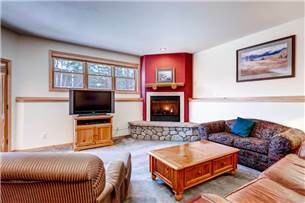 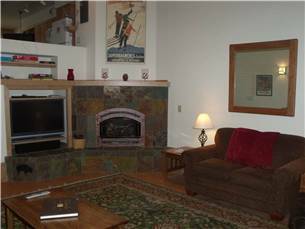 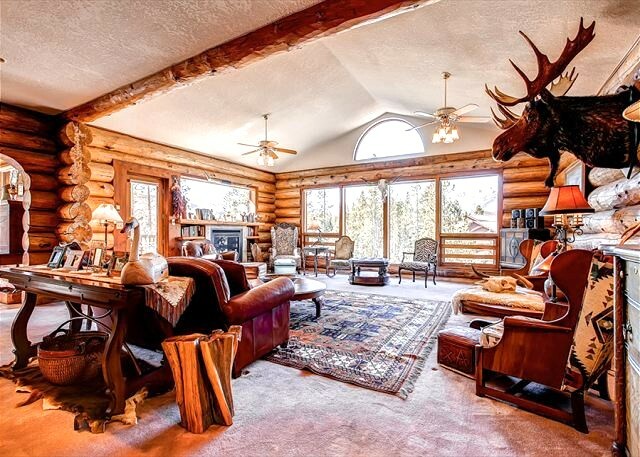 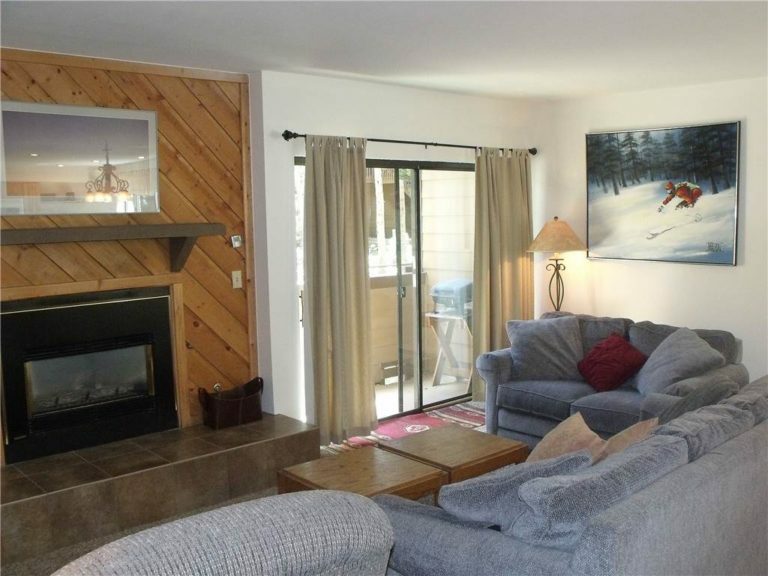 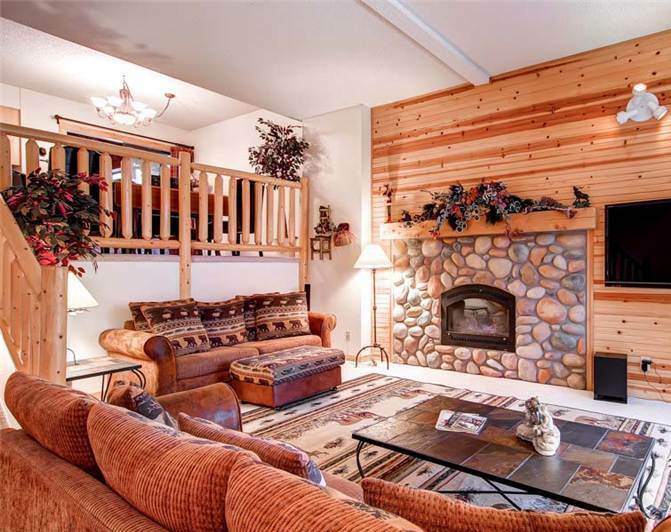 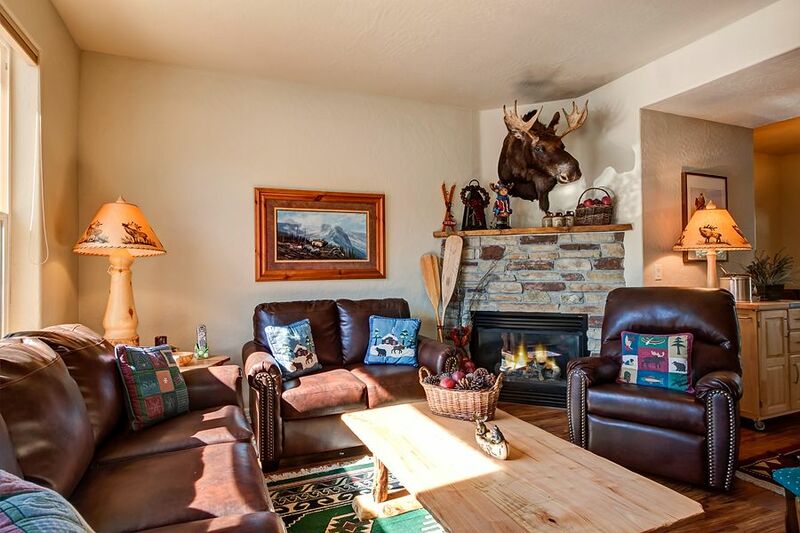 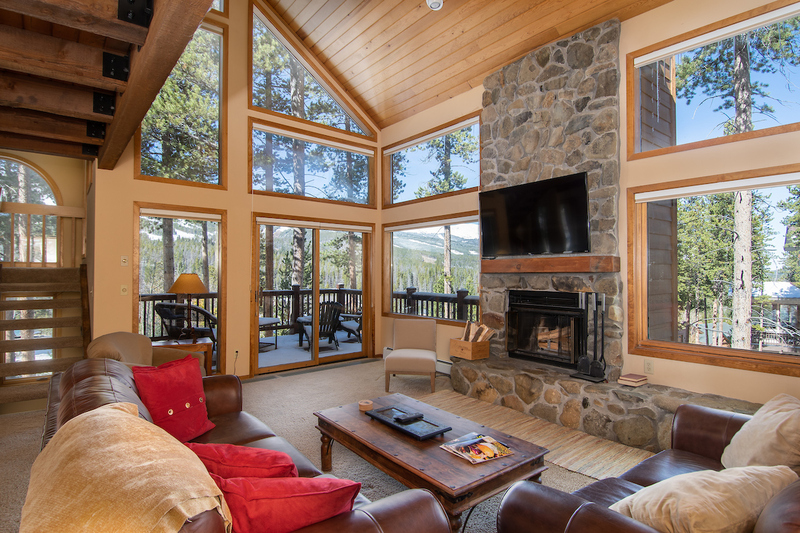 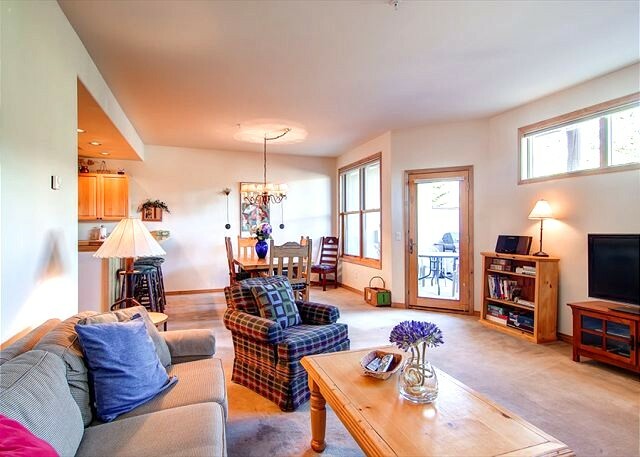 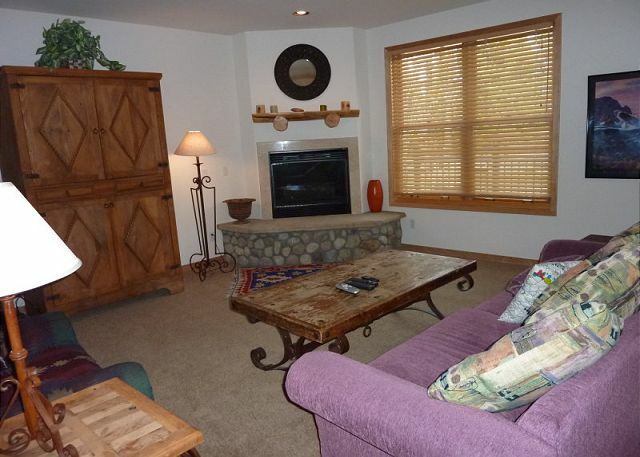 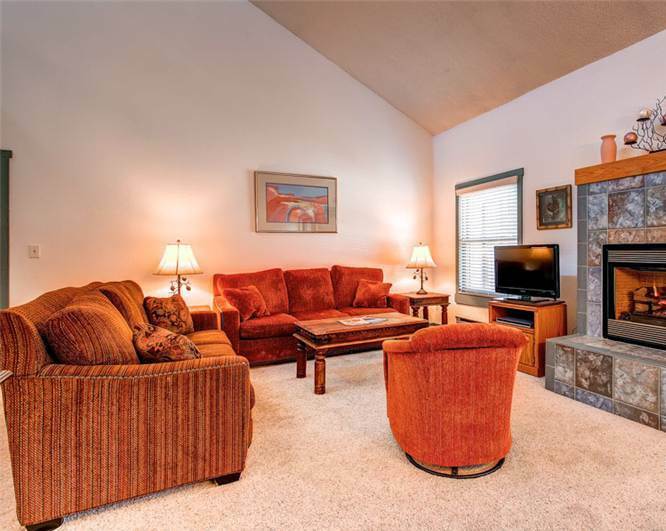 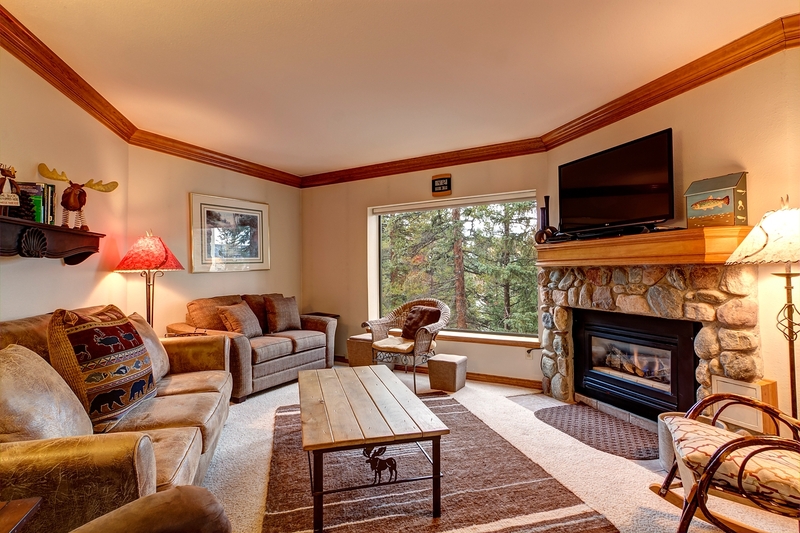 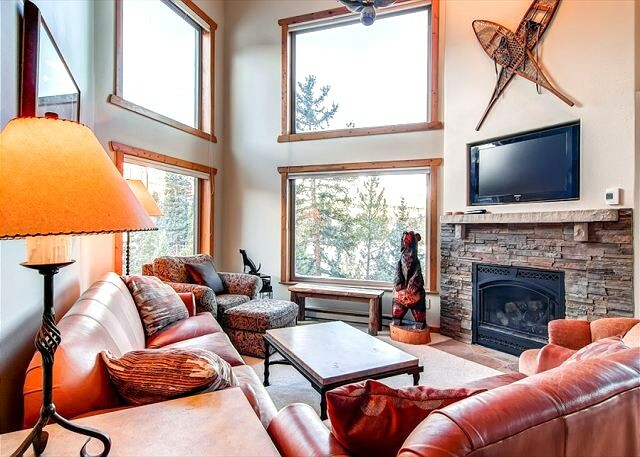 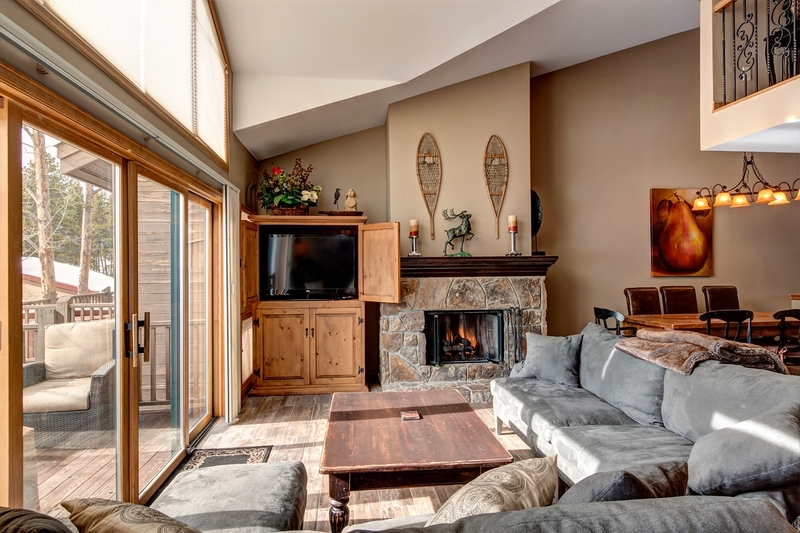 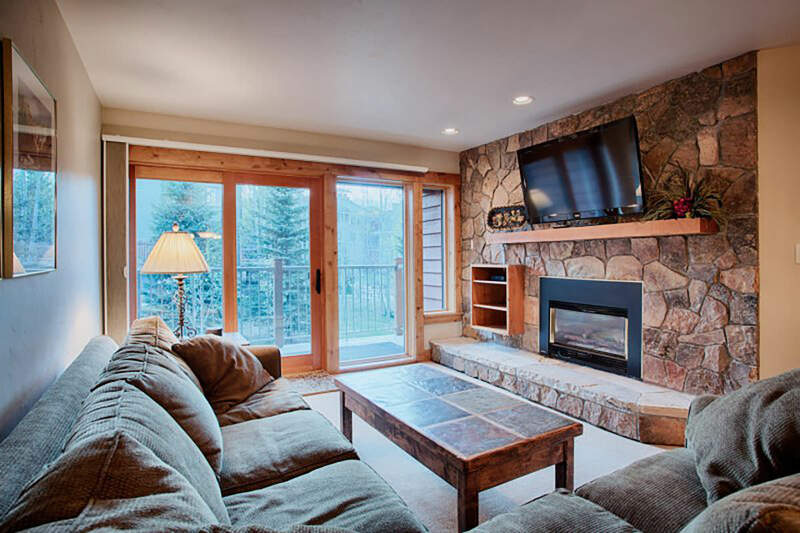 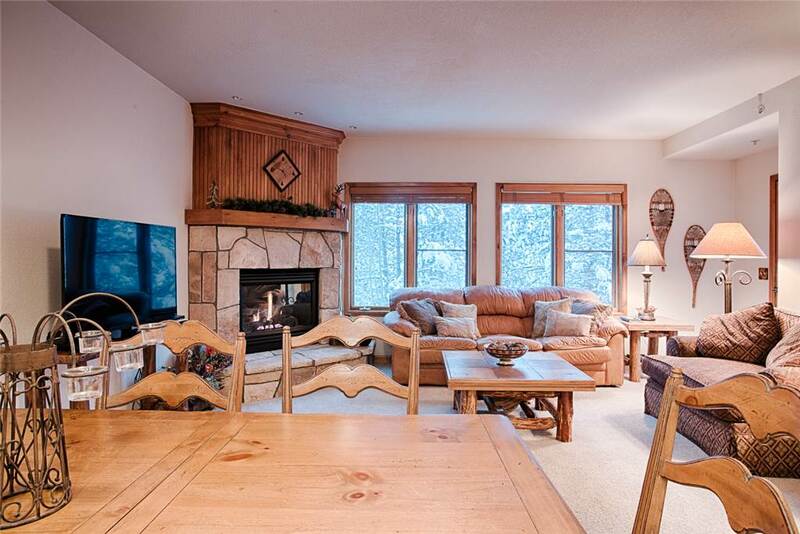 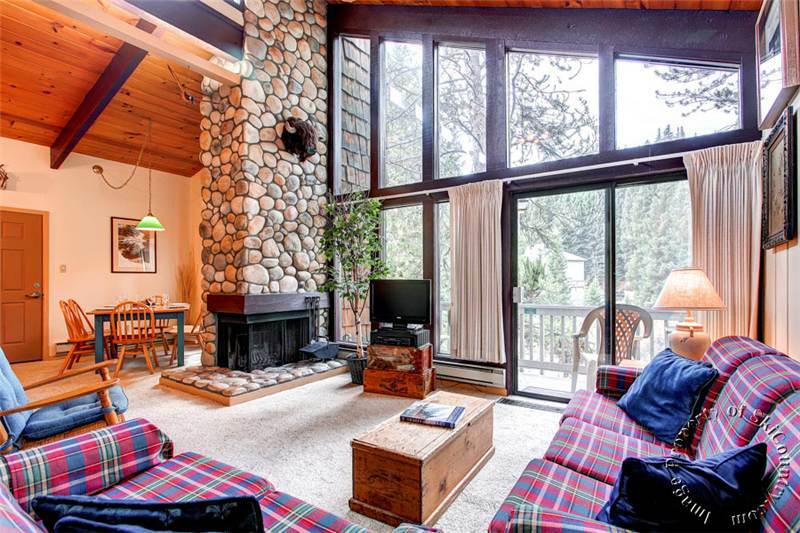 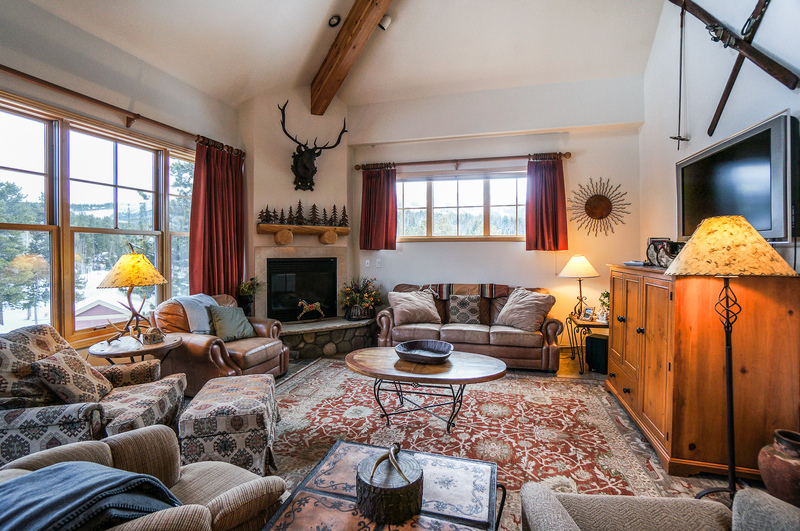 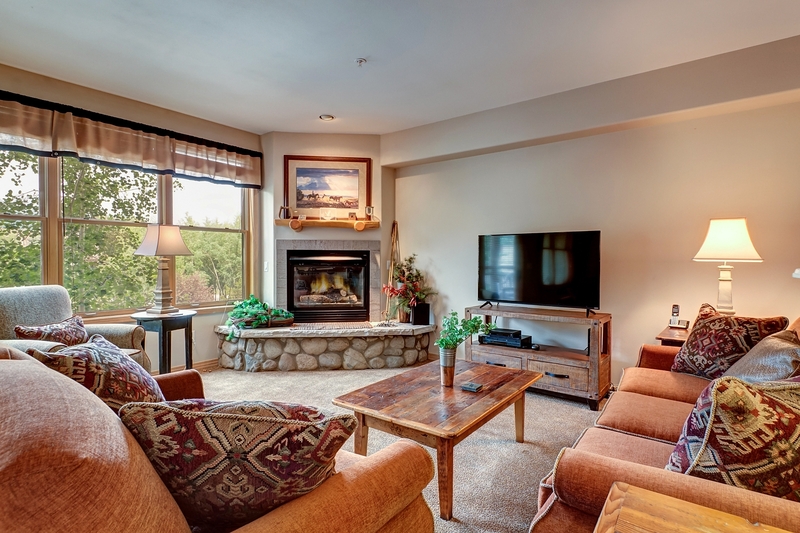 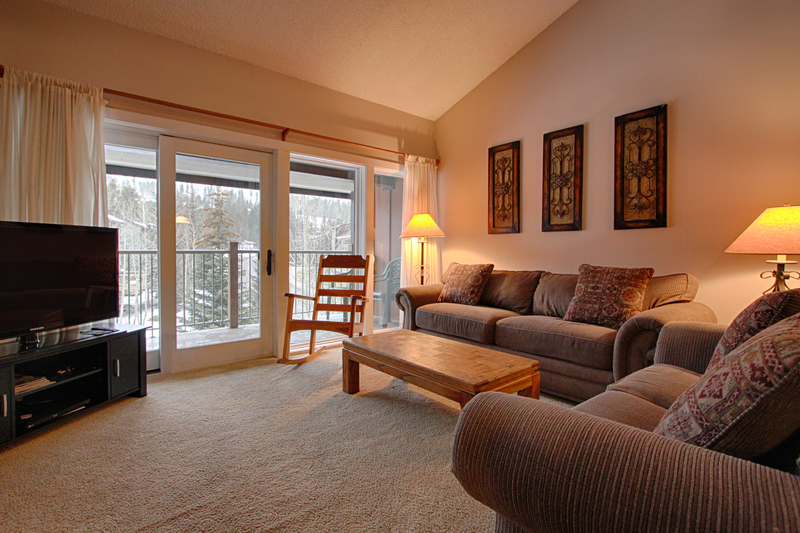 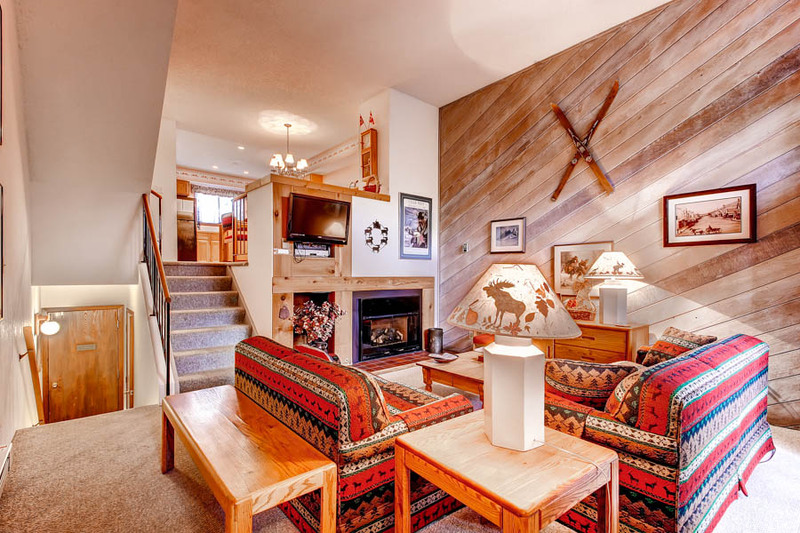 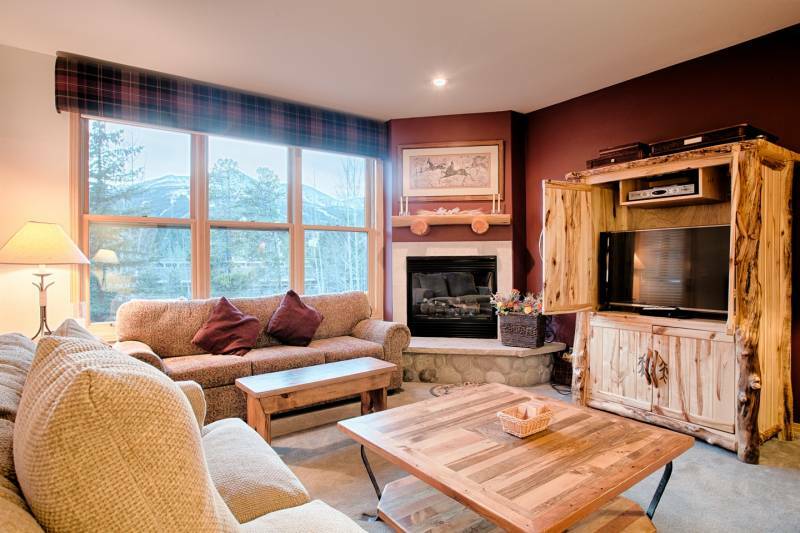 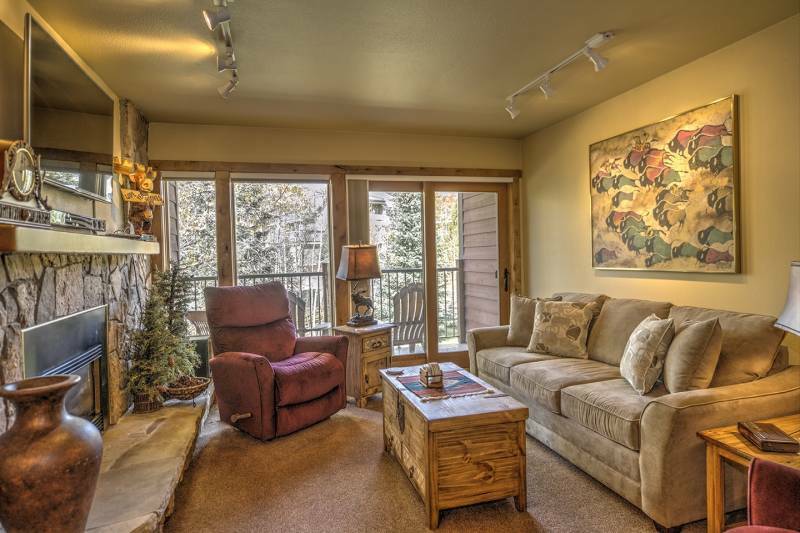 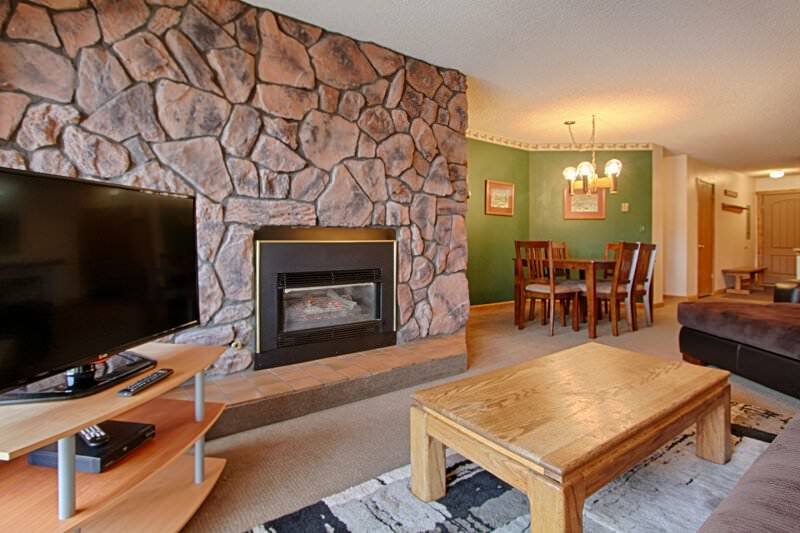 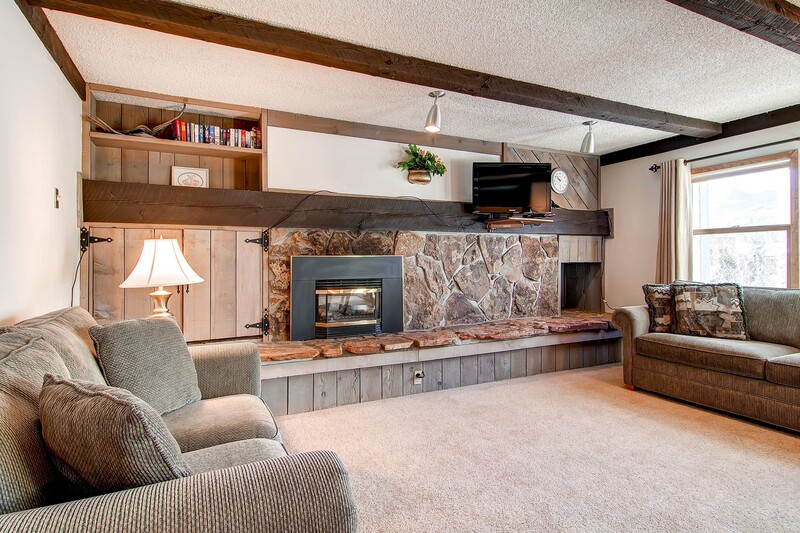 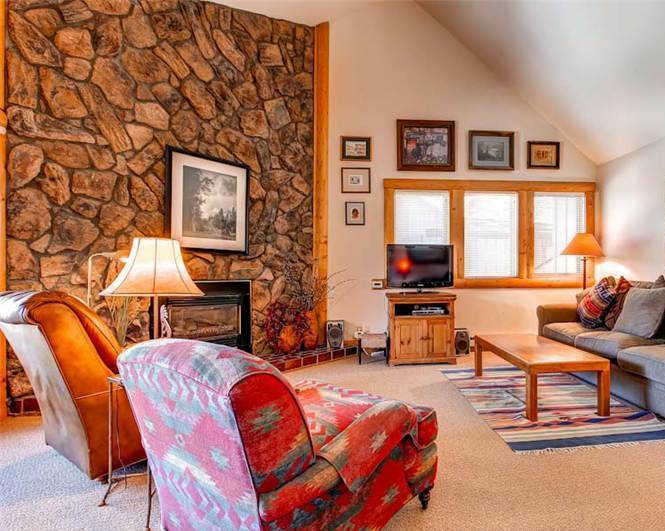 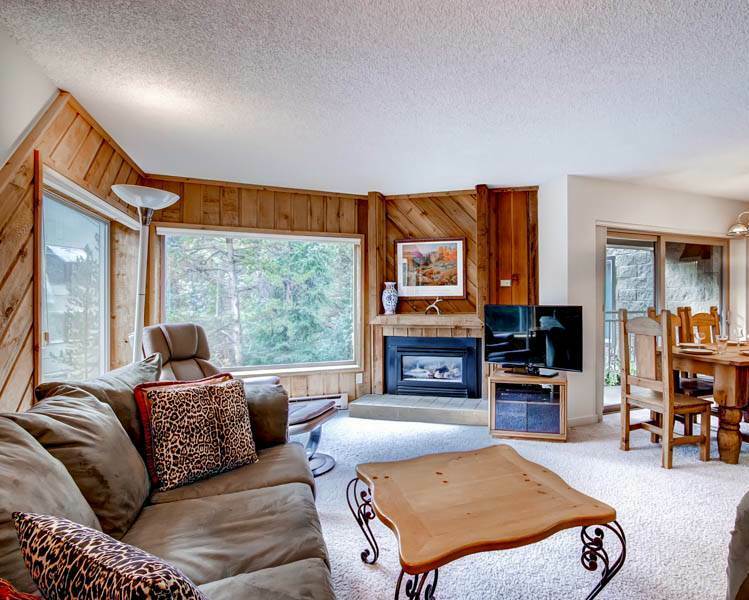 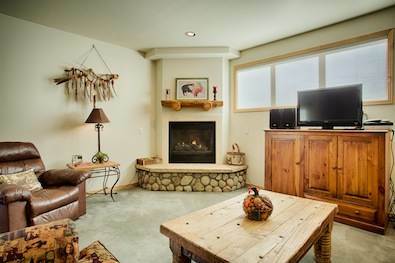 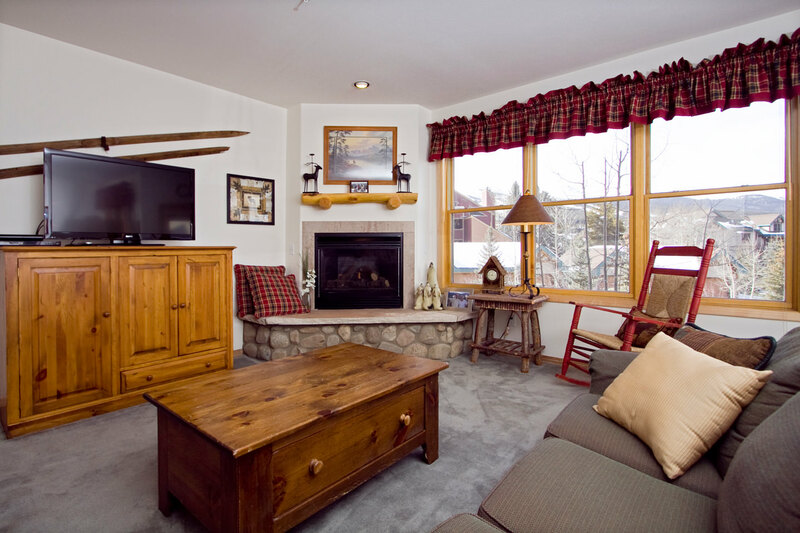 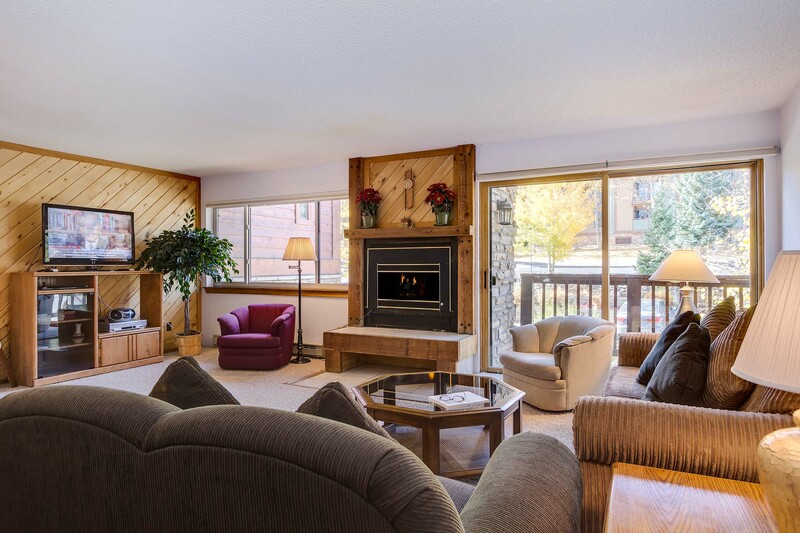 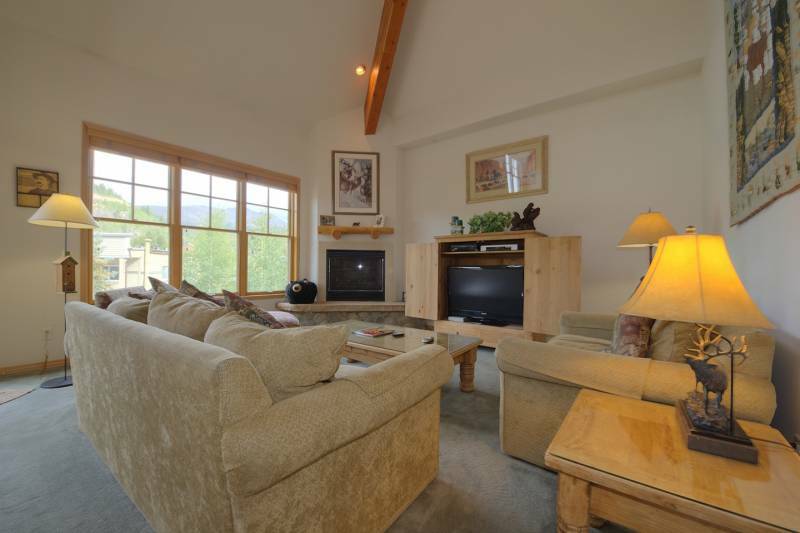 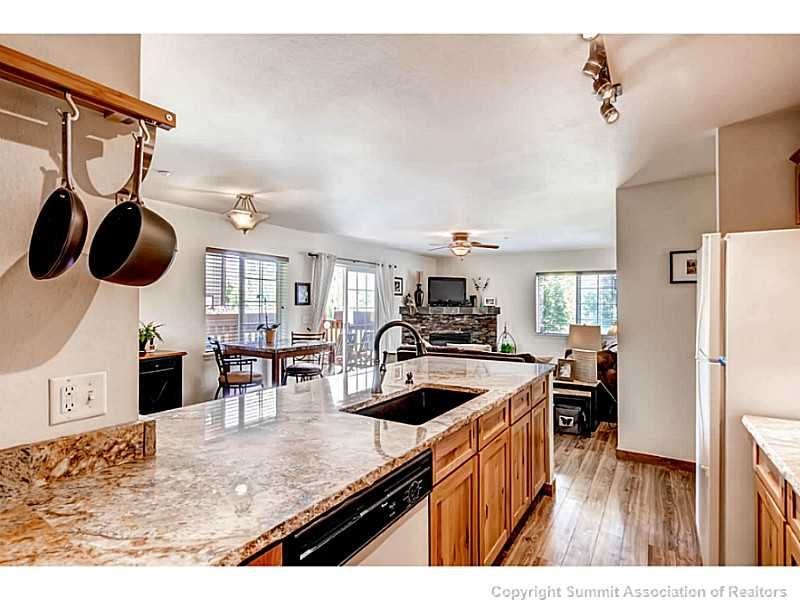 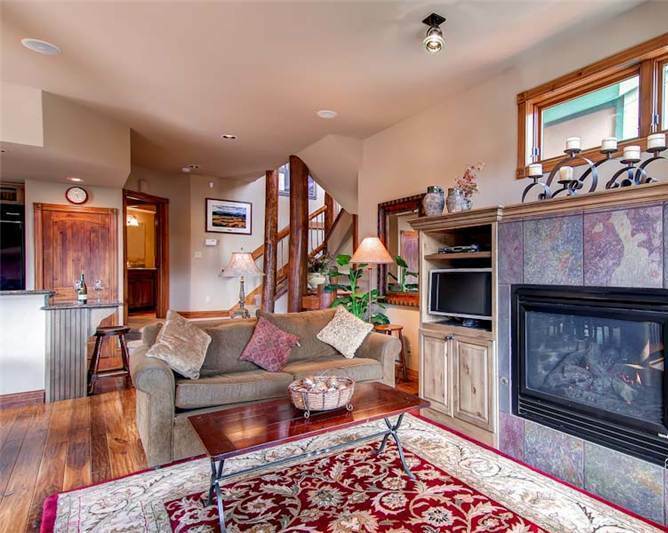 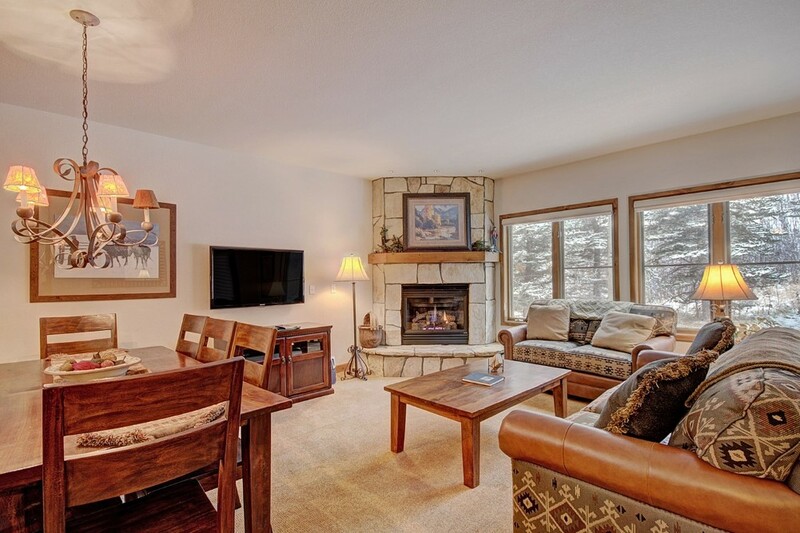 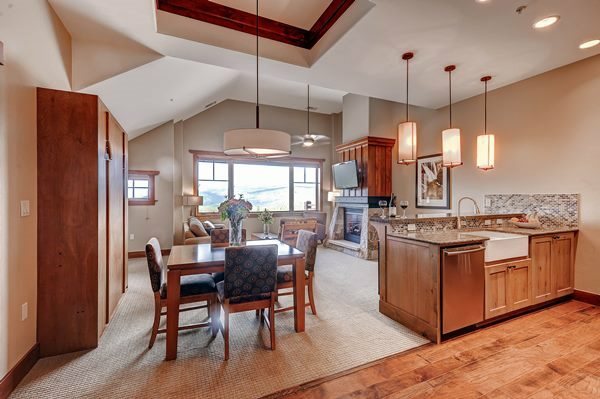 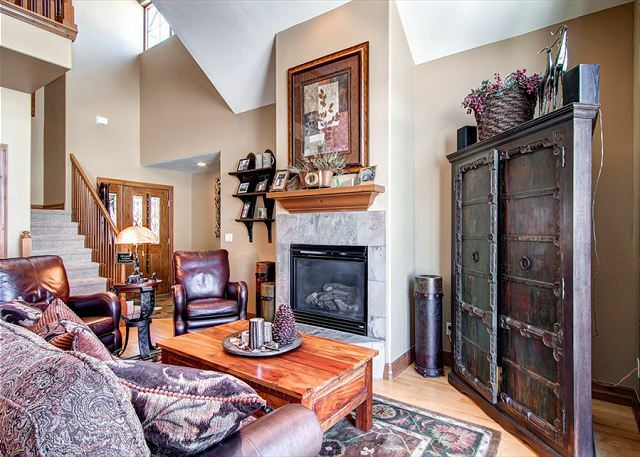 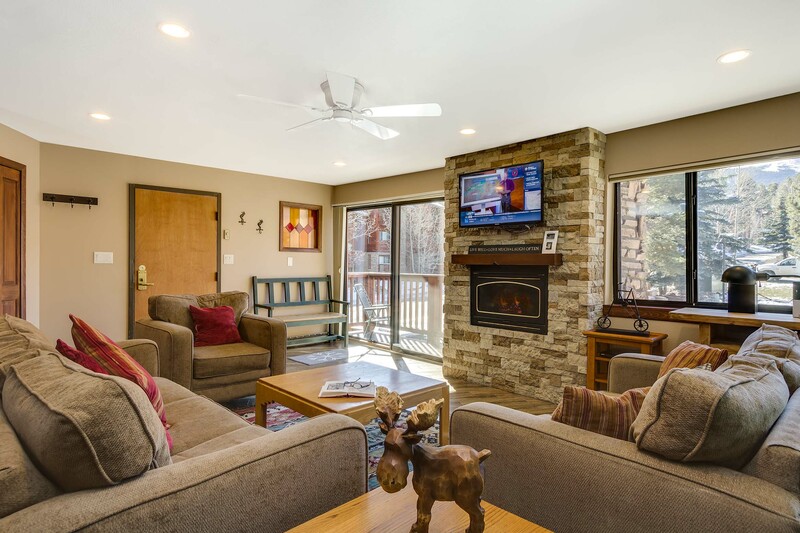 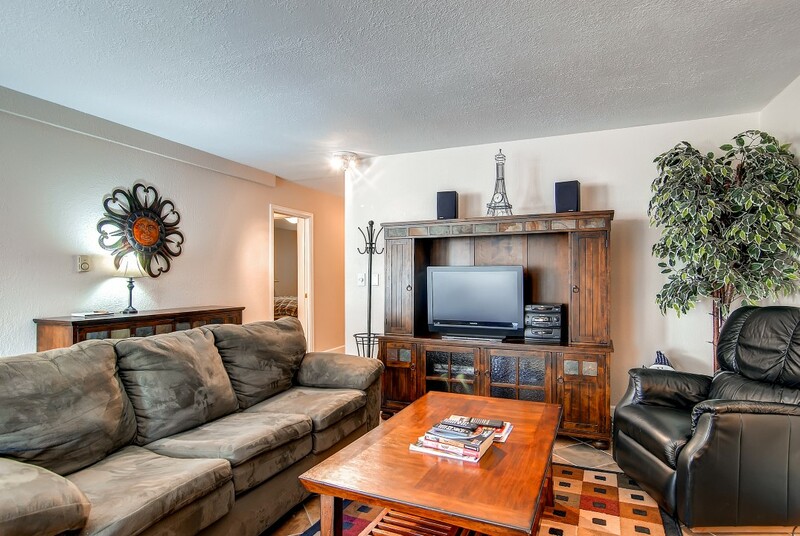 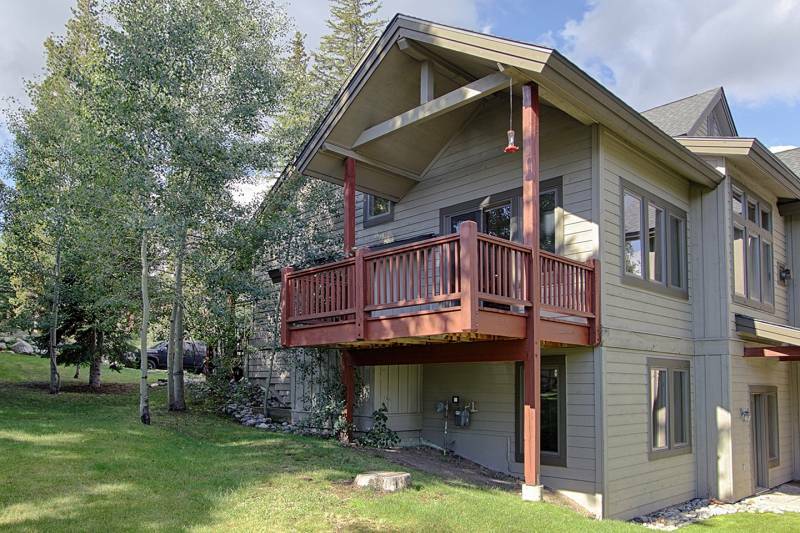 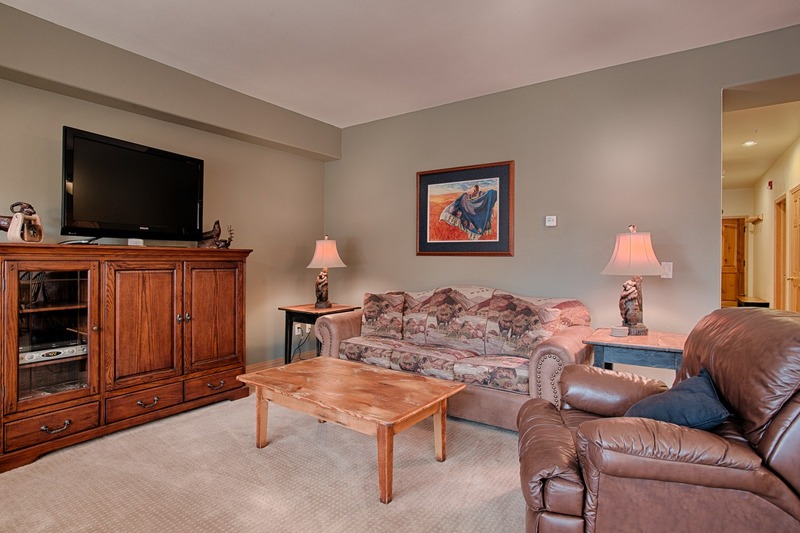 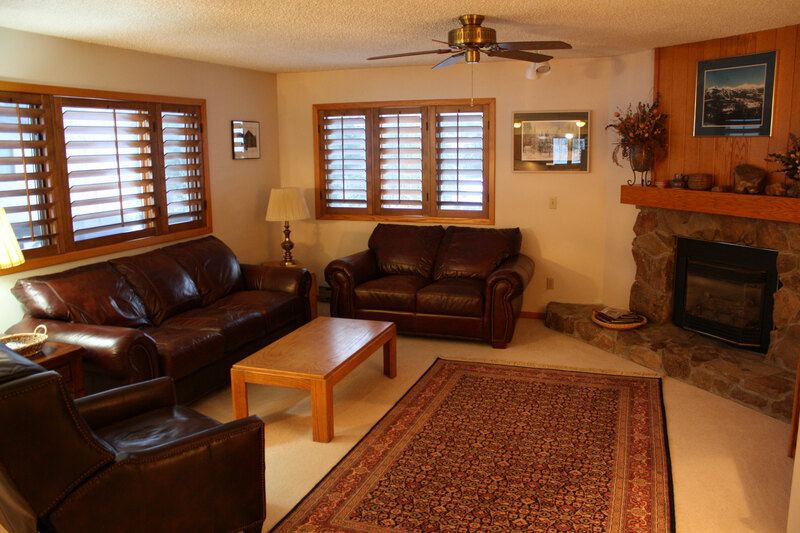 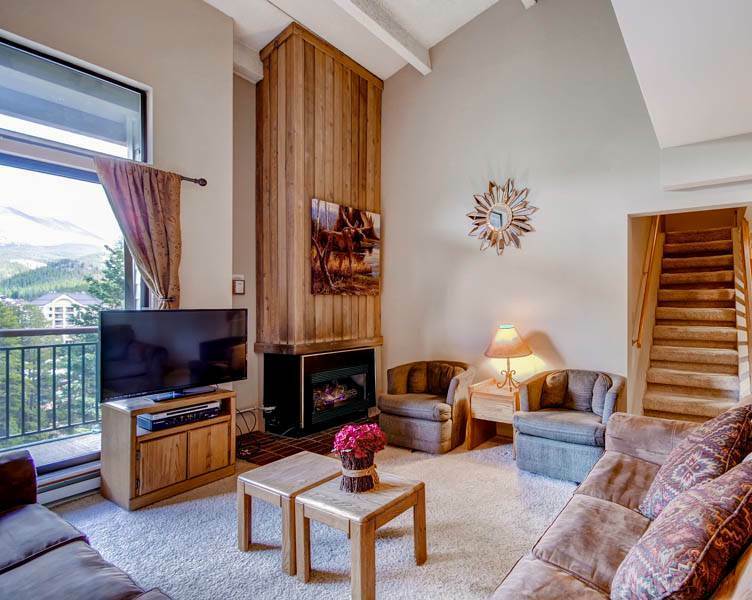 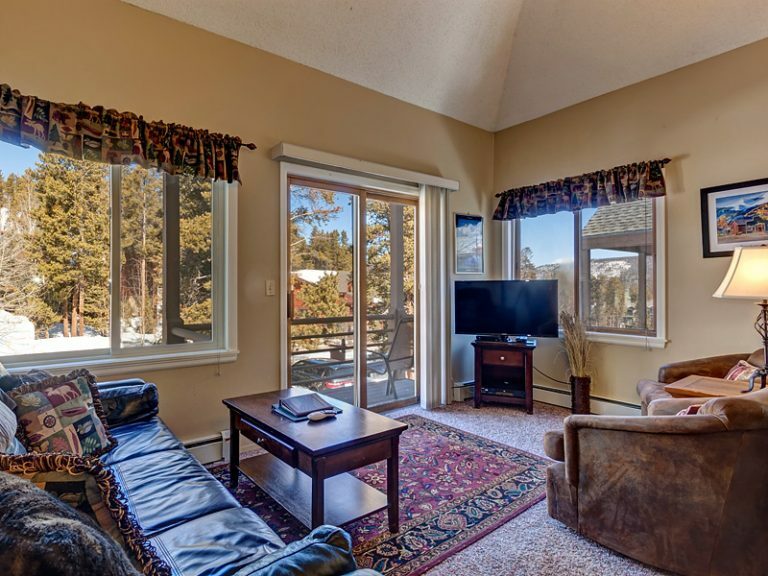 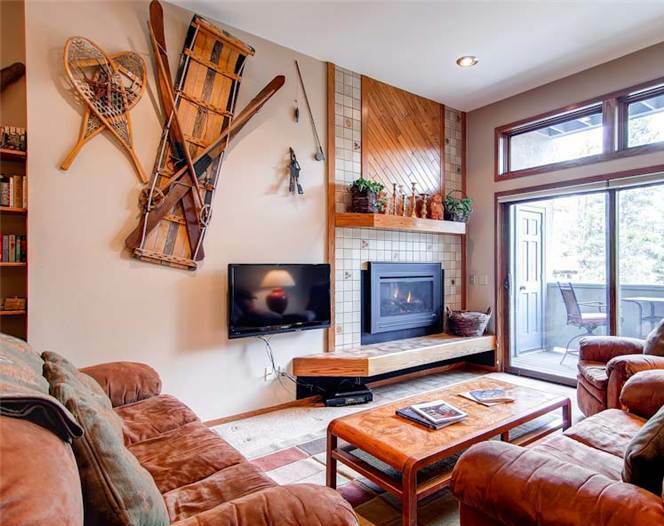 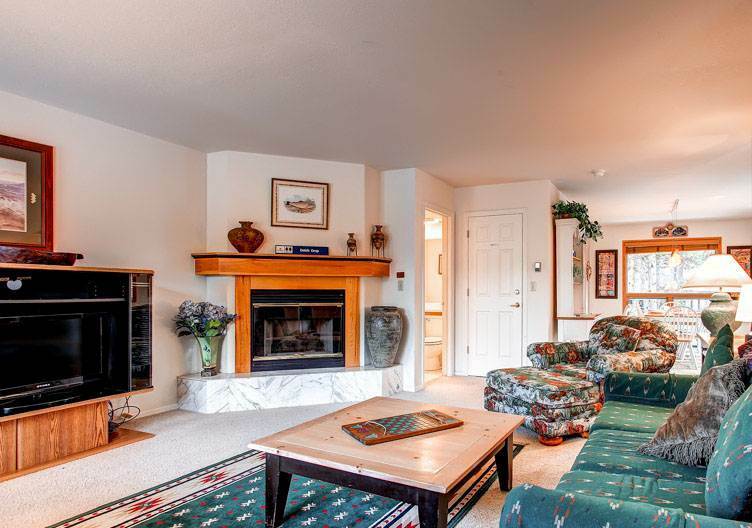 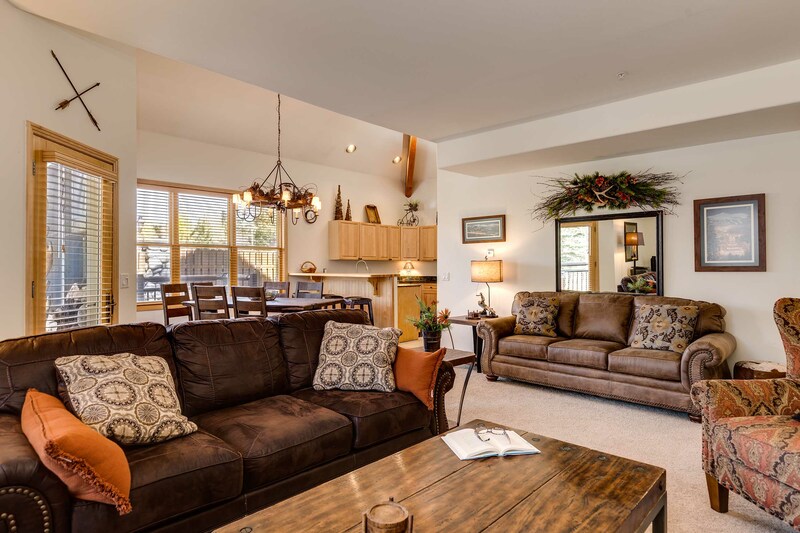 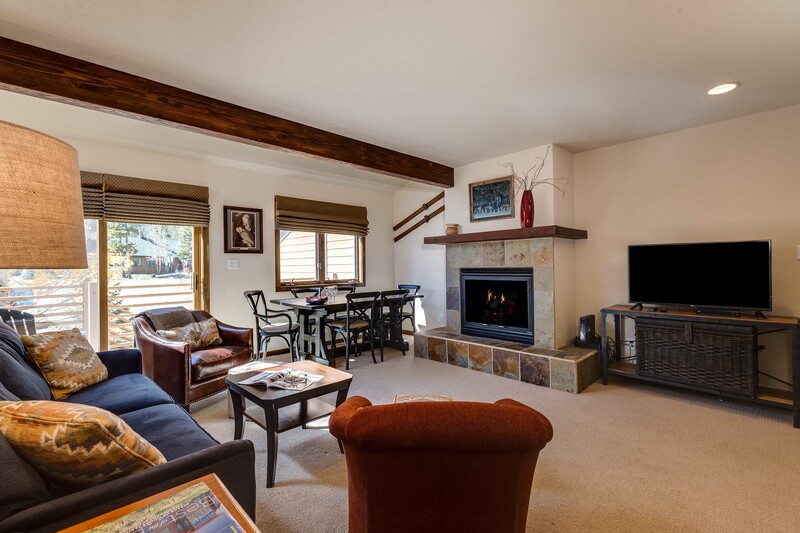 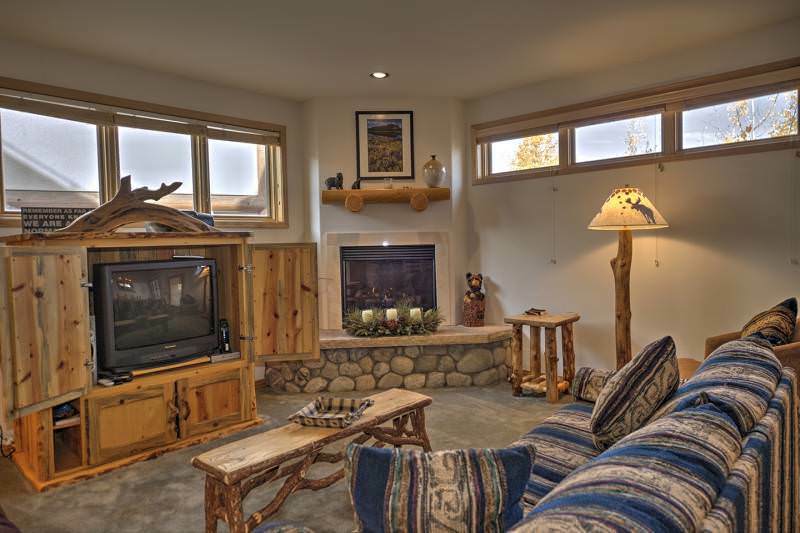 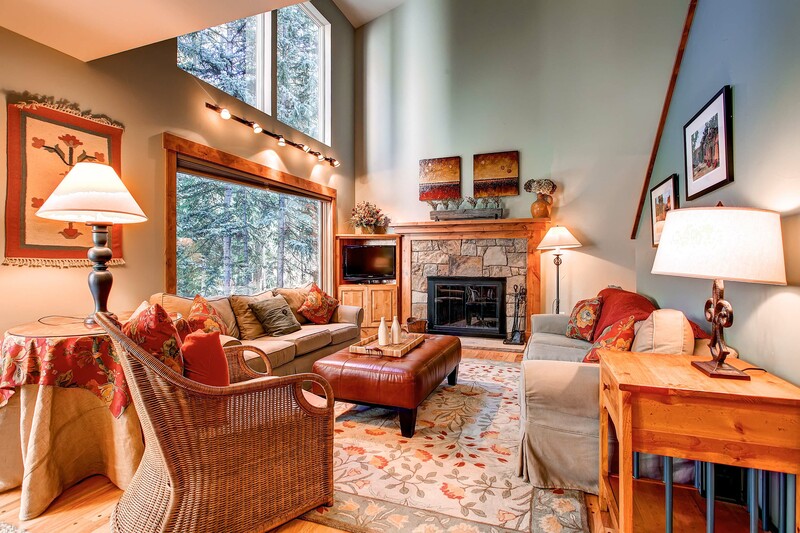 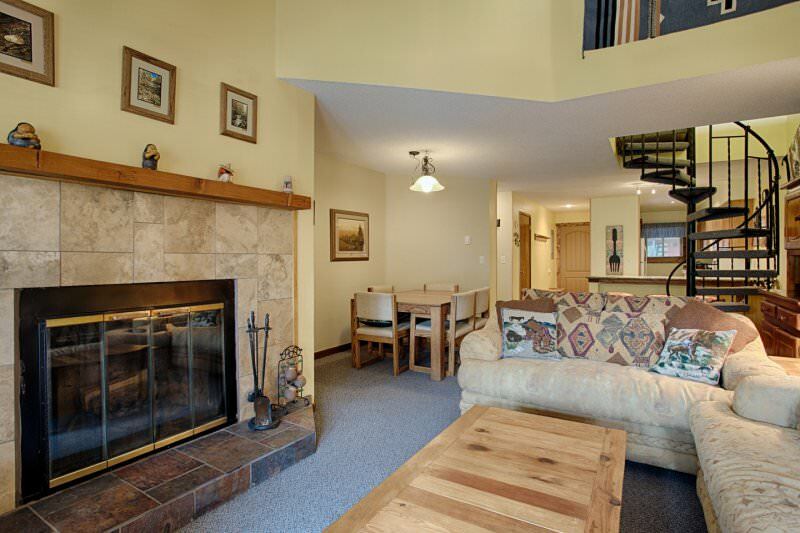 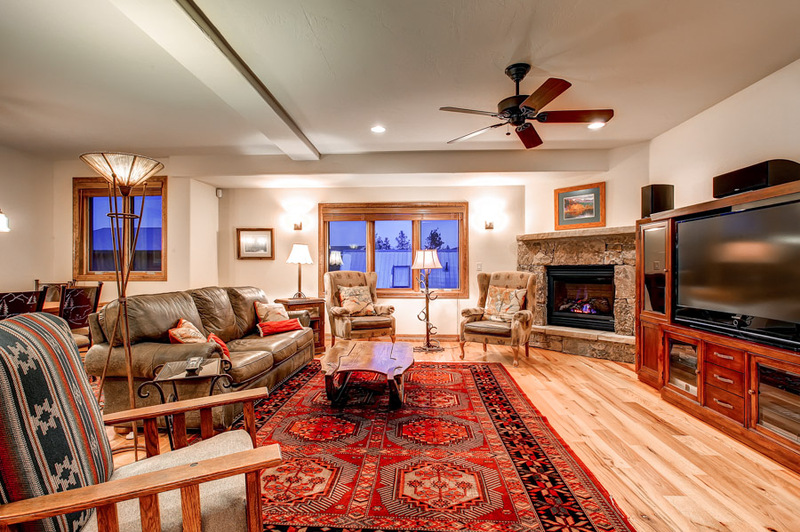 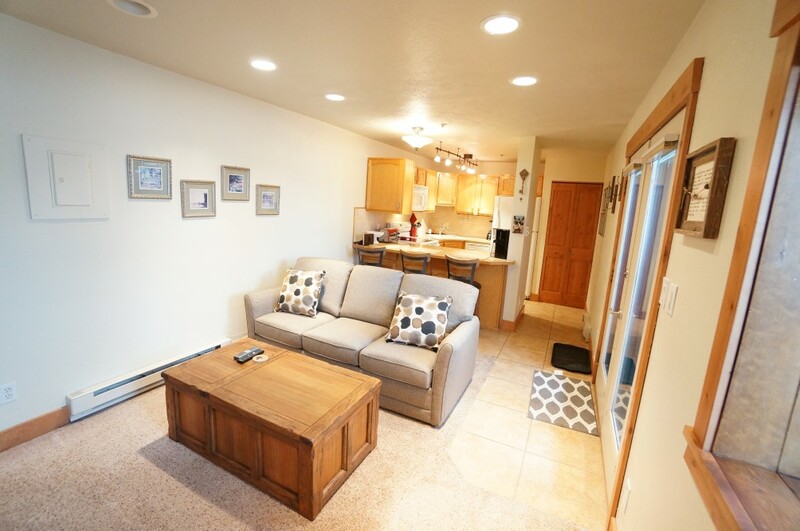 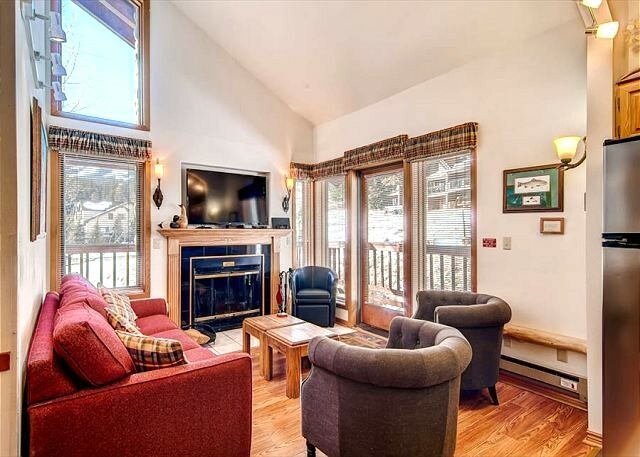 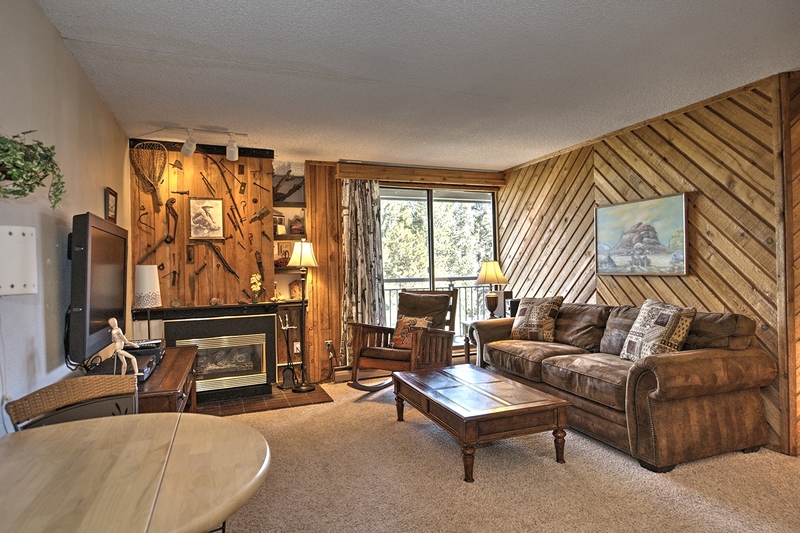 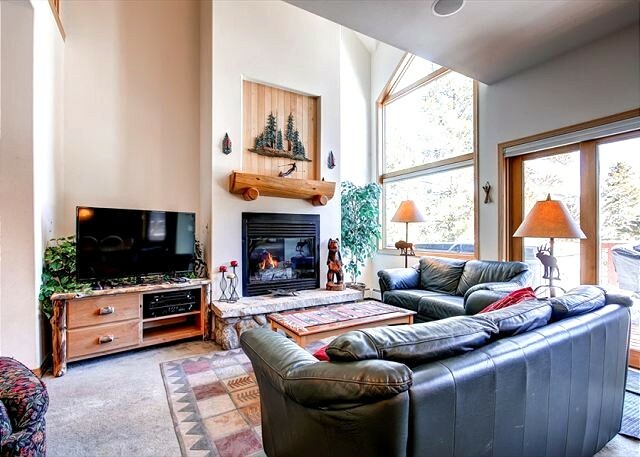 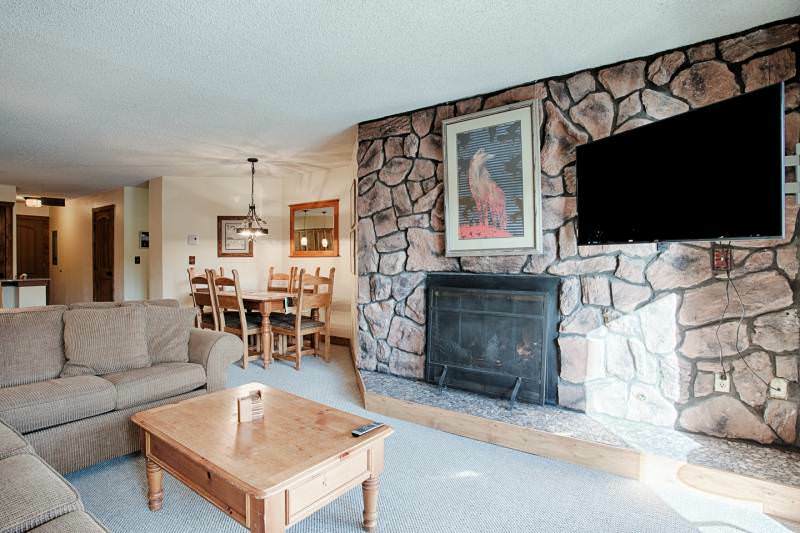 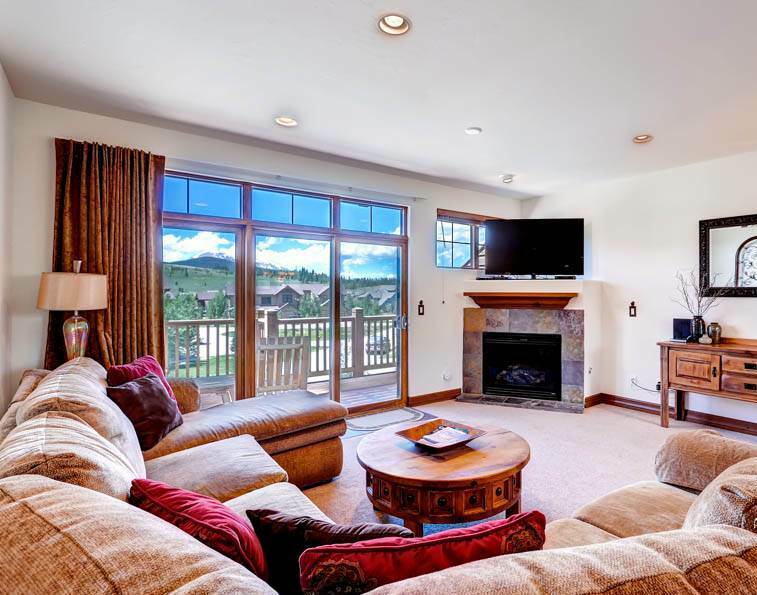 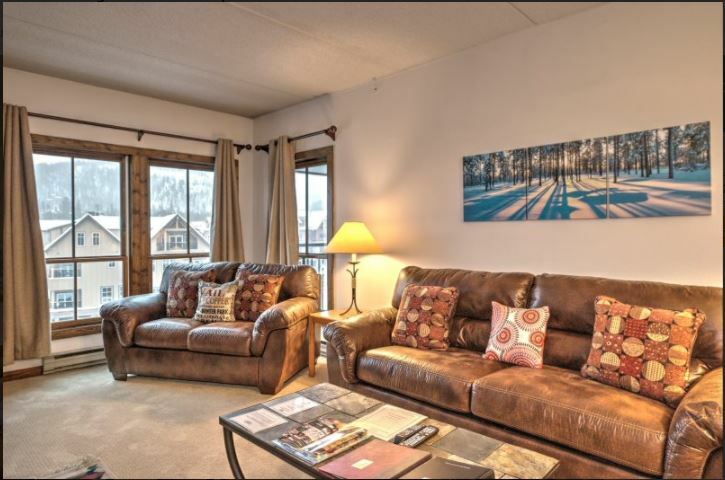 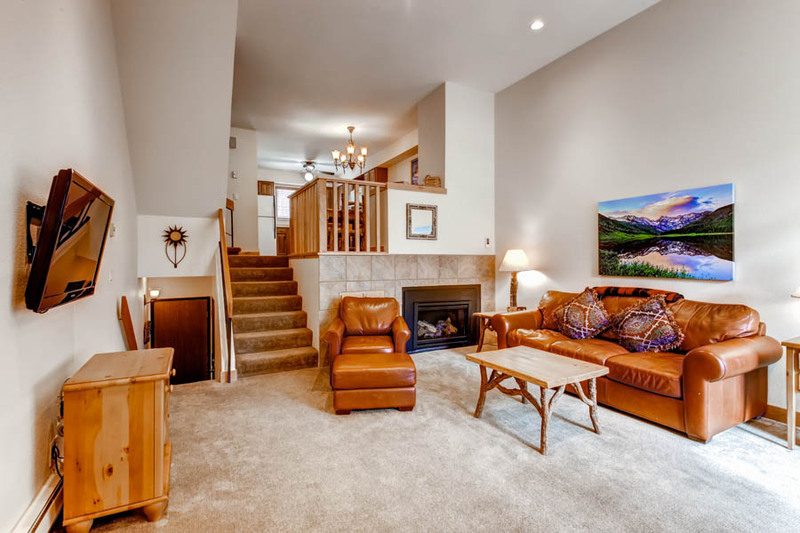 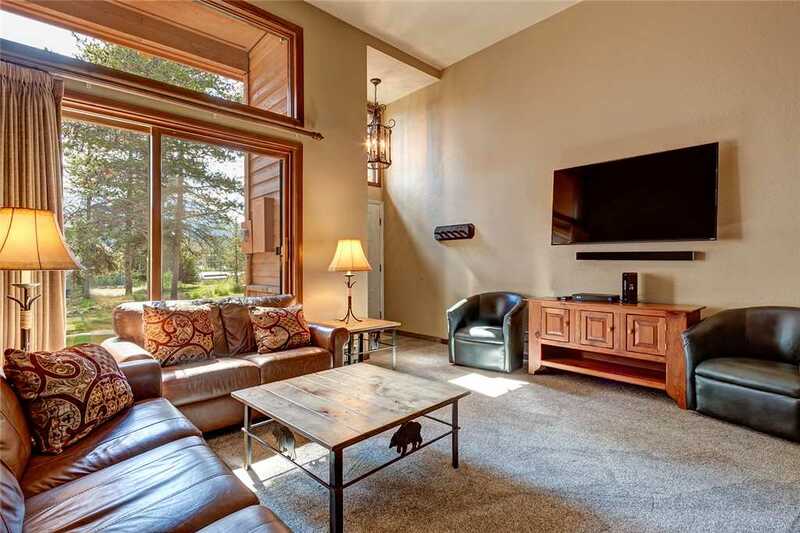 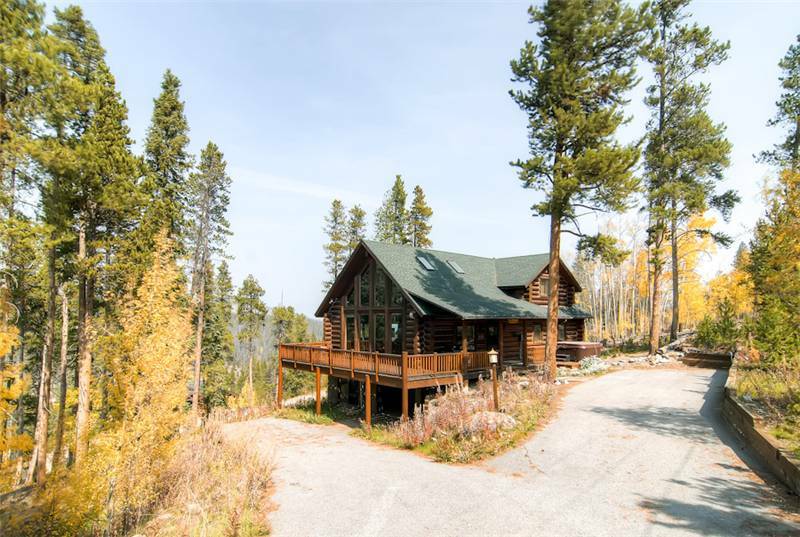 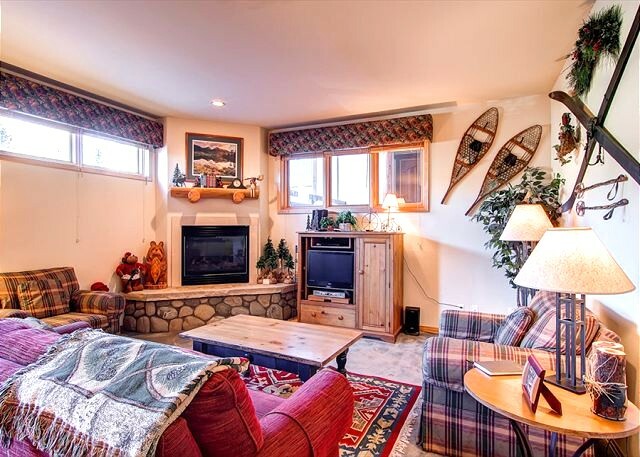 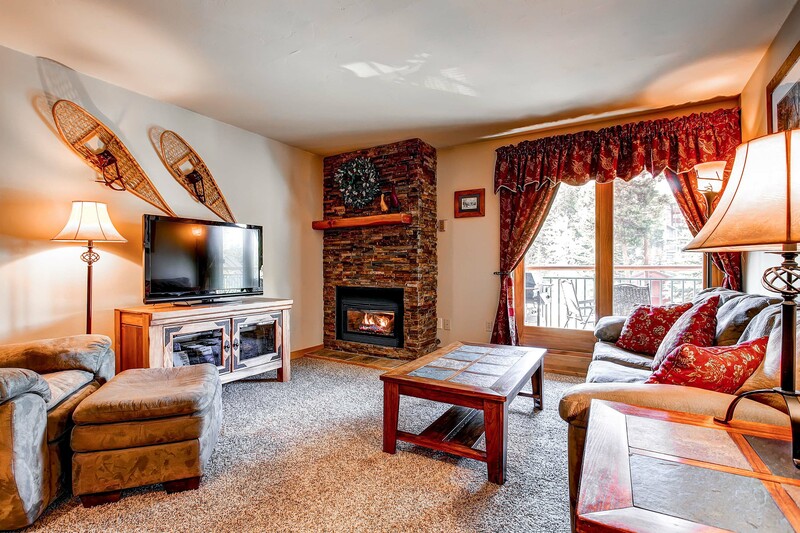 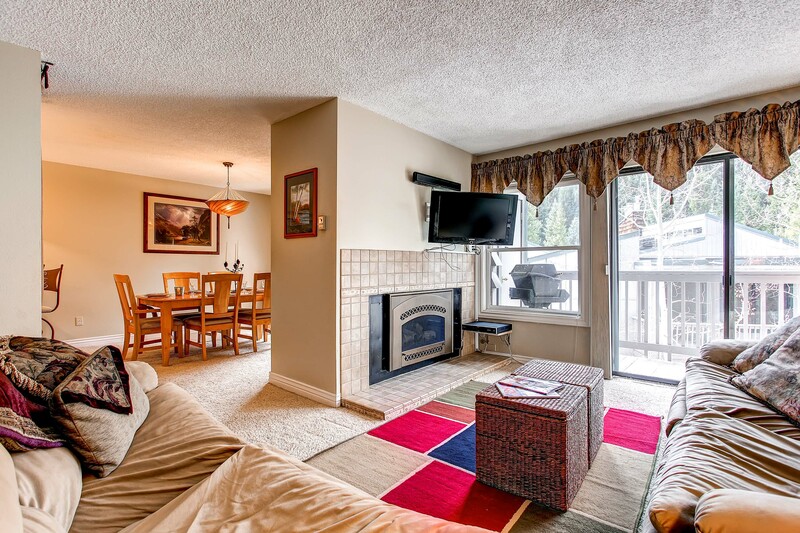 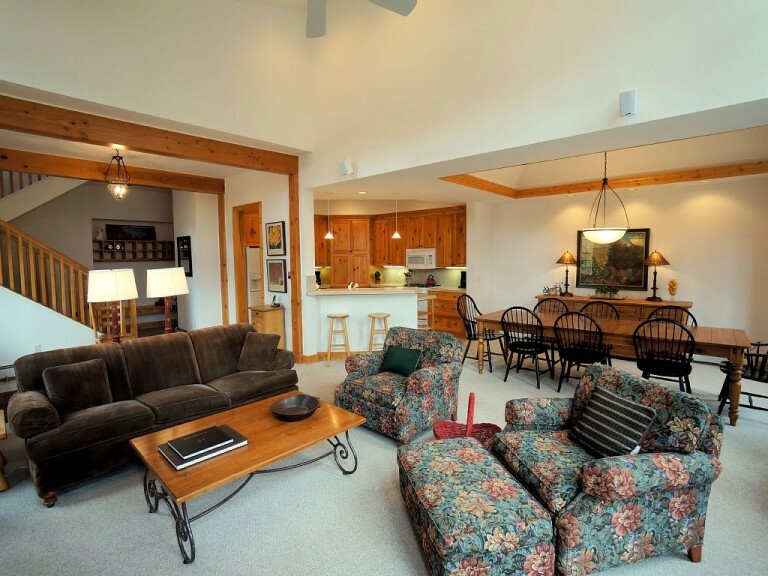 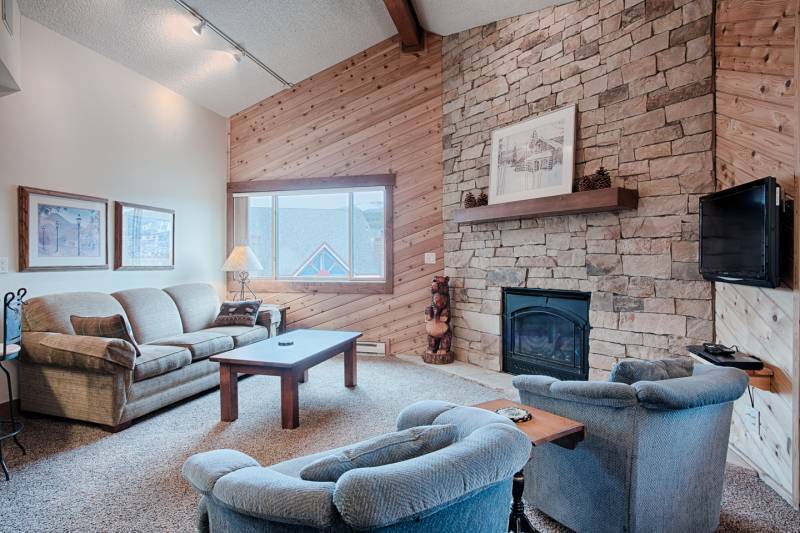 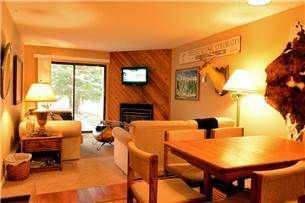 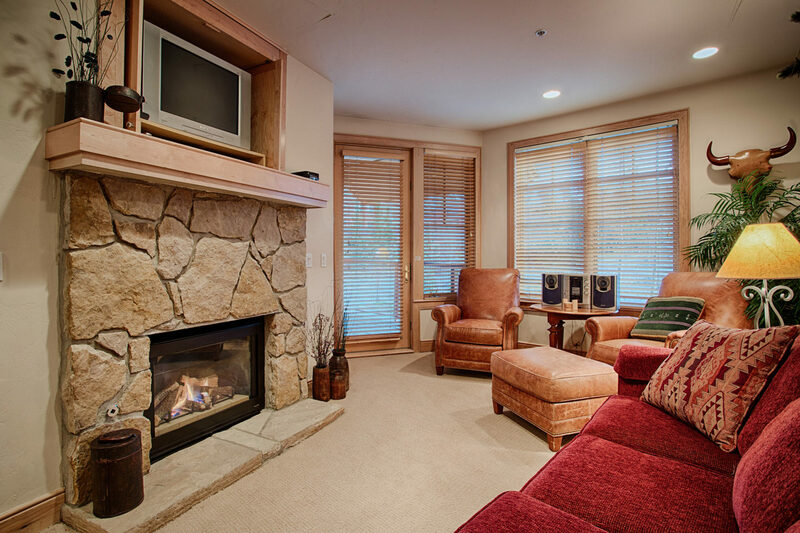 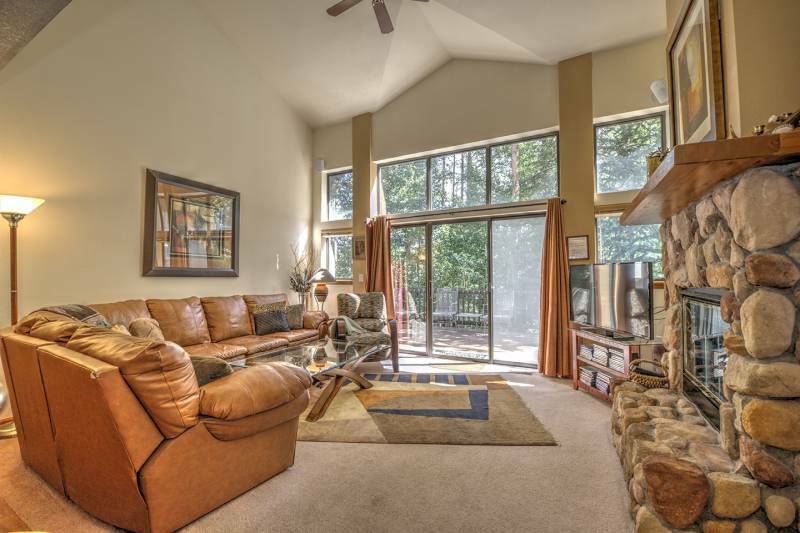 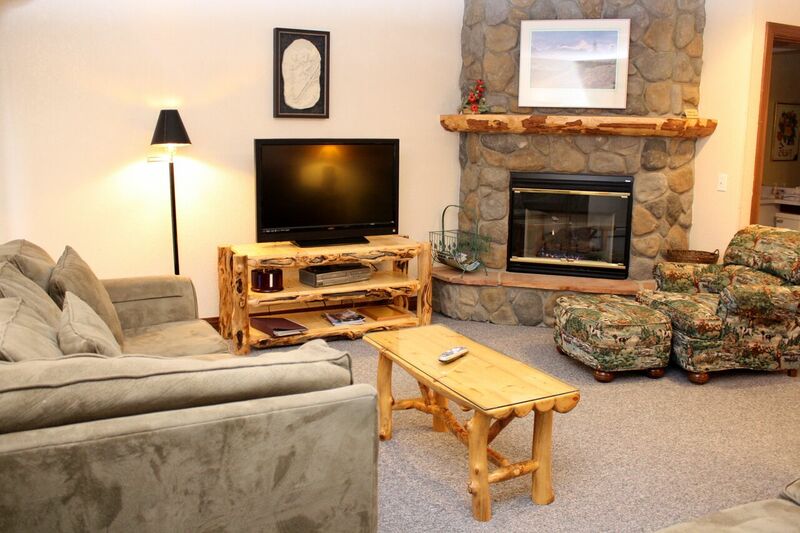 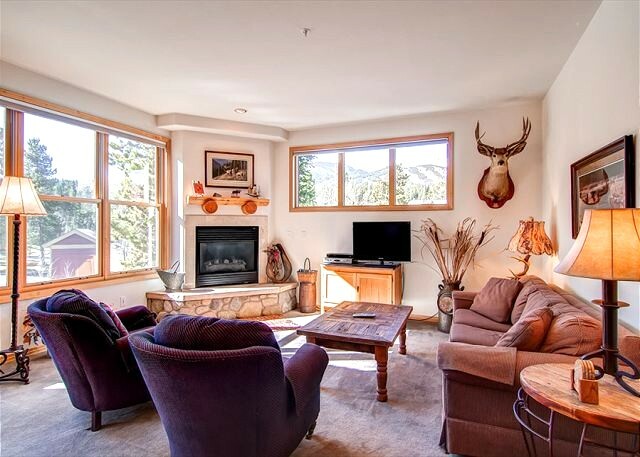 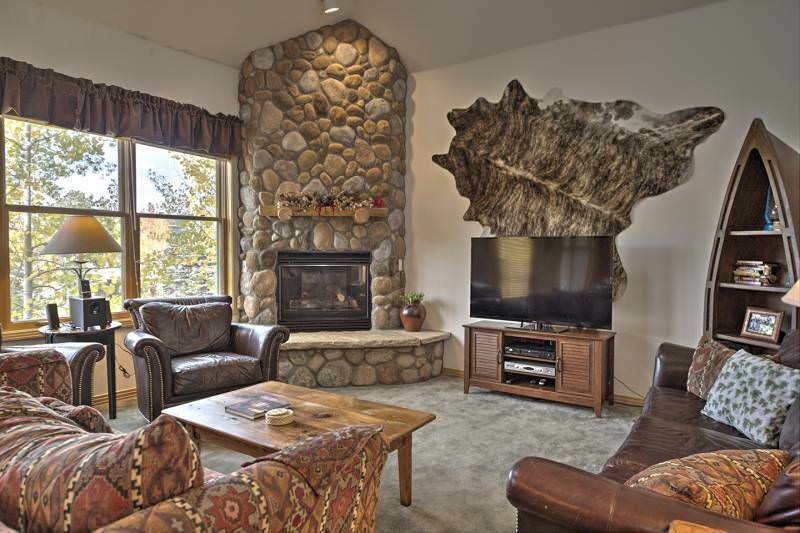 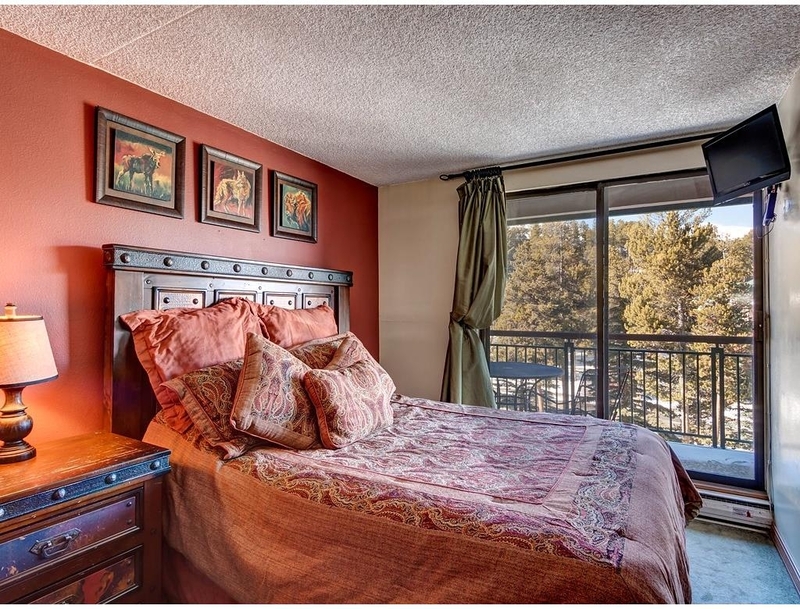 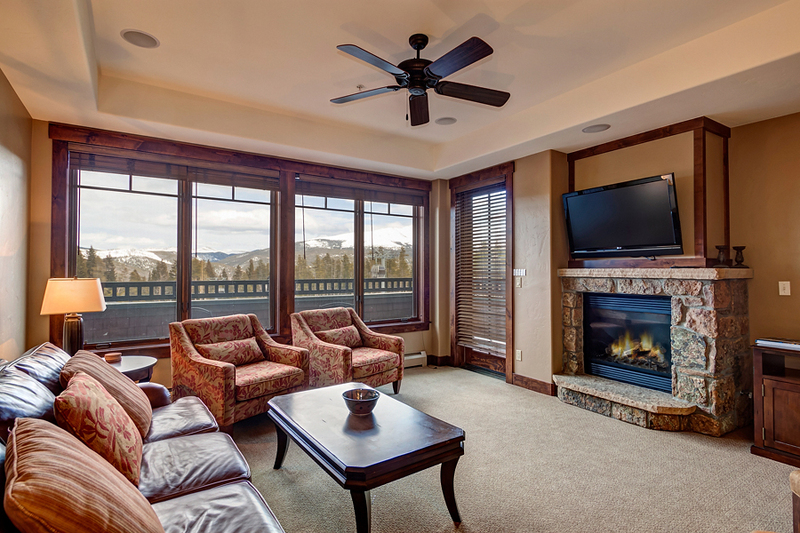 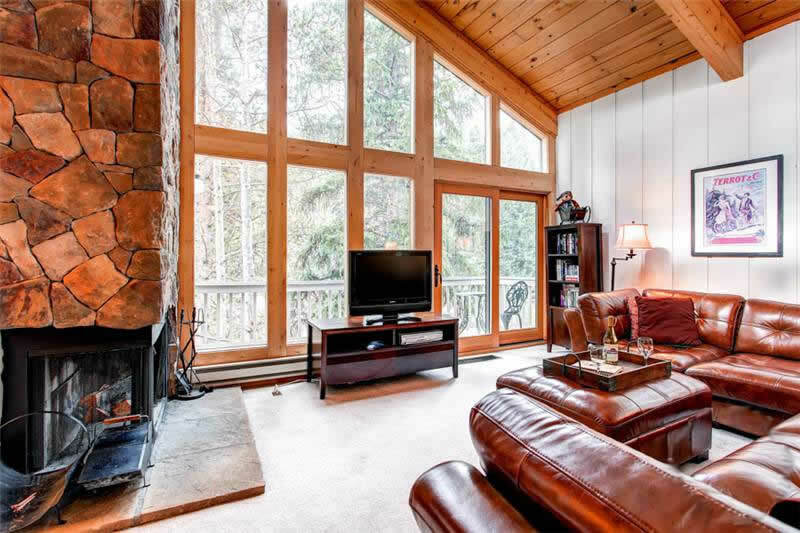 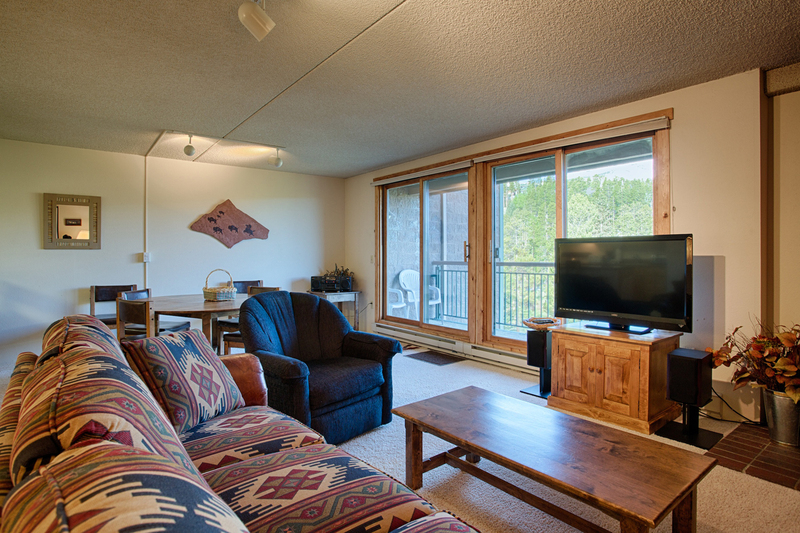 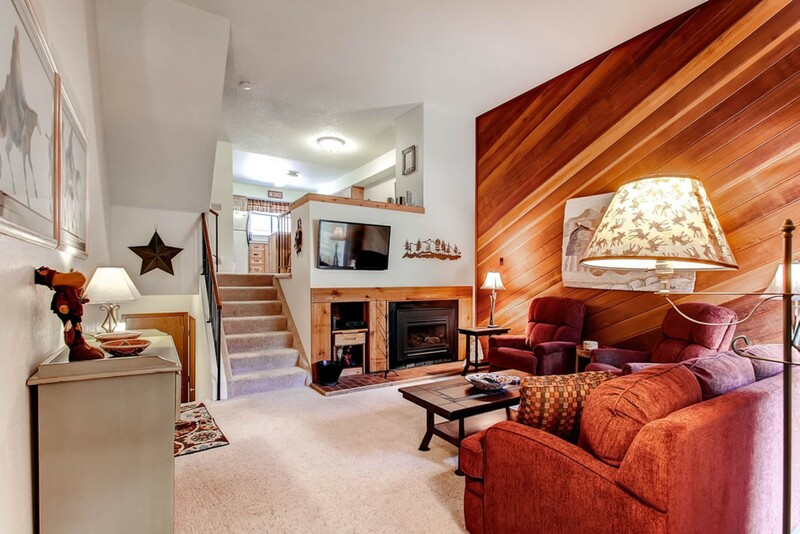 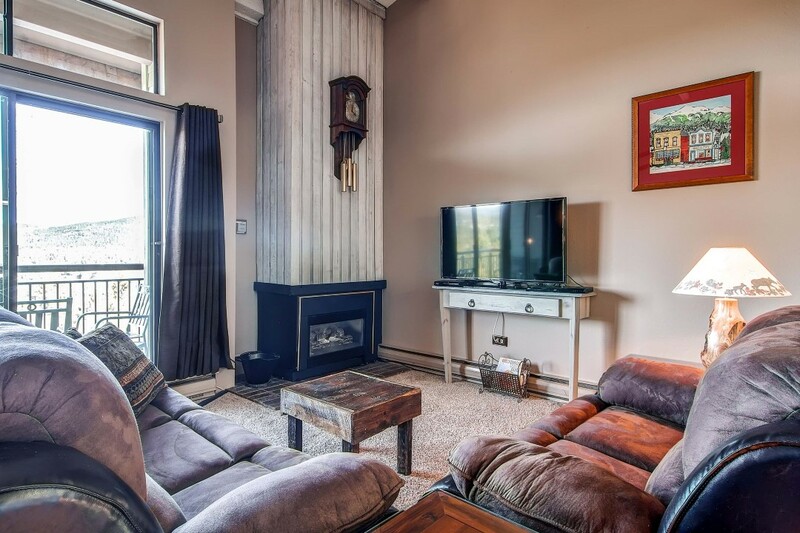 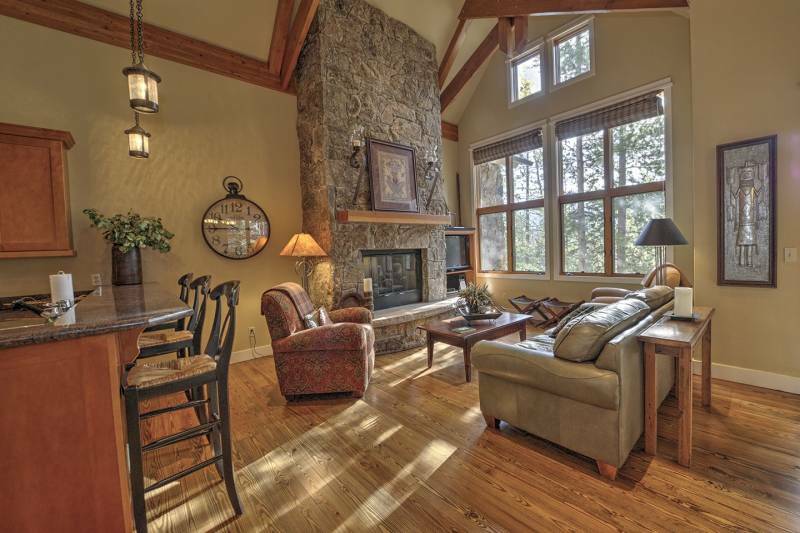 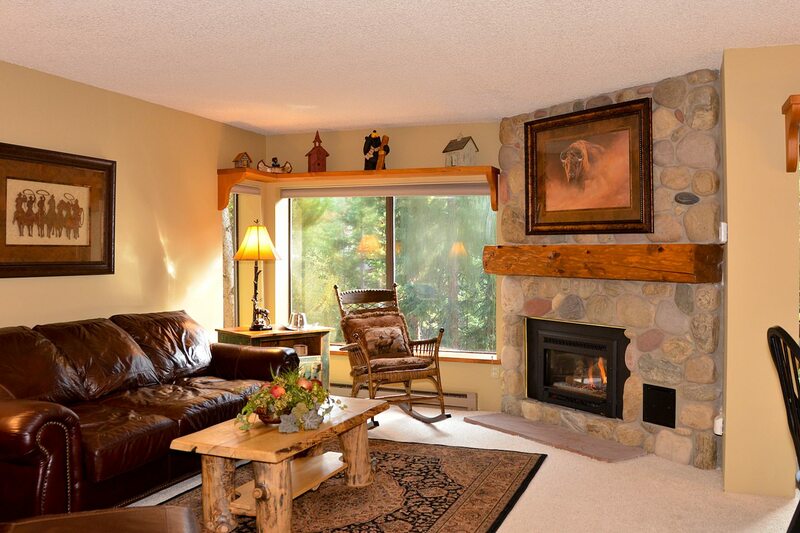 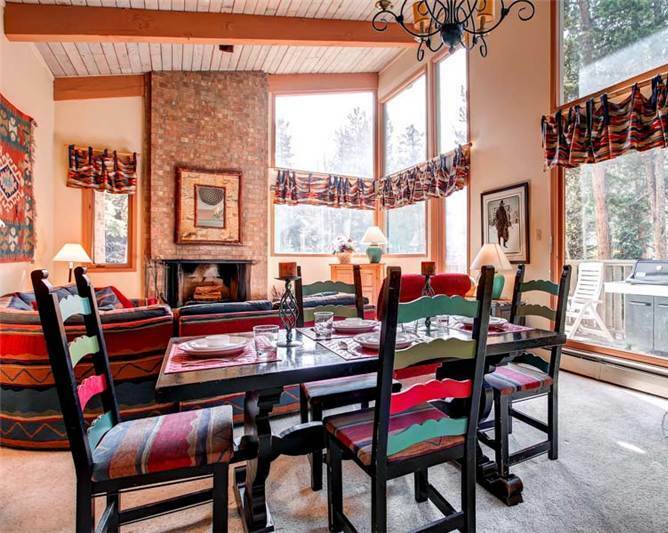 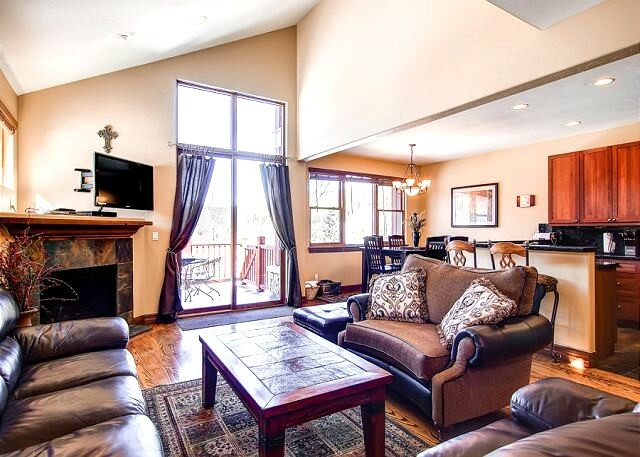 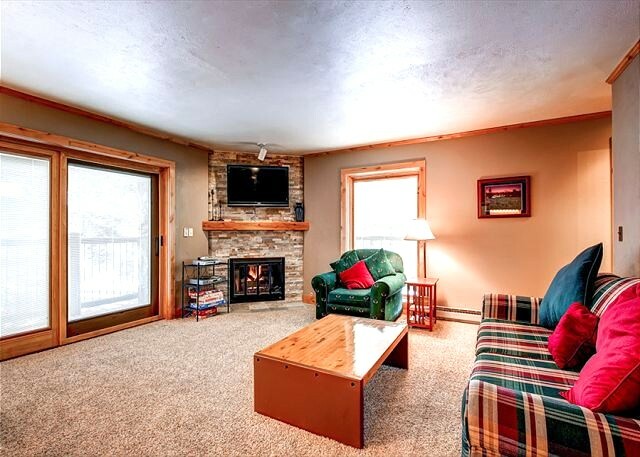 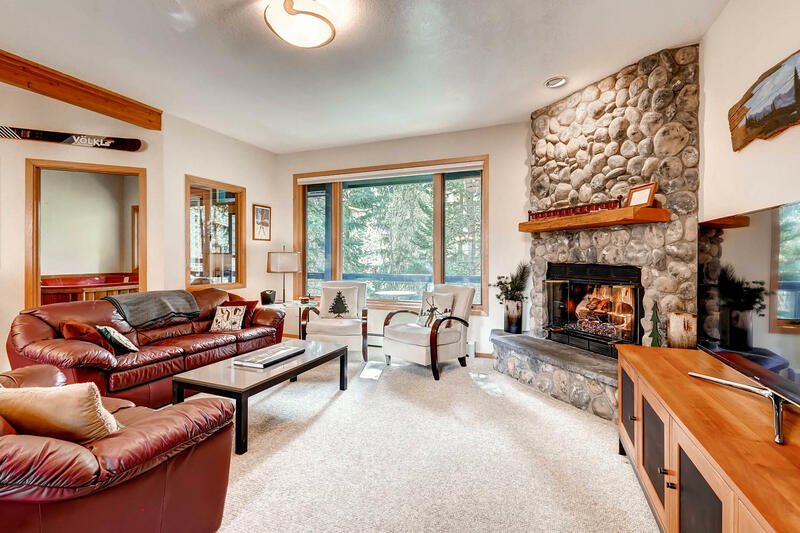 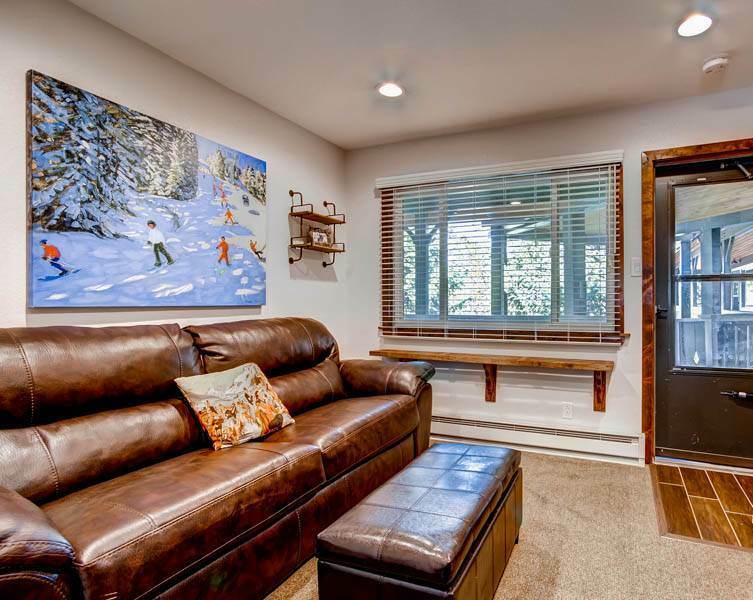 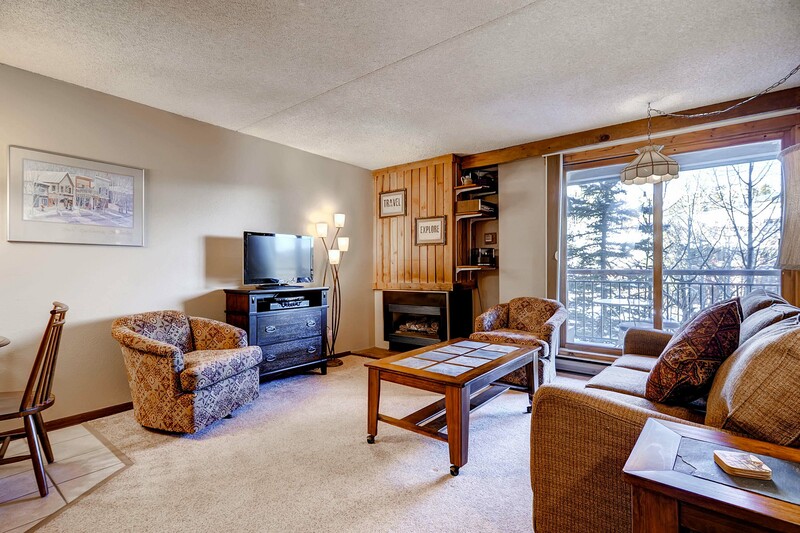 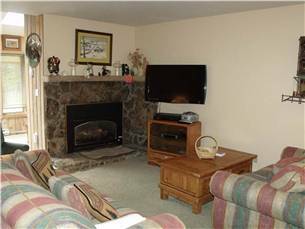 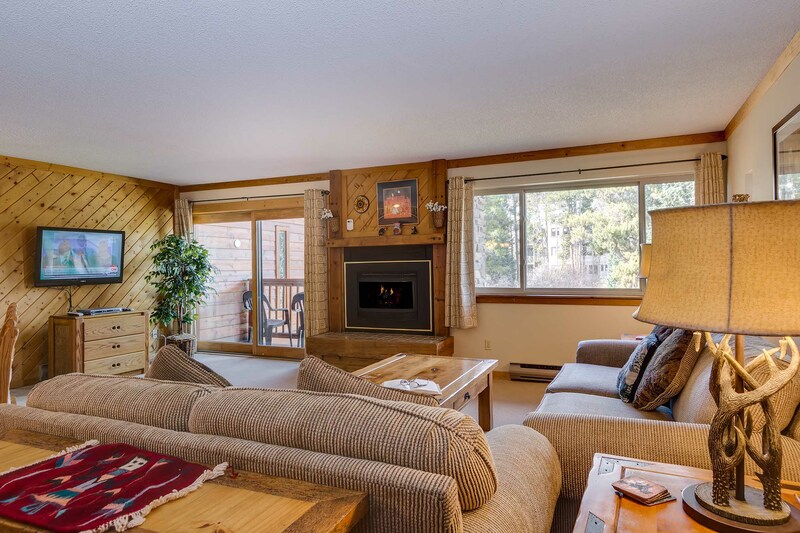 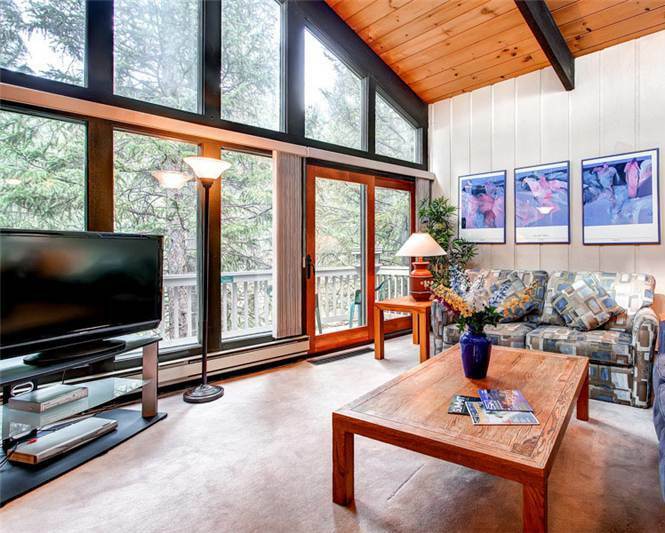 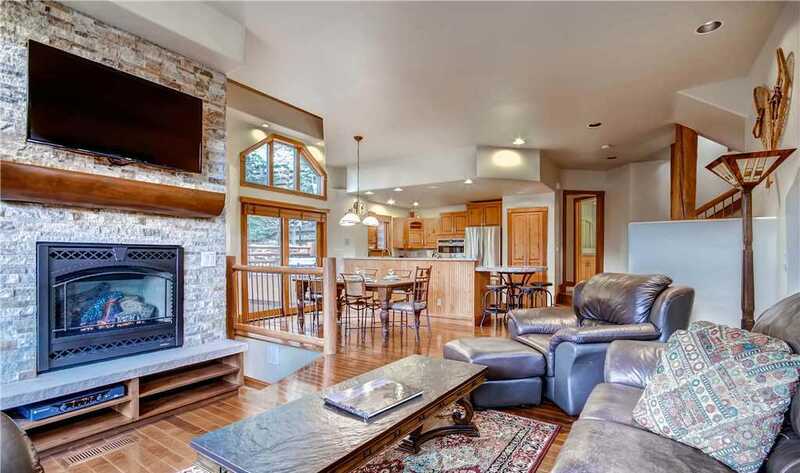 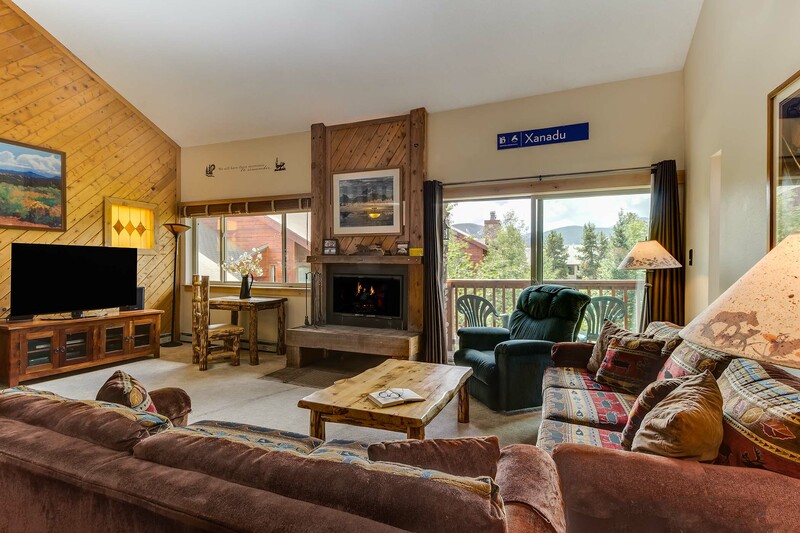 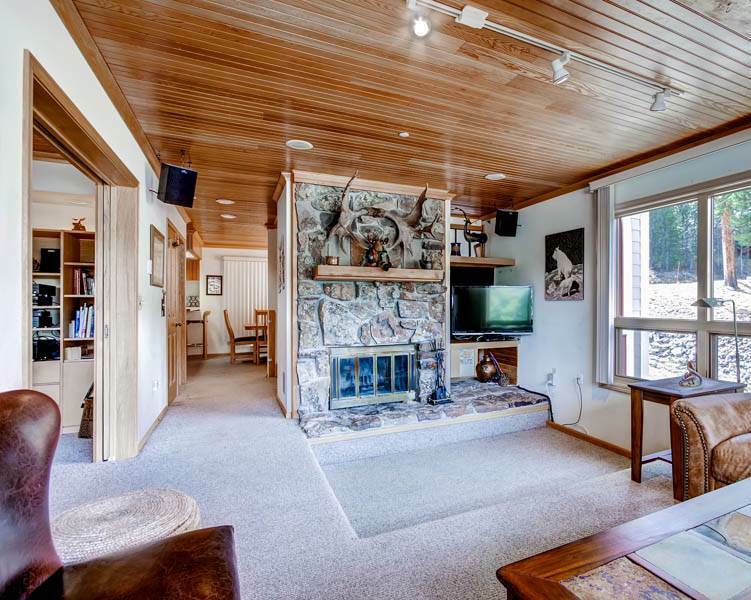 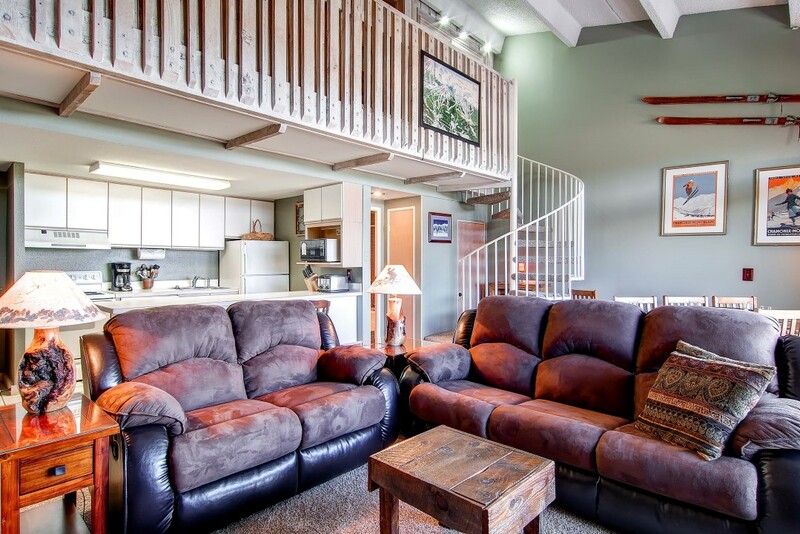 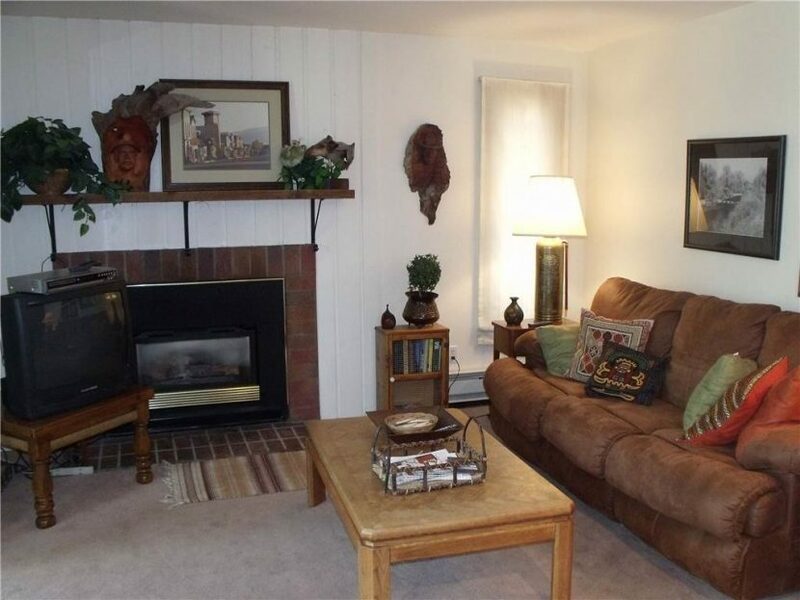 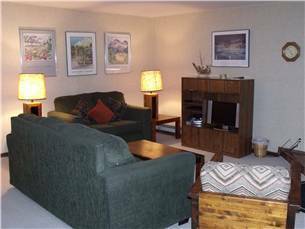 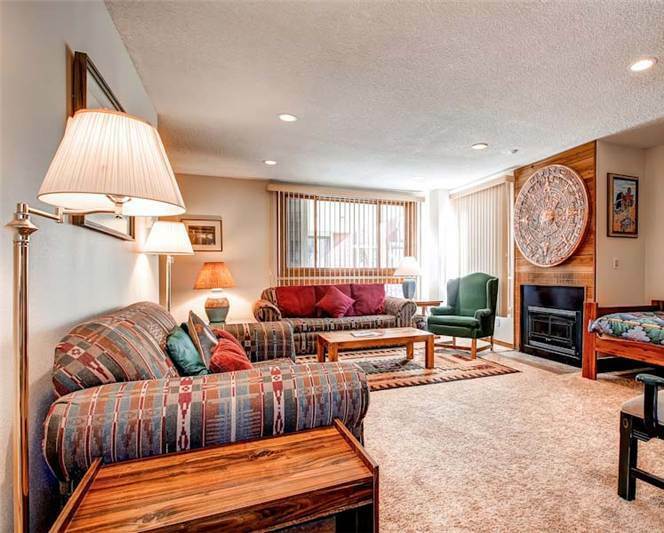 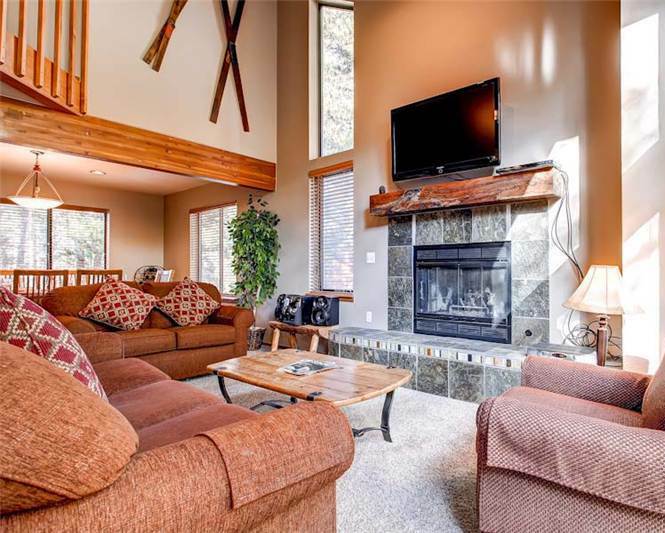 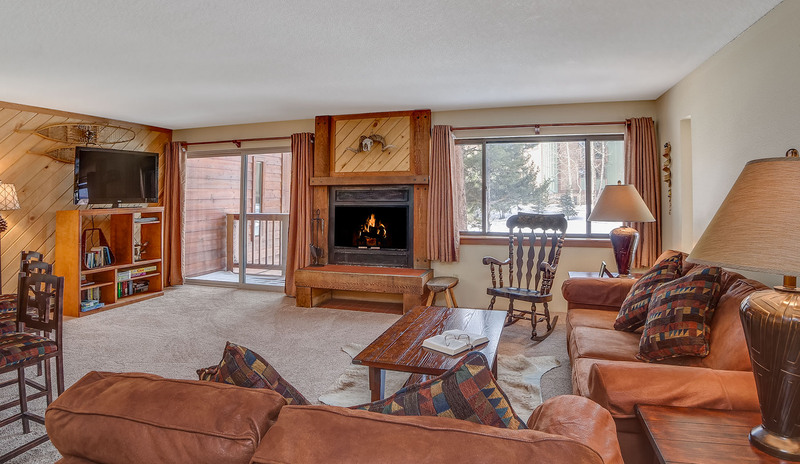 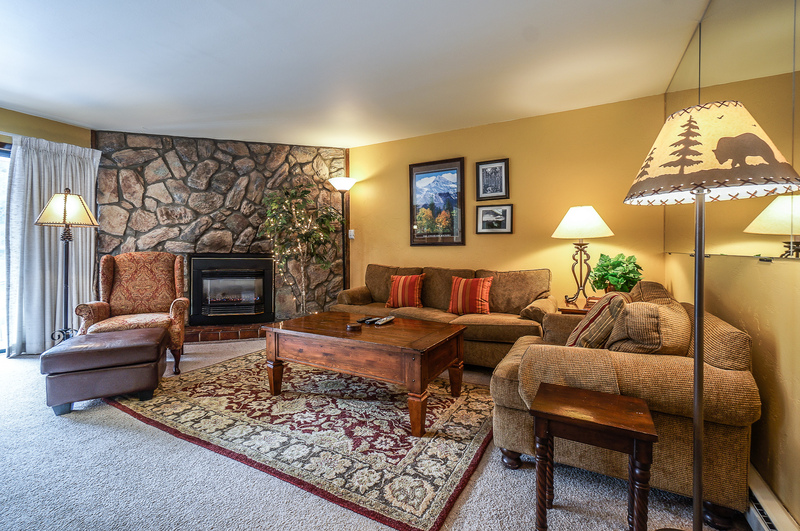 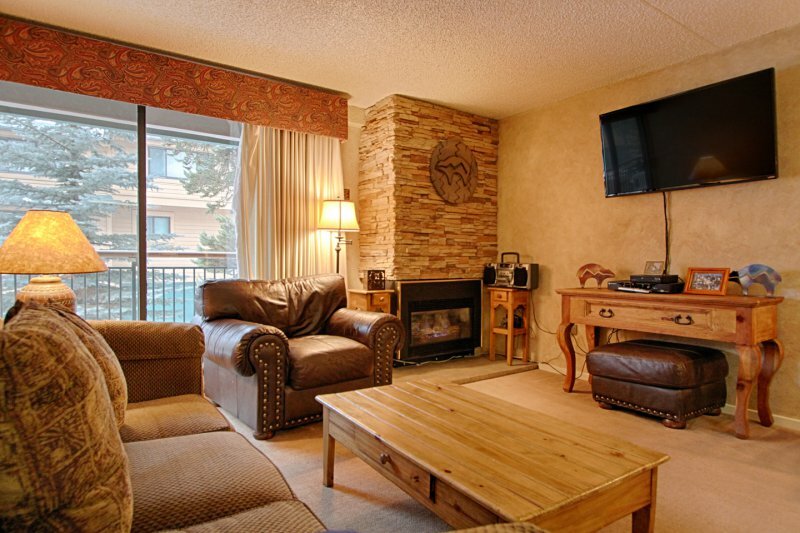 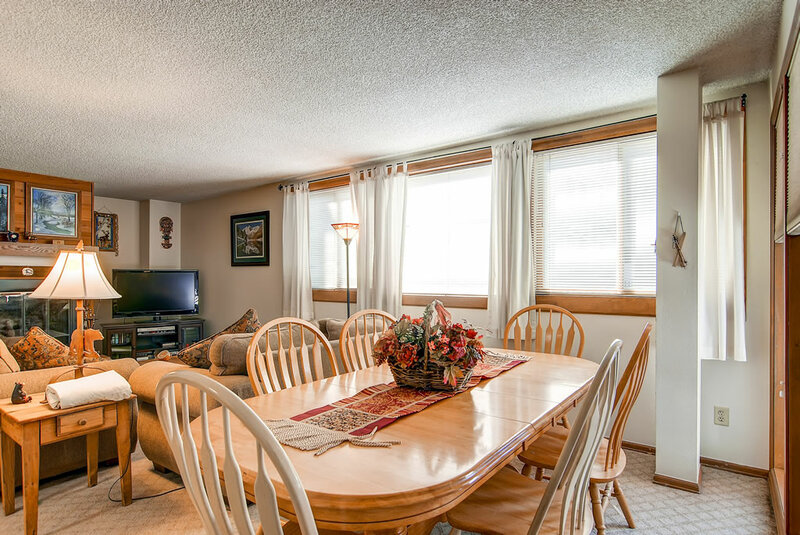 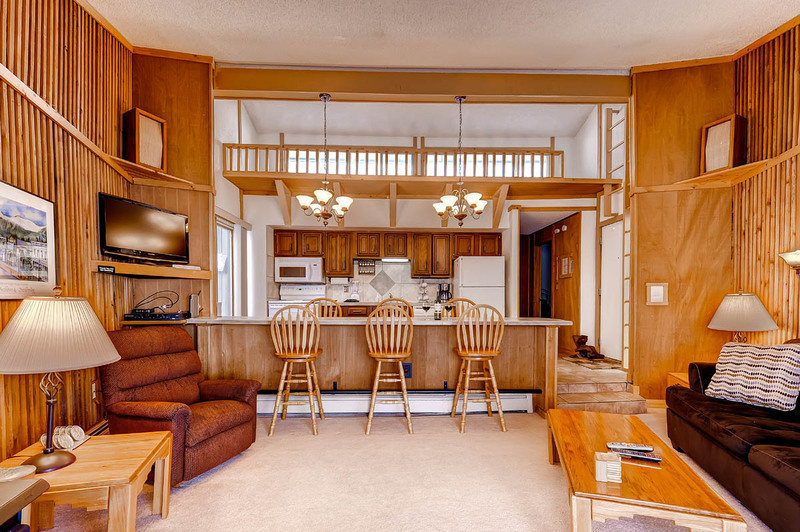 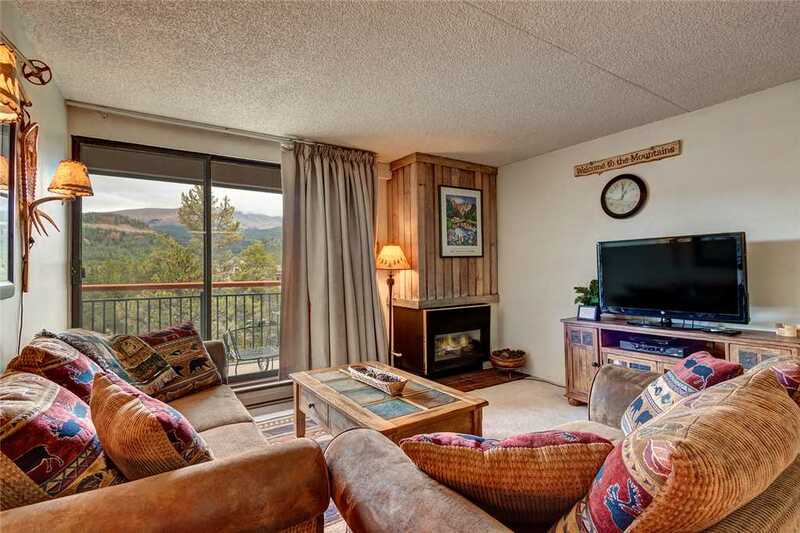 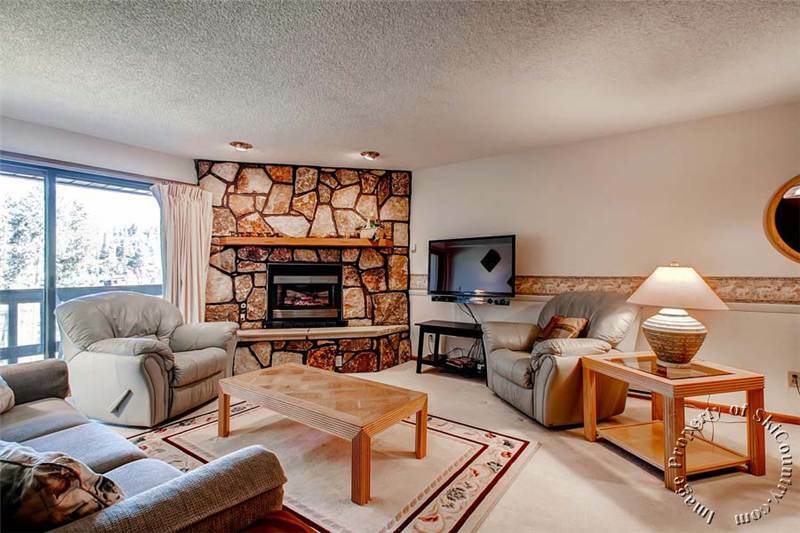 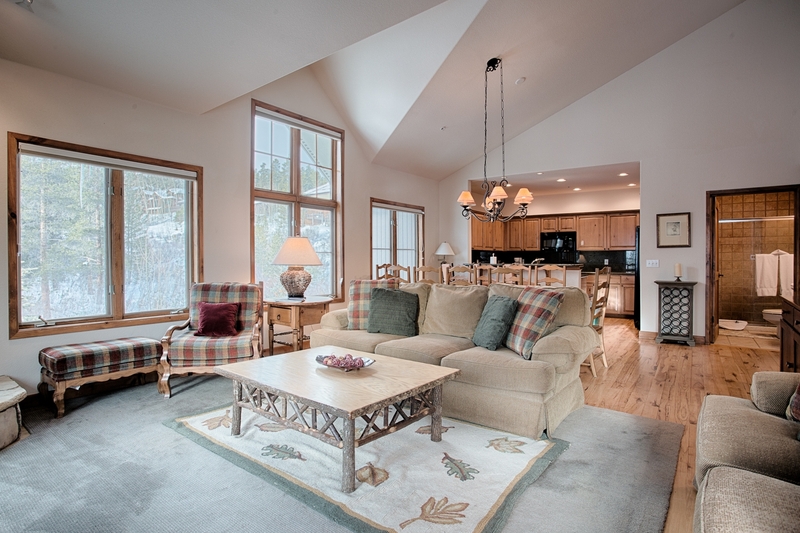 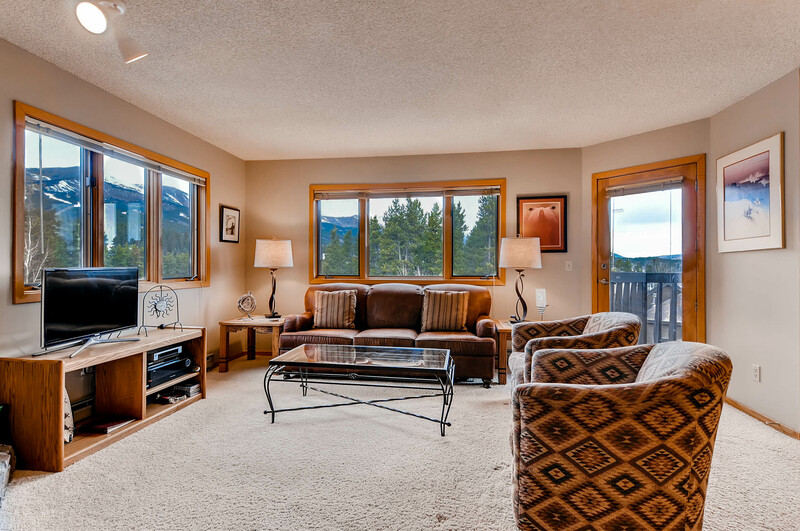 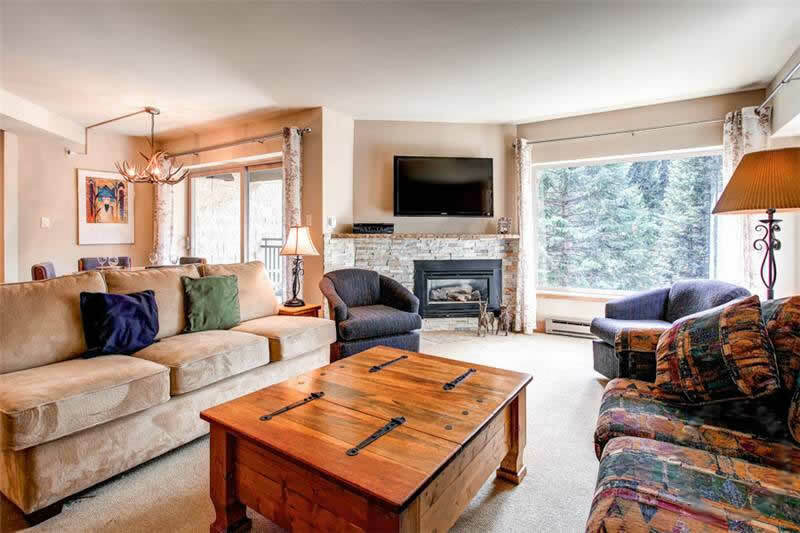 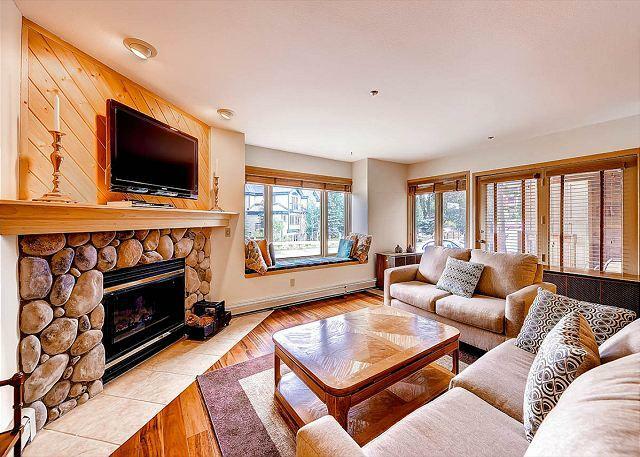 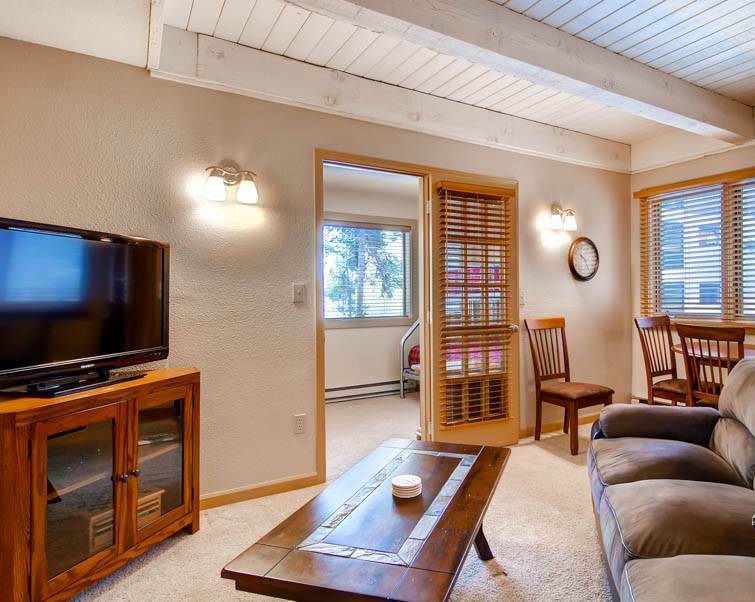 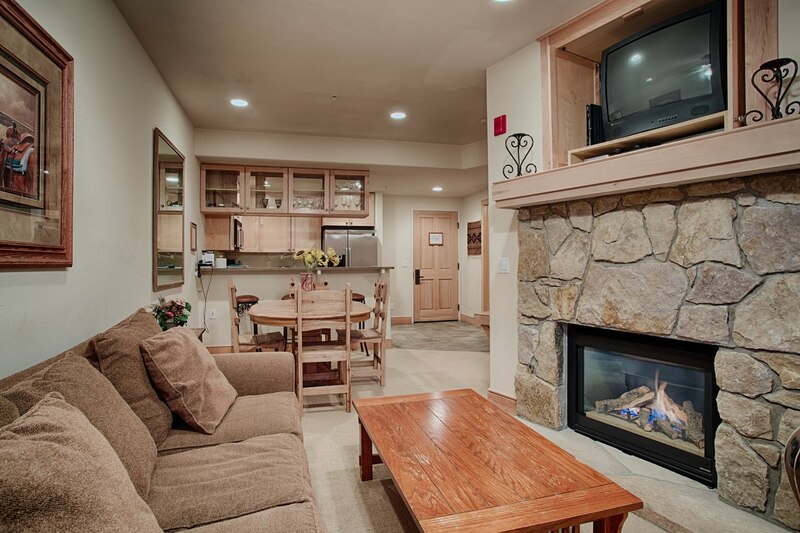 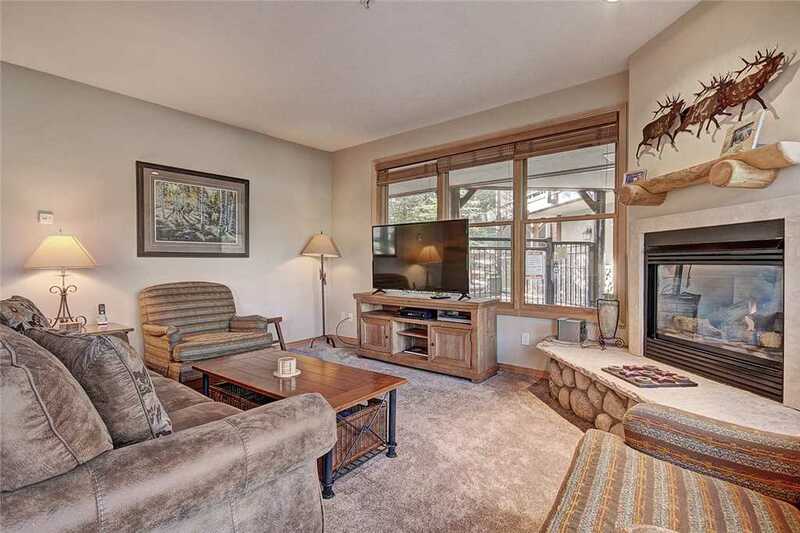 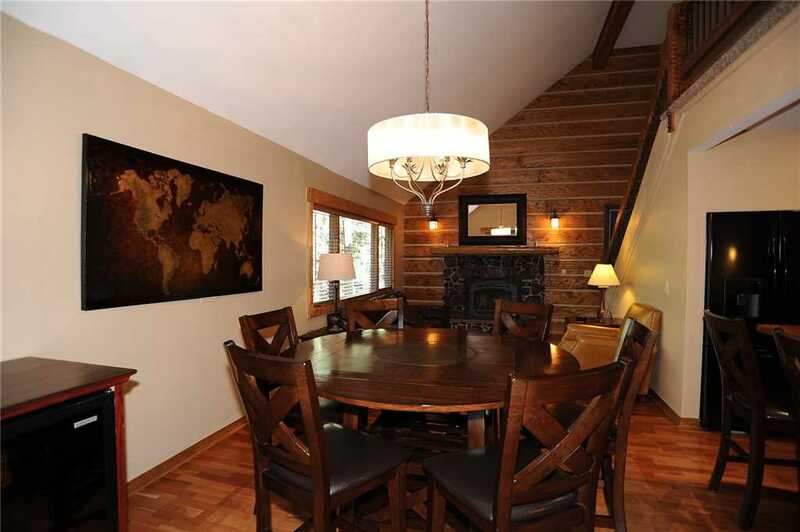 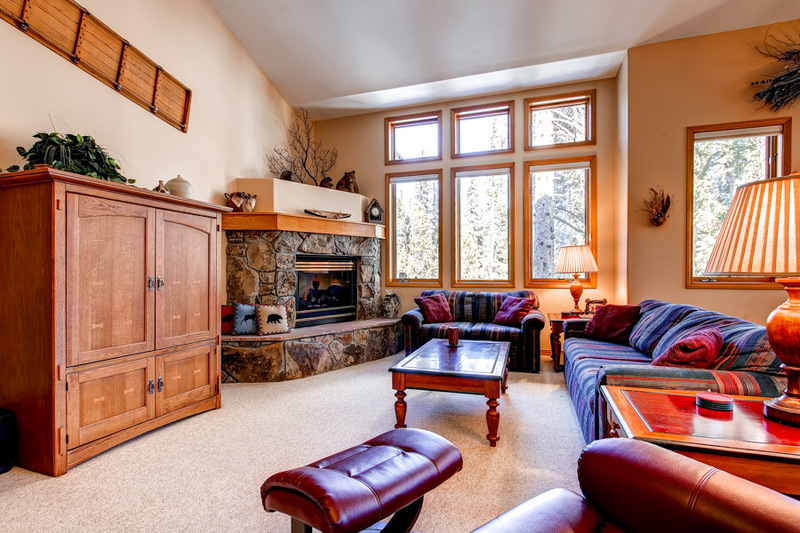 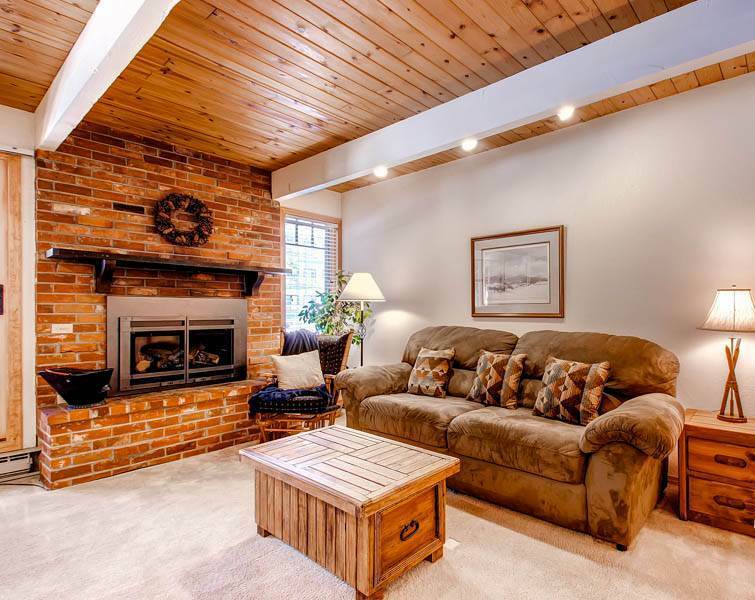 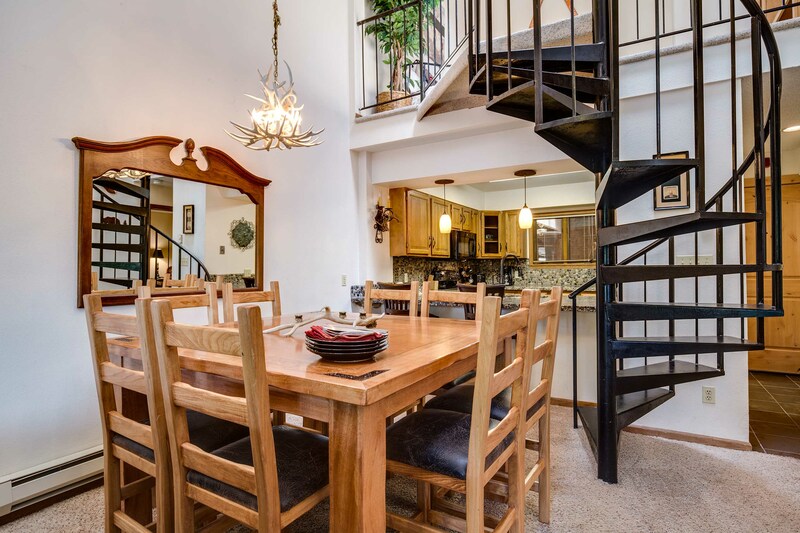 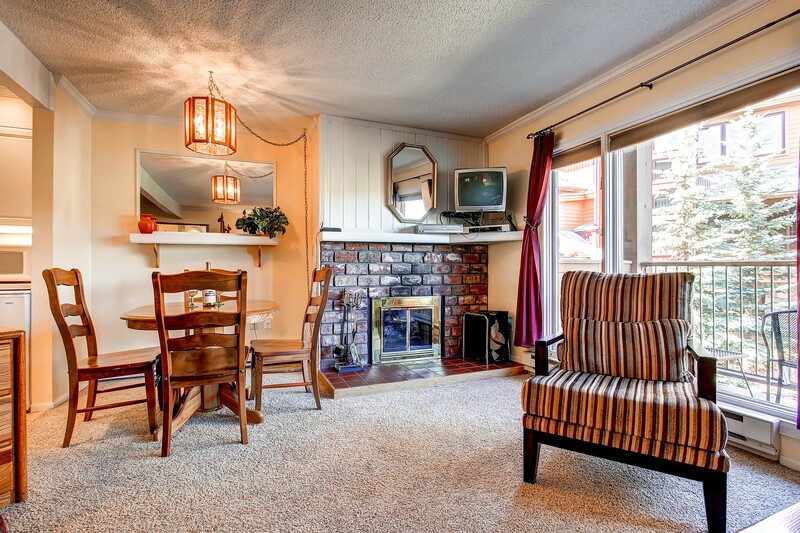 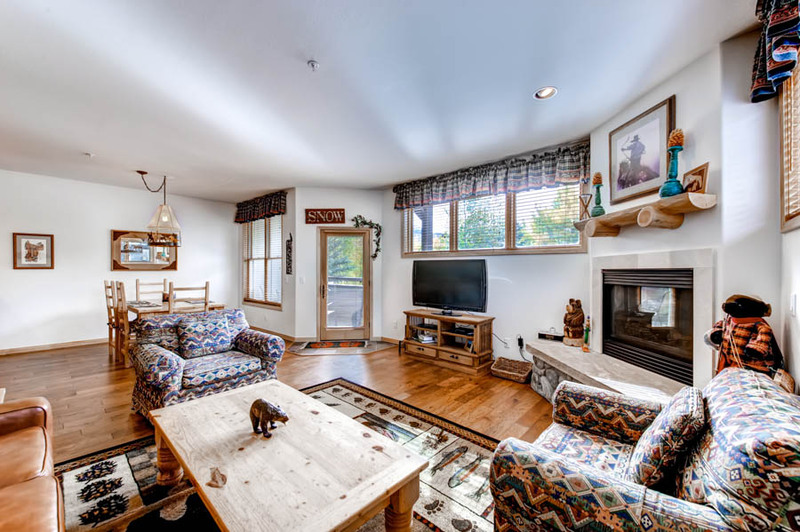 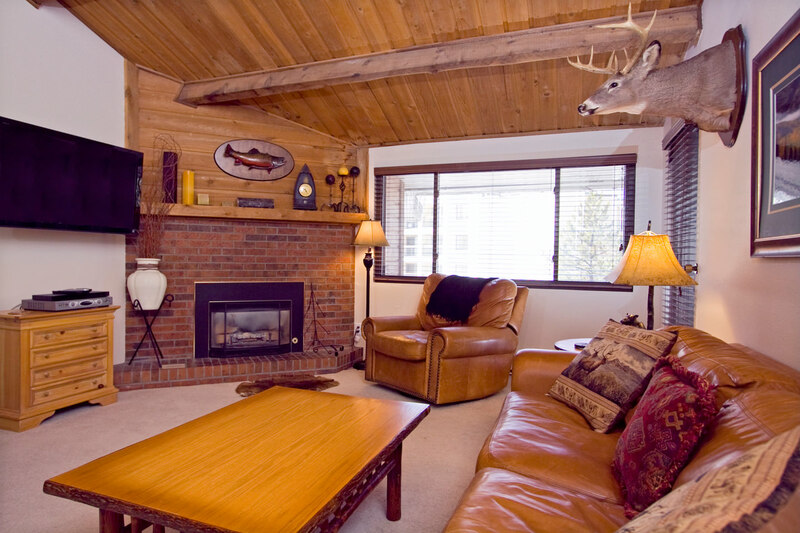 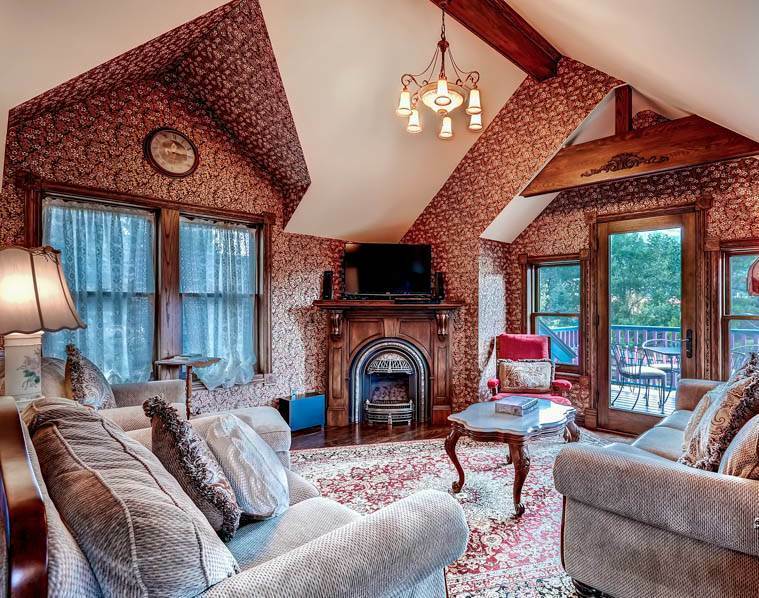 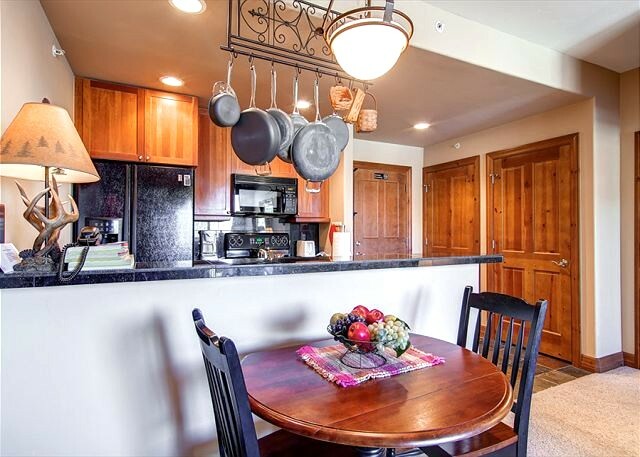 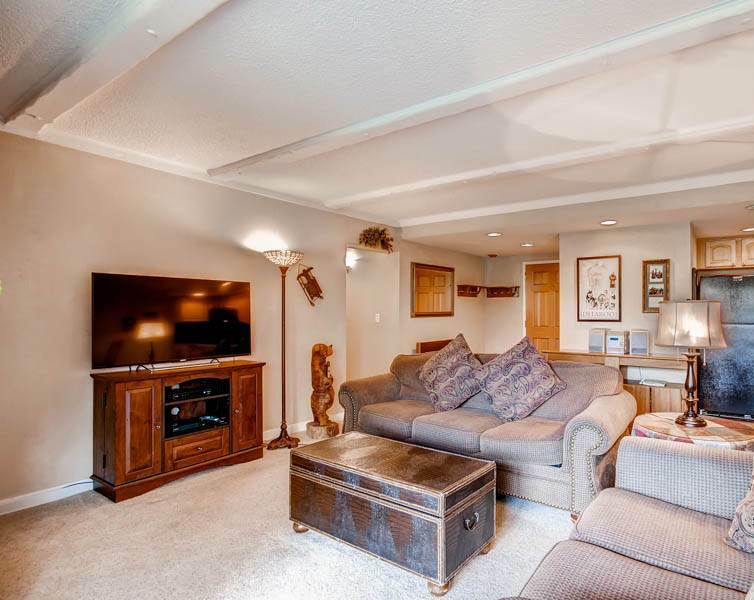 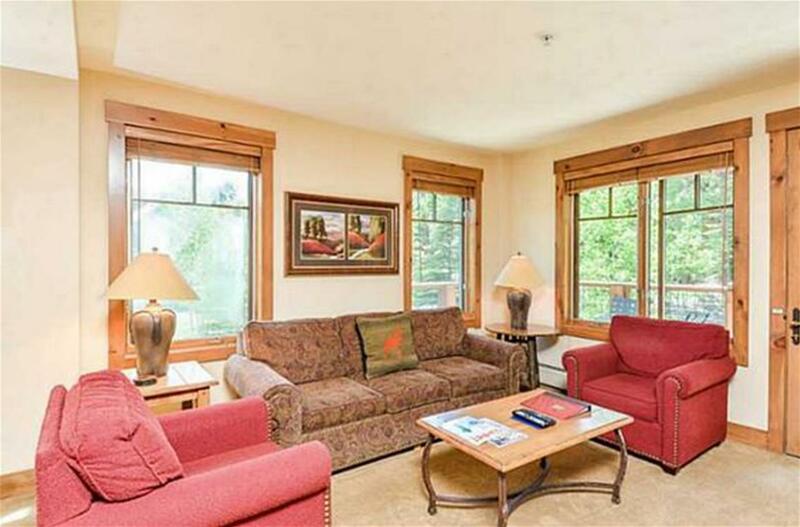 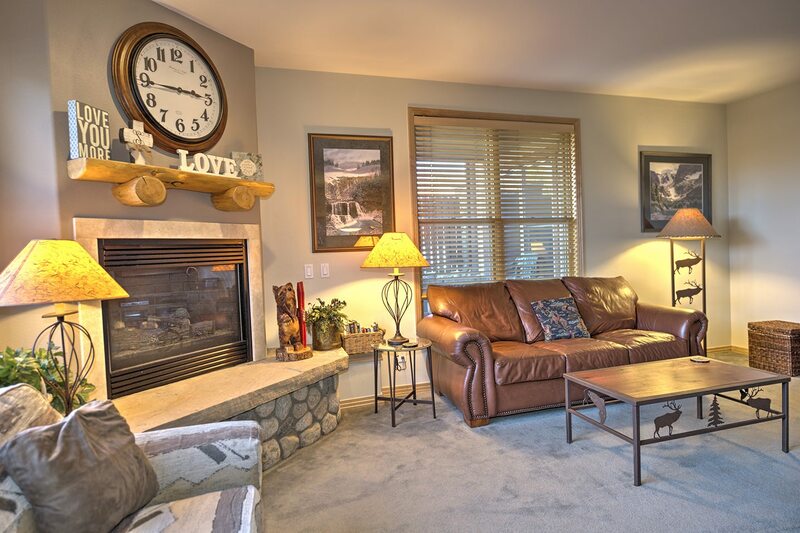 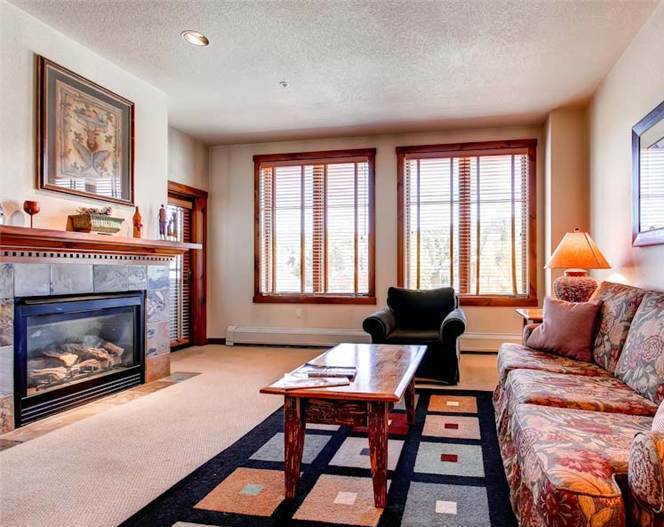 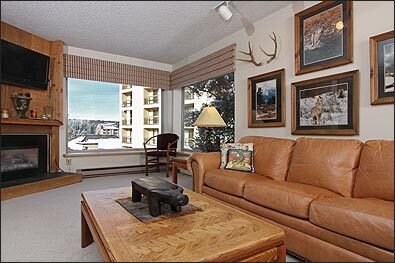 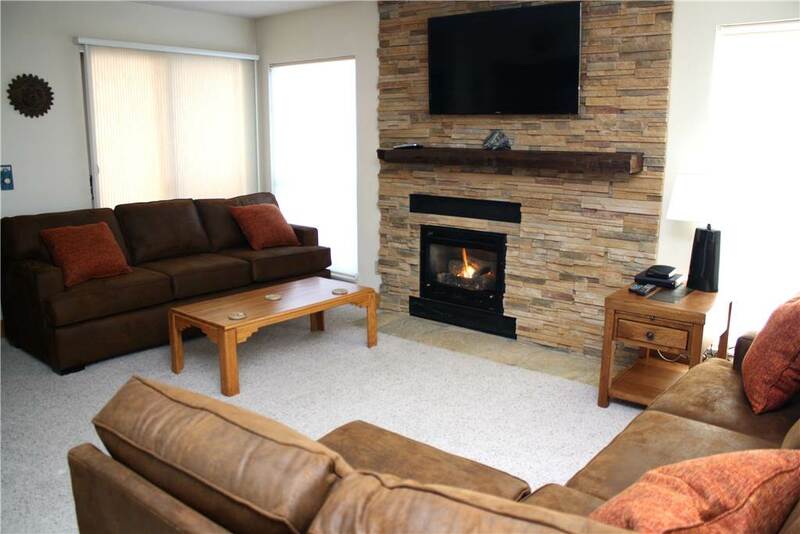 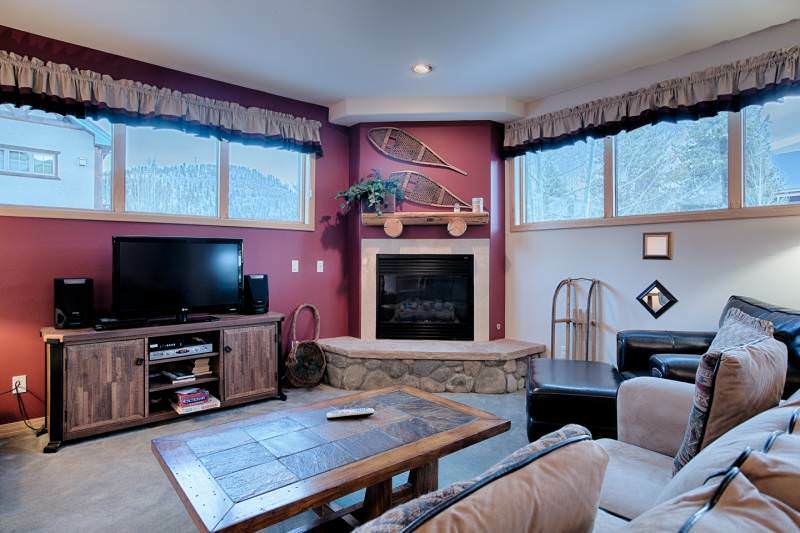 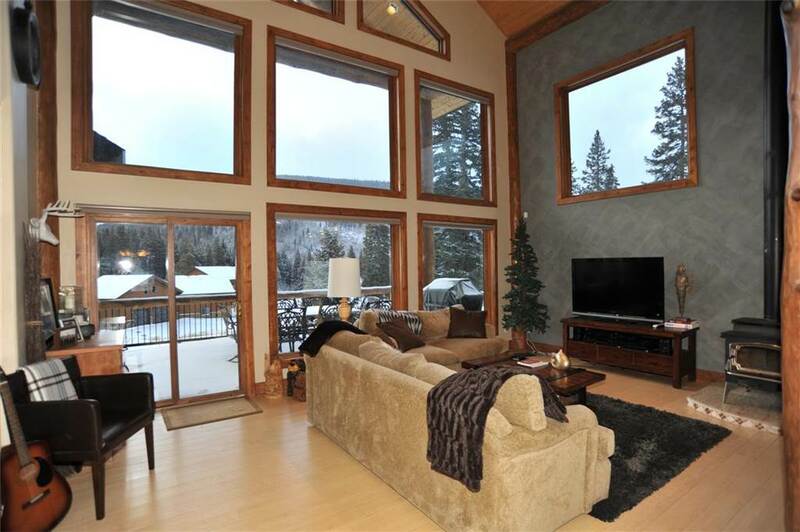 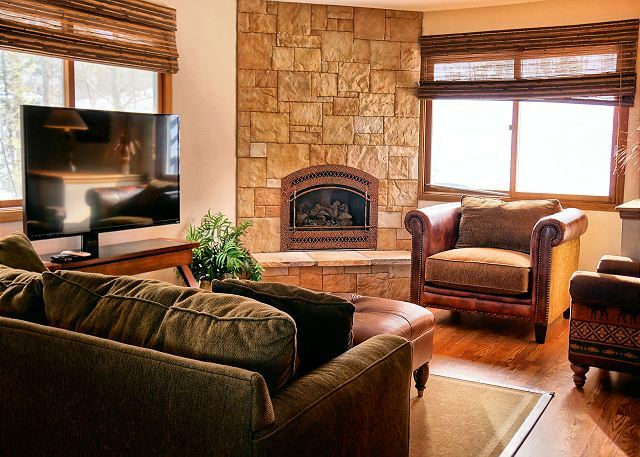 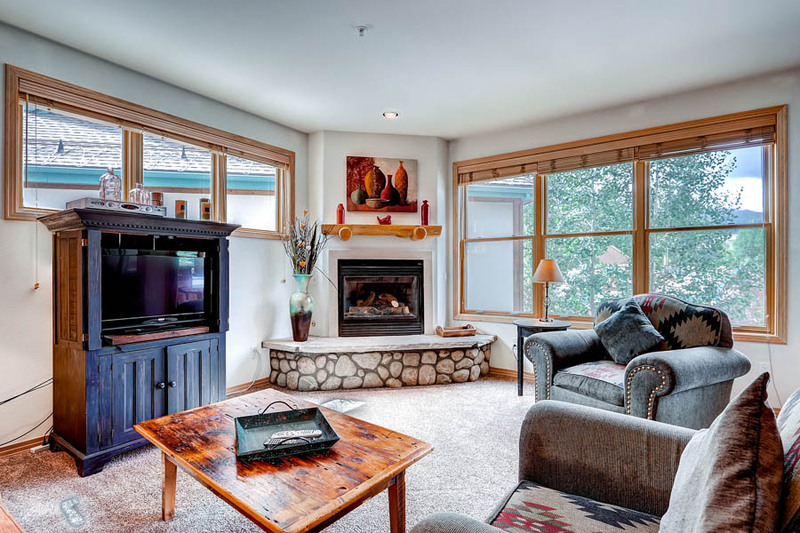 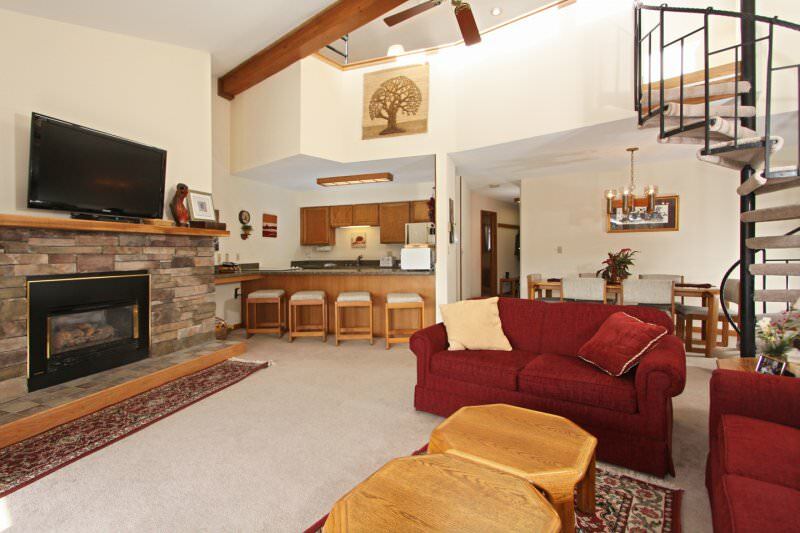 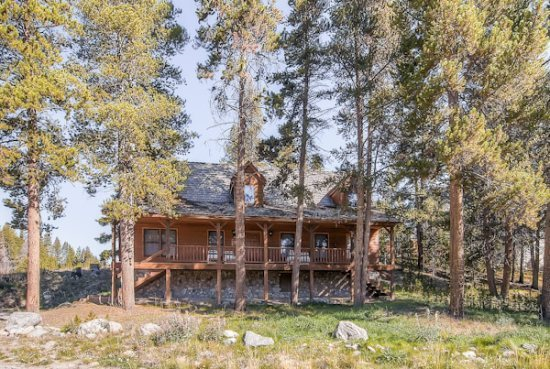 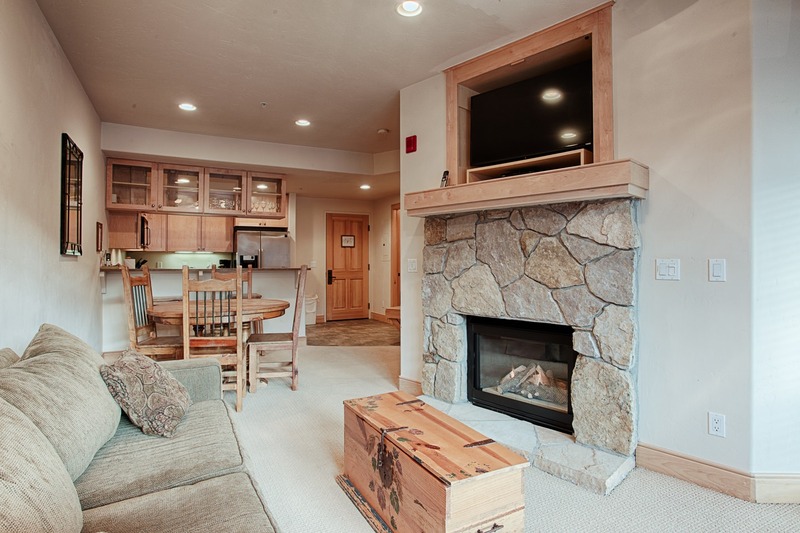 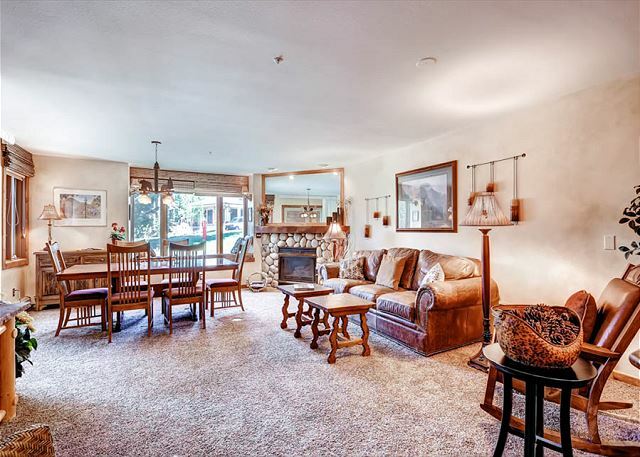 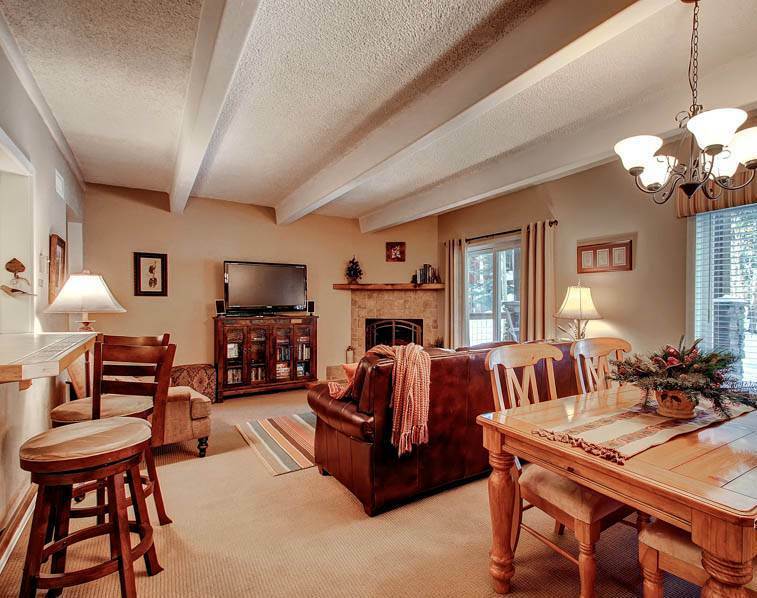 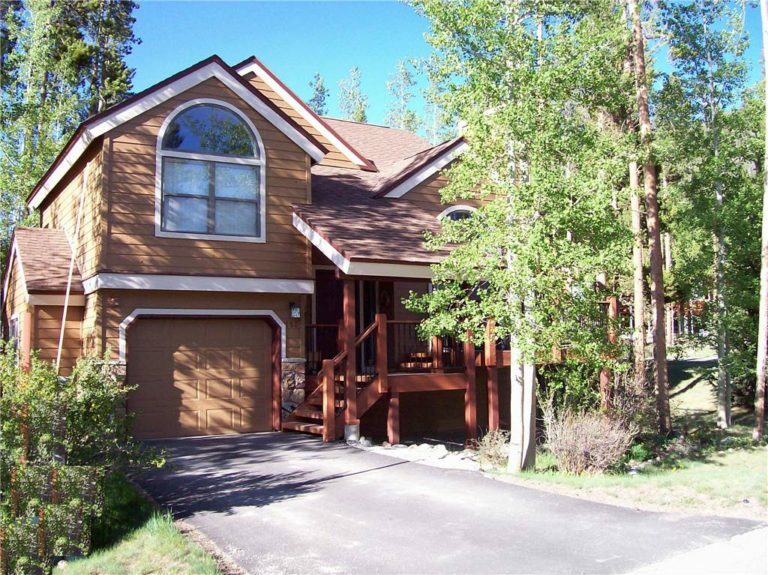 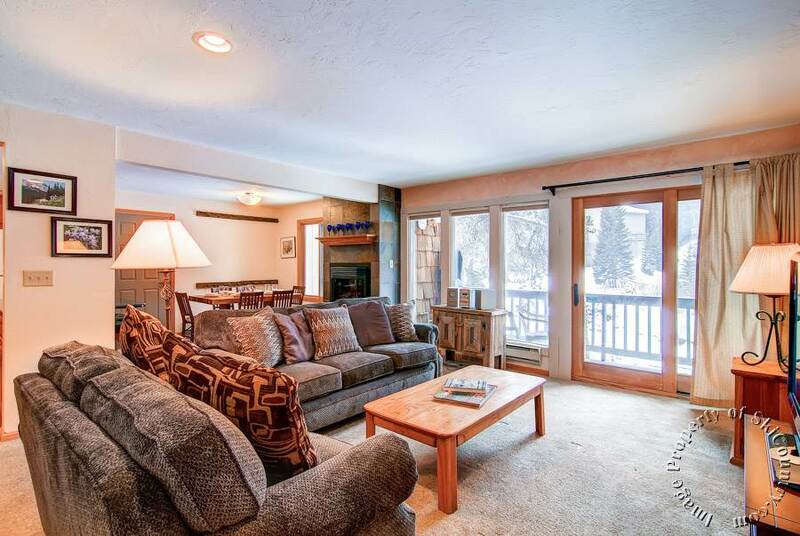 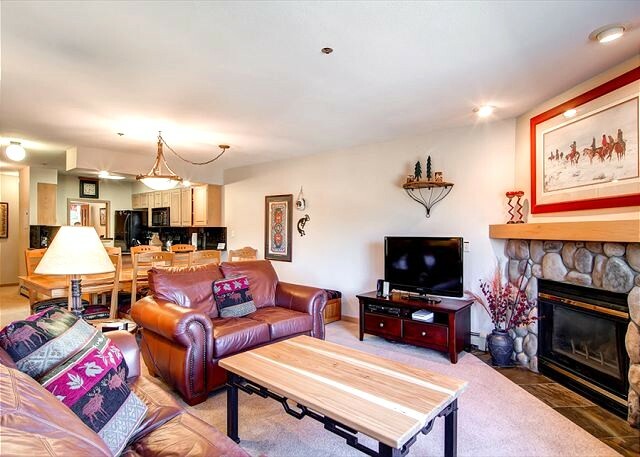 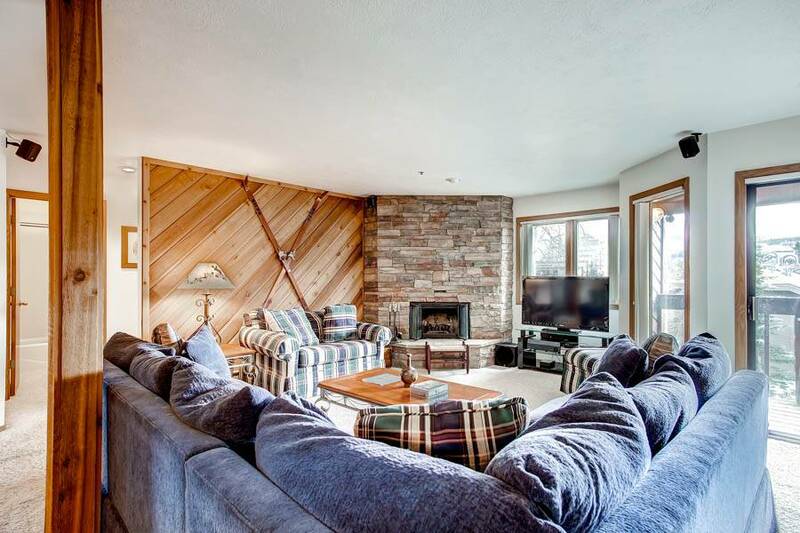 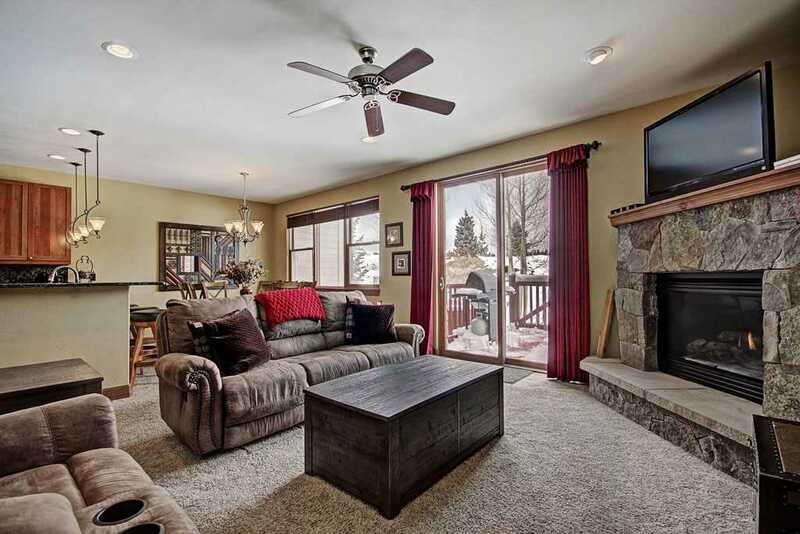 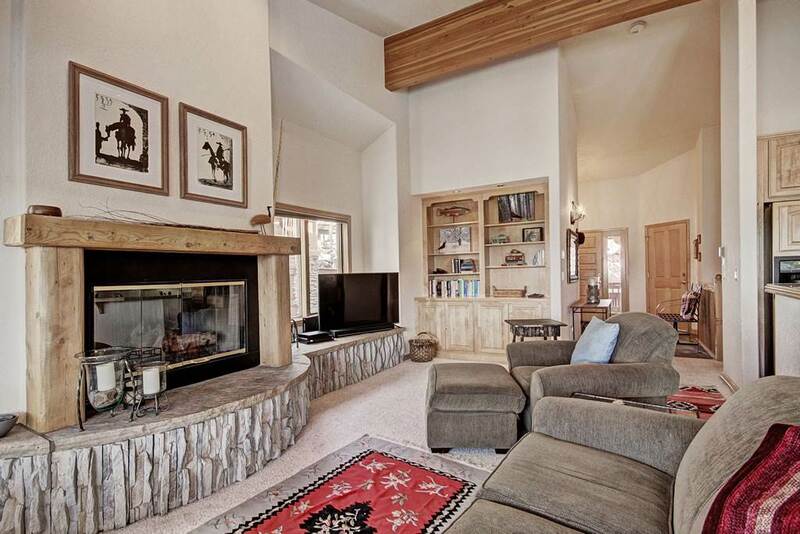 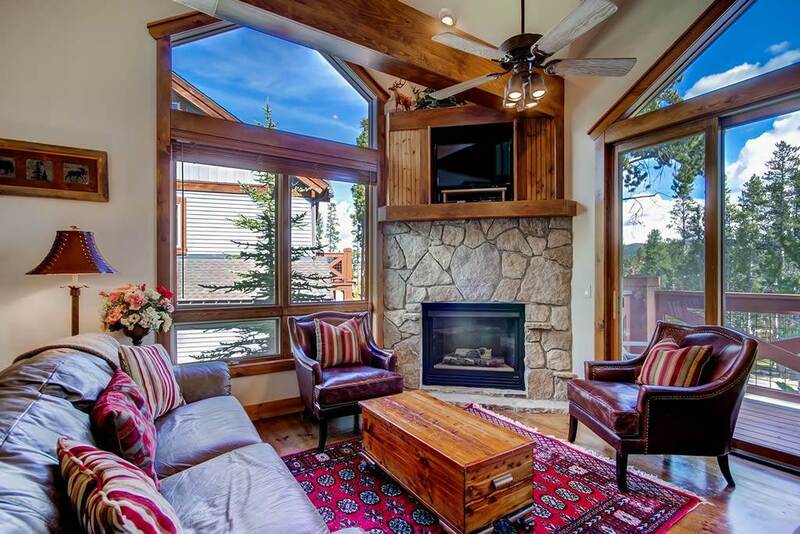 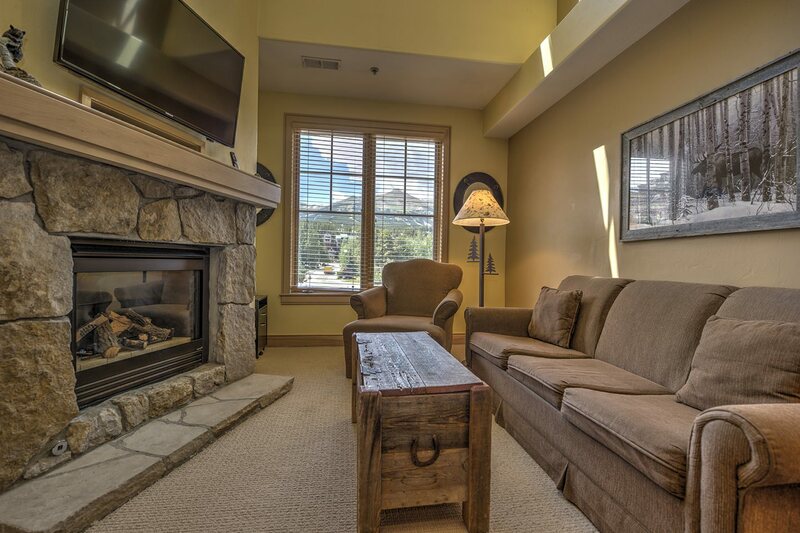 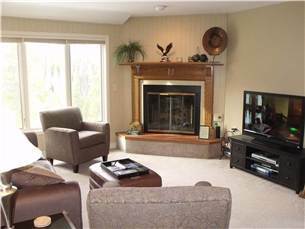 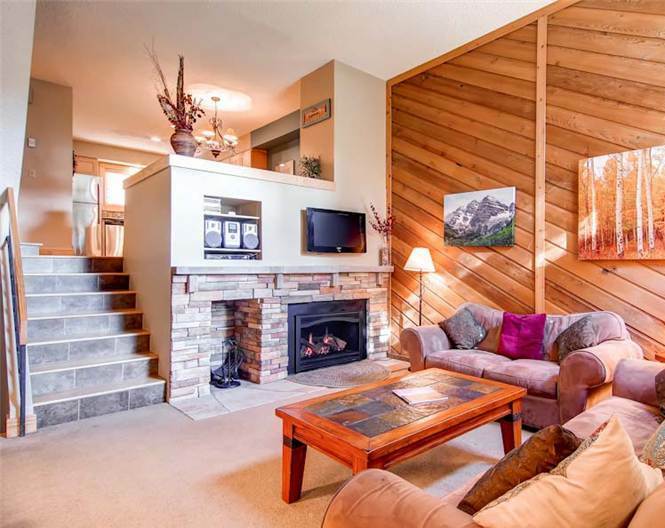 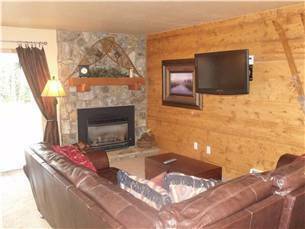 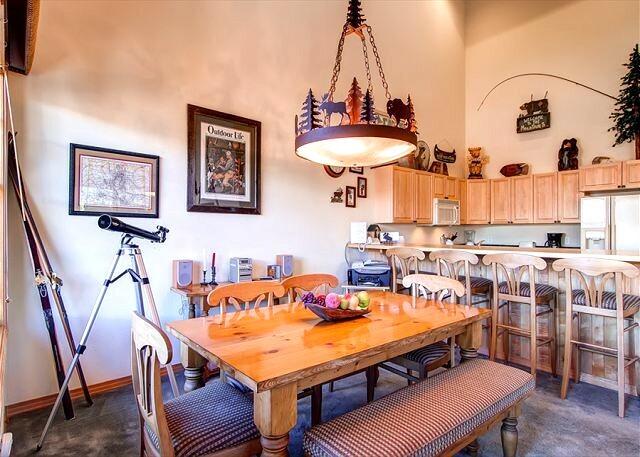 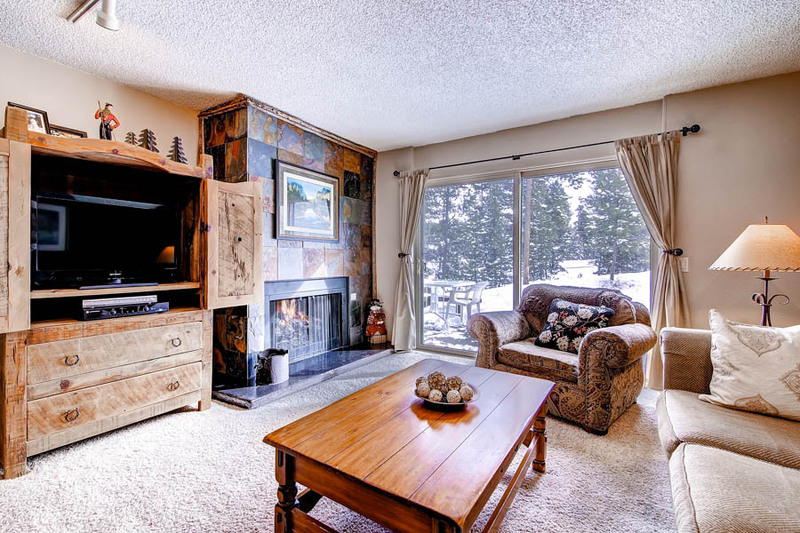 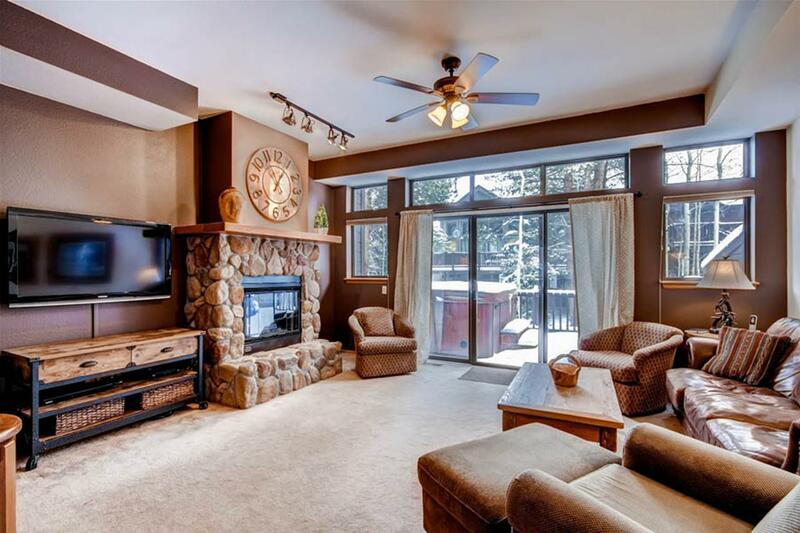 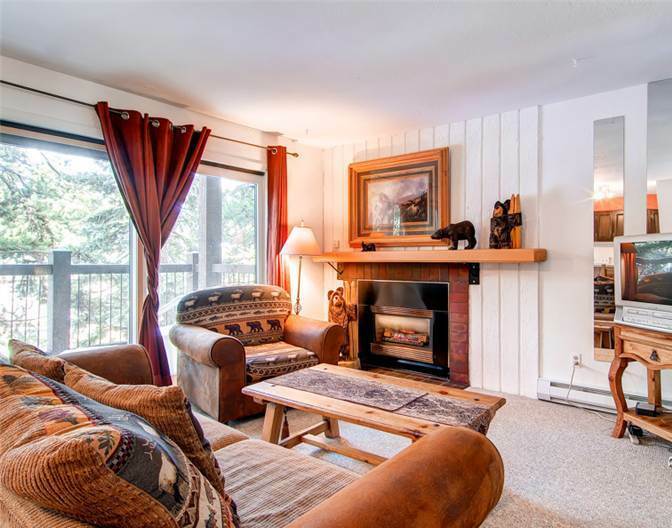 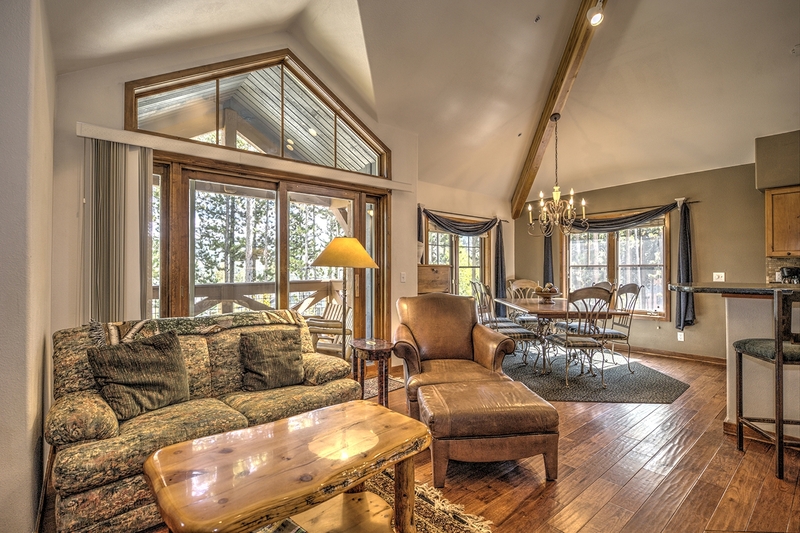 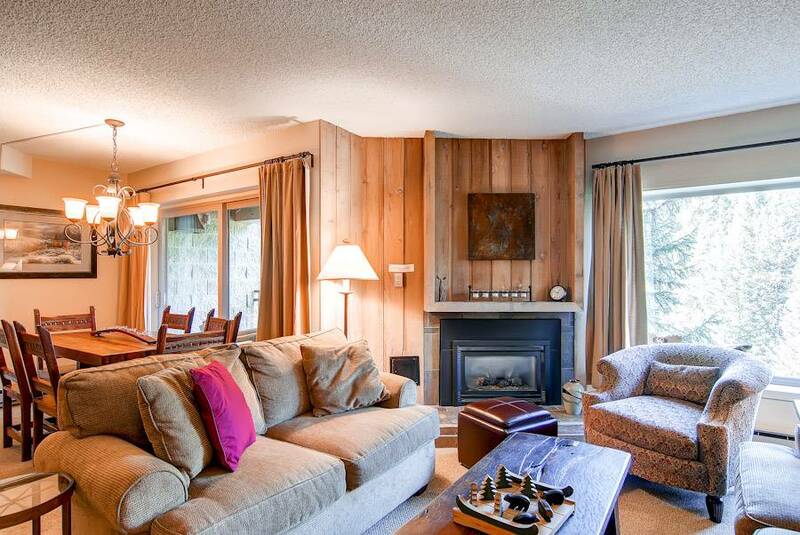 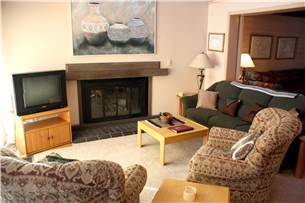 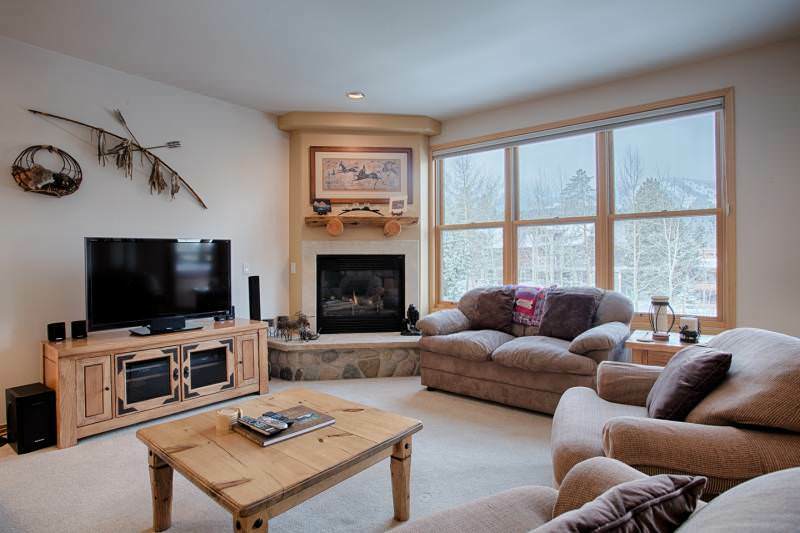 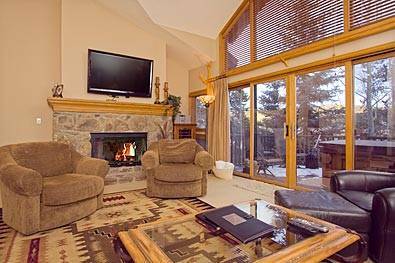 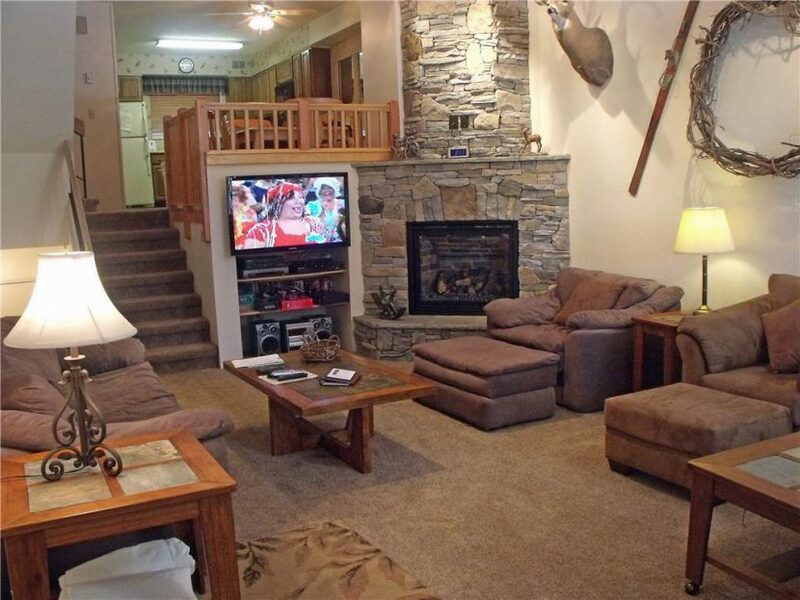 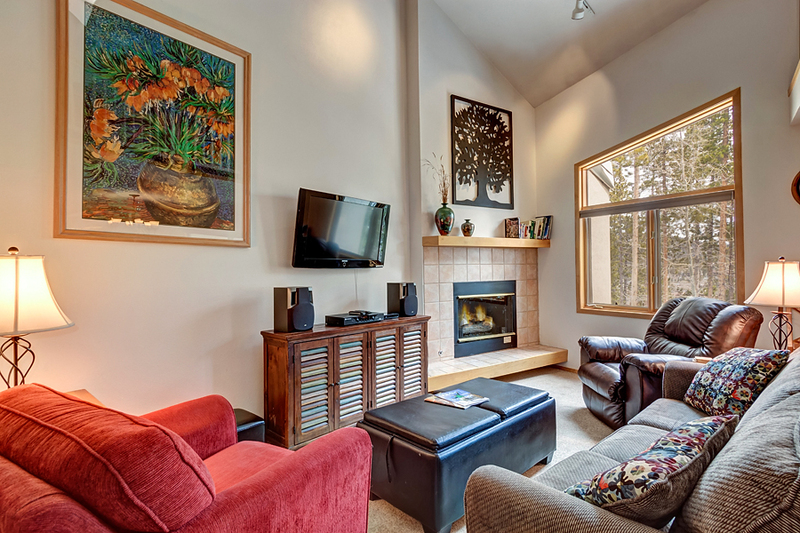 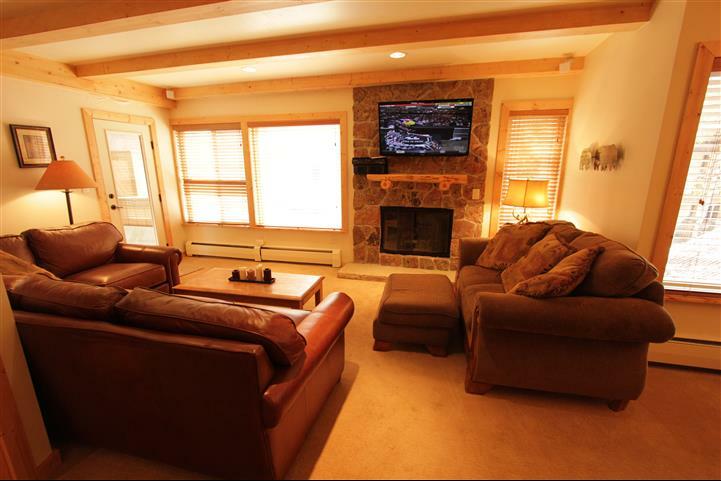 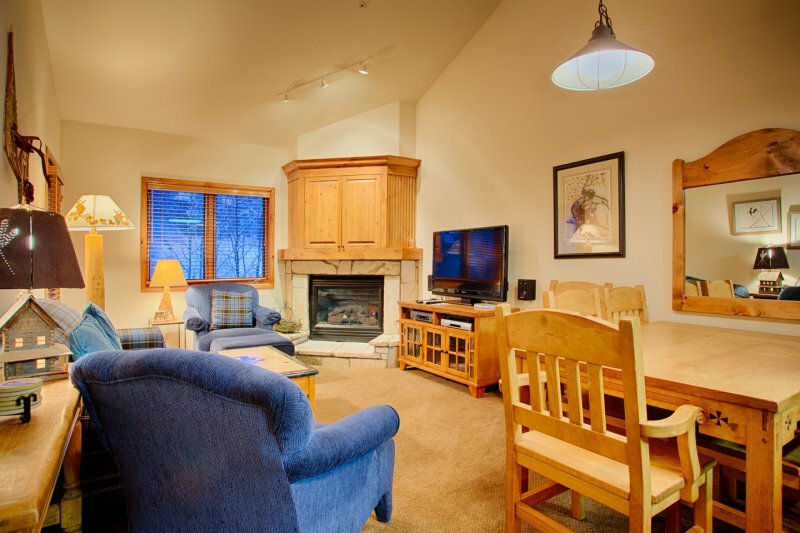 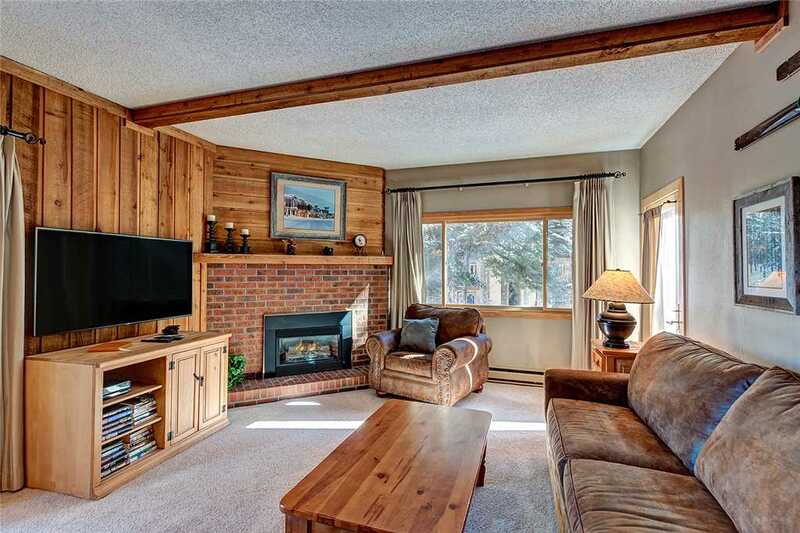 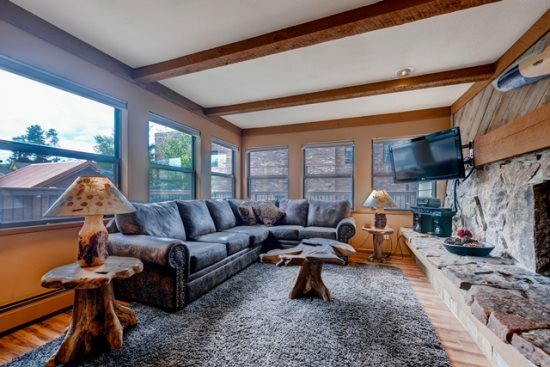 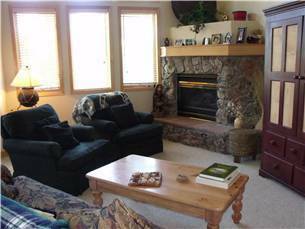 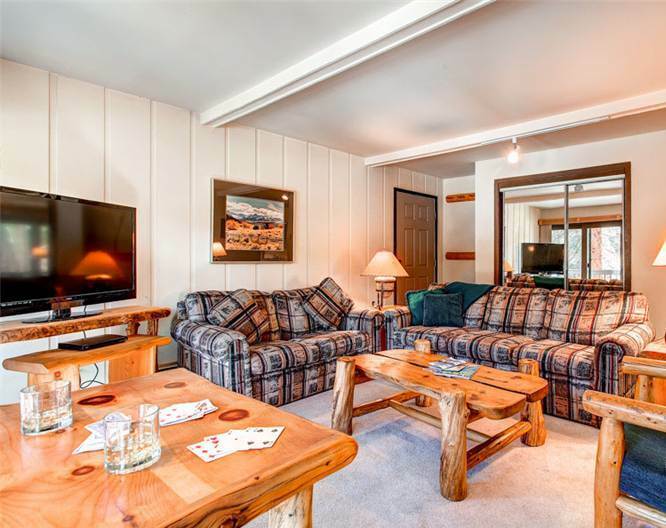 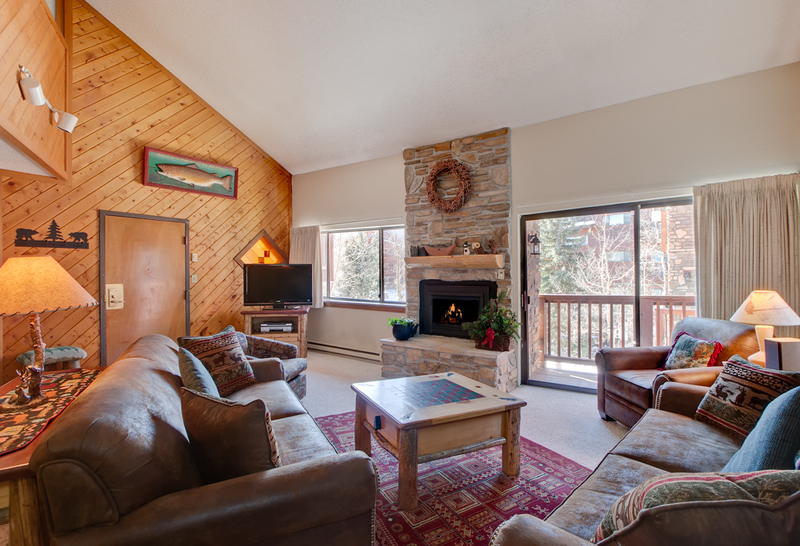 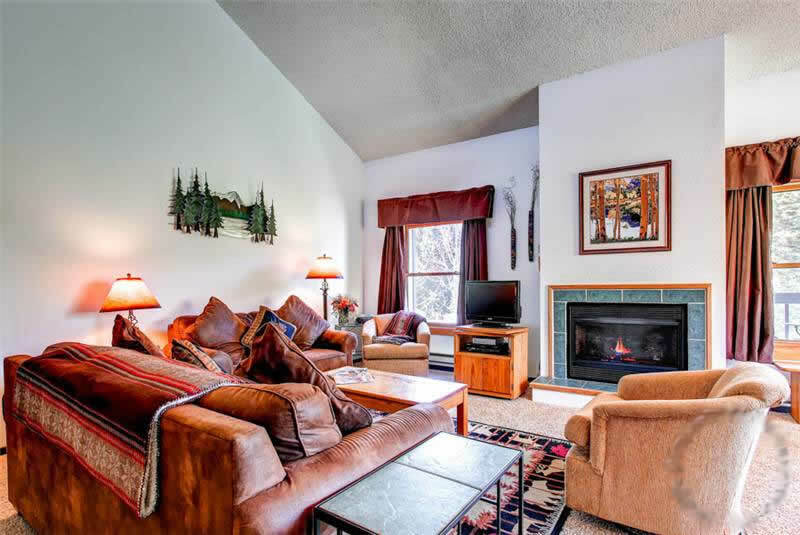 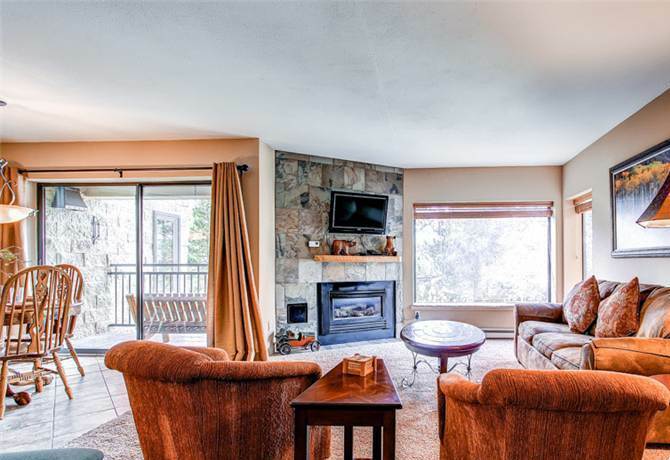 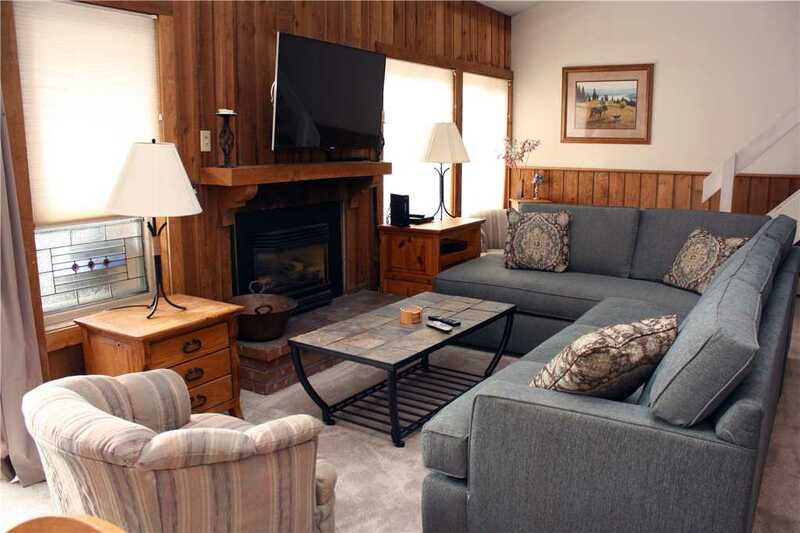 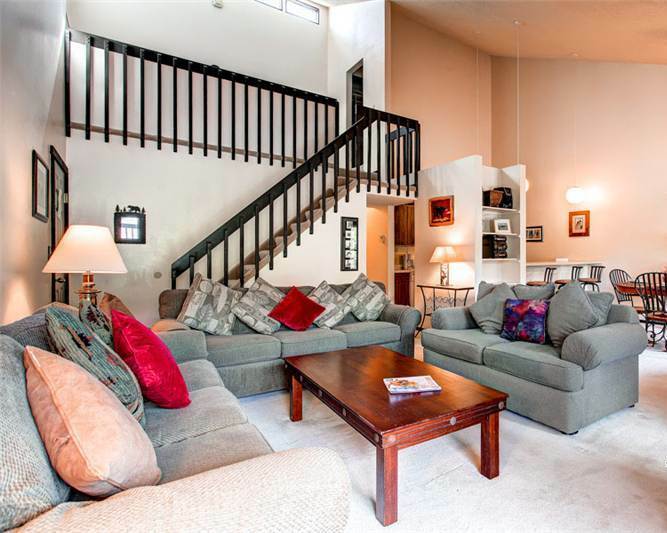 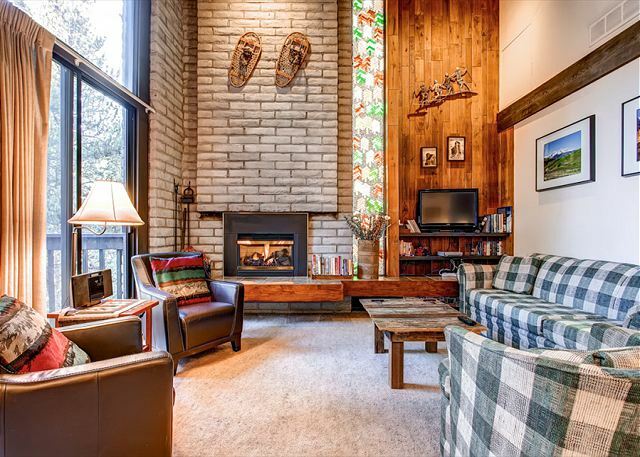 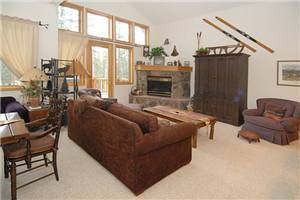 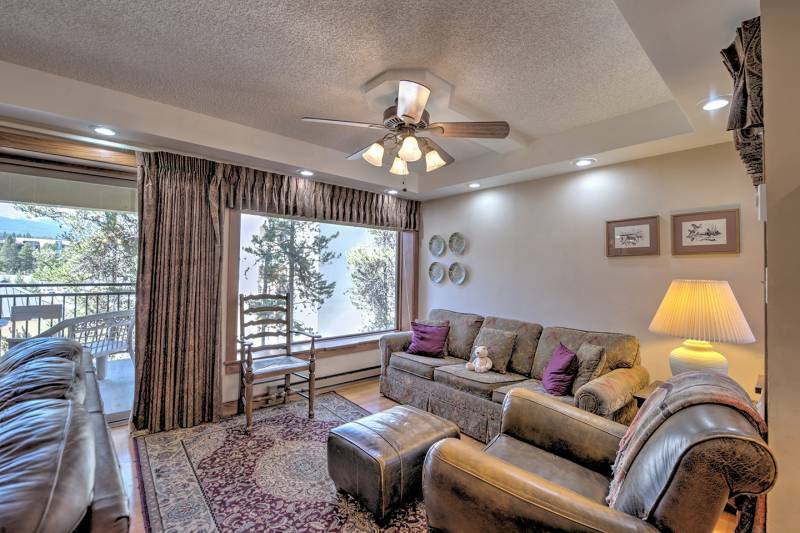 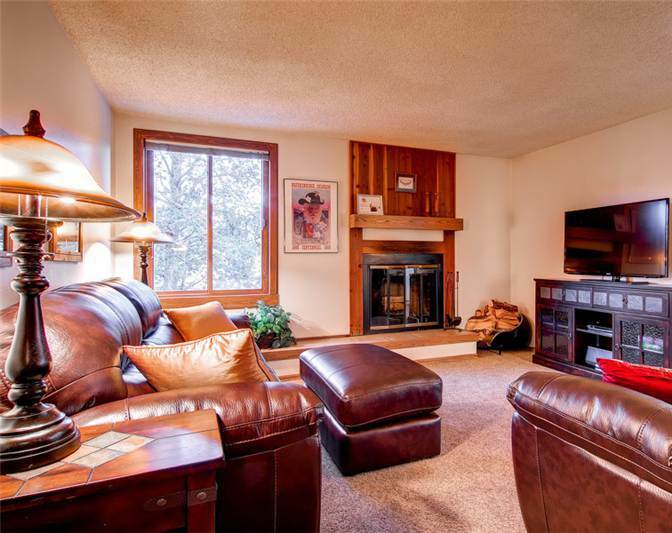 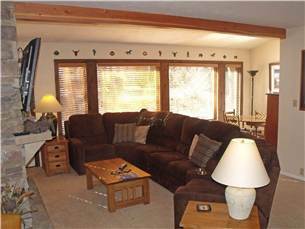 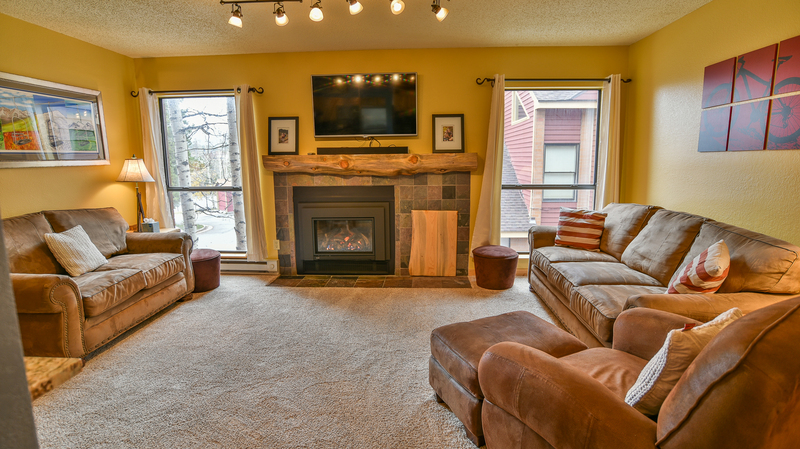 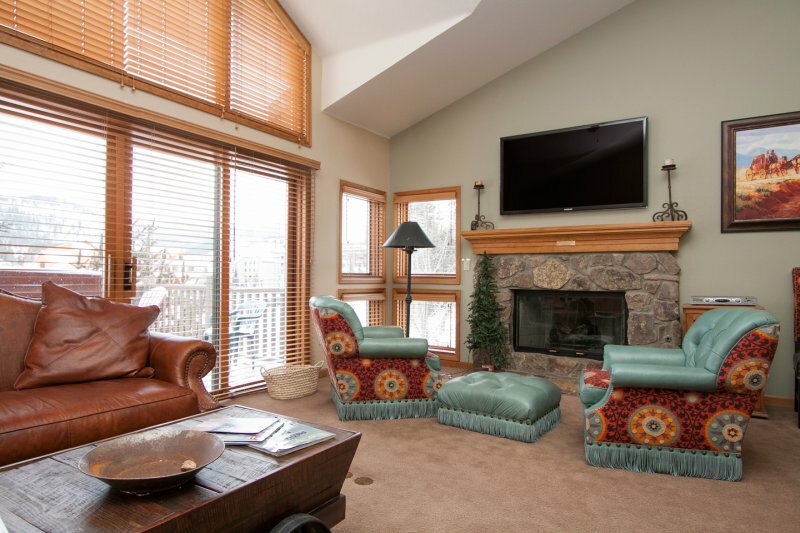 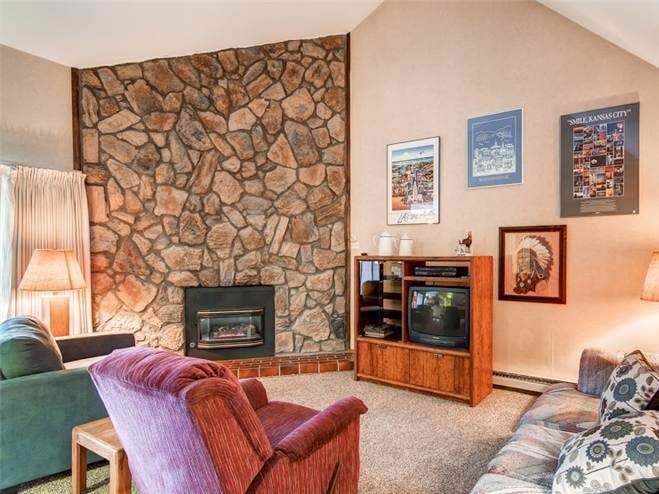 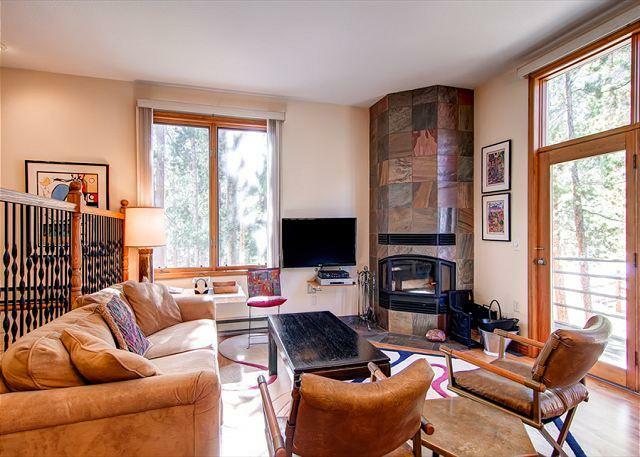 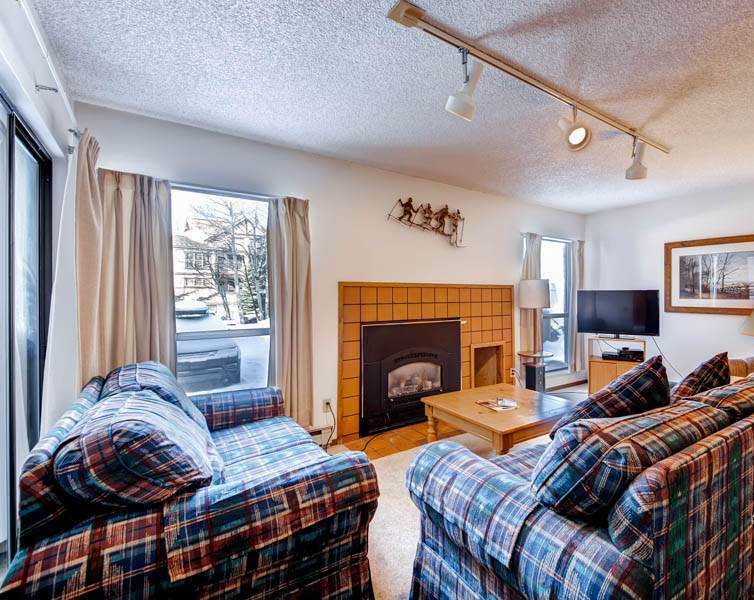 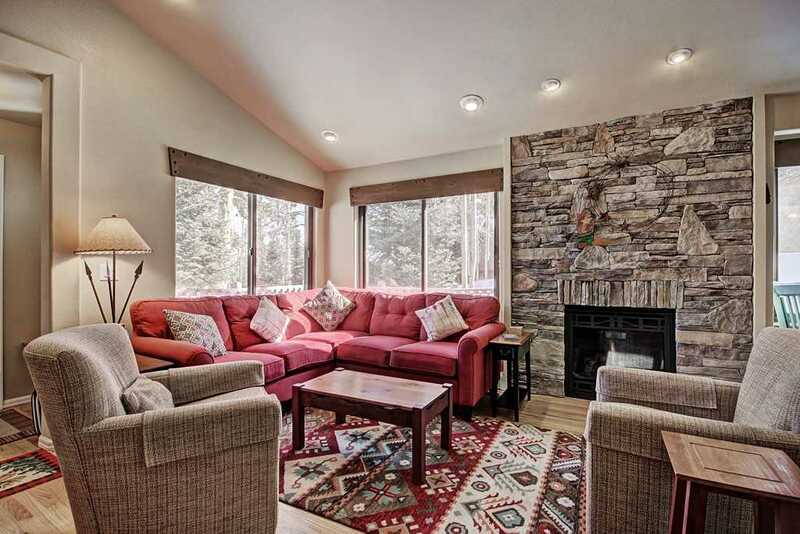 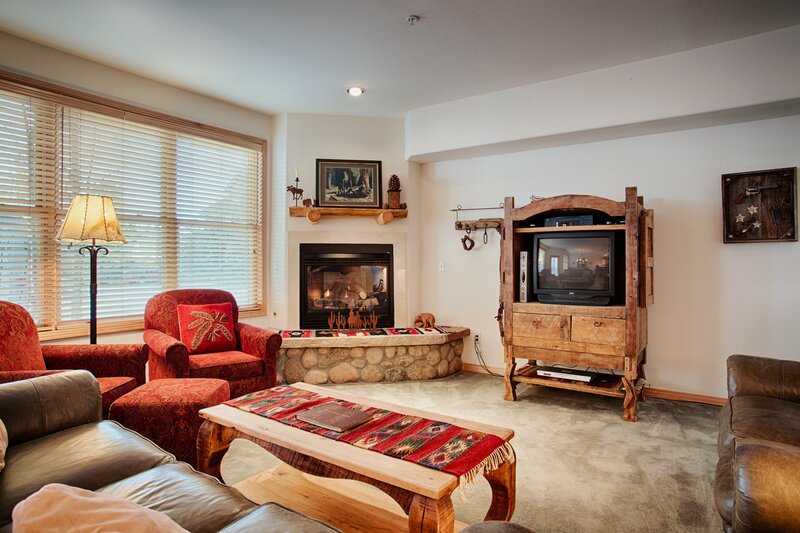 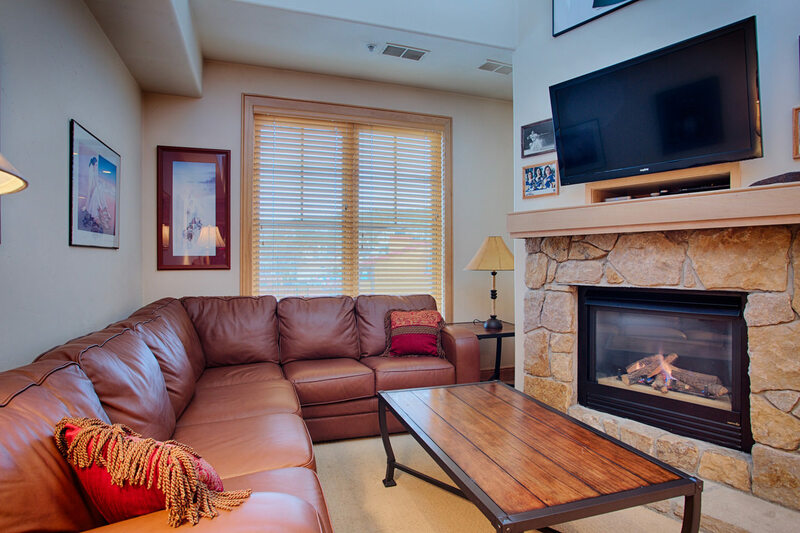 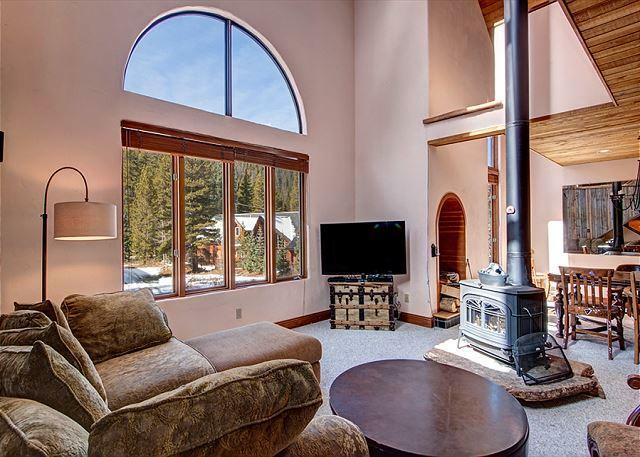 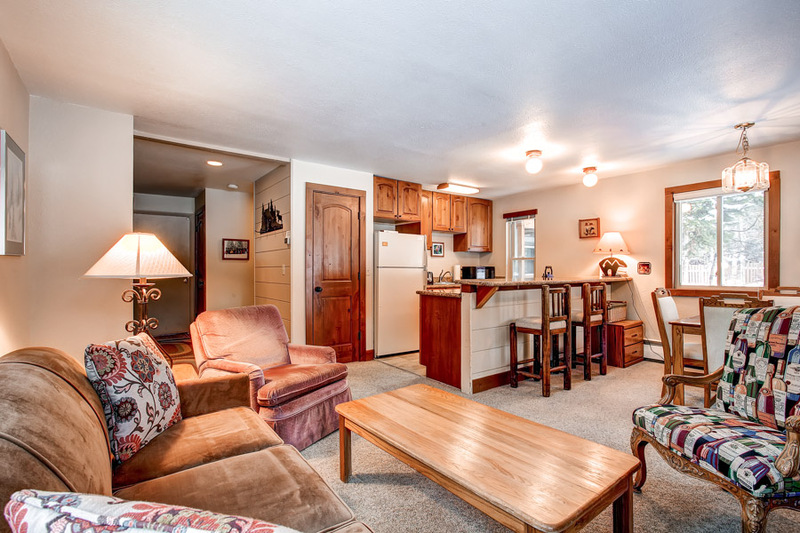 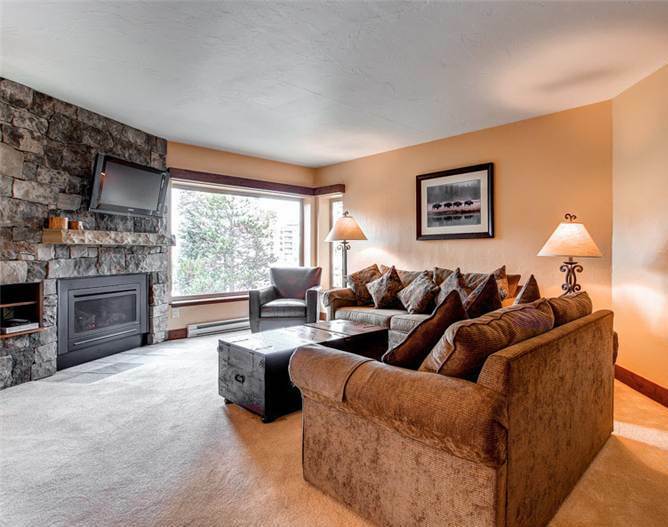 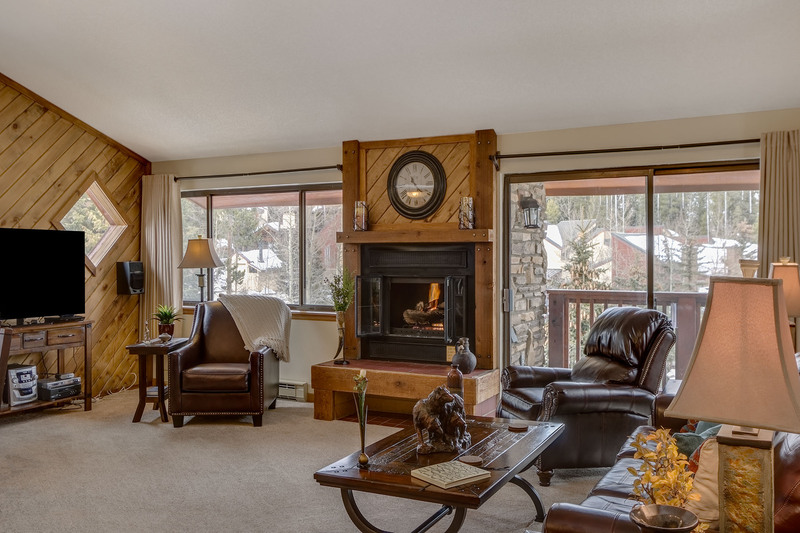 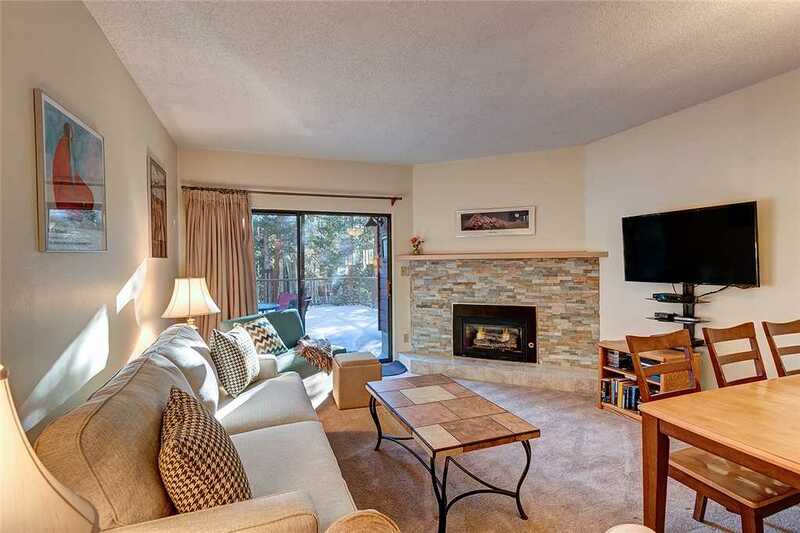 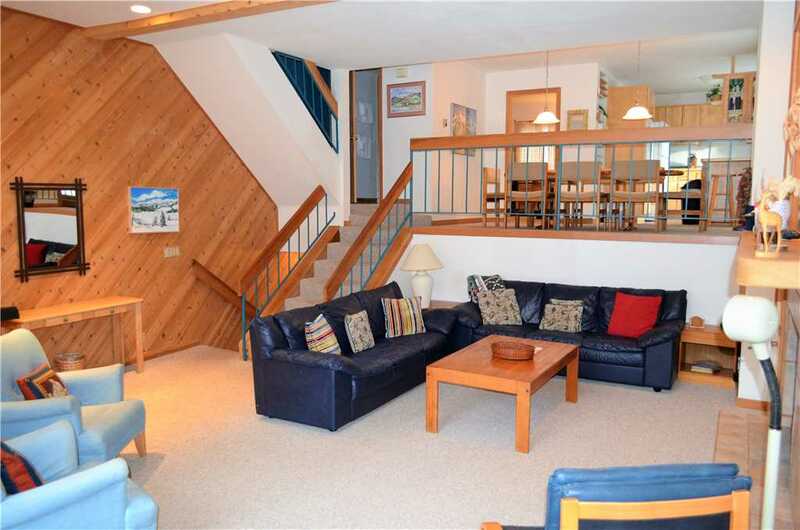 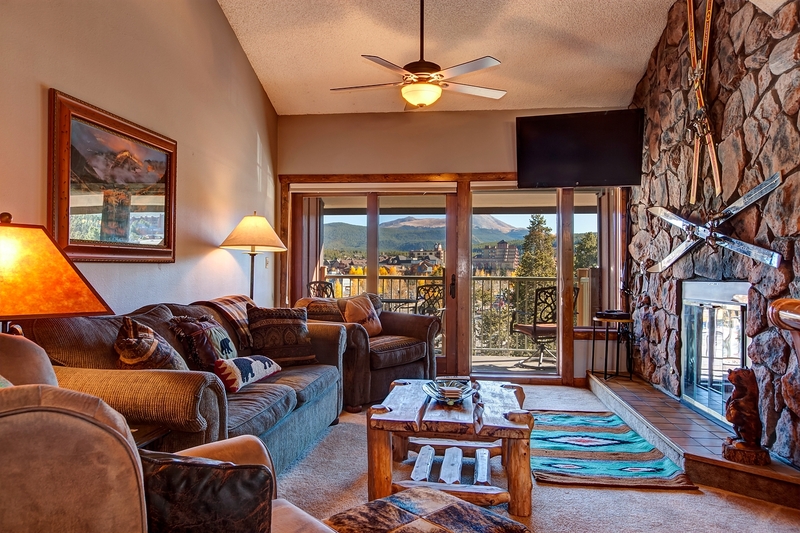 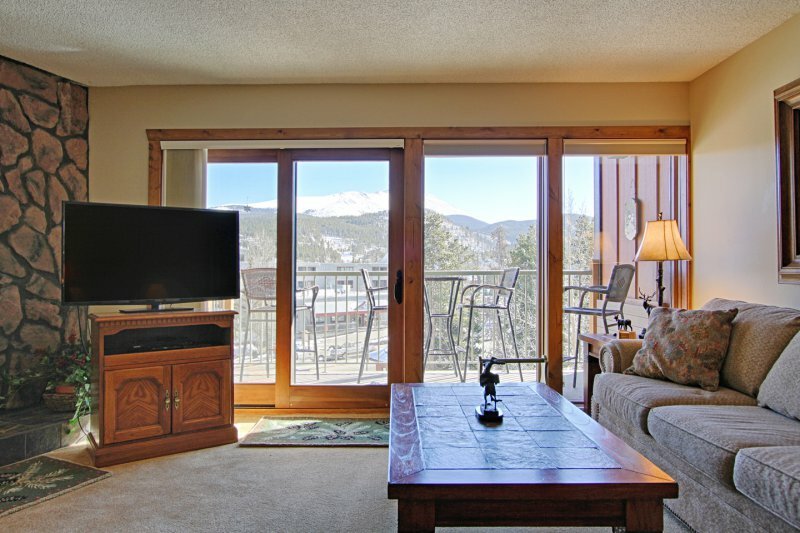 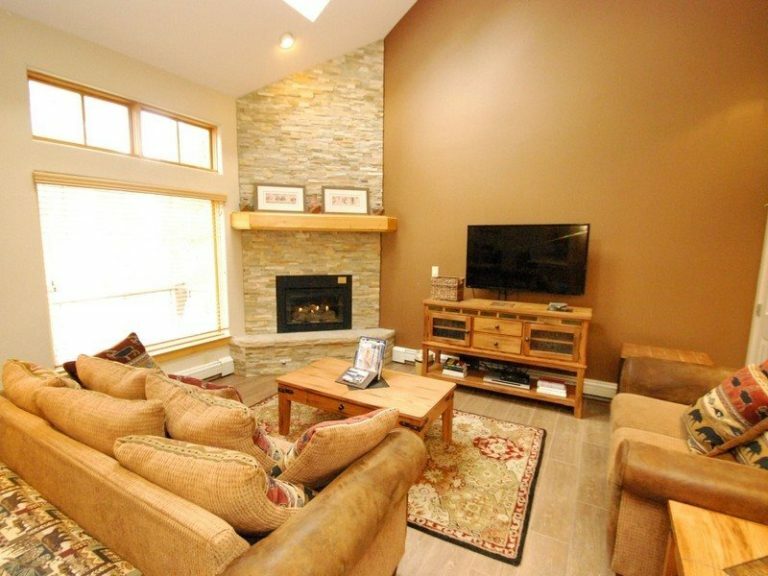 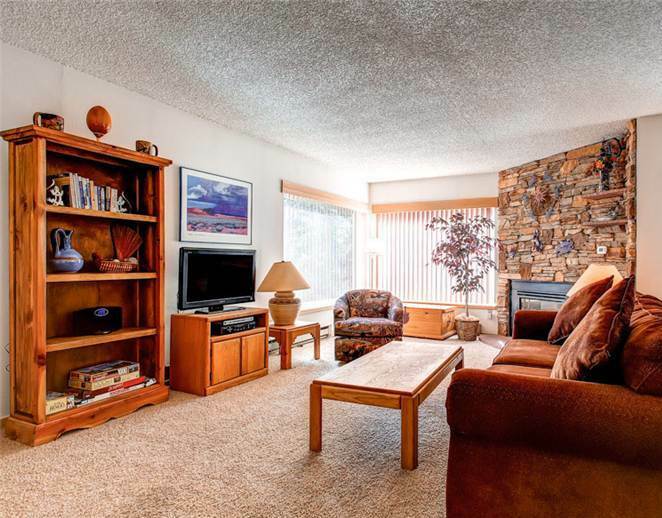 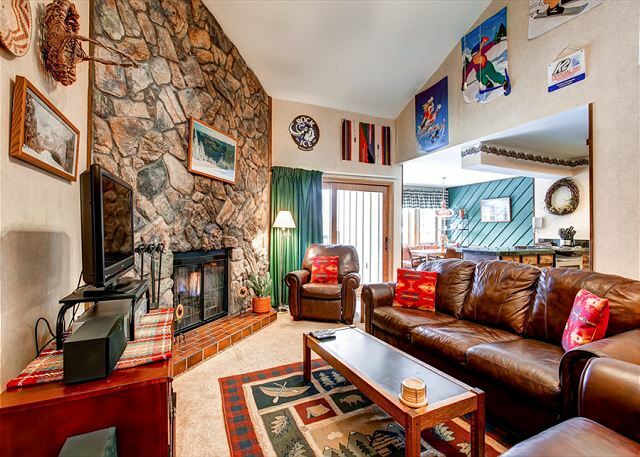 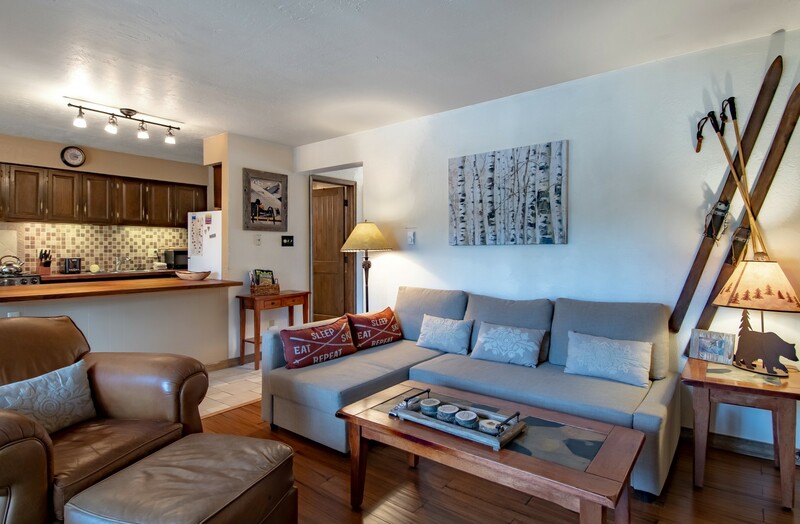 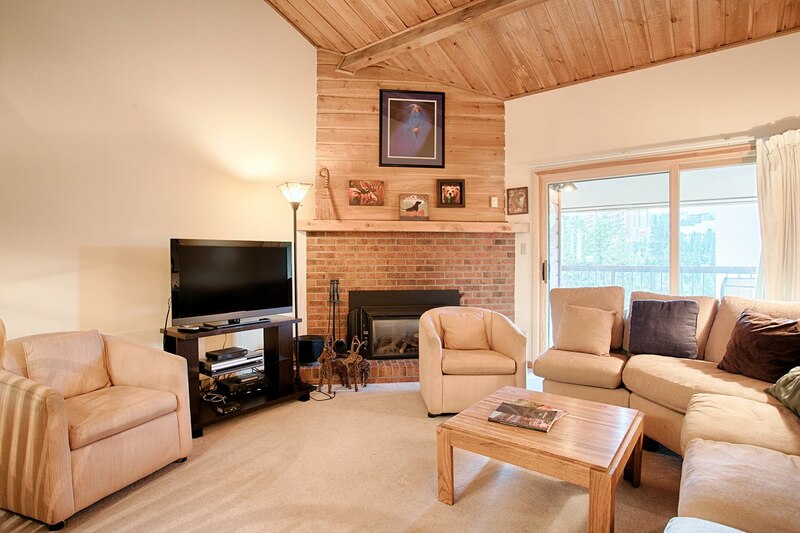 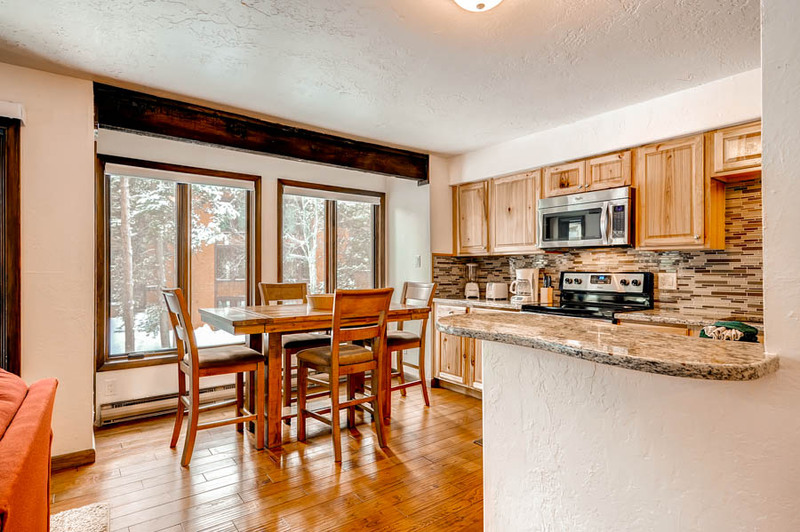 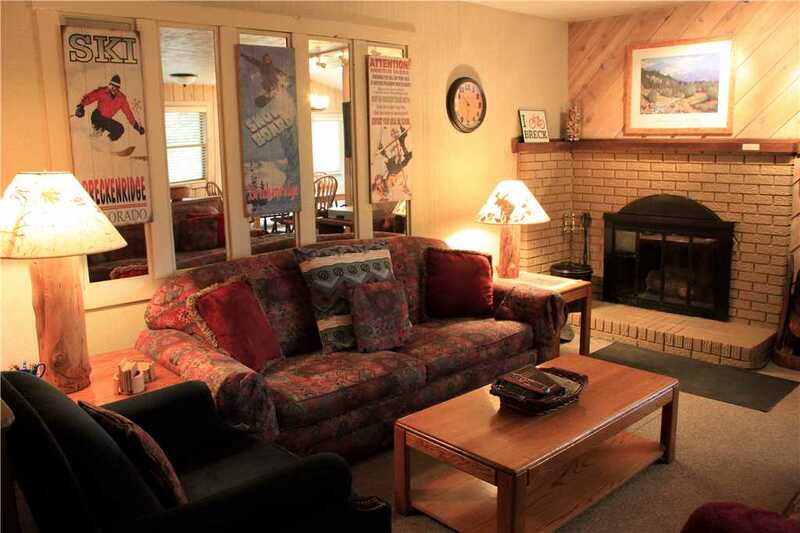 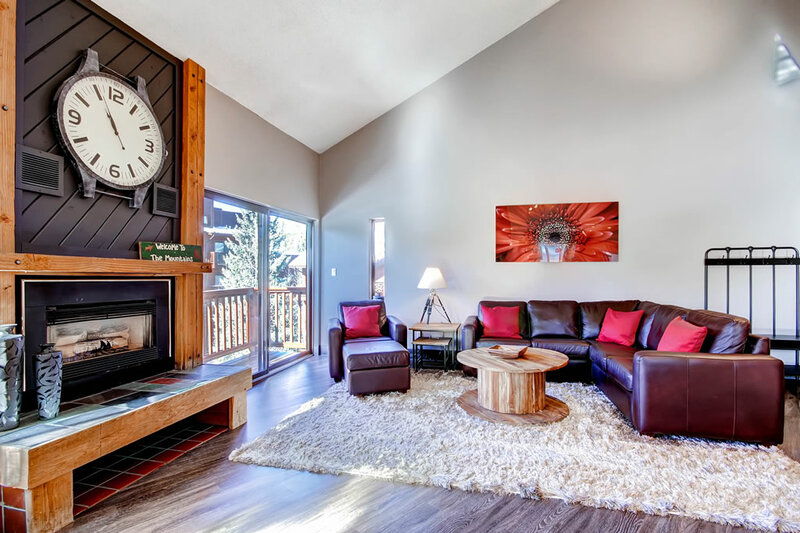 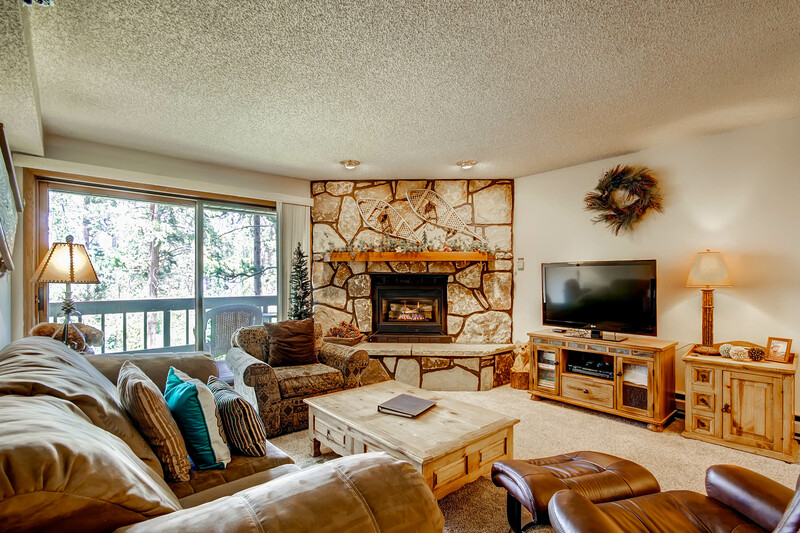 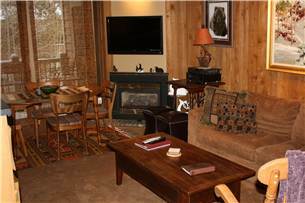 This nicely furnished multi-level townhome offers beautiful Mountain and Downtown views with a mountain stream running just behind the property. 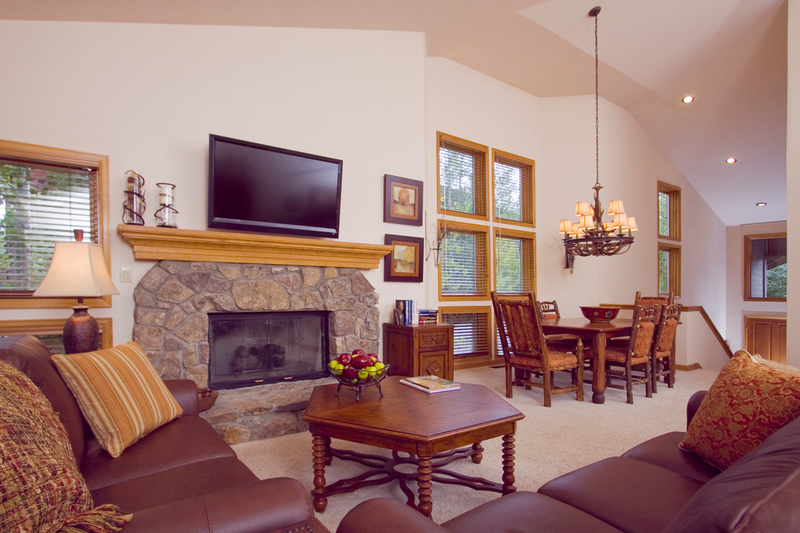 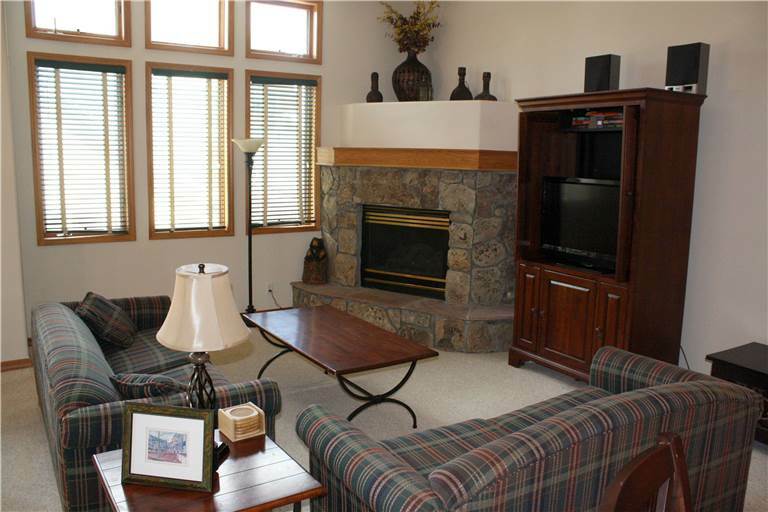 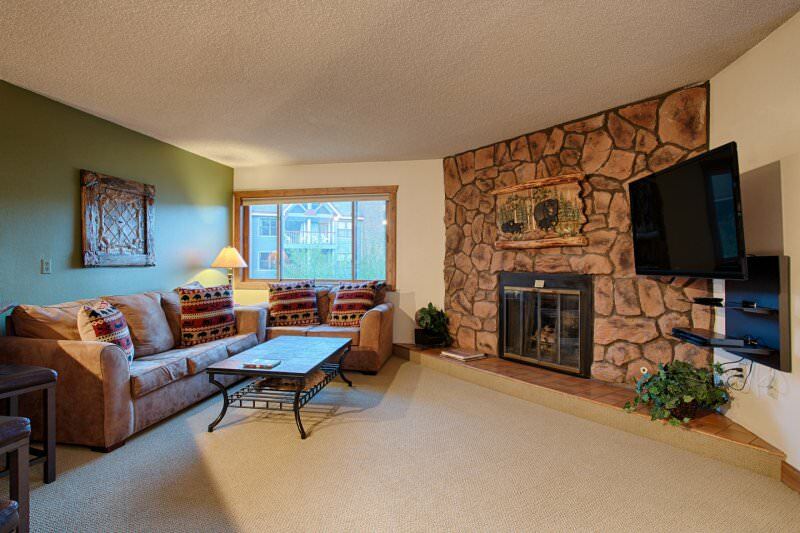 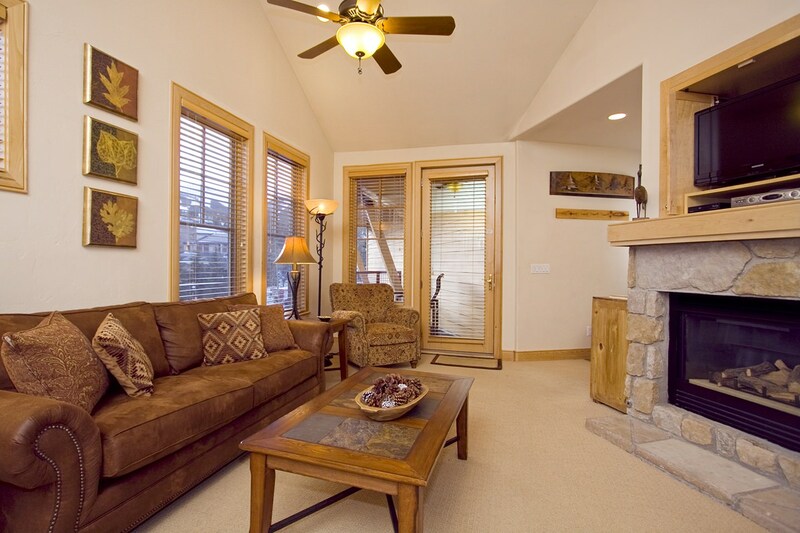 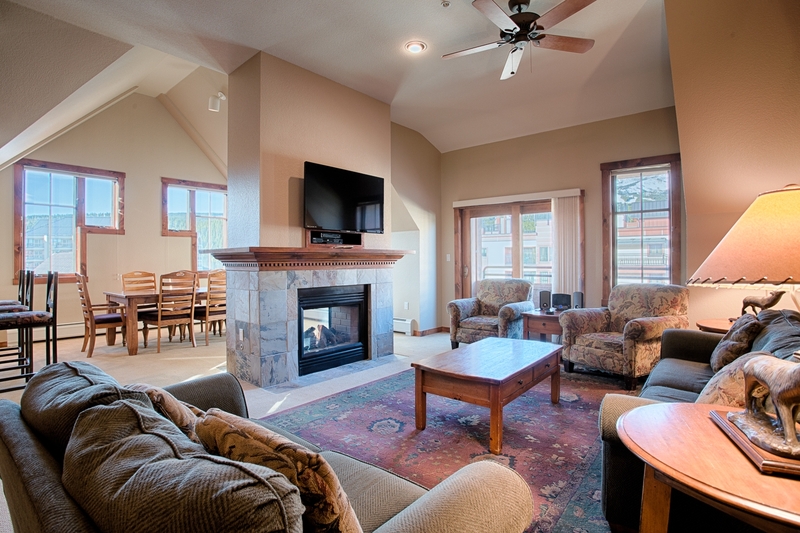 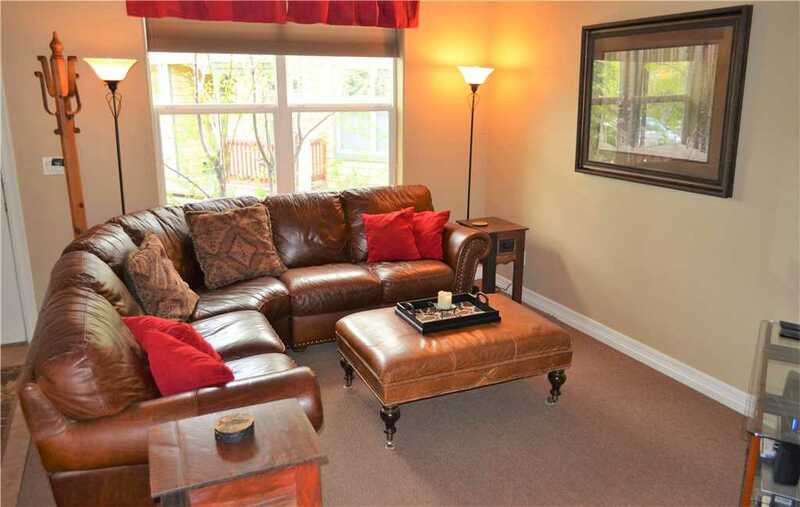 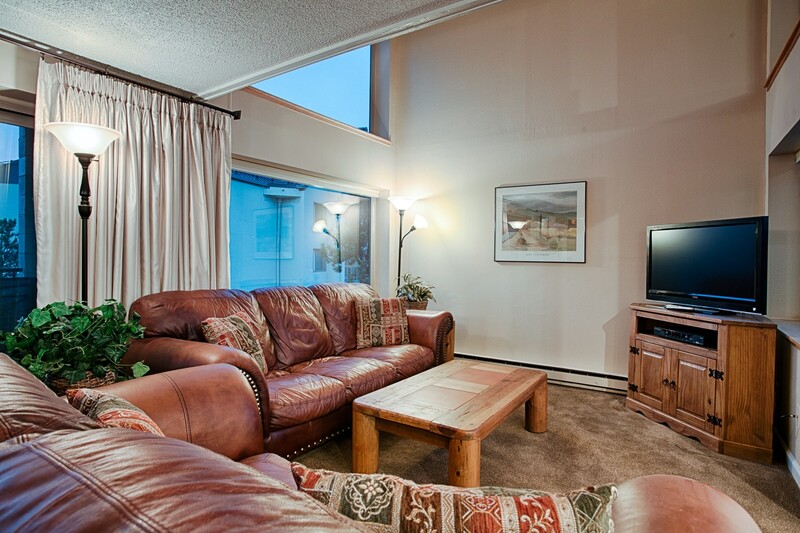 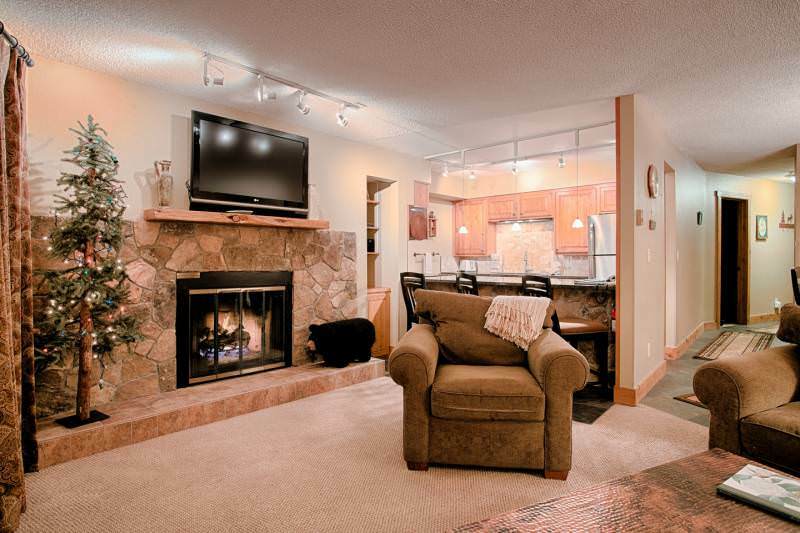 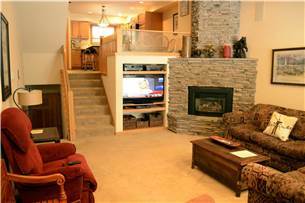 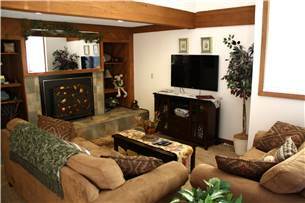 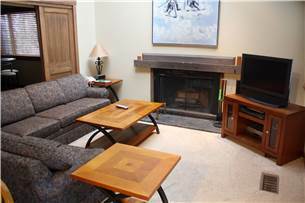 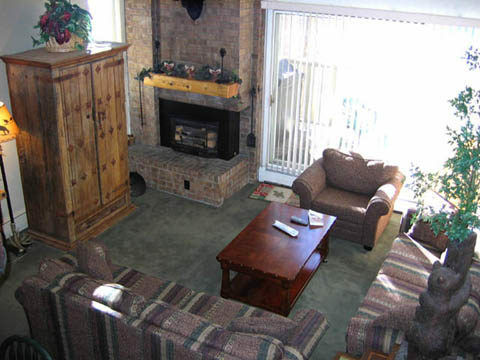 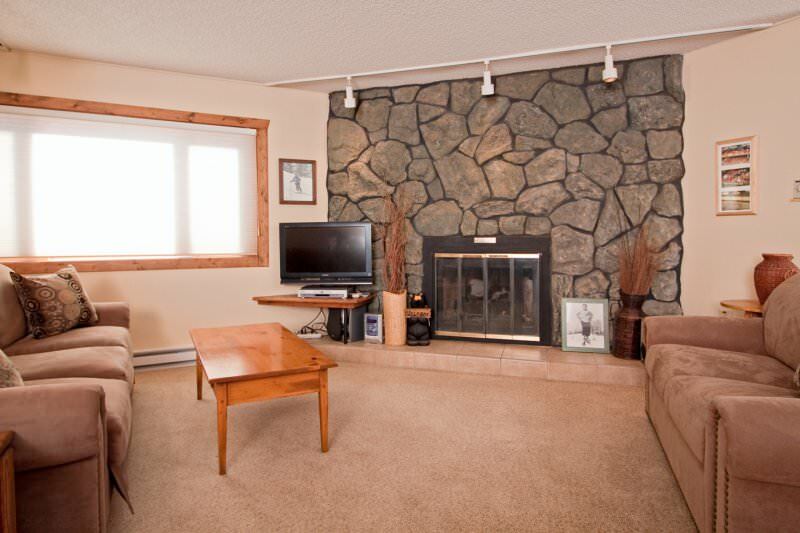 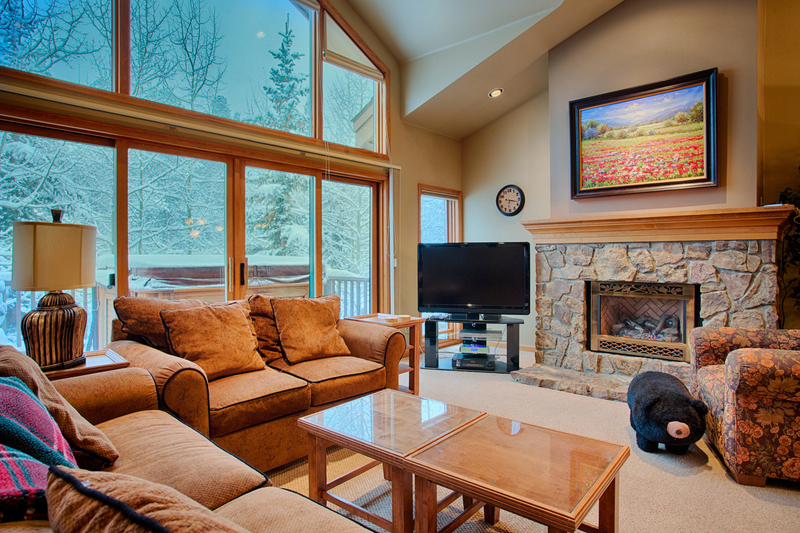 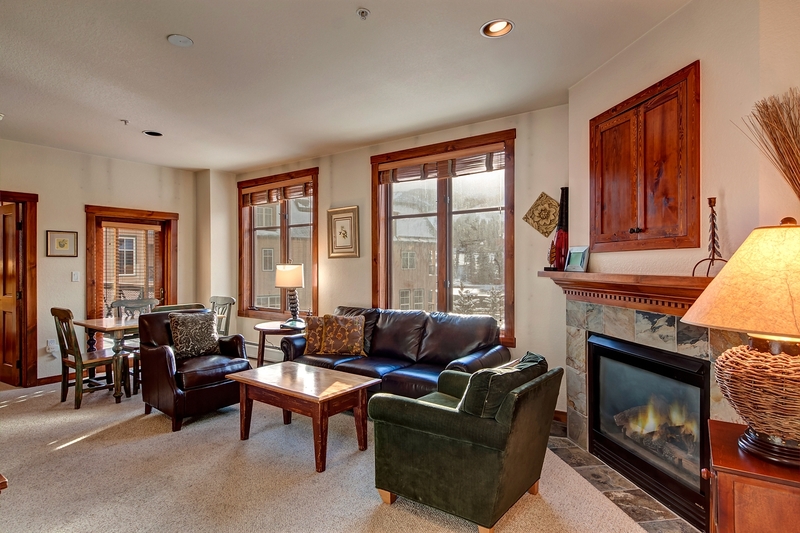 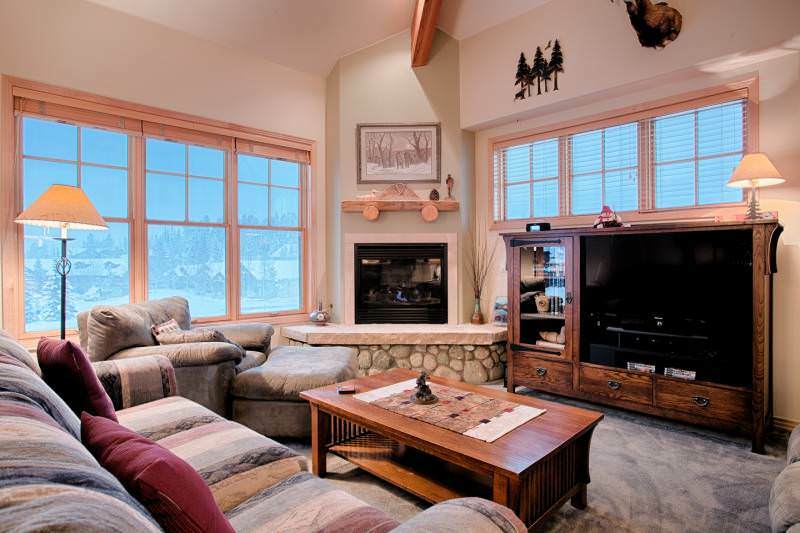 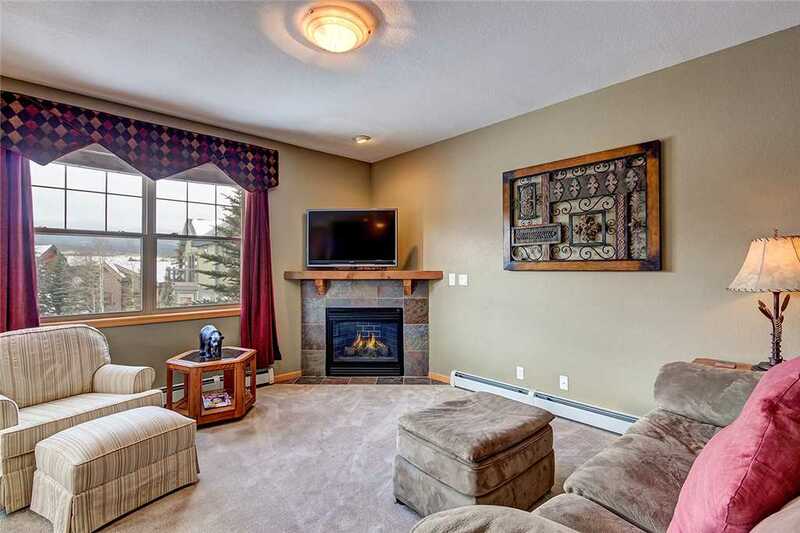 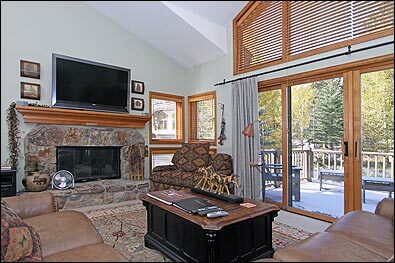 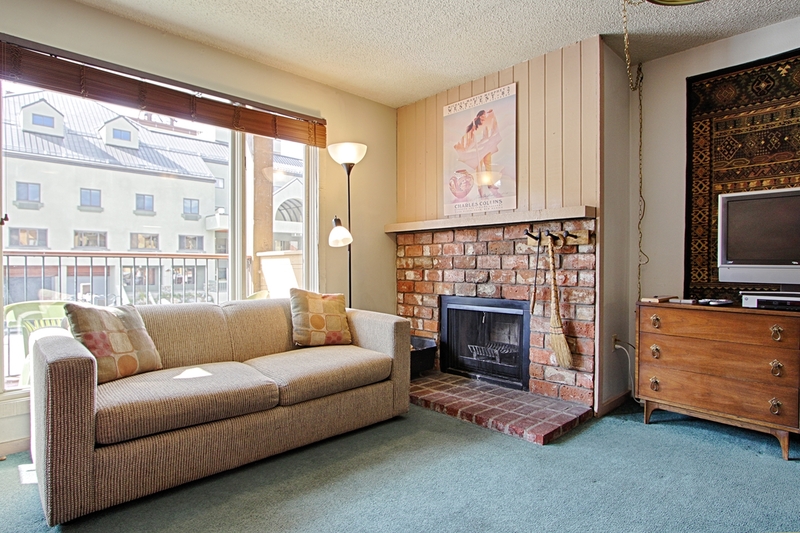 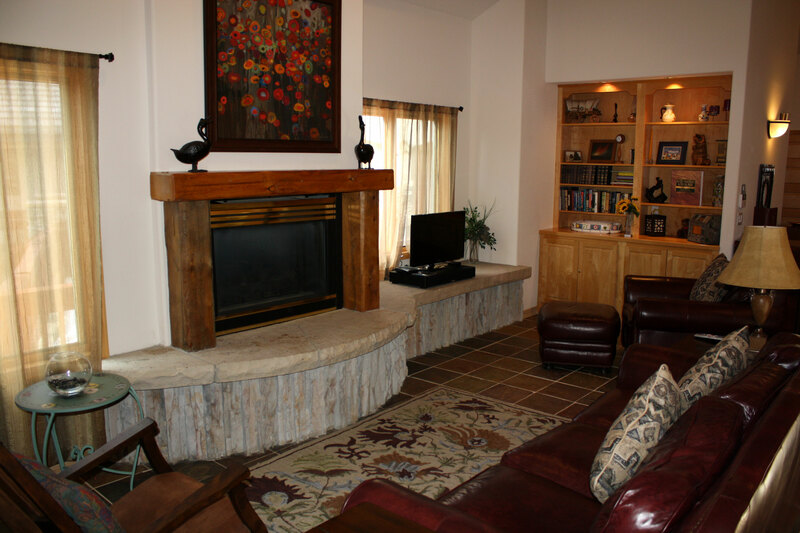 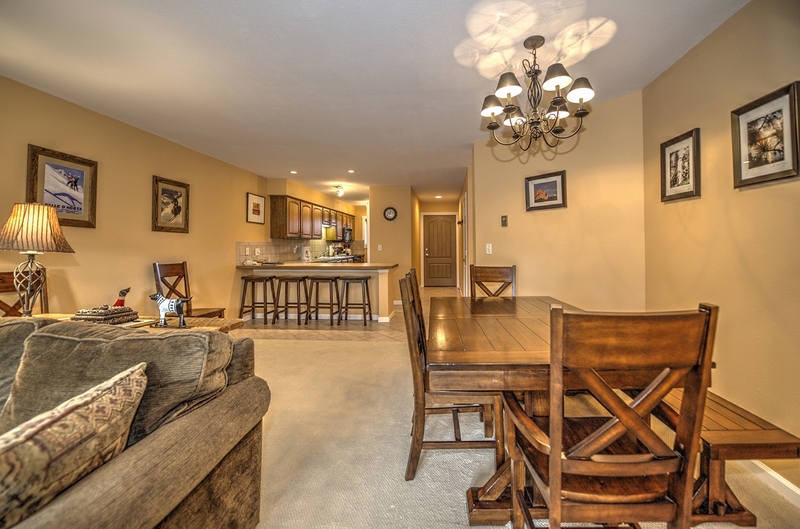 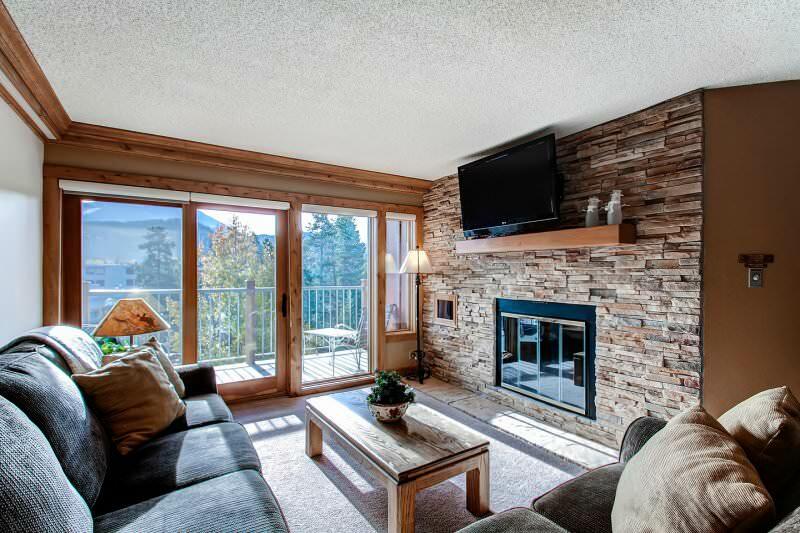 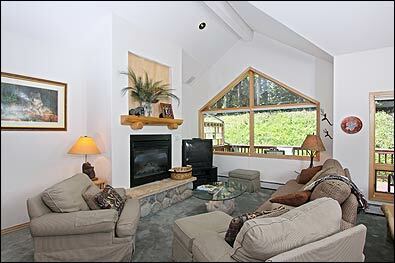 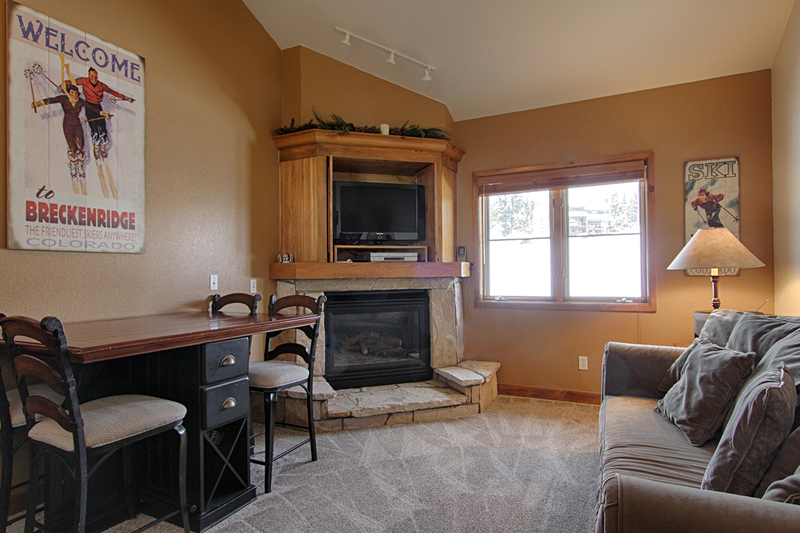 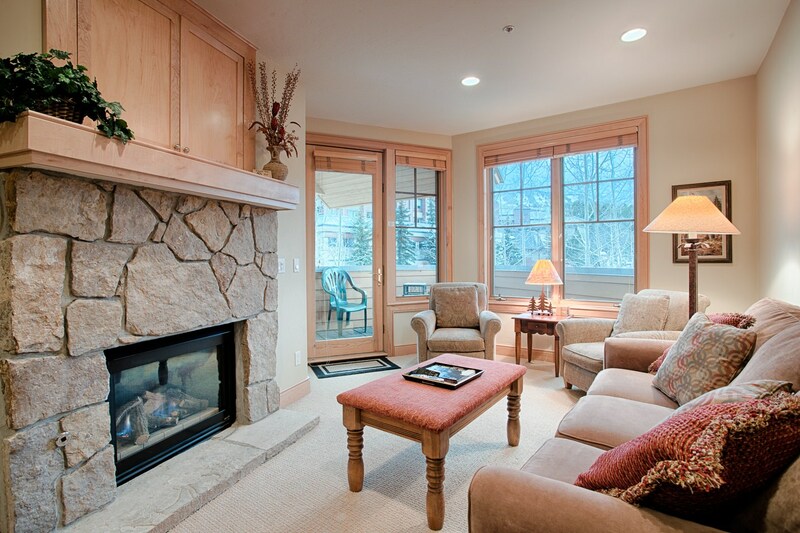 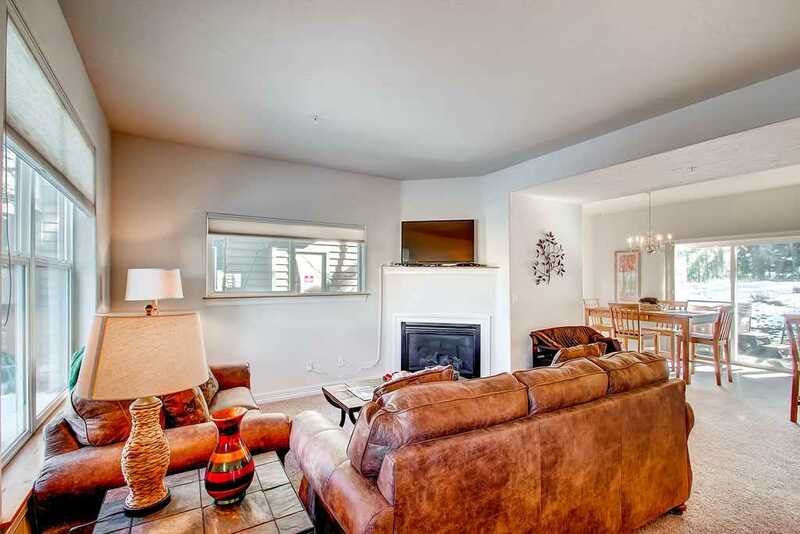 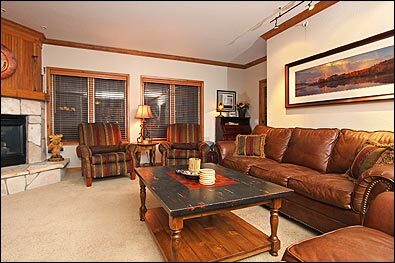 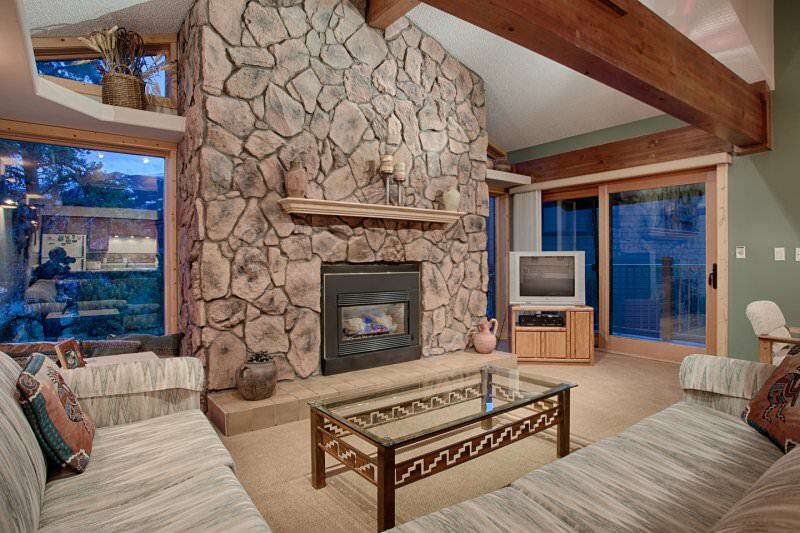 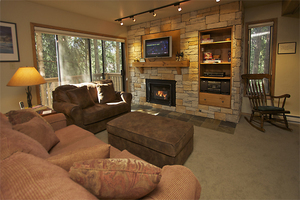 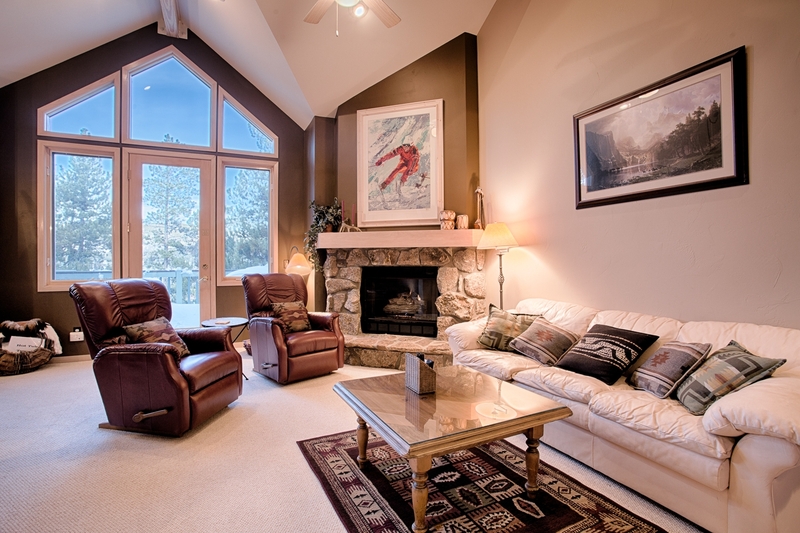 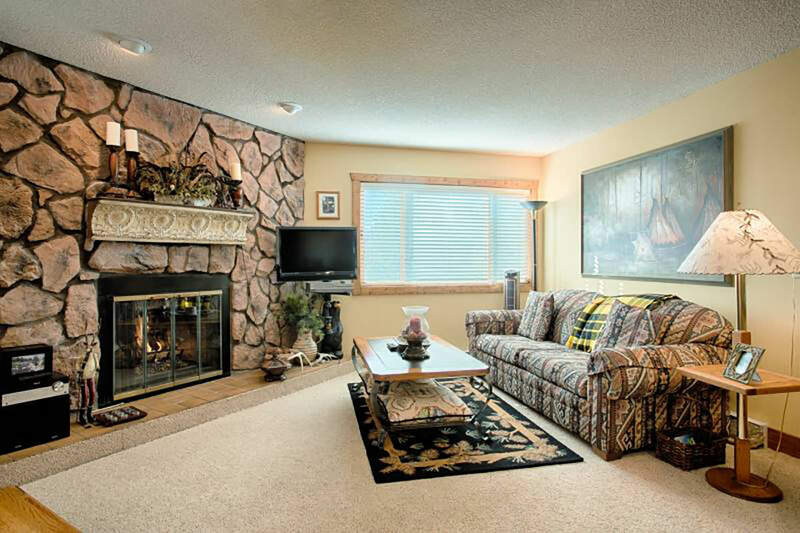 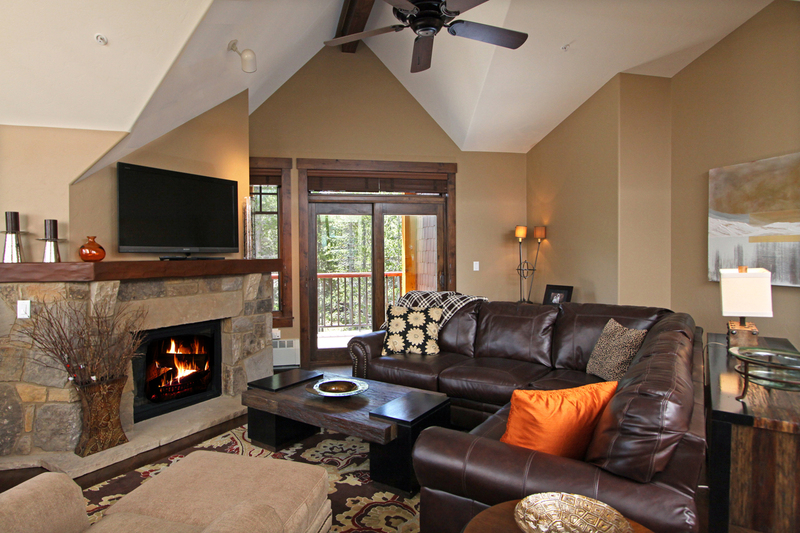 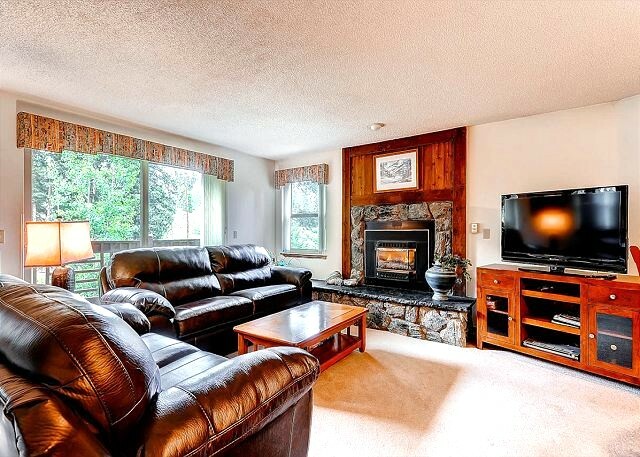 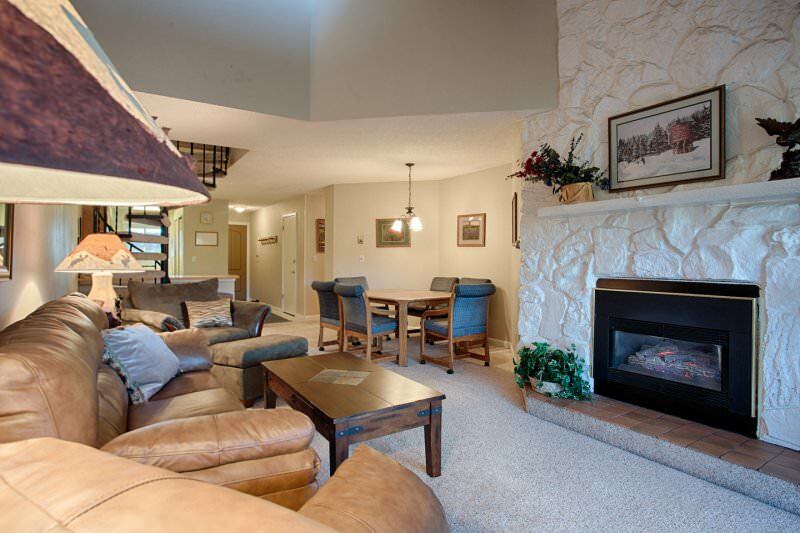 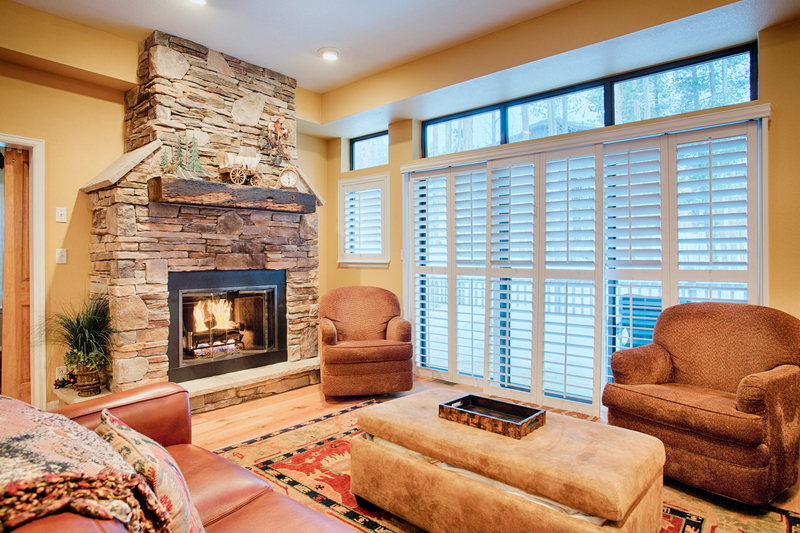 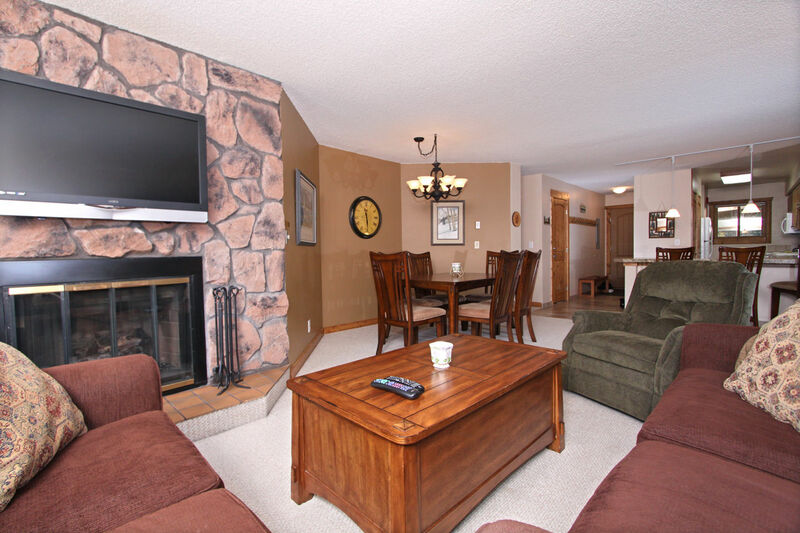 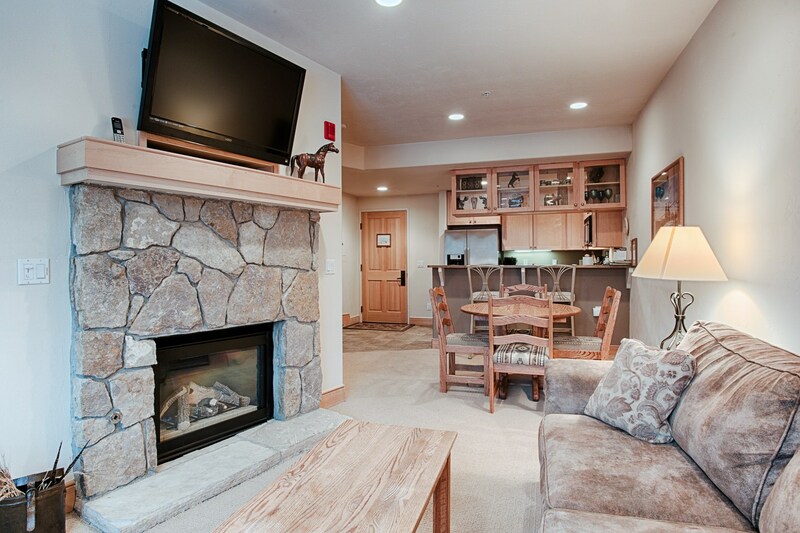 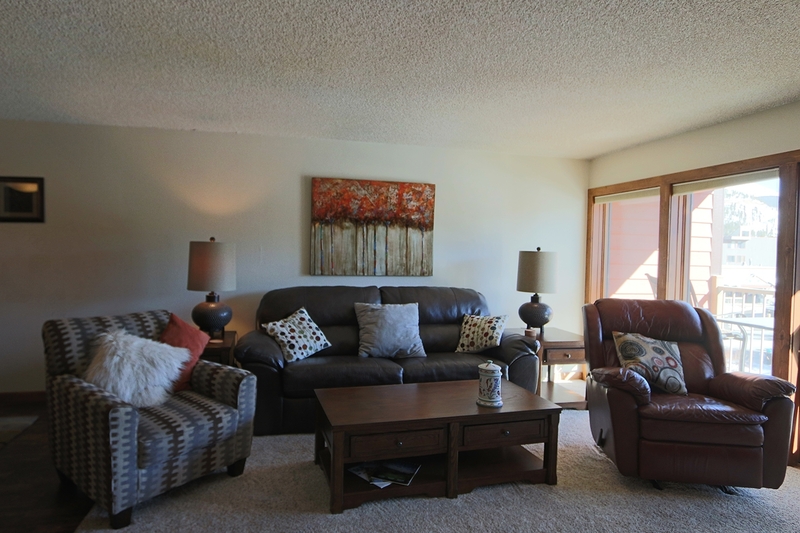 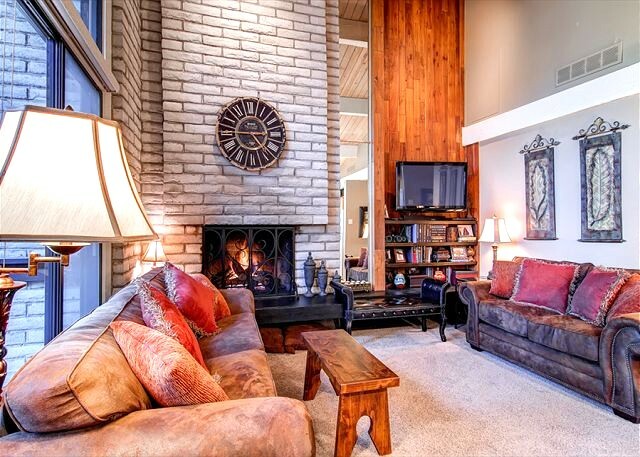 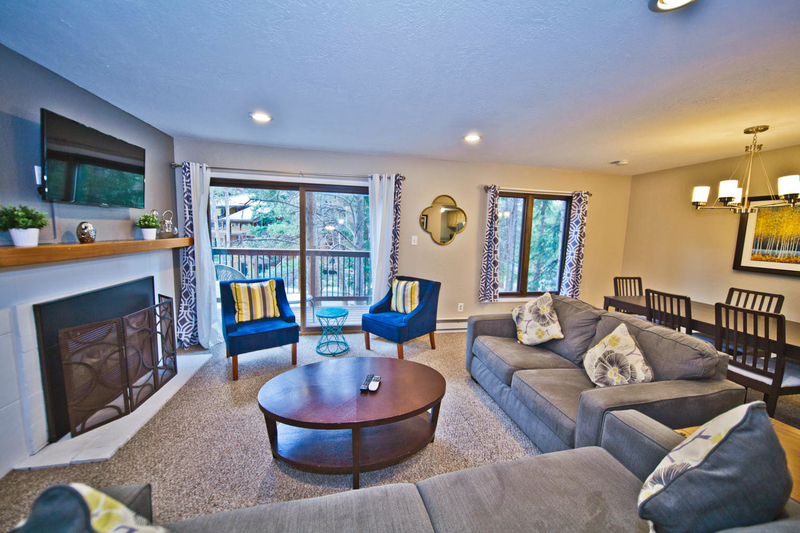 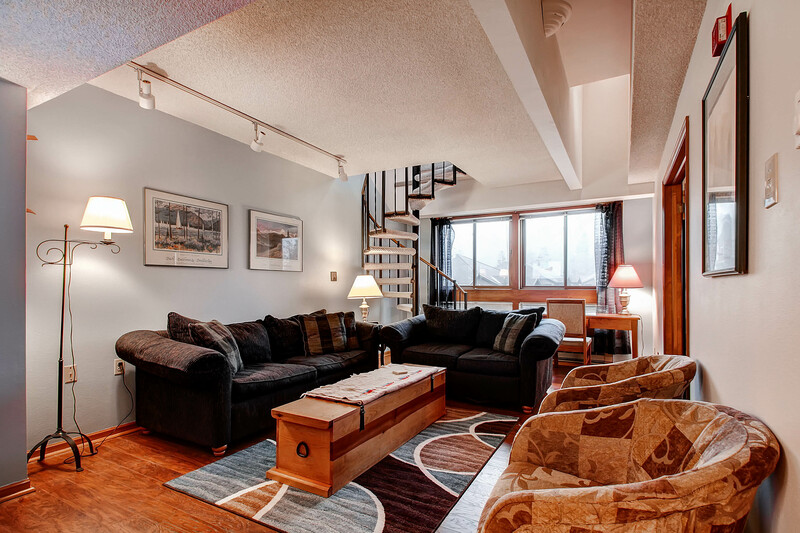 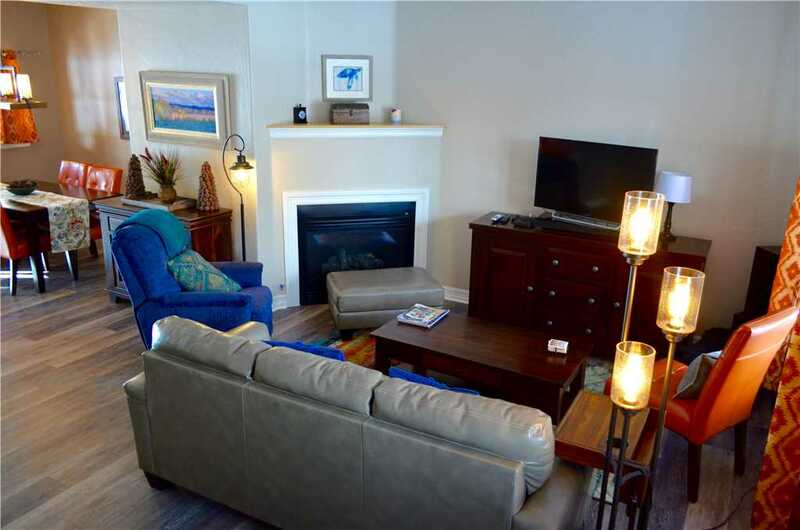 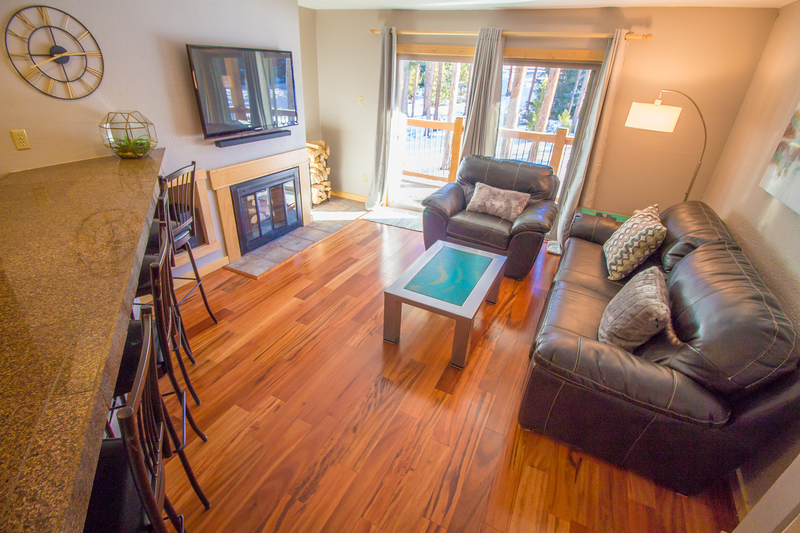 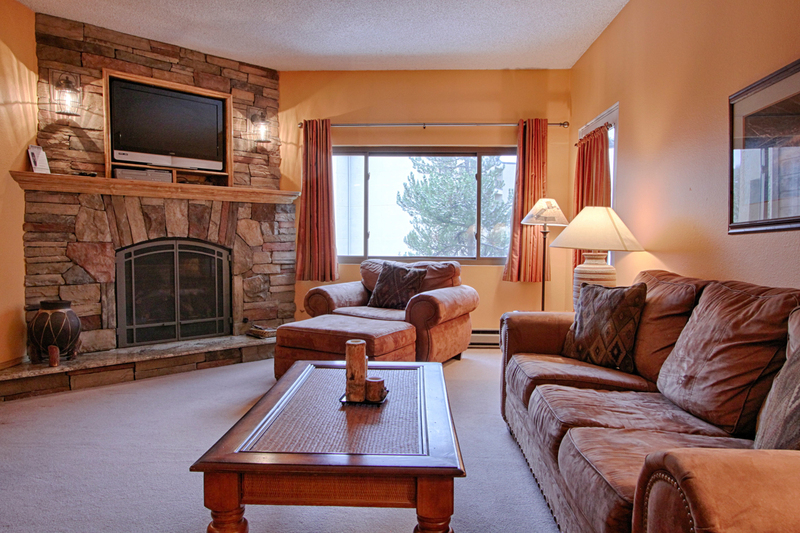 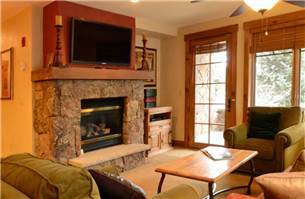 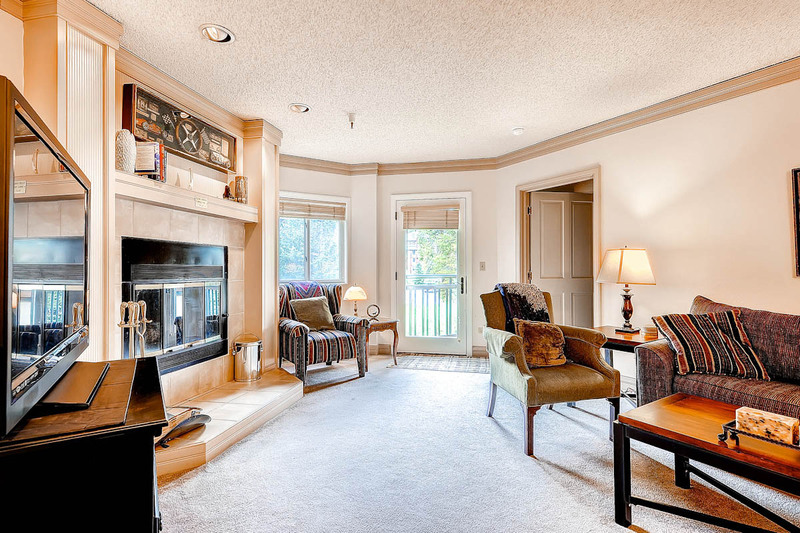 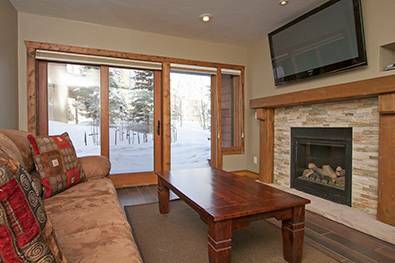 This townhome unit features an open living room design with a river rock gas fireplace and walkout East facing balcony. 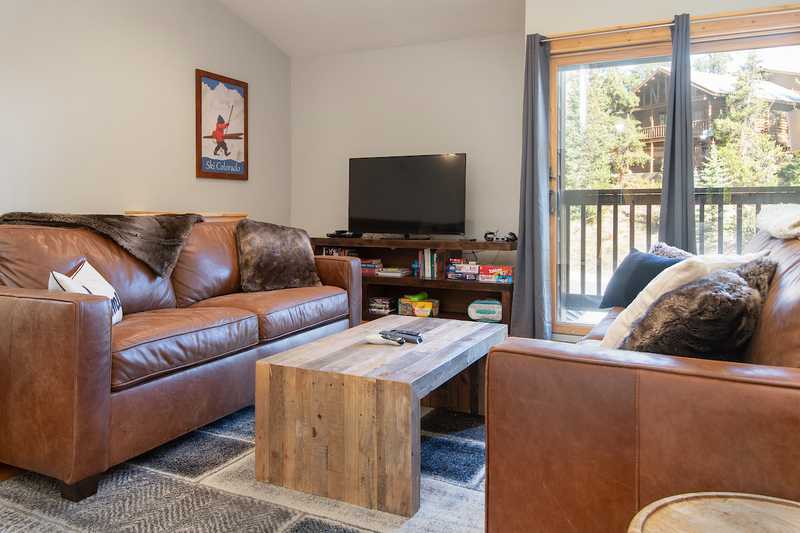 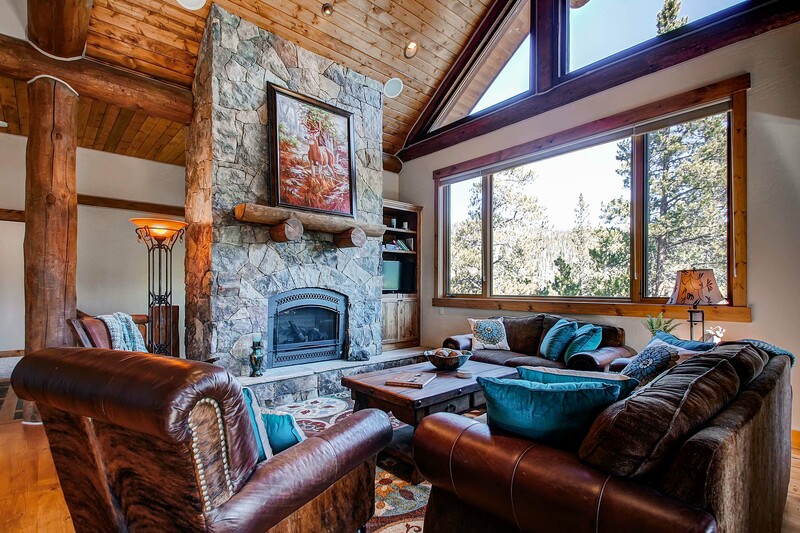 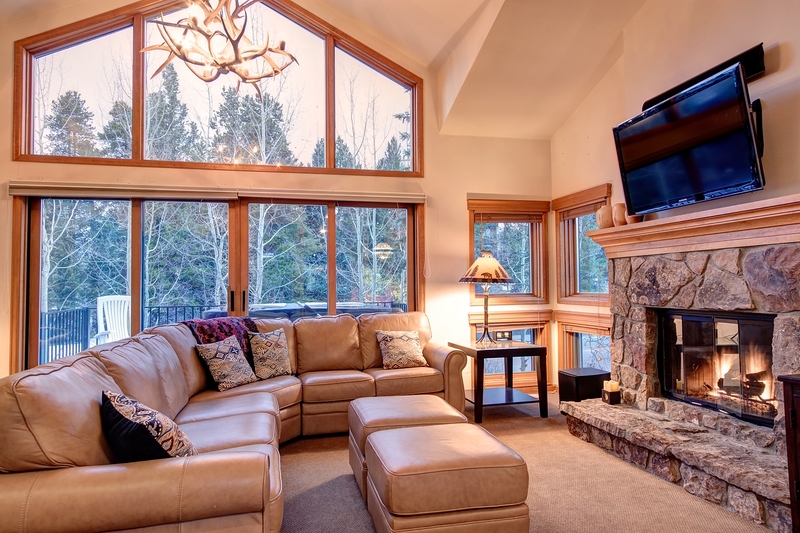 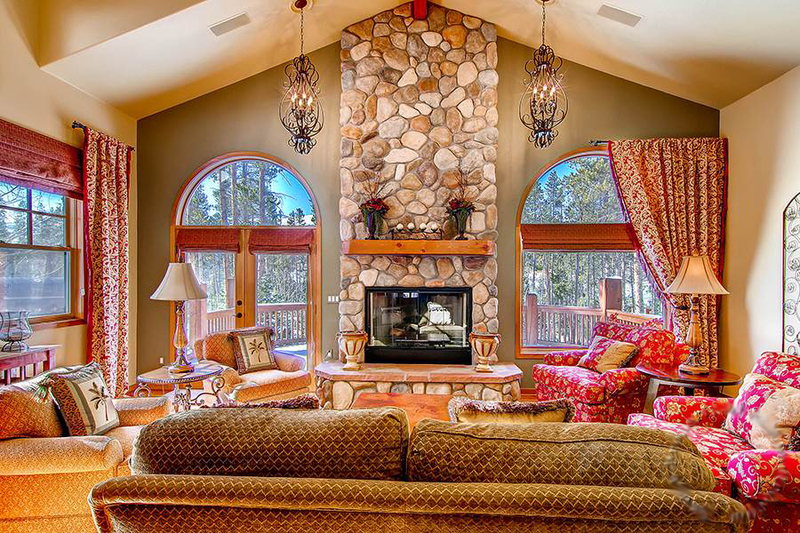 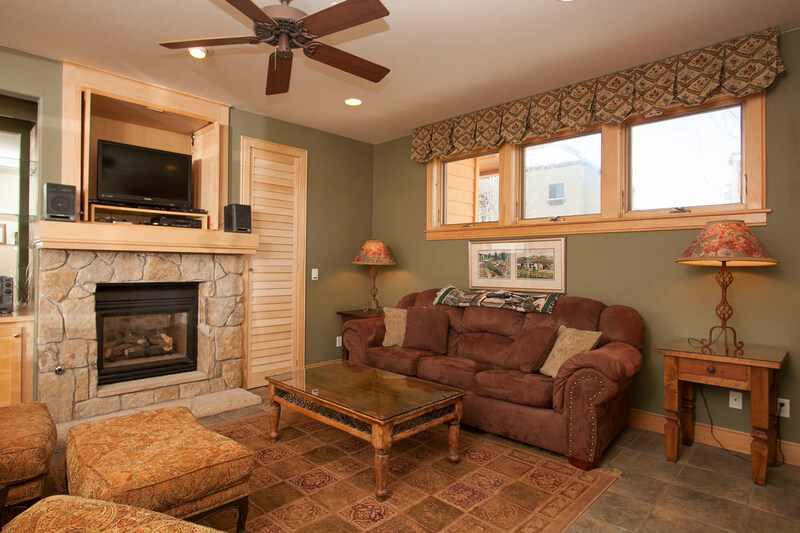 Enjoy your vacation book curled up on either of the plush couches in the living room or watch your favorite movie on the TV/DVD entertainment area. 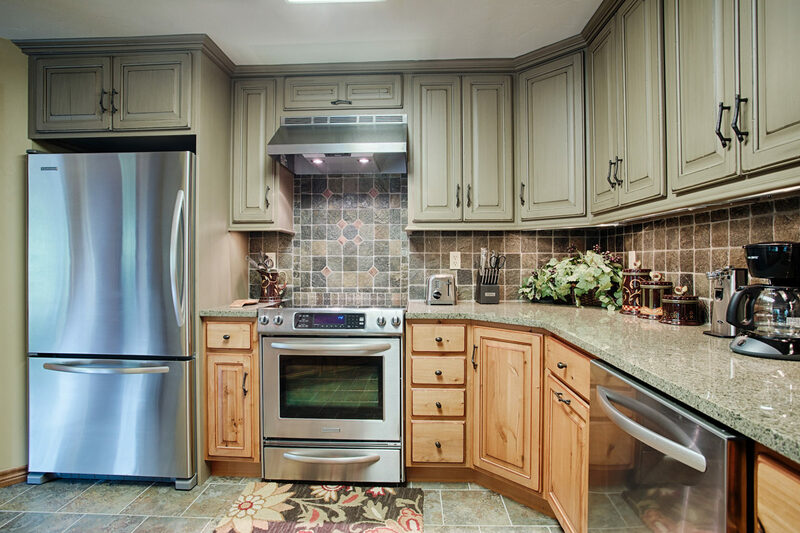 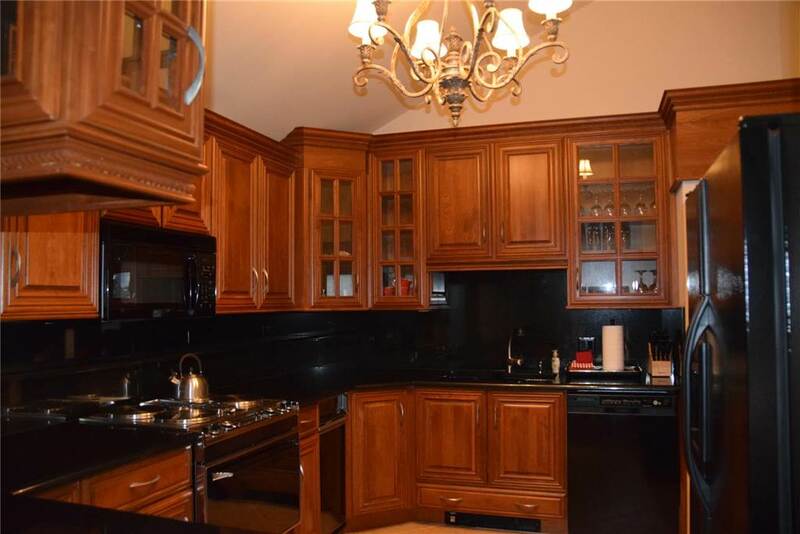 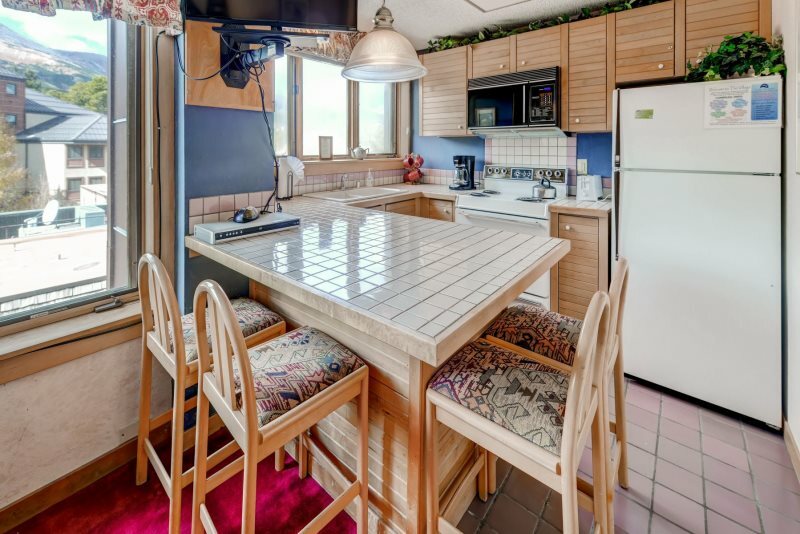 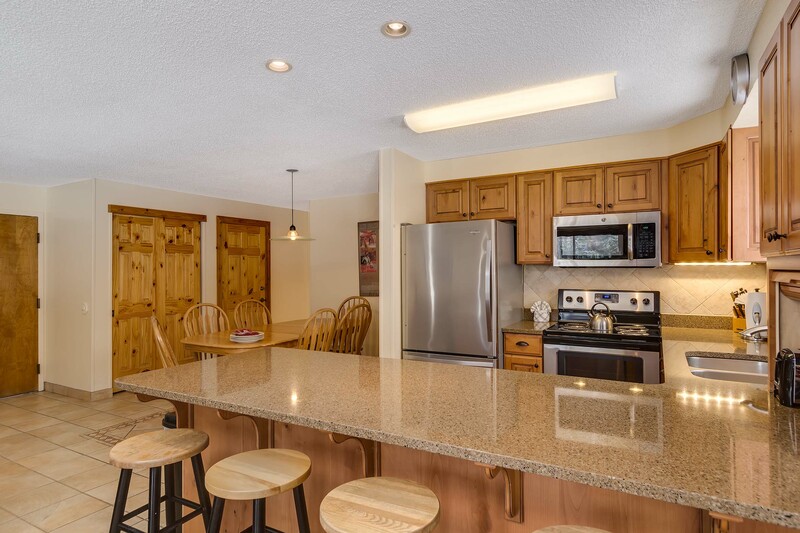 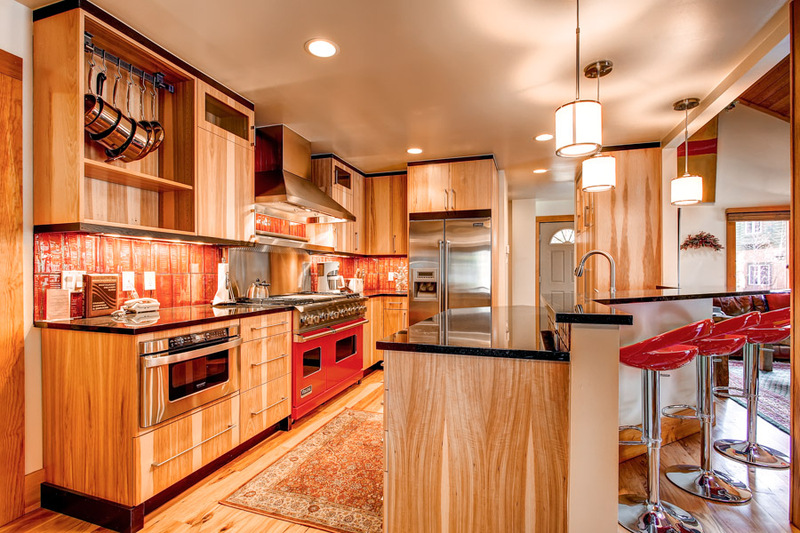 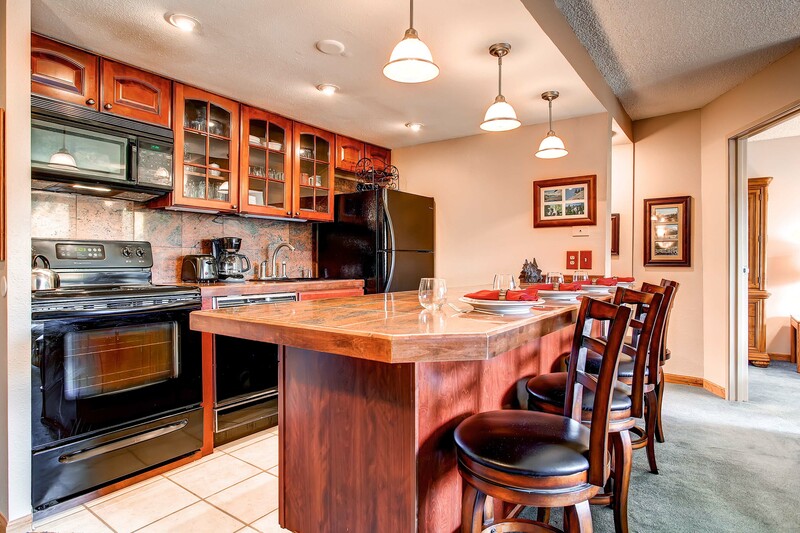 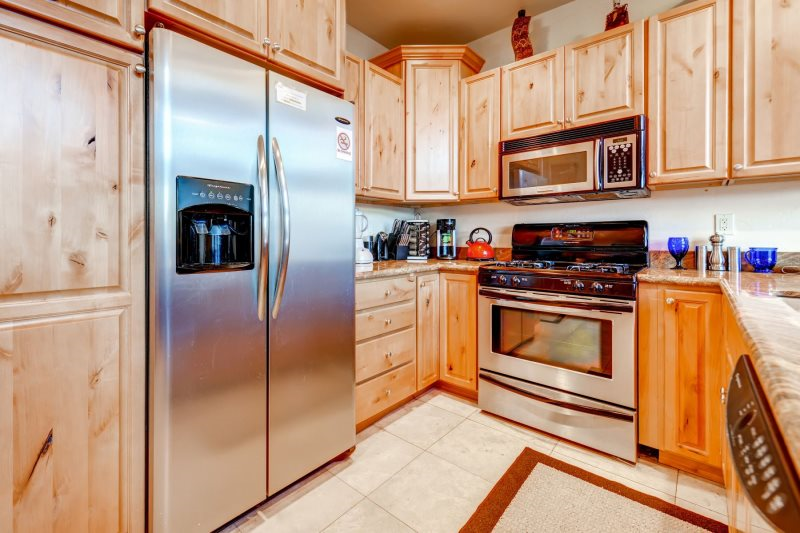 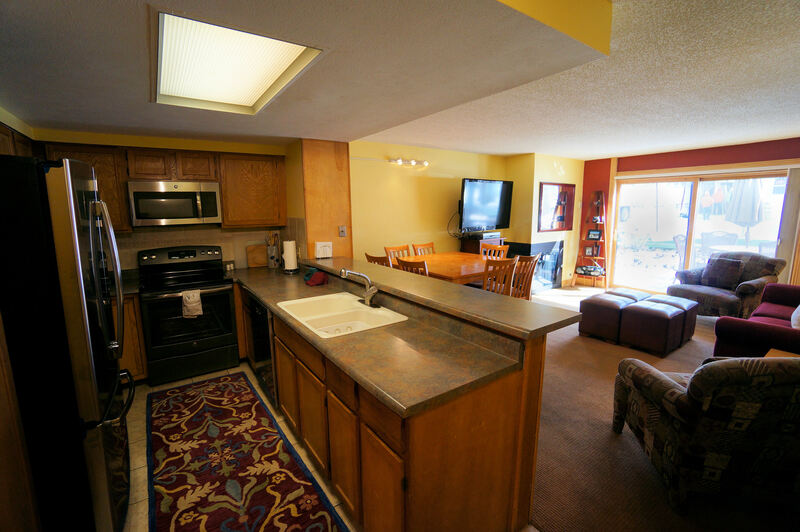 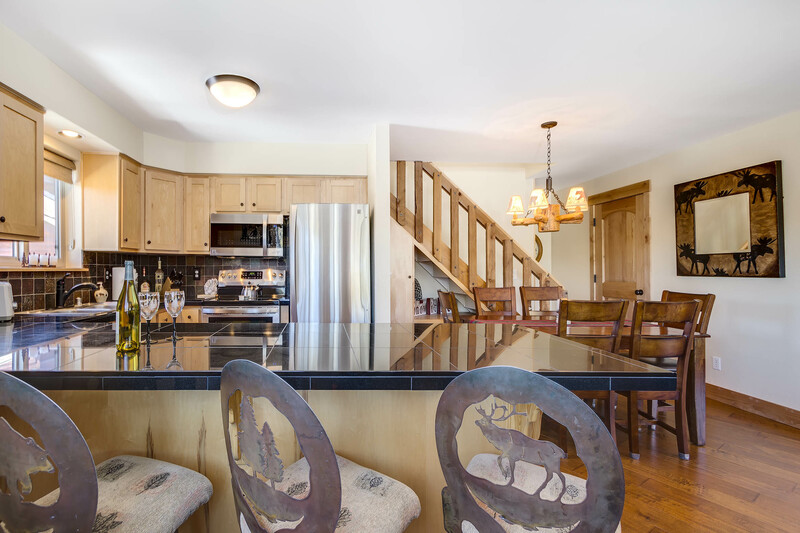 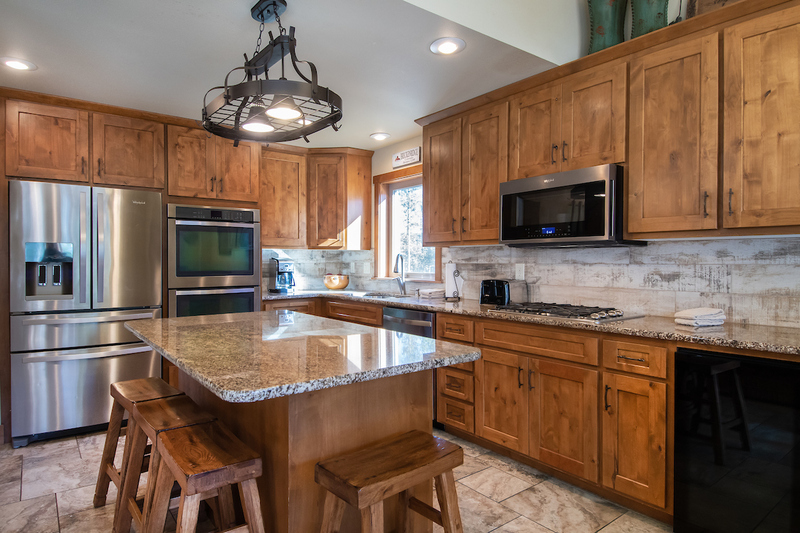 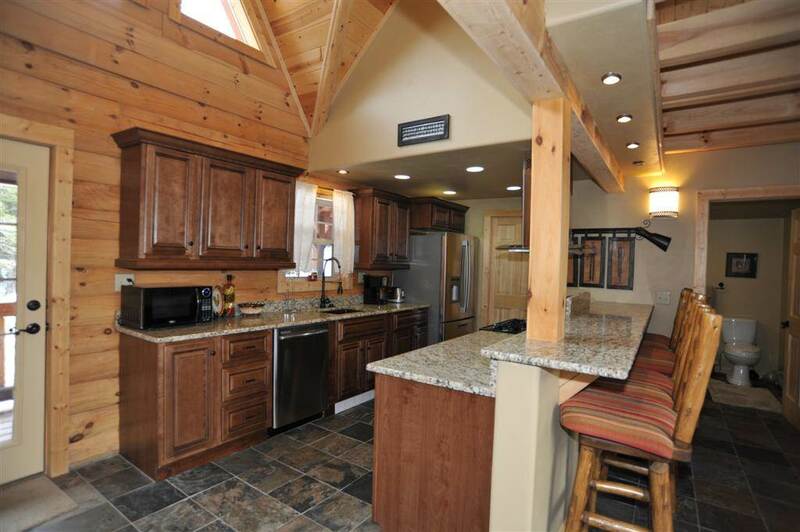 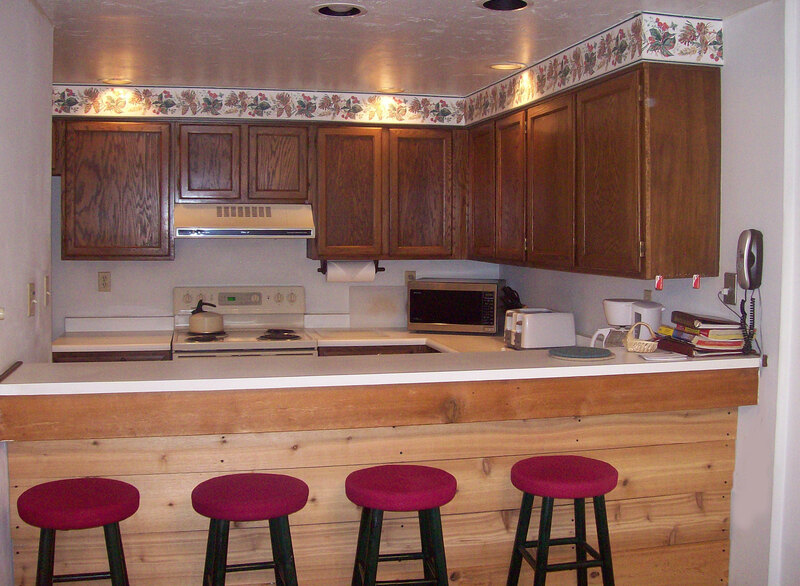 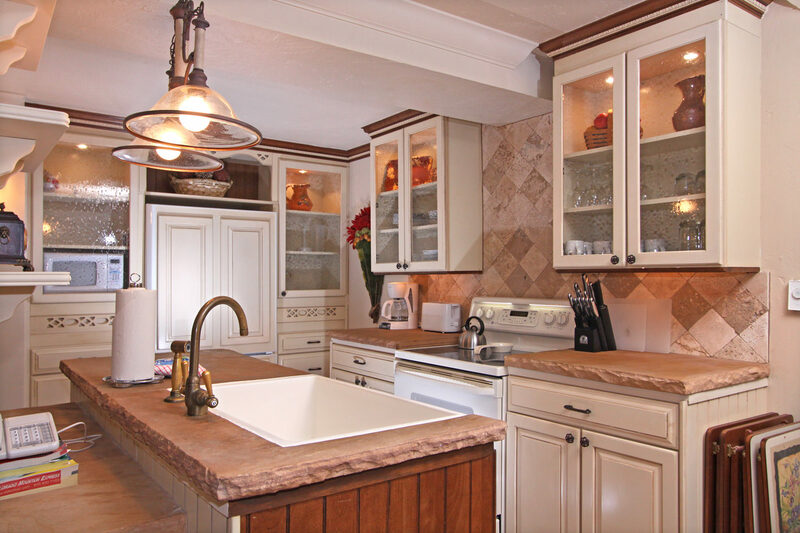 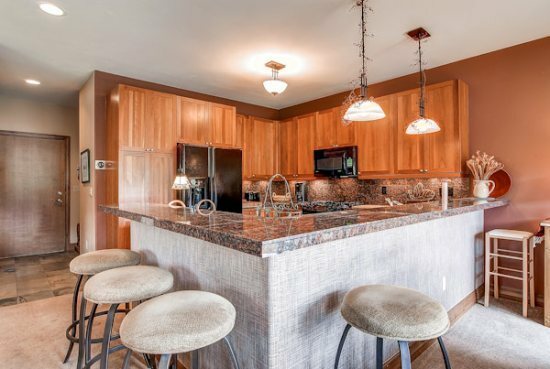 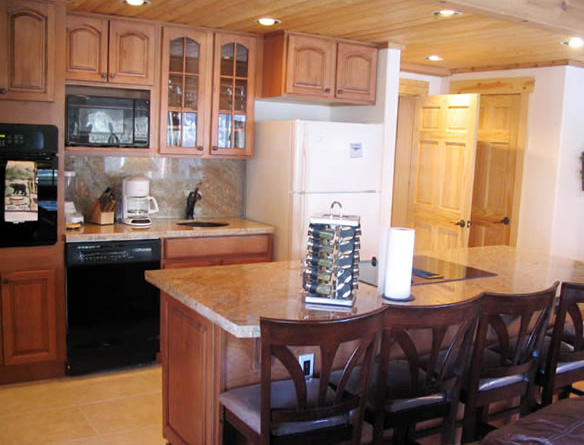 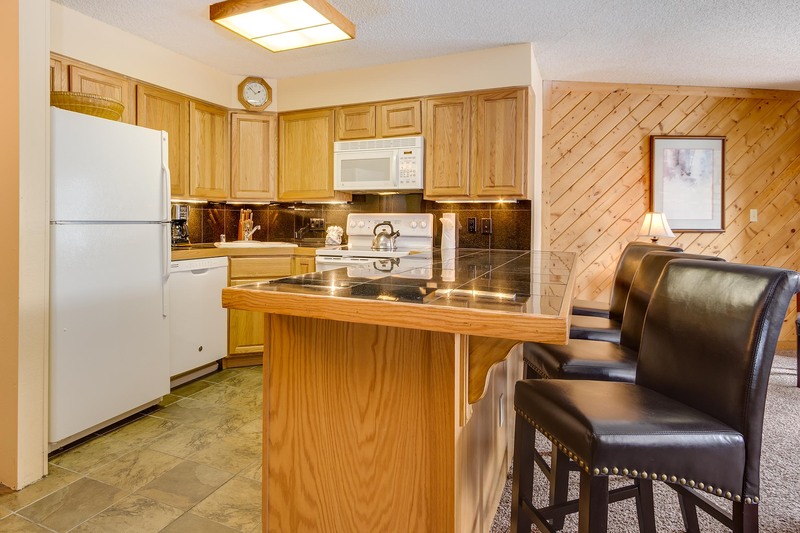 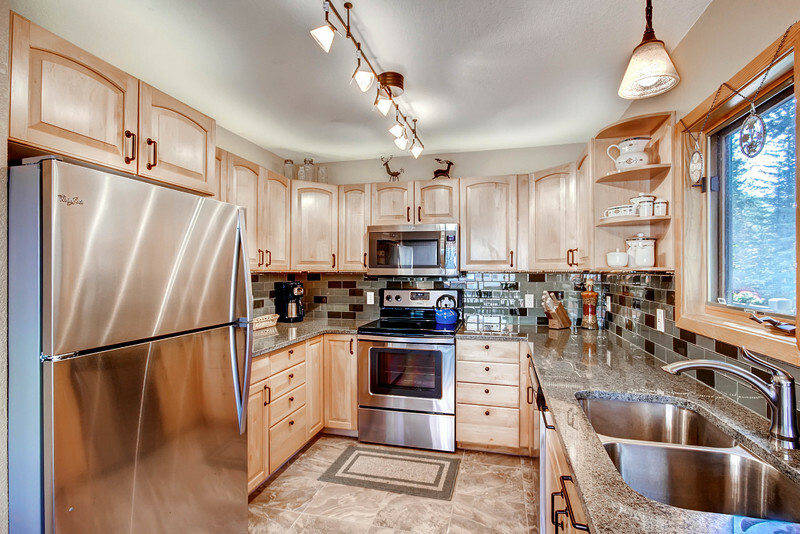 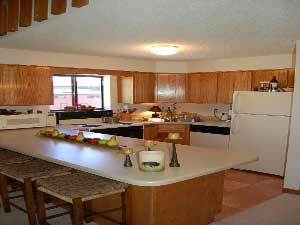 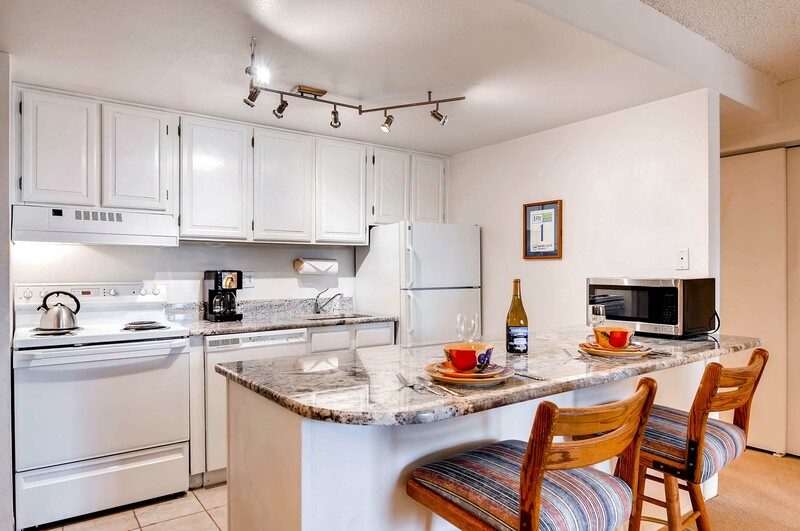 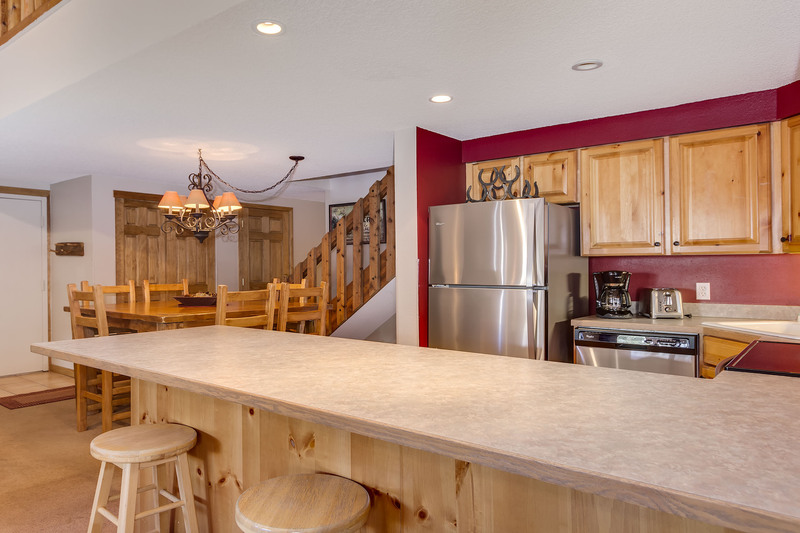 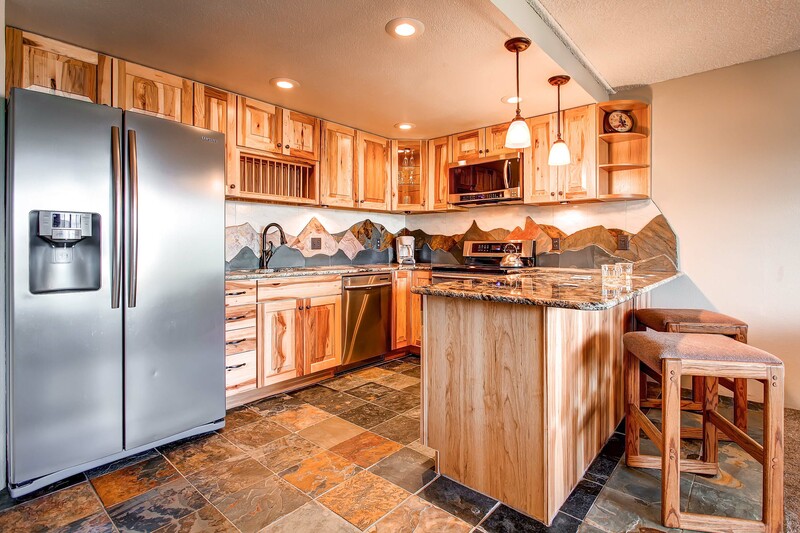 The gourmet, fully-equipped kitchen provides all the necessary appliances; coffee maker, microwave, toaster, stove, oven and dishwasher with a breakfast bar with seating for four people. 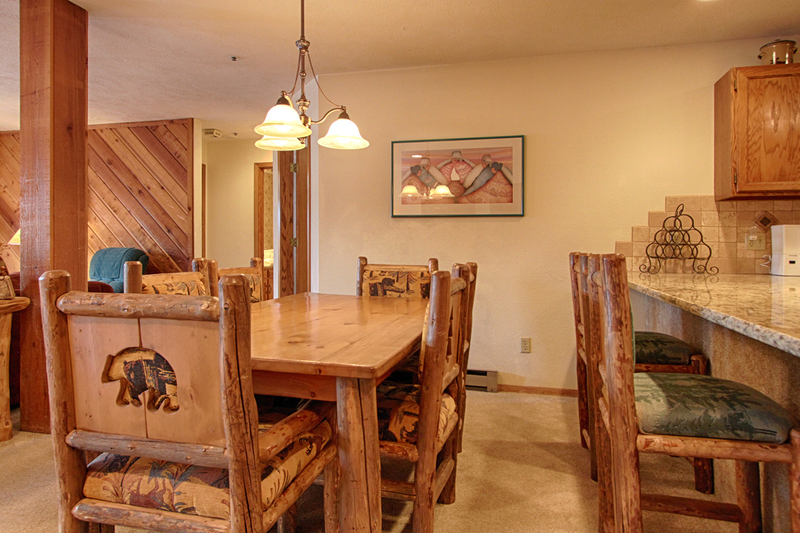 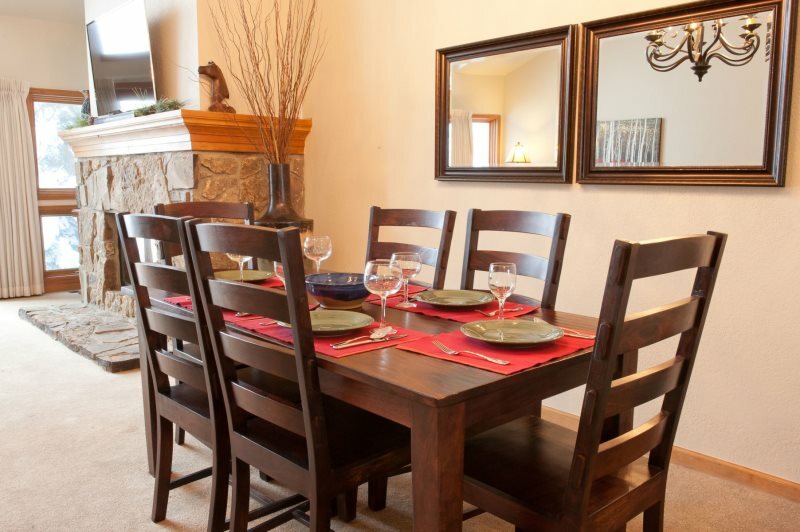 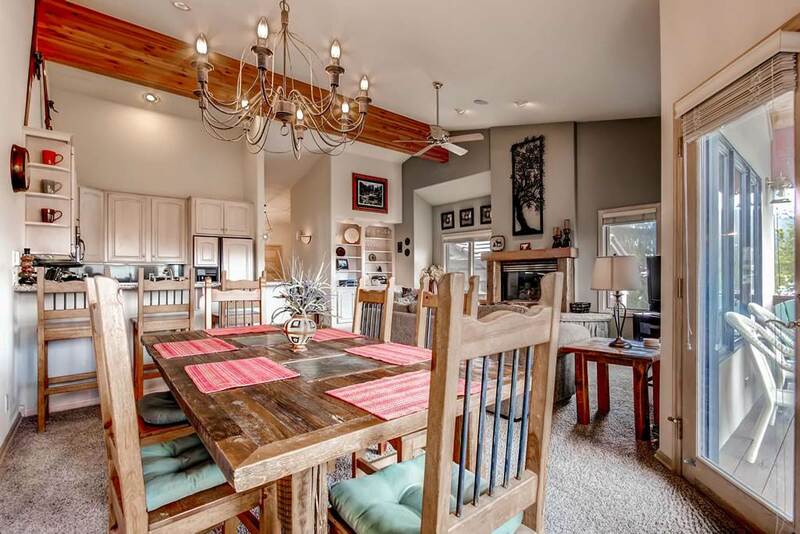 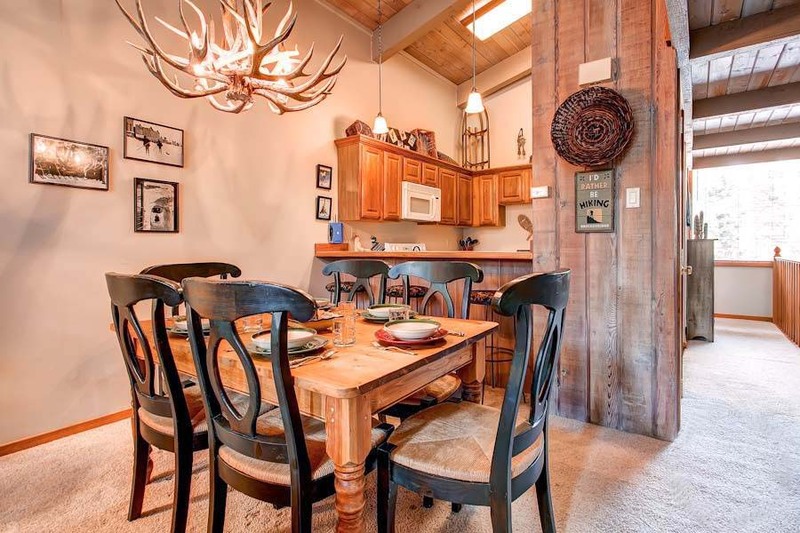 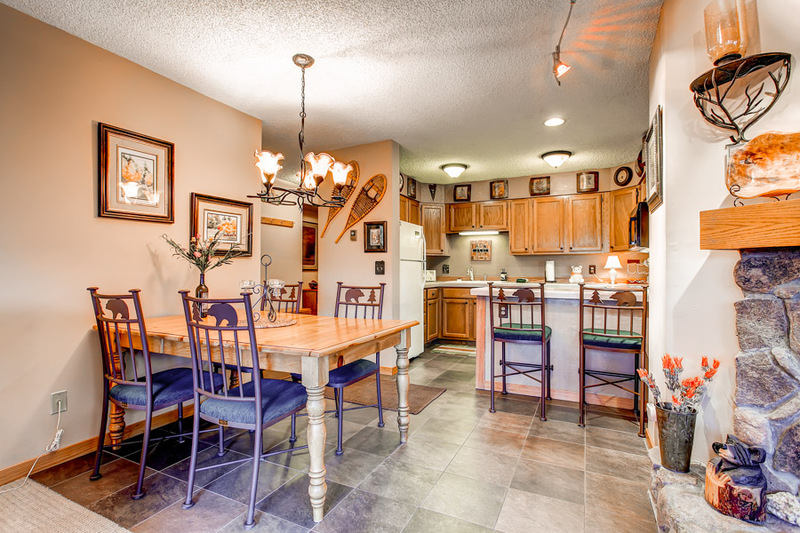 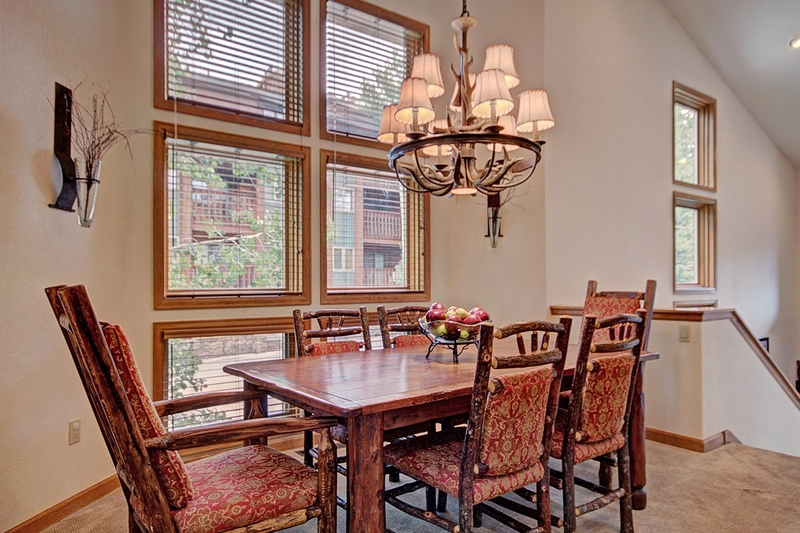 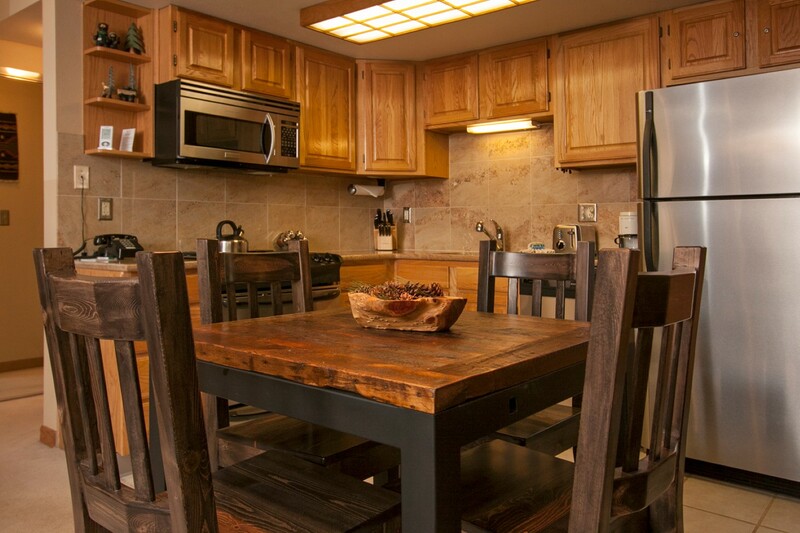 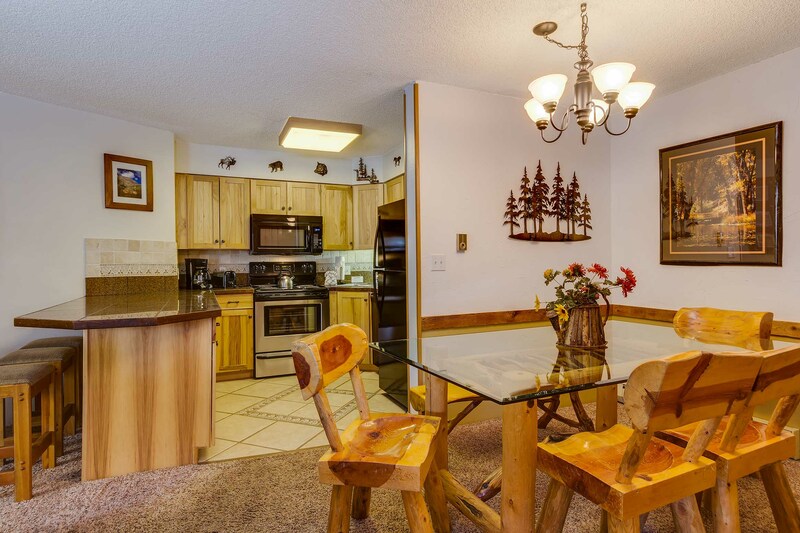 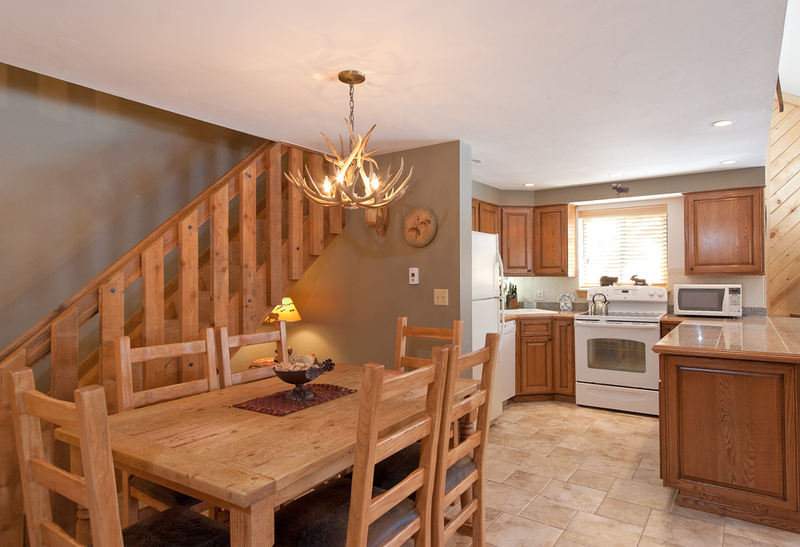 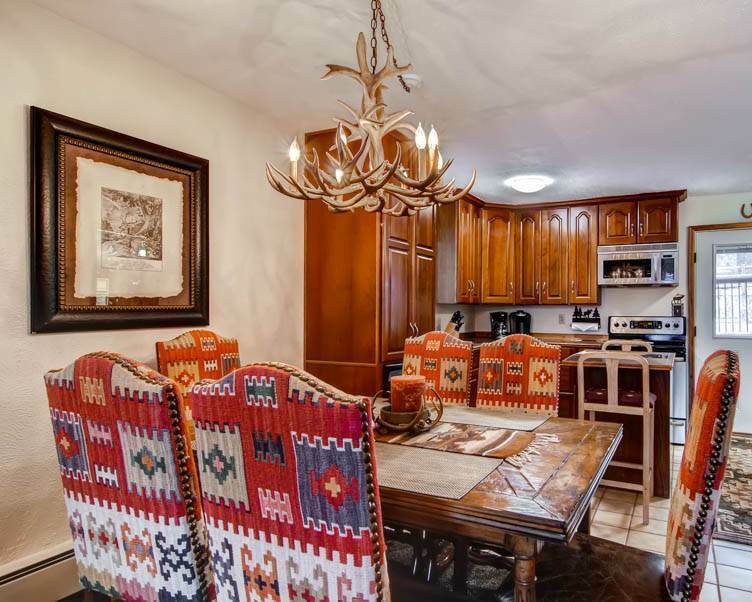 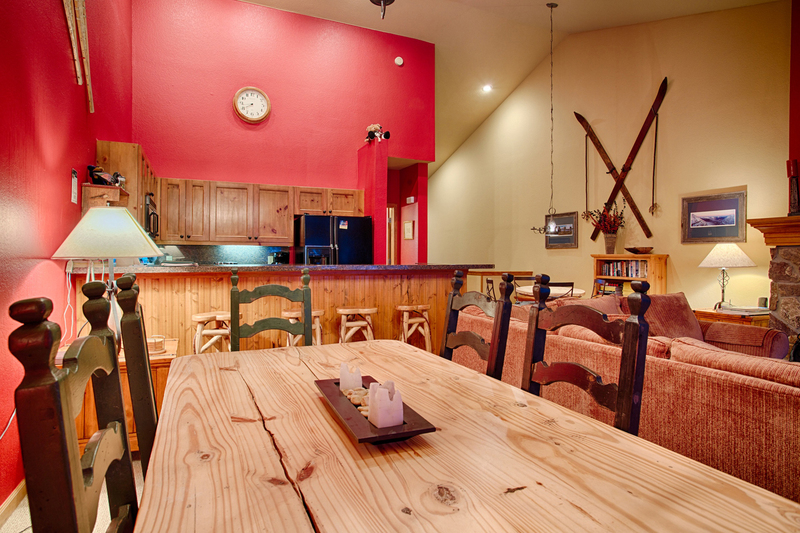 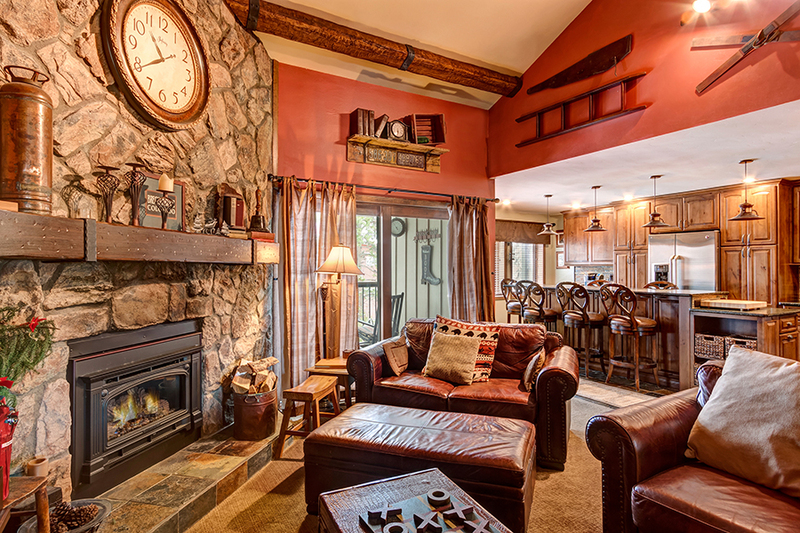 Enjoy a home cooked meal made in the comfort of your own townhome at the rustic wood dining table with seating for eight people. 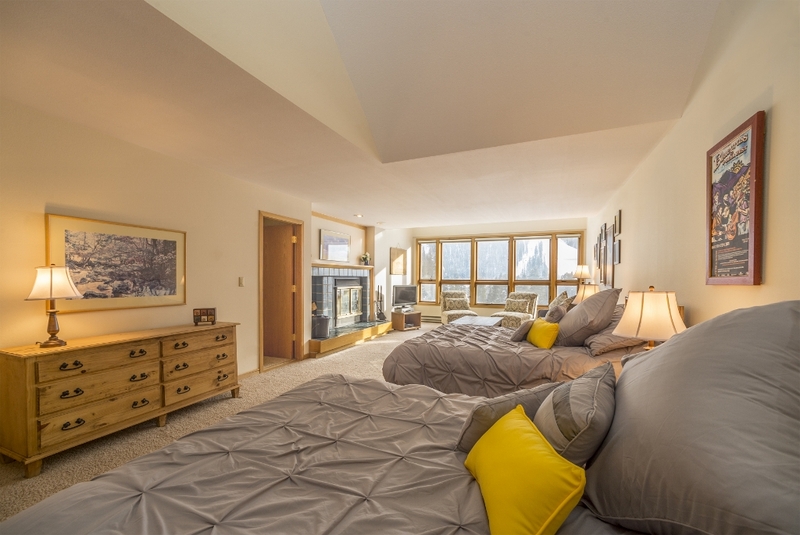 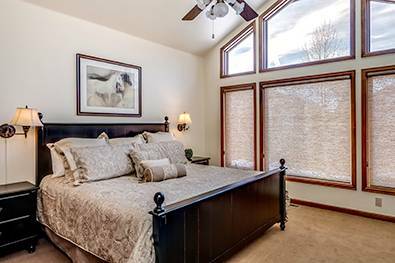 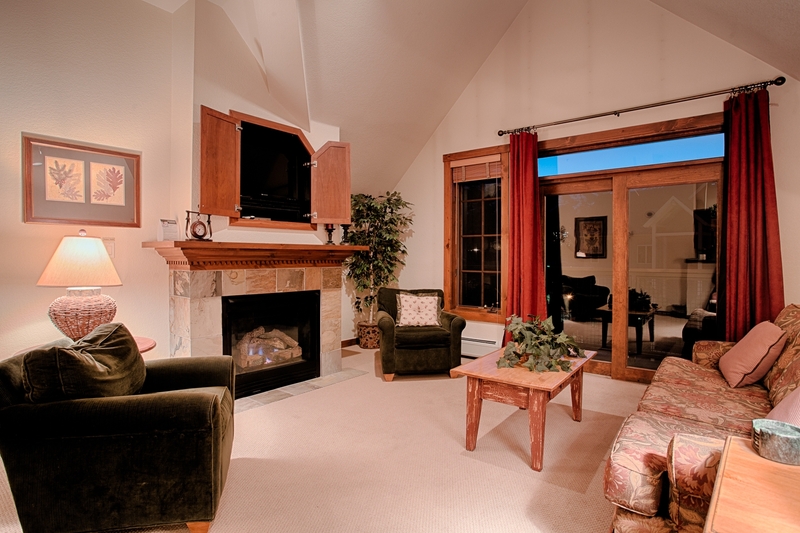 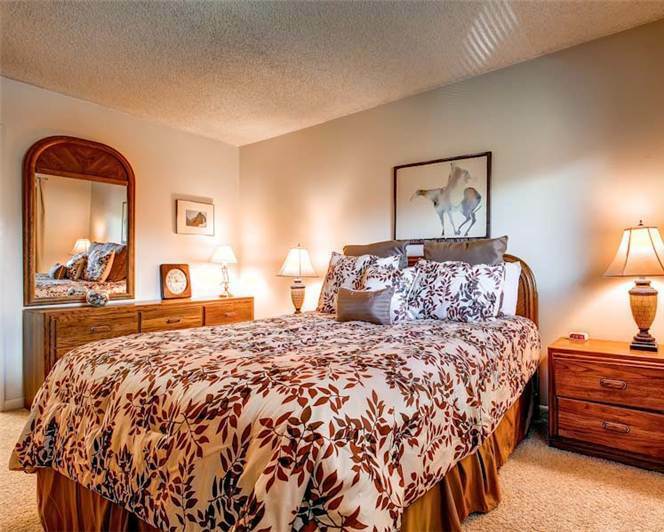 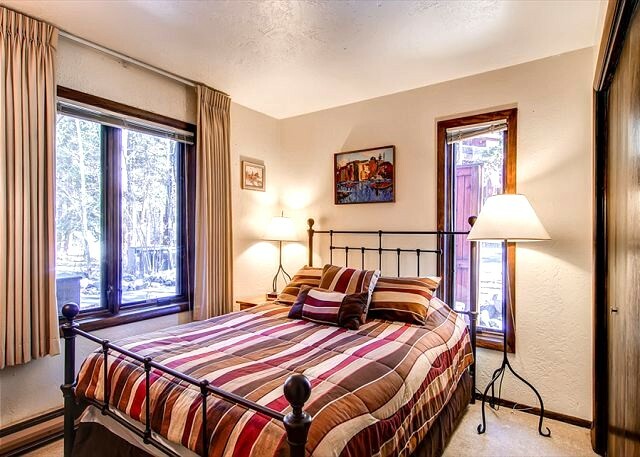 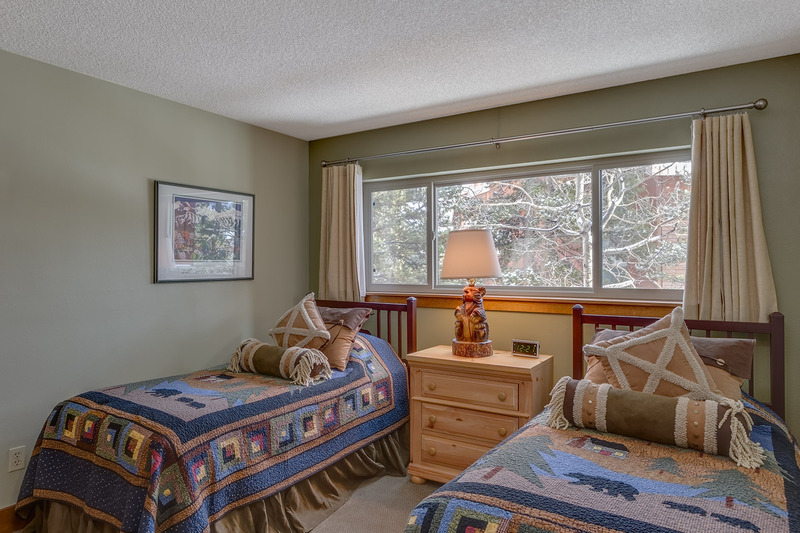 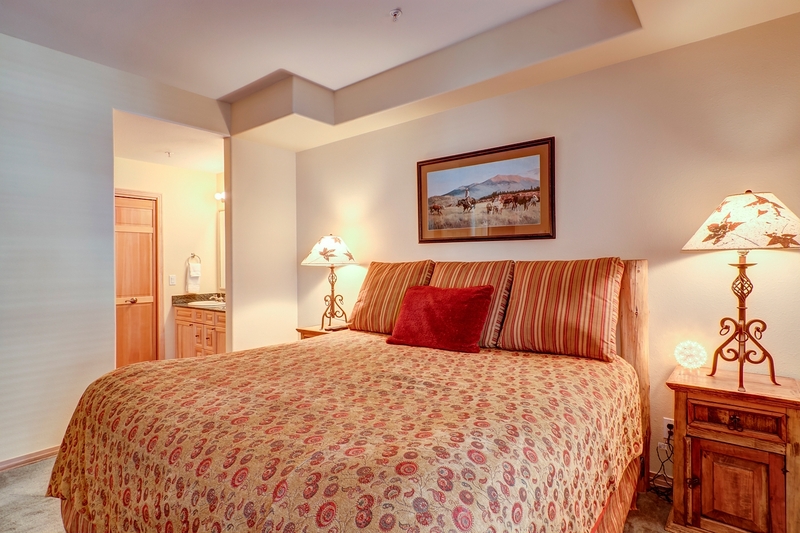 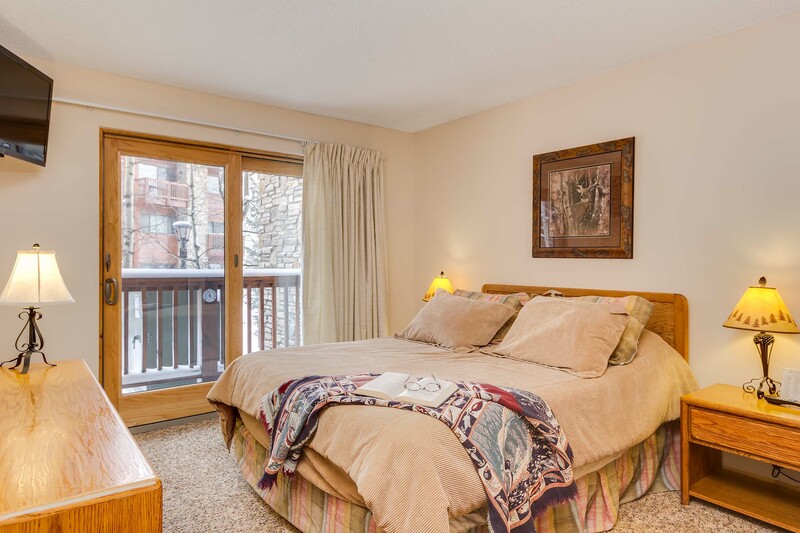 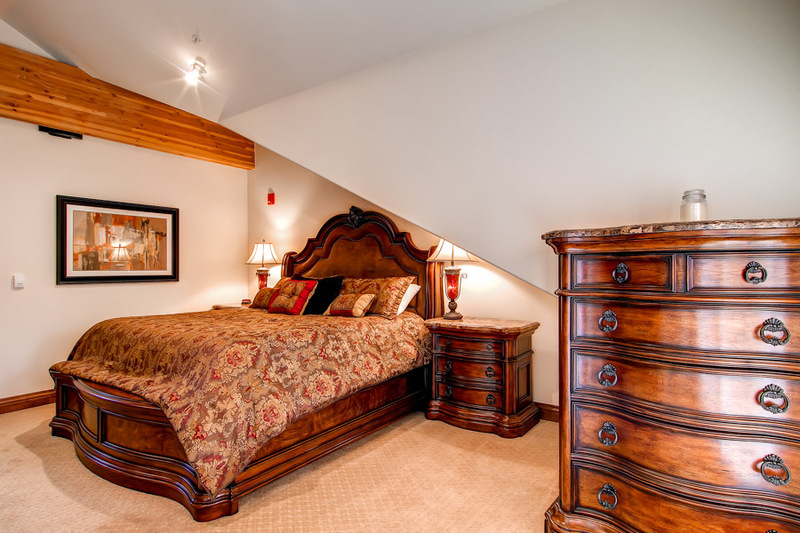 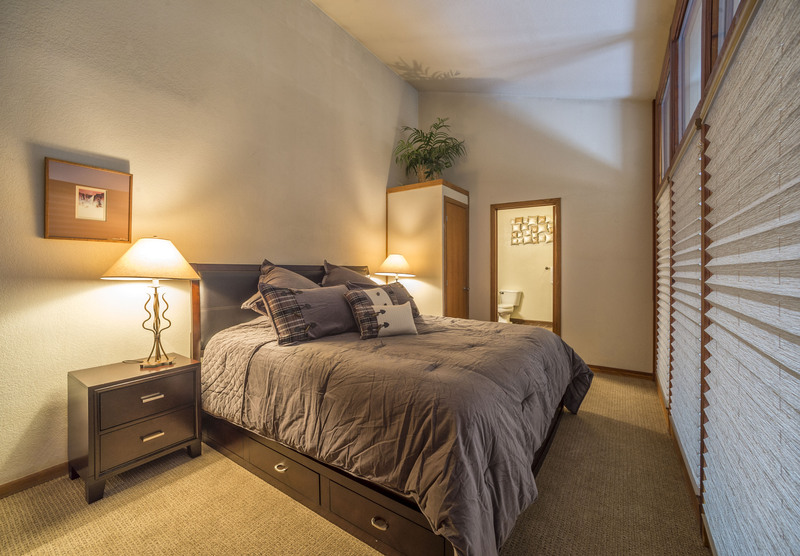 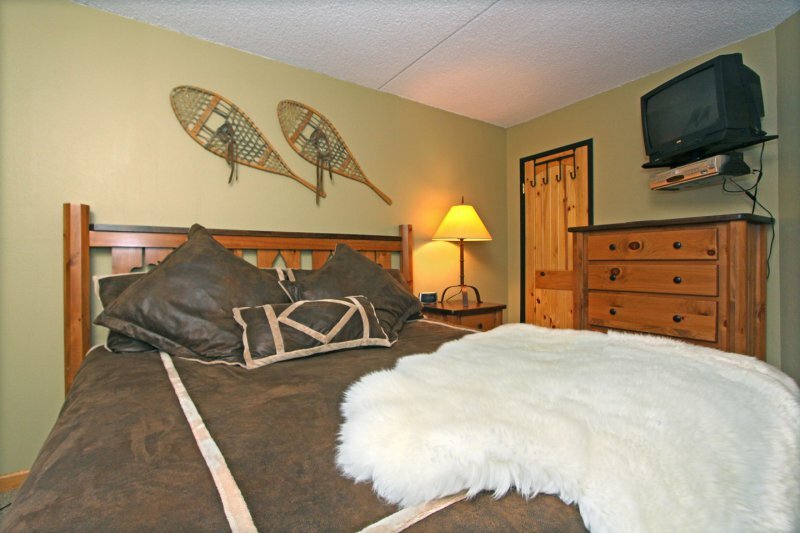 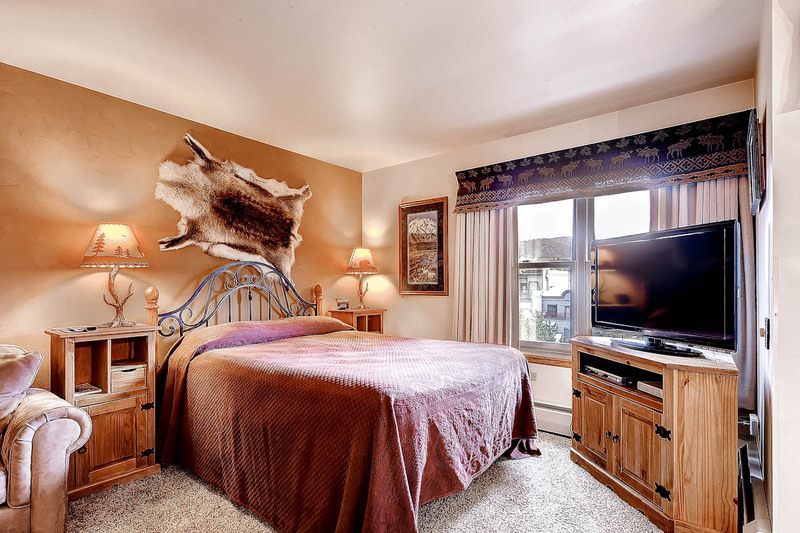 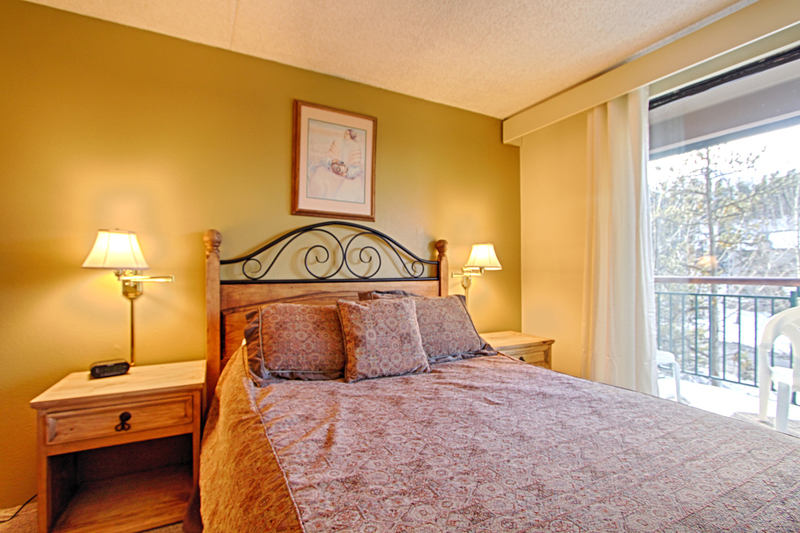 The master bedroom has a King bed with cozy bedding, large windows and a window bench seat. 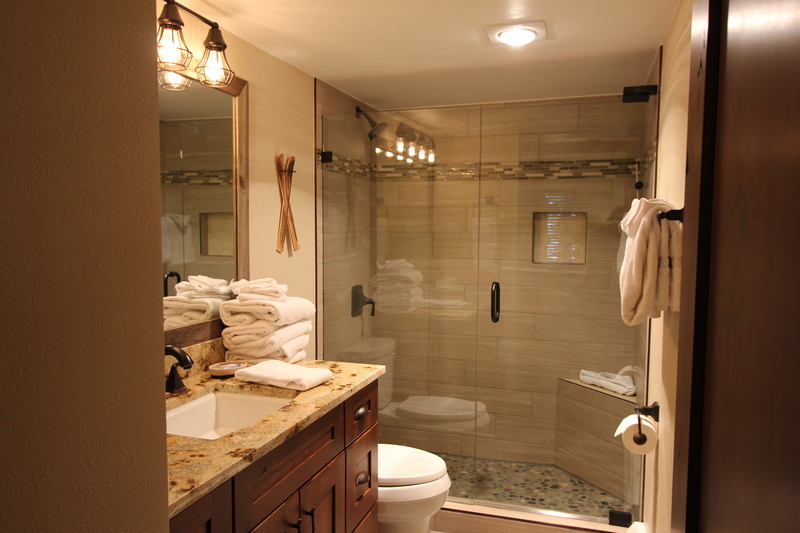 The attached master bathroom has an immense jetted tub, double sinks and a shower. 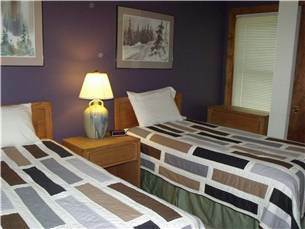 The second bedroom has a Queen bed encased in quilted bedding. 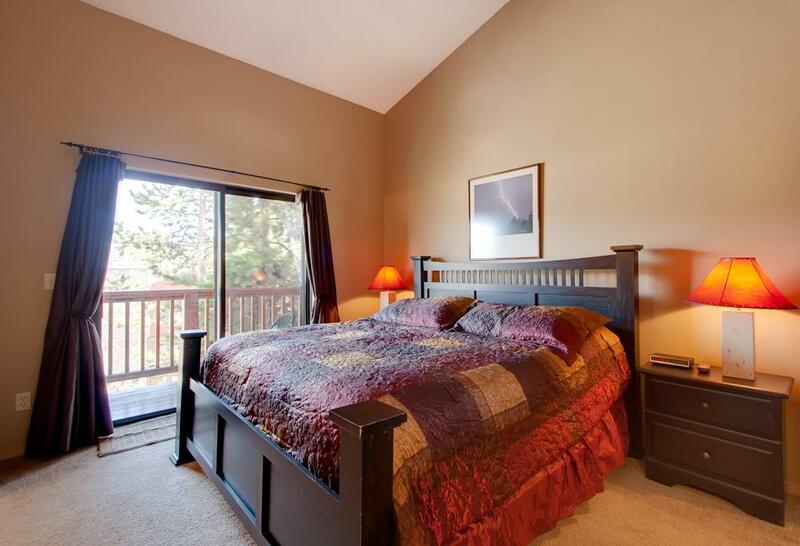 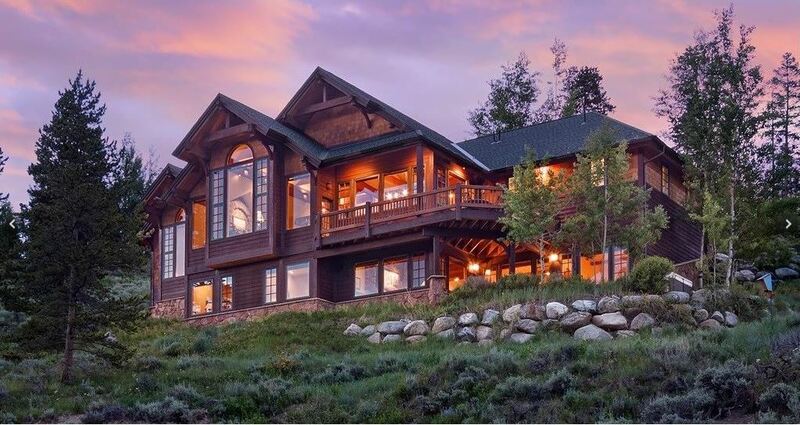 This bedroom also features a private walk out deck. 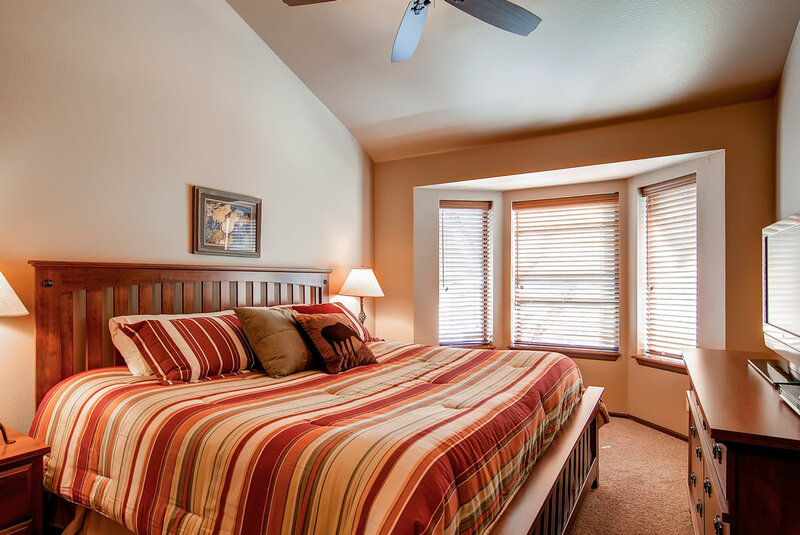 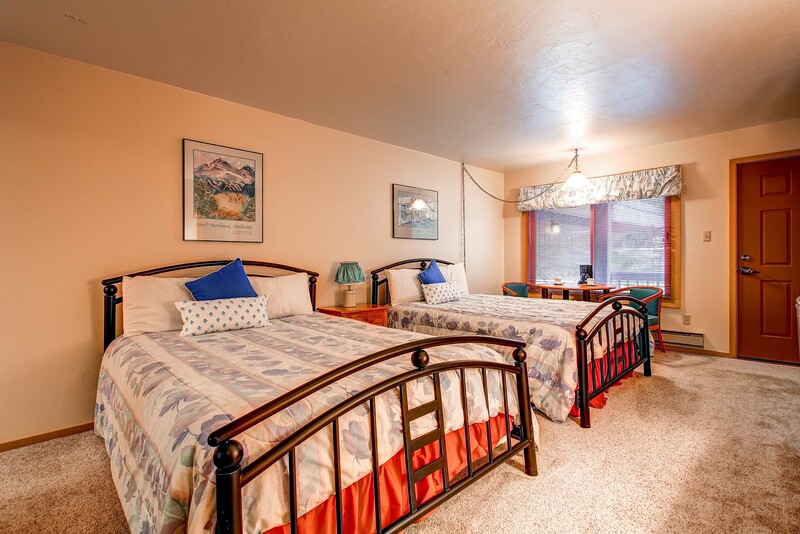 The third bedroom is equipped with two Twin beds encased in traditional striped bedding. 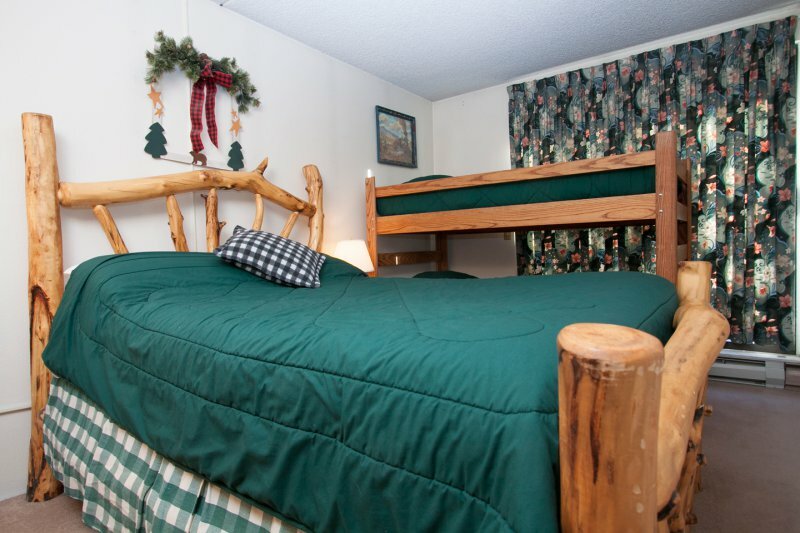 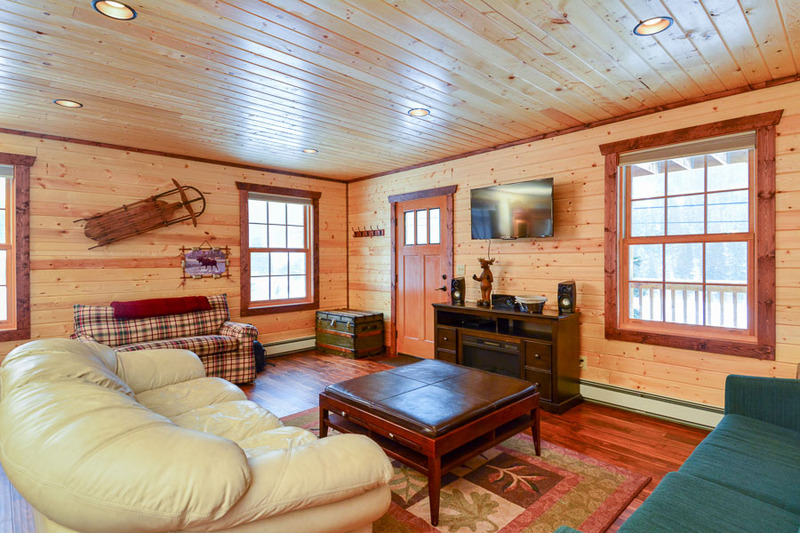 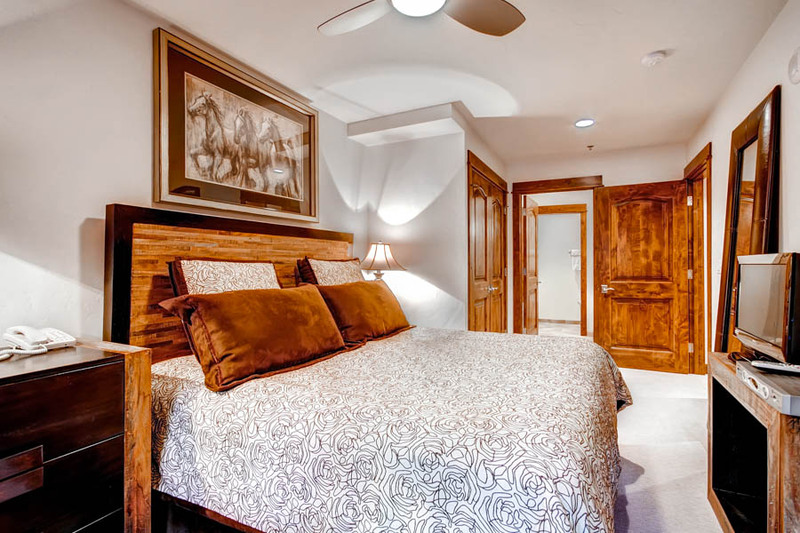 The fun den area features a Queen Murphy bed and sofa sleeper in case you need additional sleeping space than is provided in the bedrooms and allows the home to sleep twelve people. 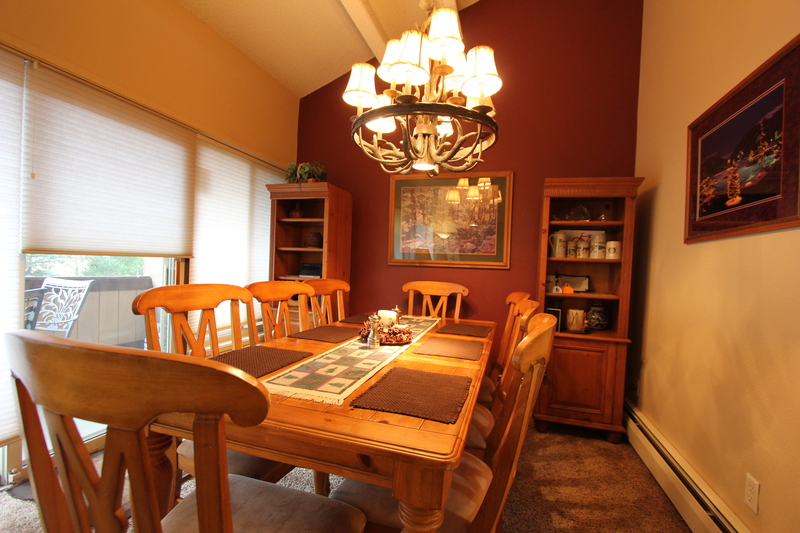 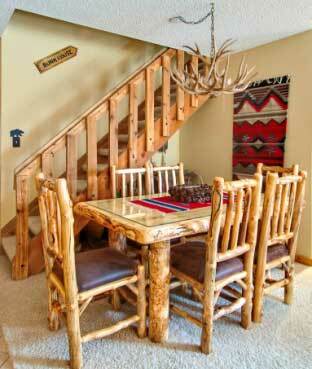 The den also has a game table with a cupboard full of games to challenge people in your group on game night. 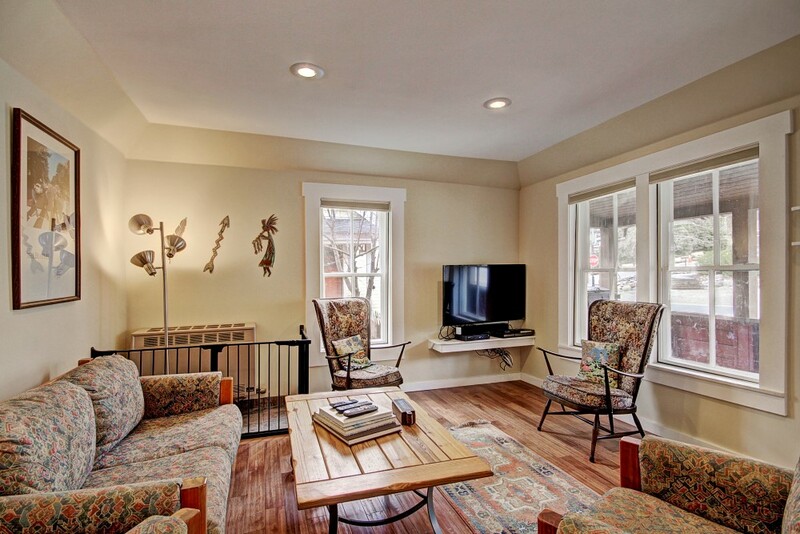 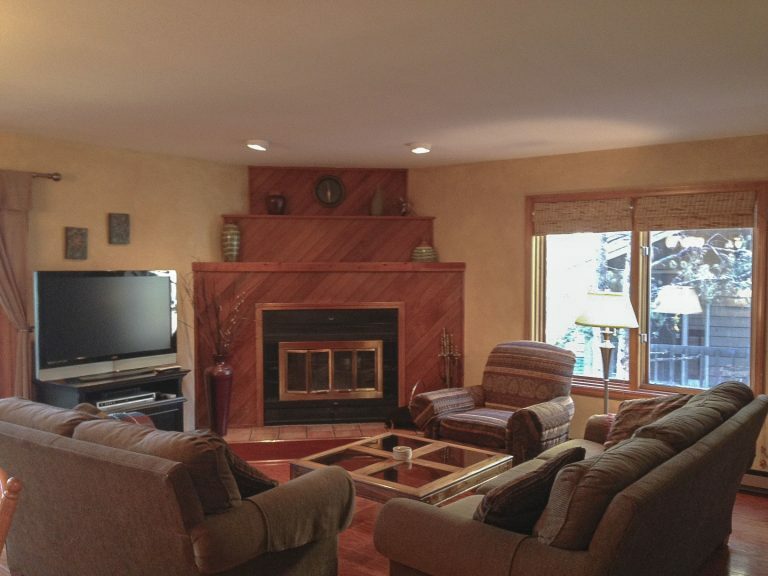 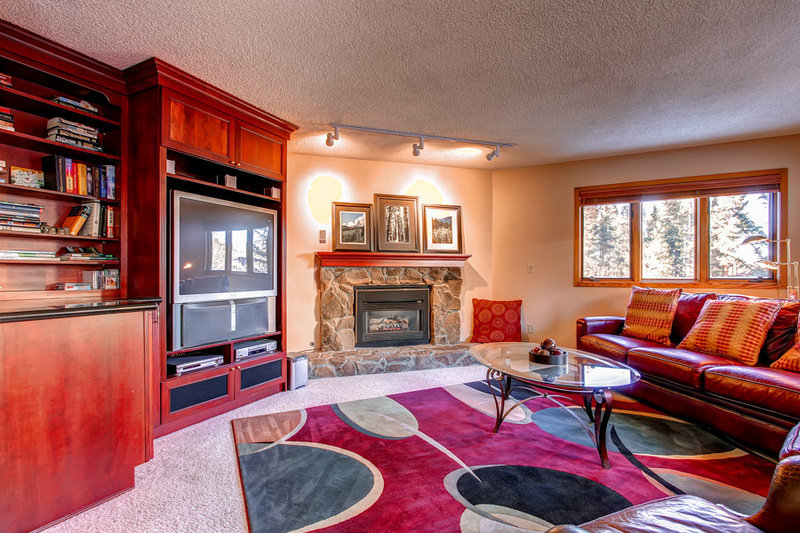 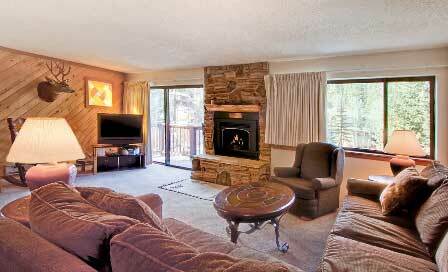 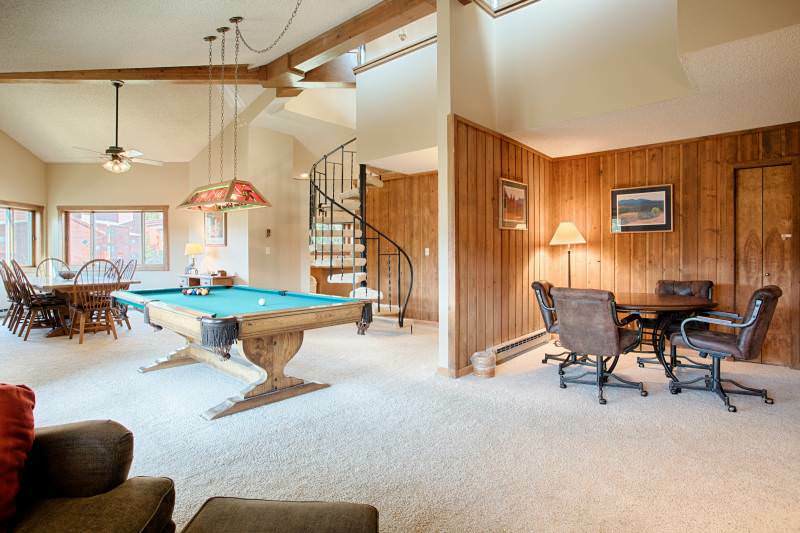 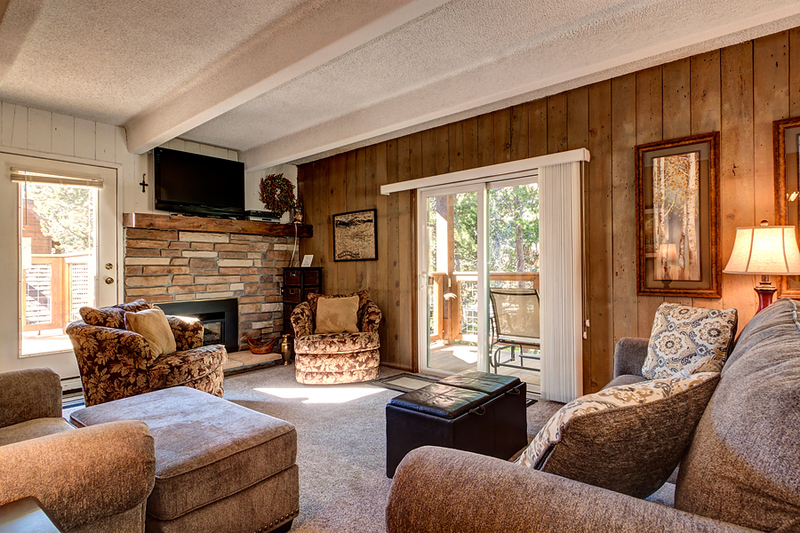 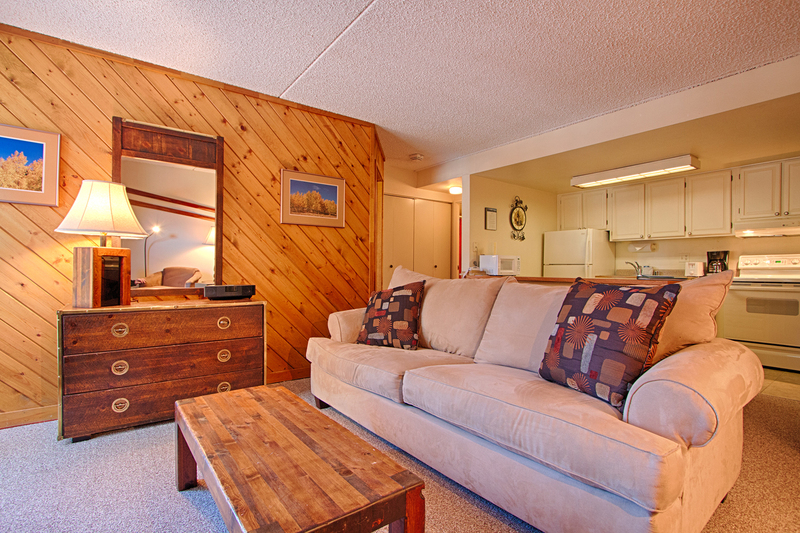 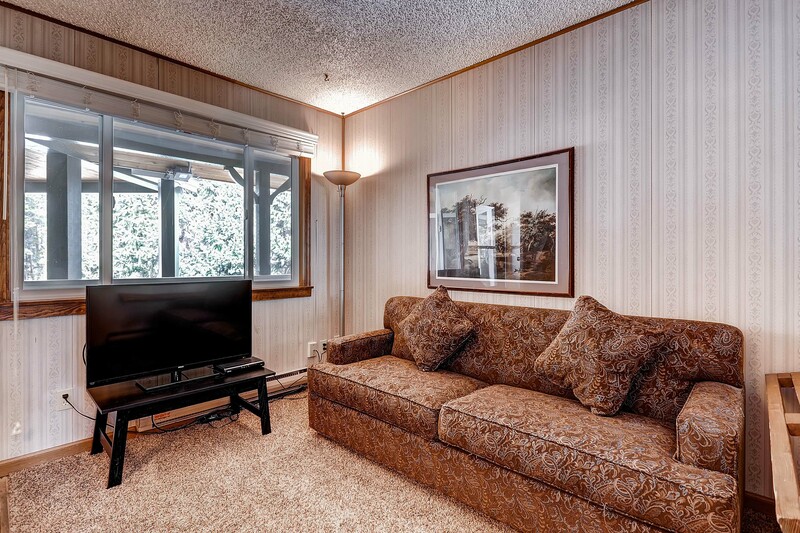 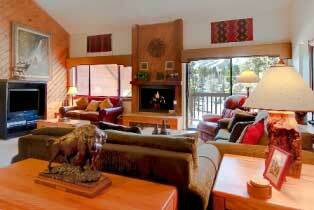 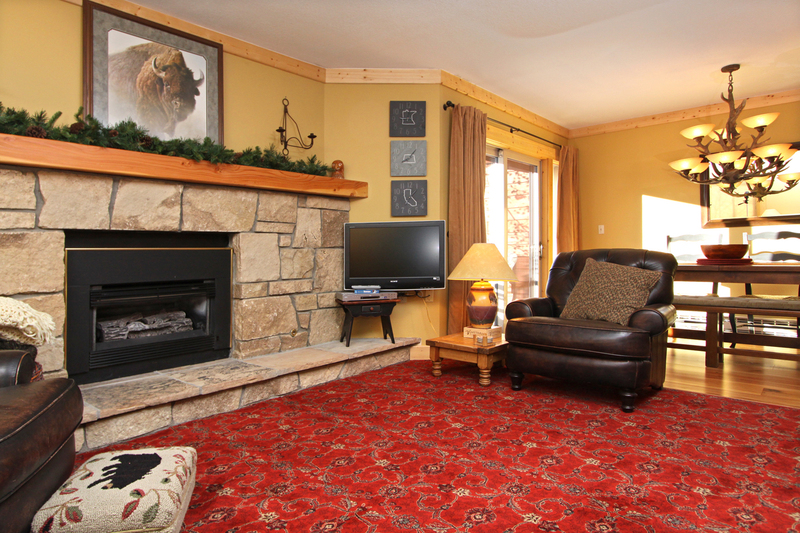 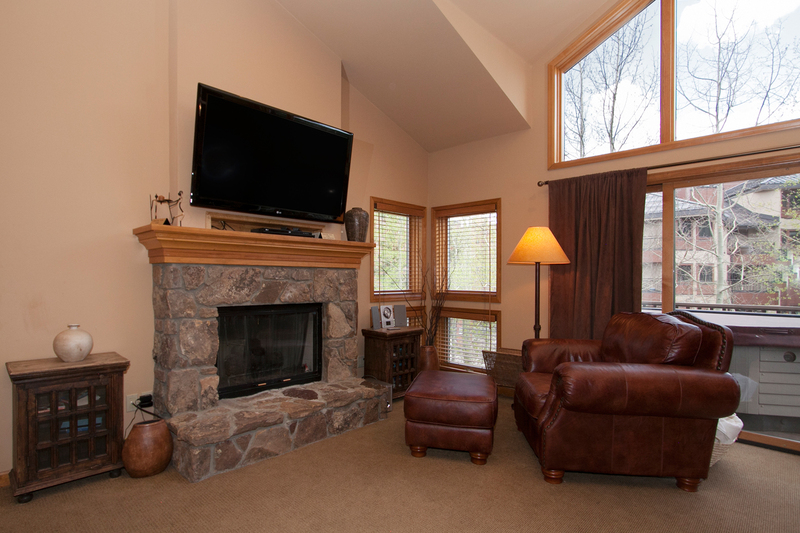 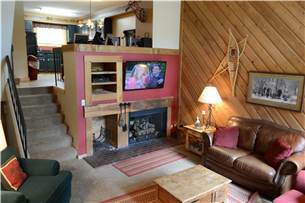 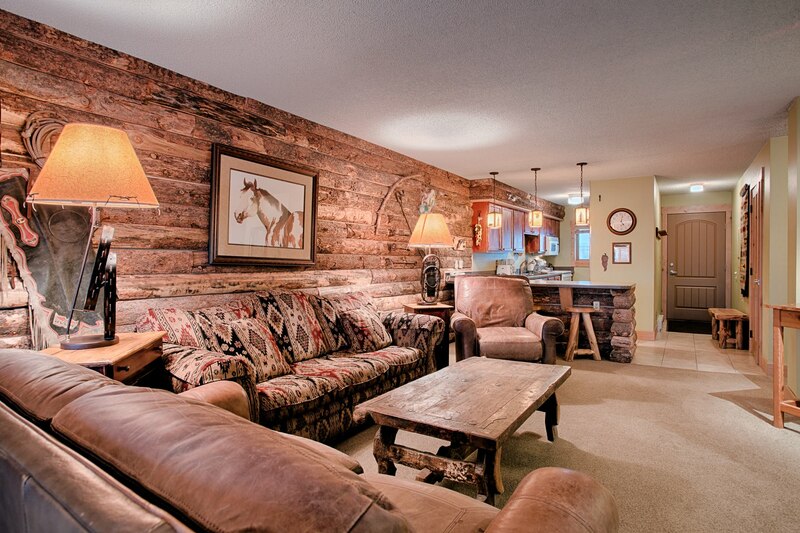 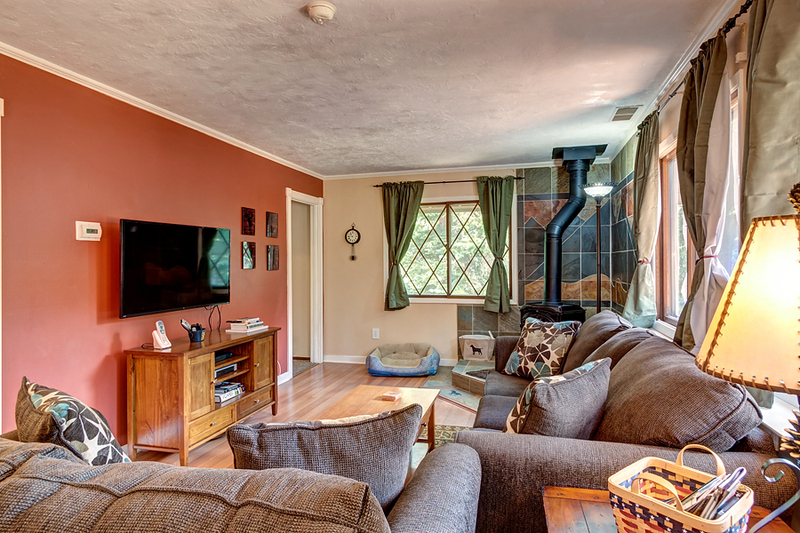 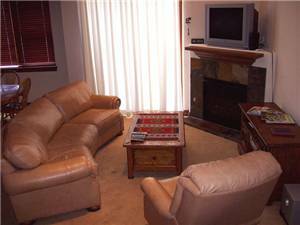 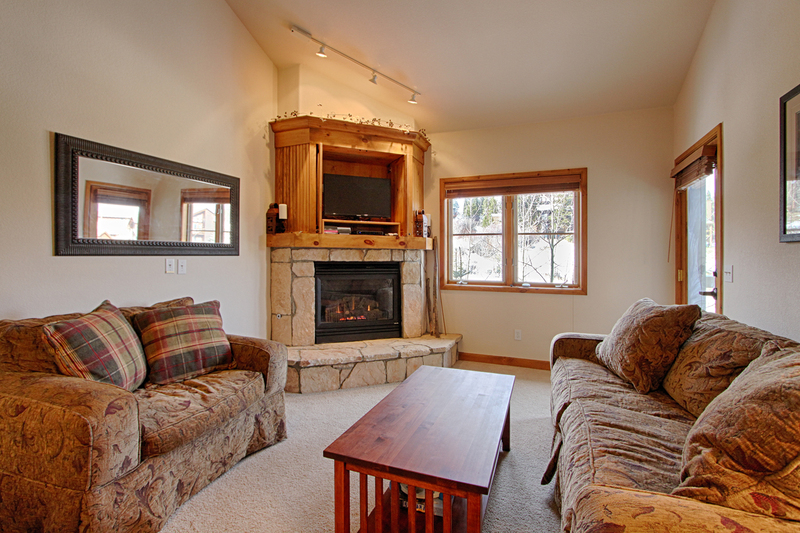 There is a large entertainment area with a TV and ample seating. 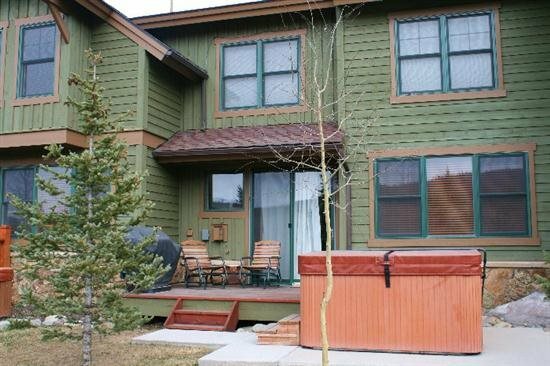 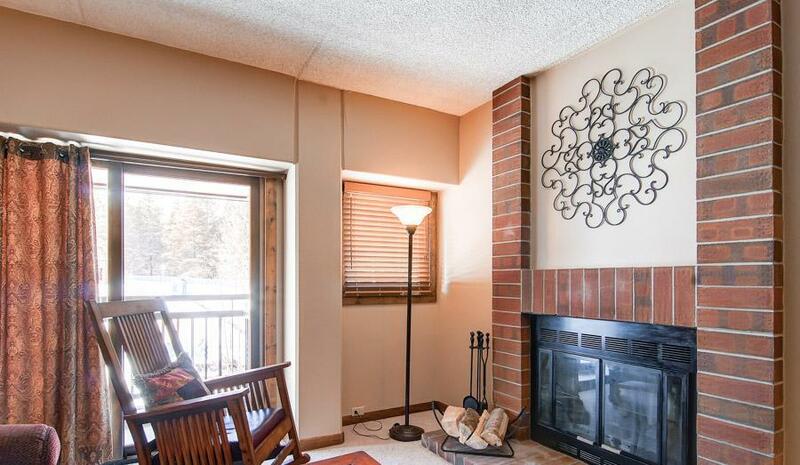 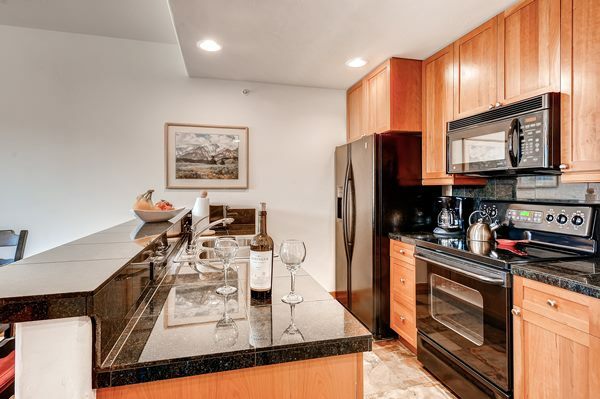 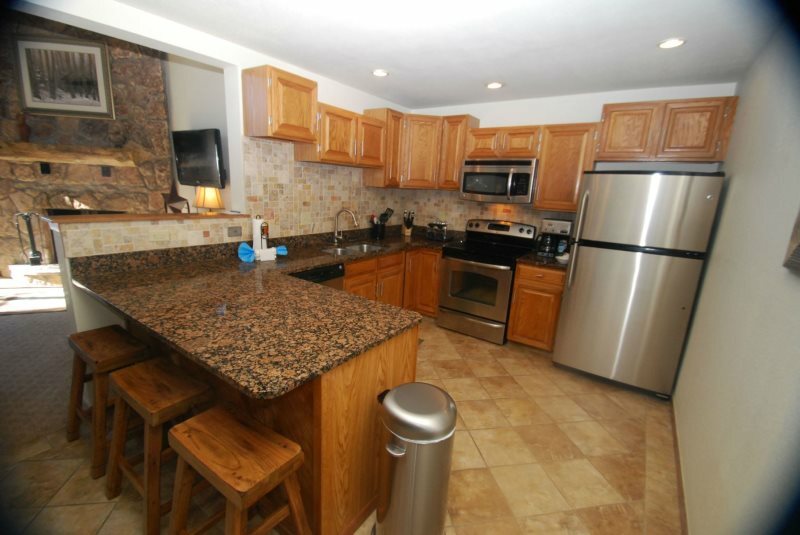 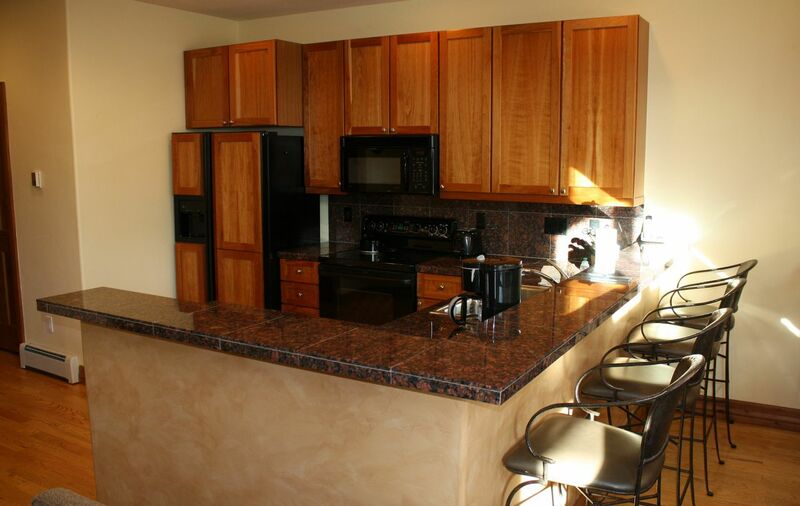 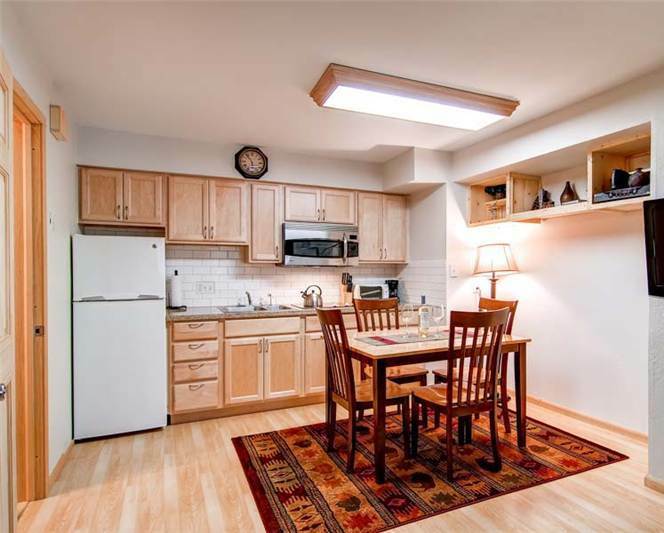 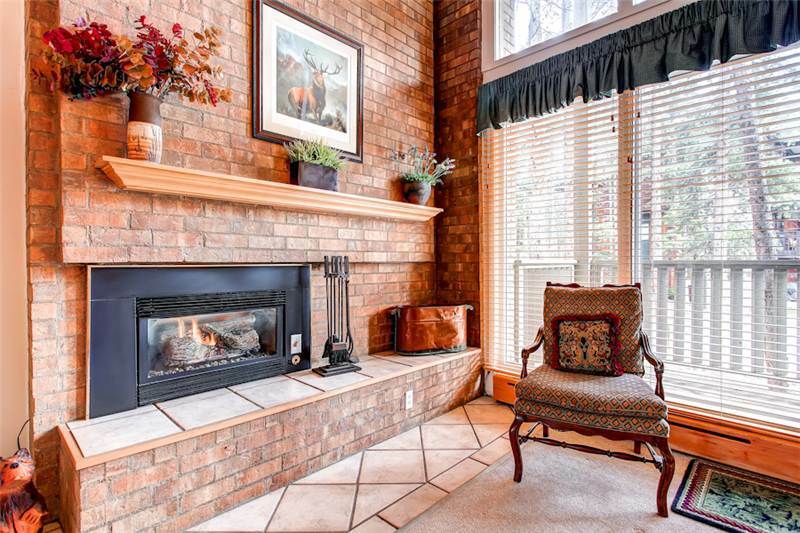 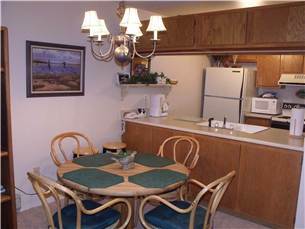 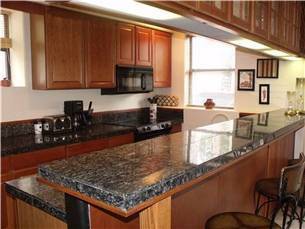 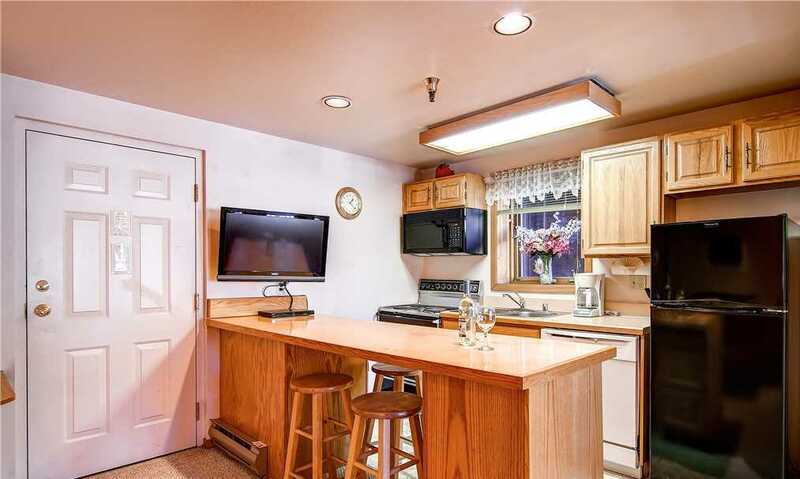 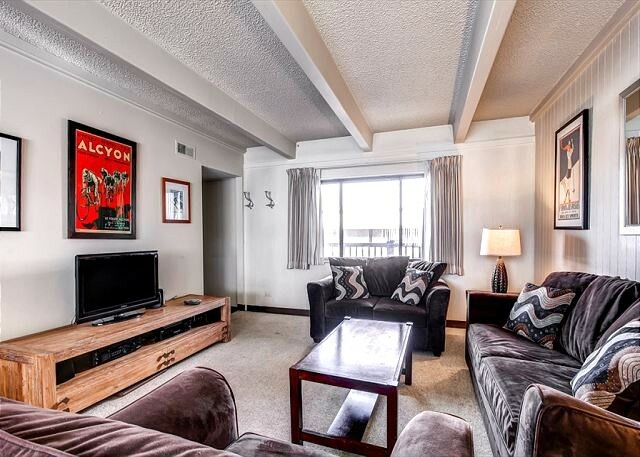 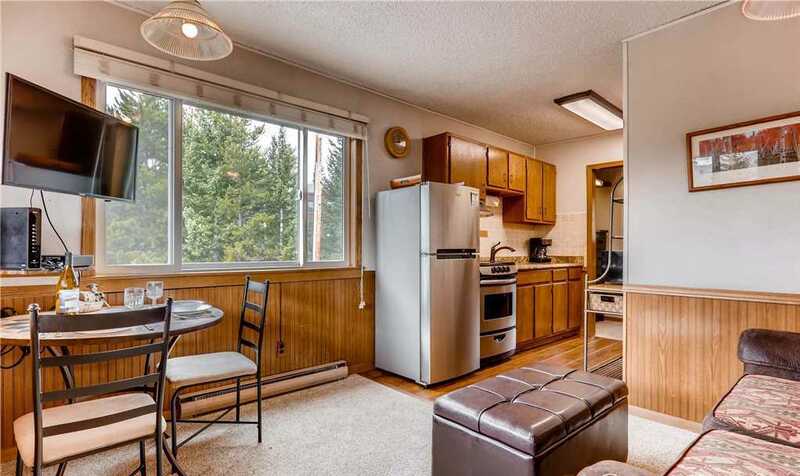 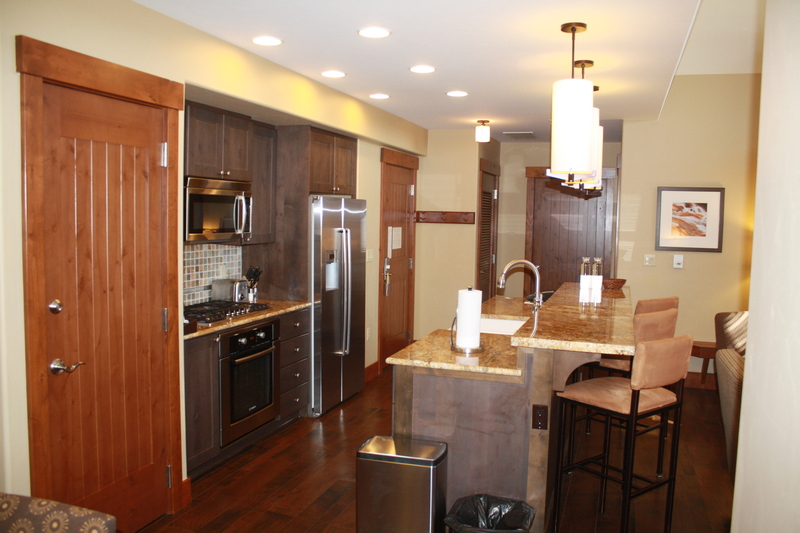 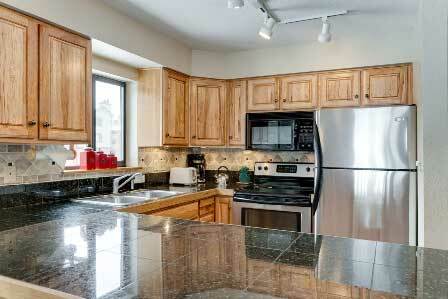 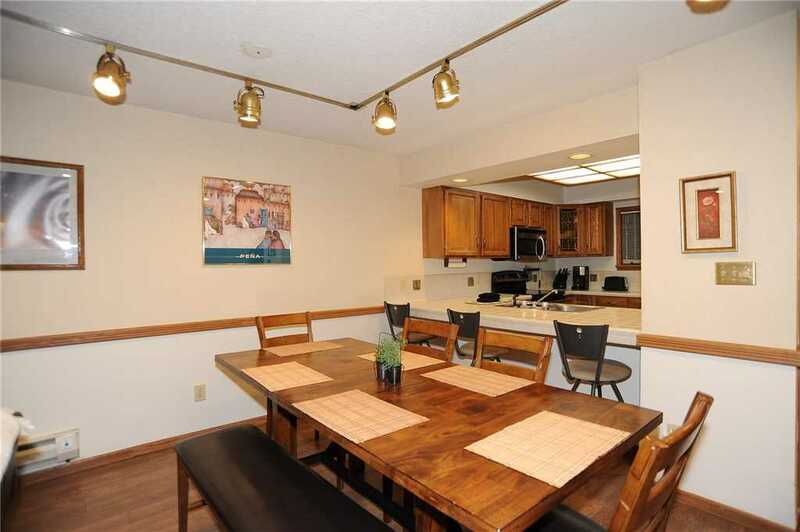 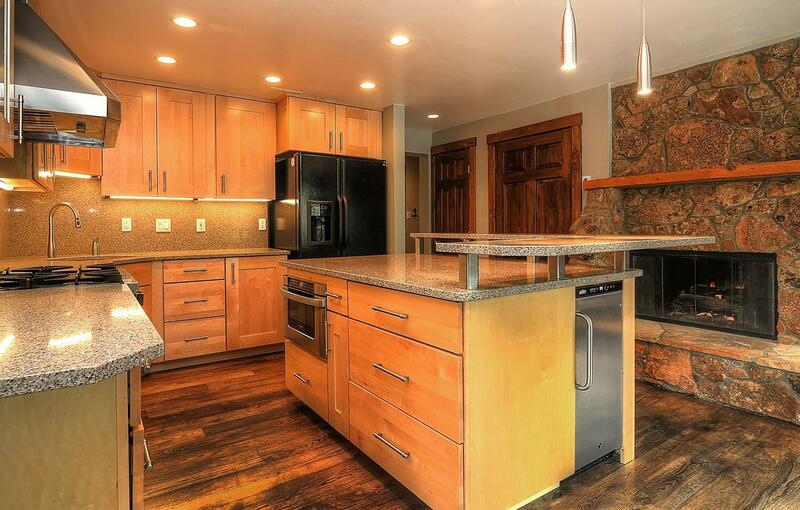 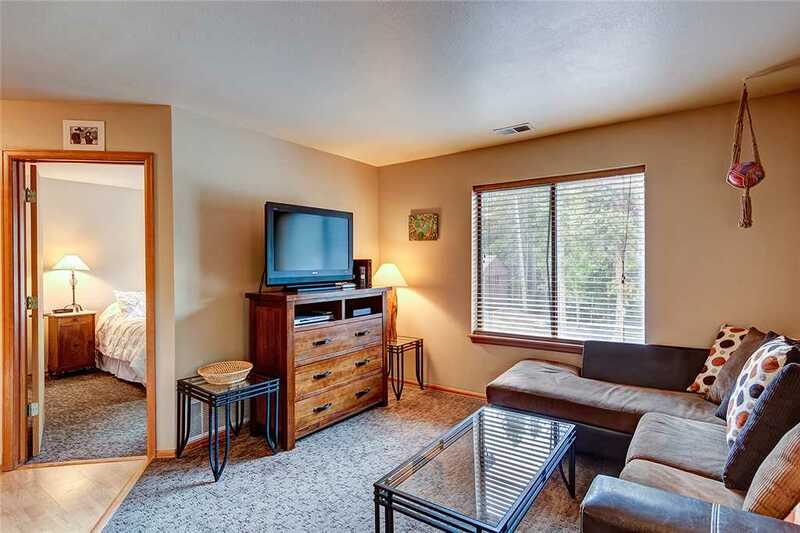 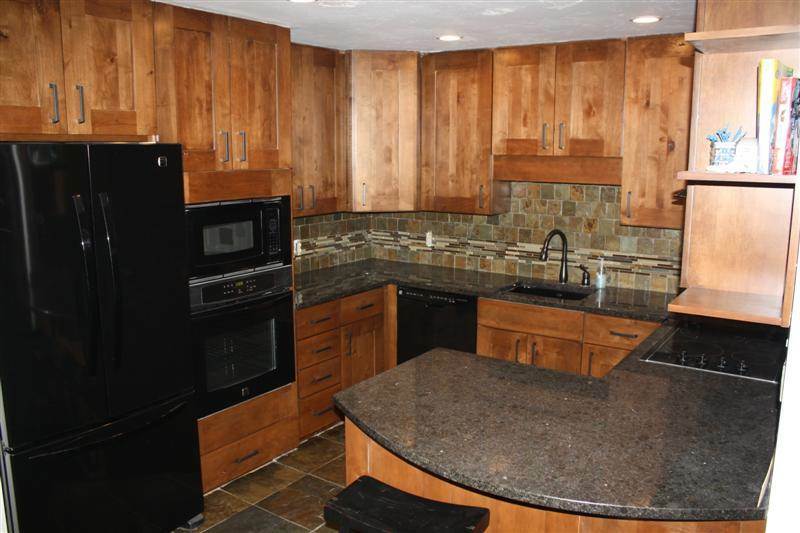 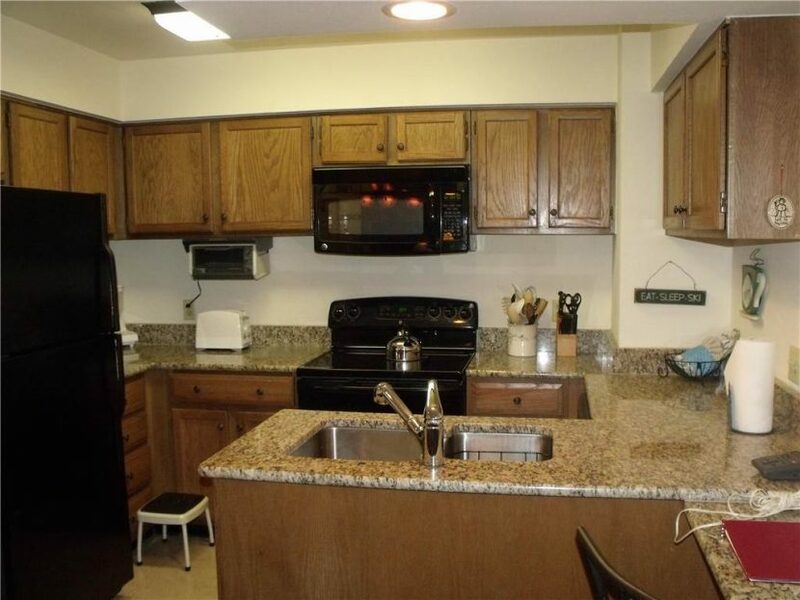 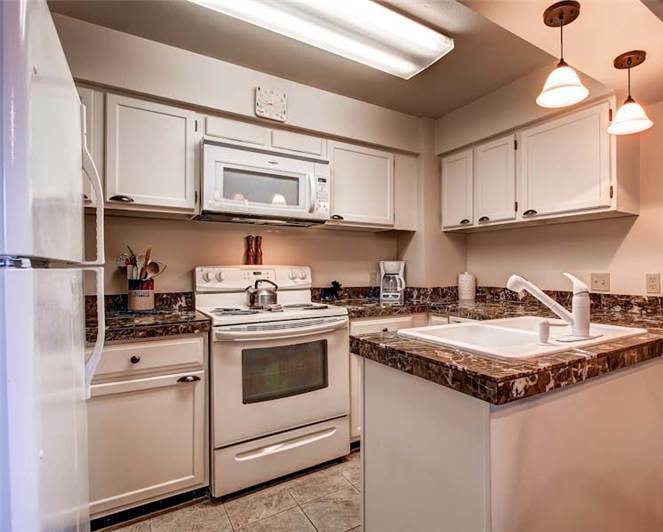 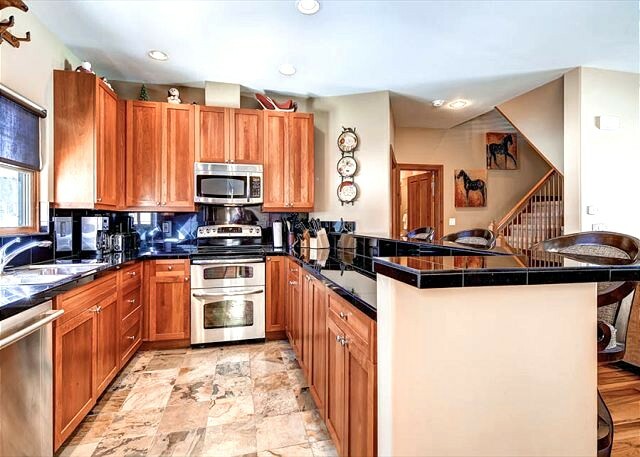 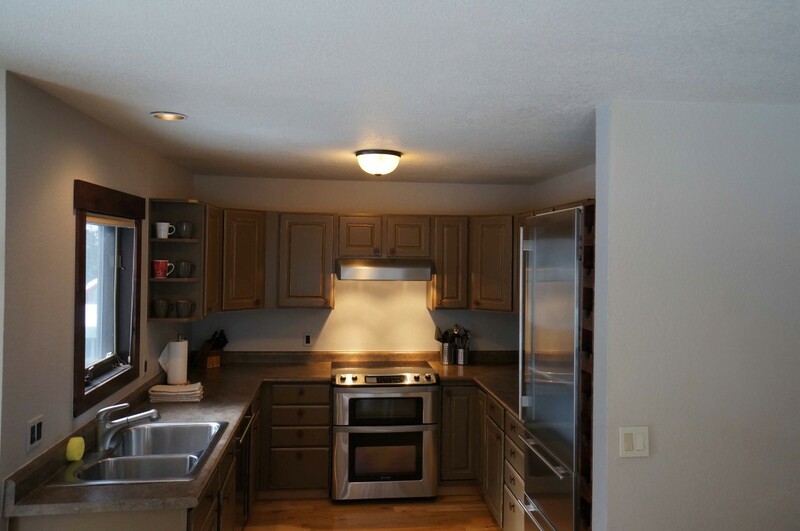 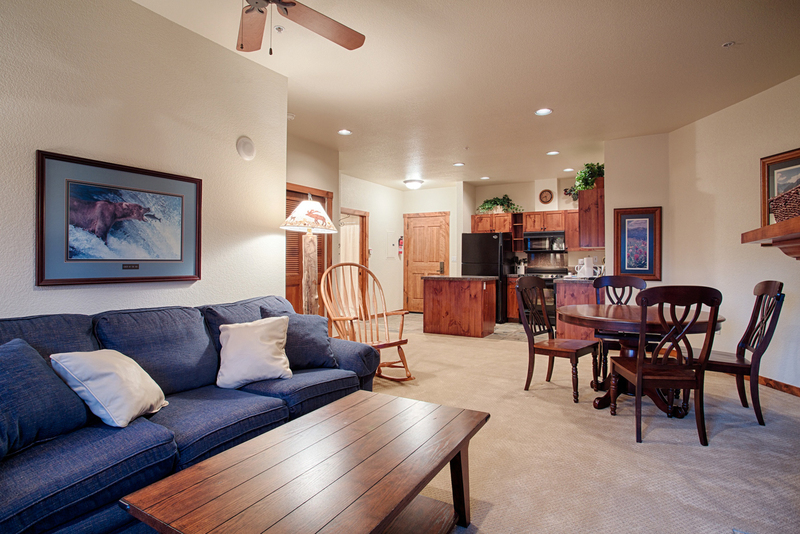 Other amenities of this townhome include a washer and dryer, heated one car garage and private outdoor hot tub. 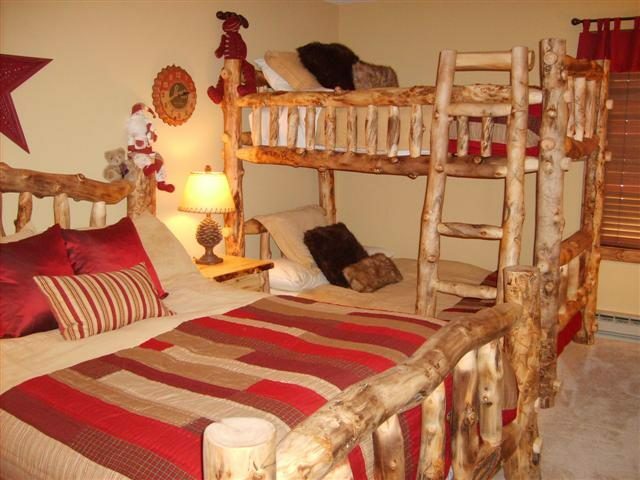 *minimum age requirement – 25.